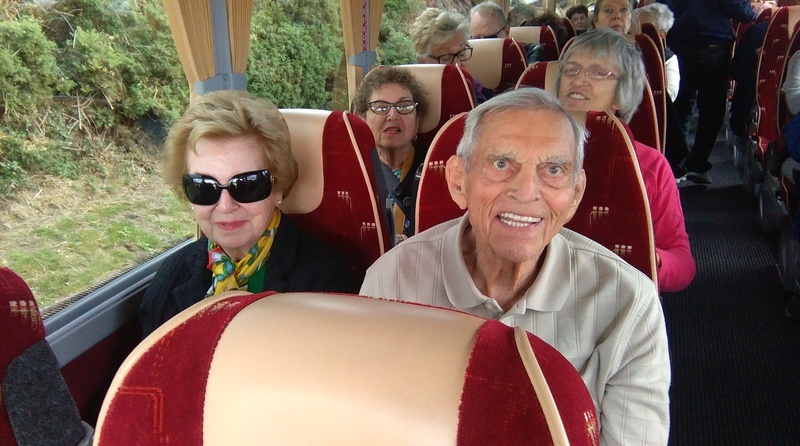 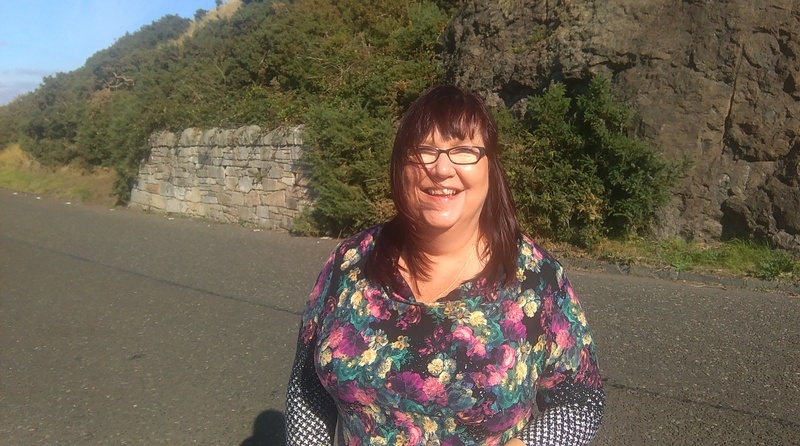 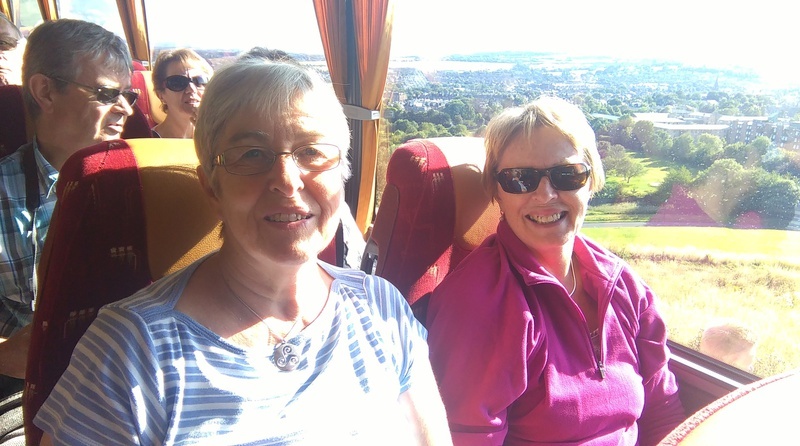 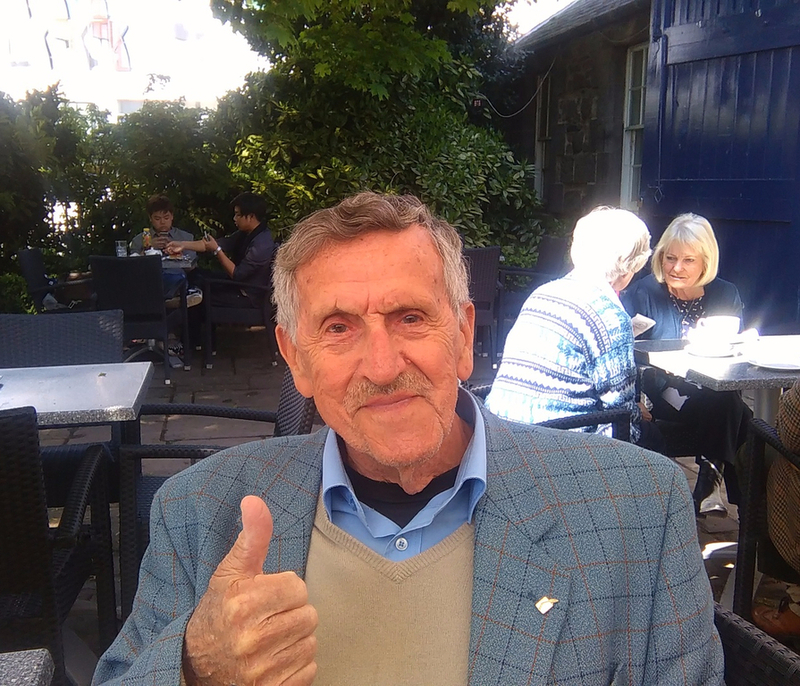 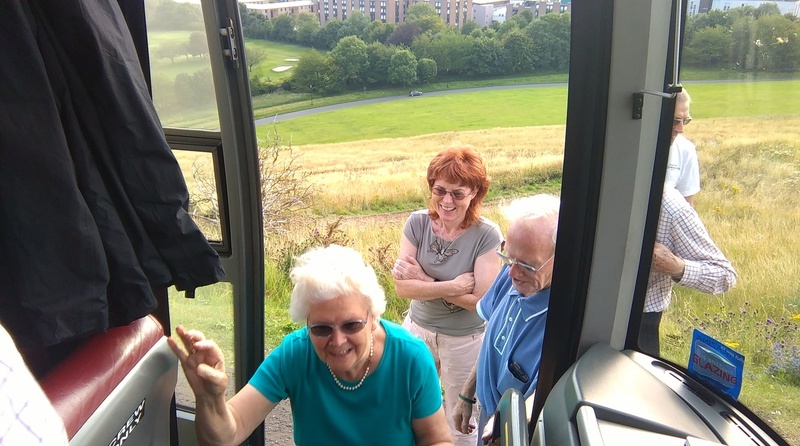 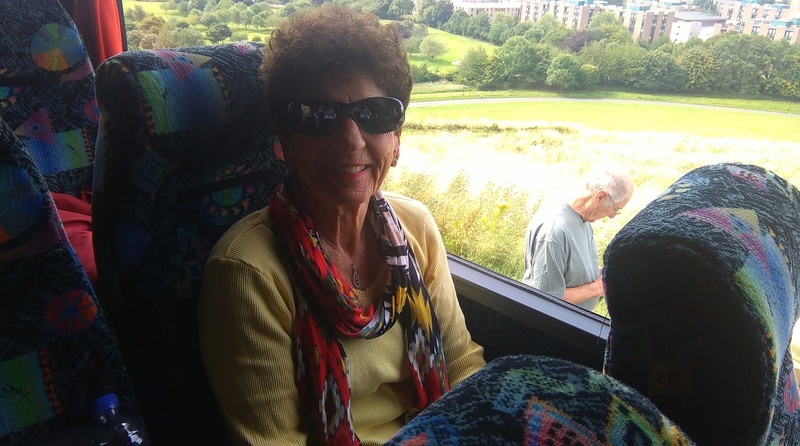 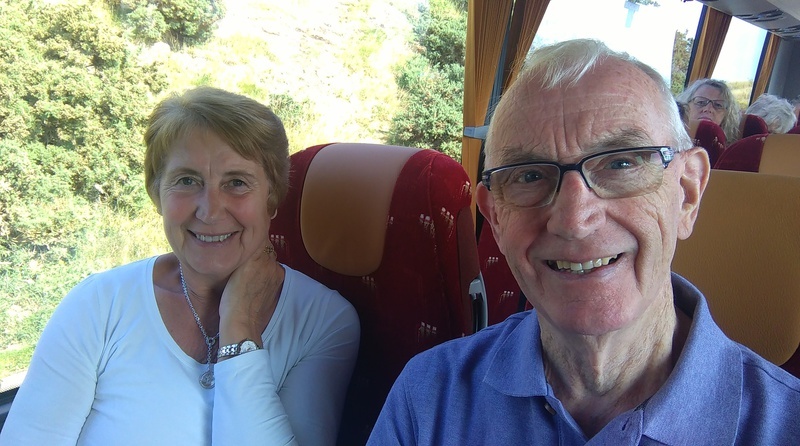 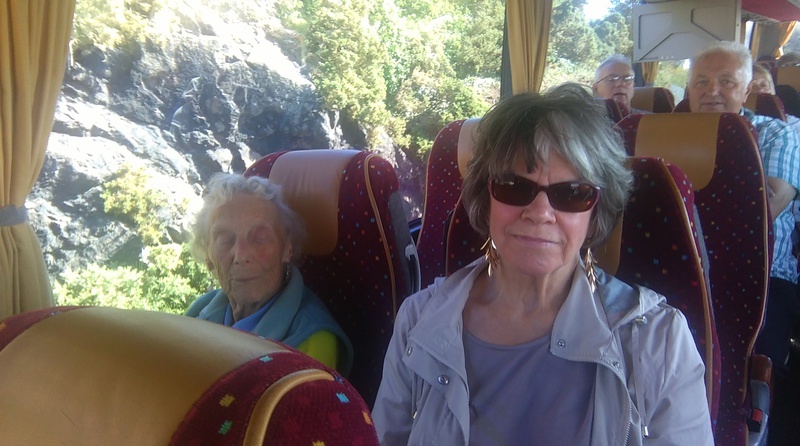 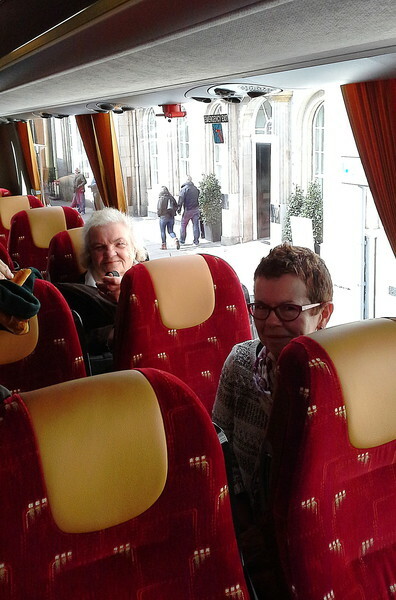 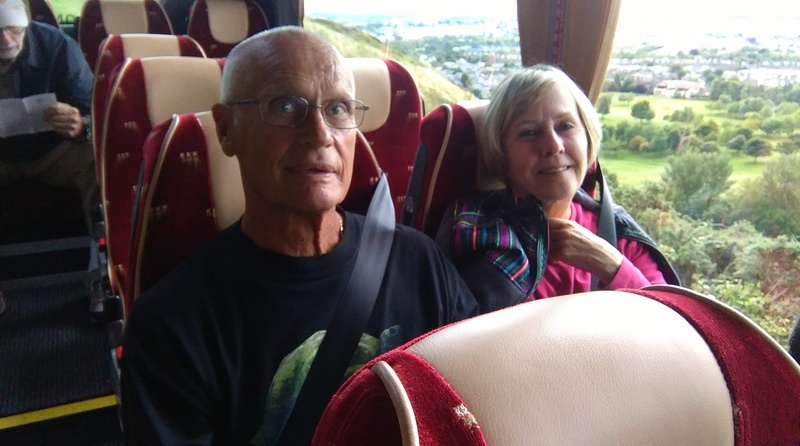 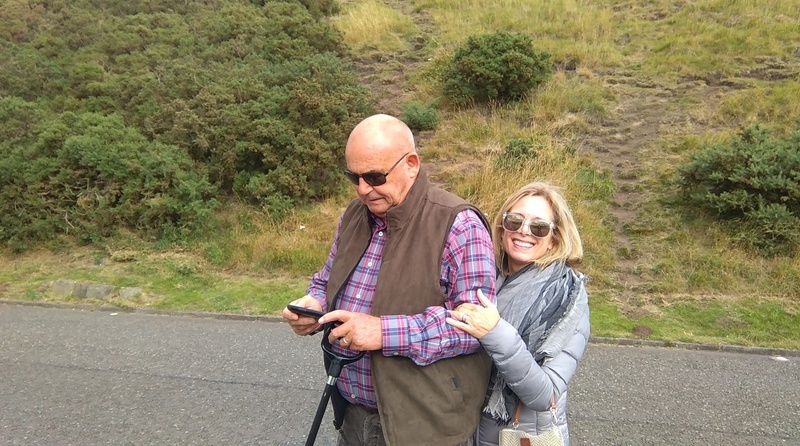 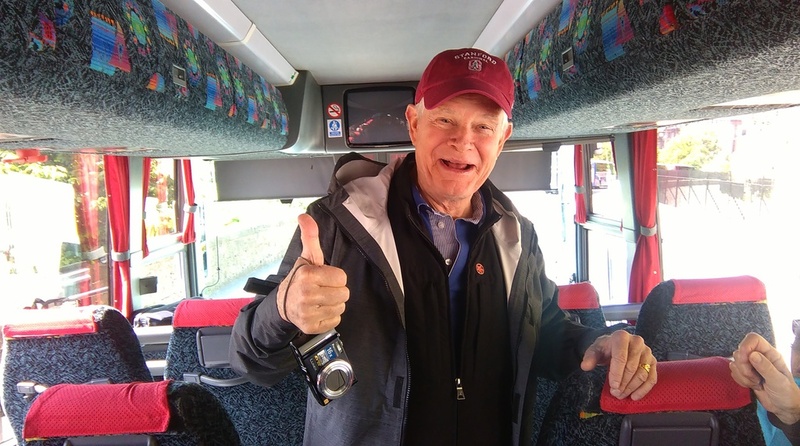 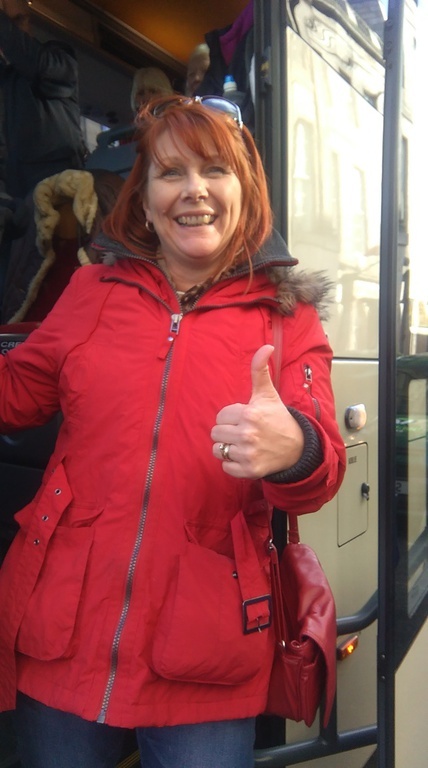 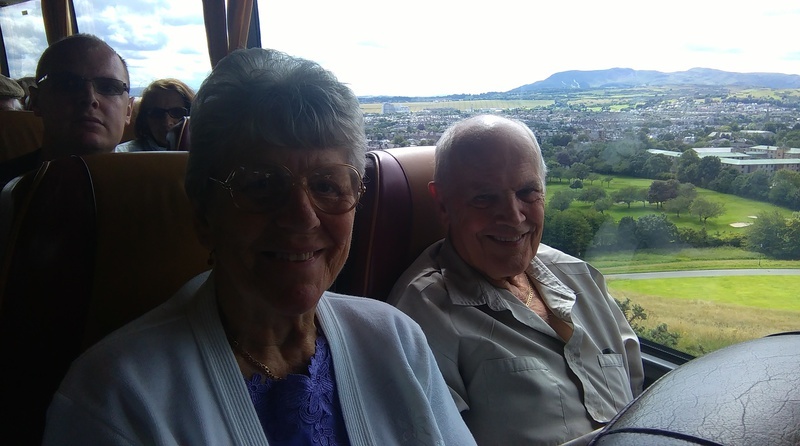 Gorgeous sunny day, Kevin brought his coach of happy sunny people from the south of England.His passengers are always happy when they come to Edinburgh - couldn't be anything else- it's such a lovely place - he's got good taste! 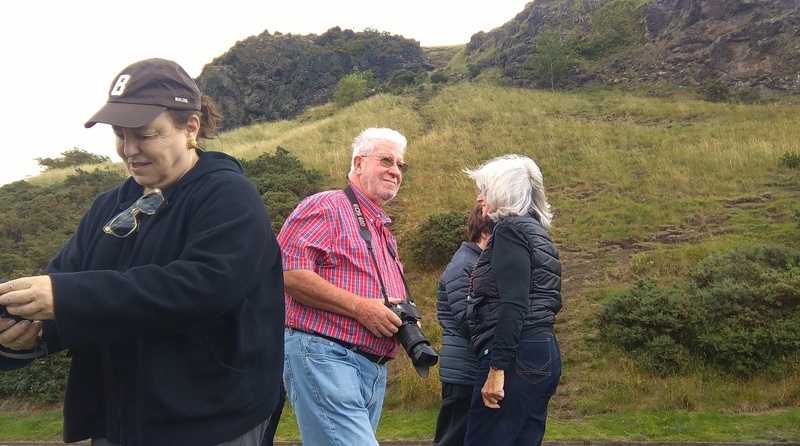 Did you think the photos were from outside the city? 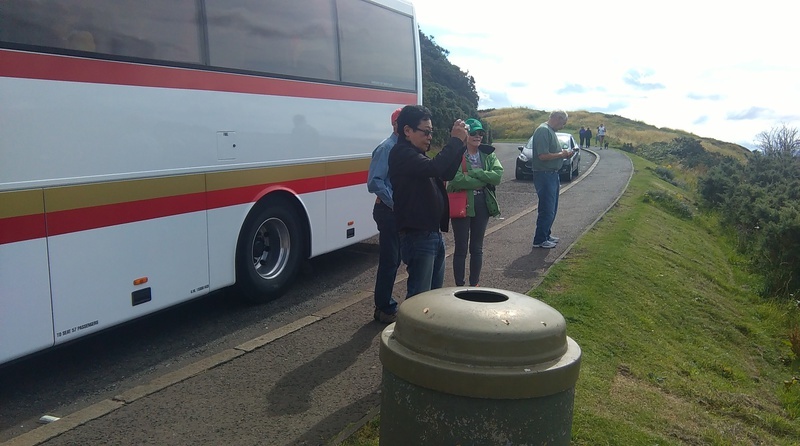 - nope you're wrong - there are lots of green areas here and the photos taken off the coach, are in Holyrood Park, the Queen's back garden if you like, open to all, and almost in the centre of the city. 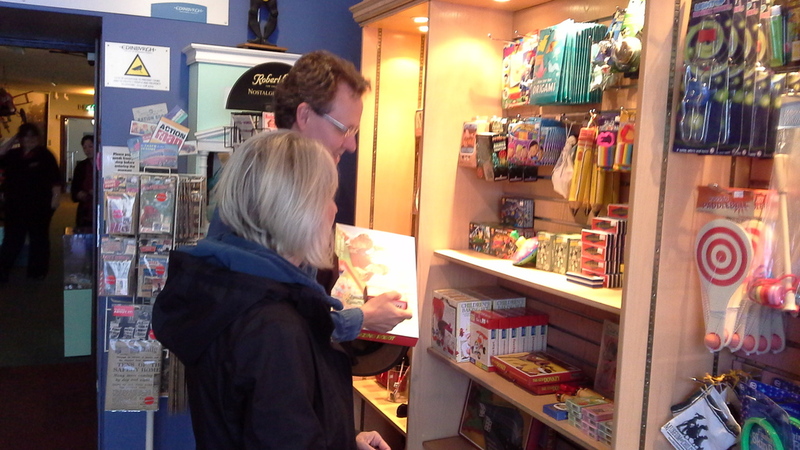 The Royal Princess berthed today at South Queensferry. 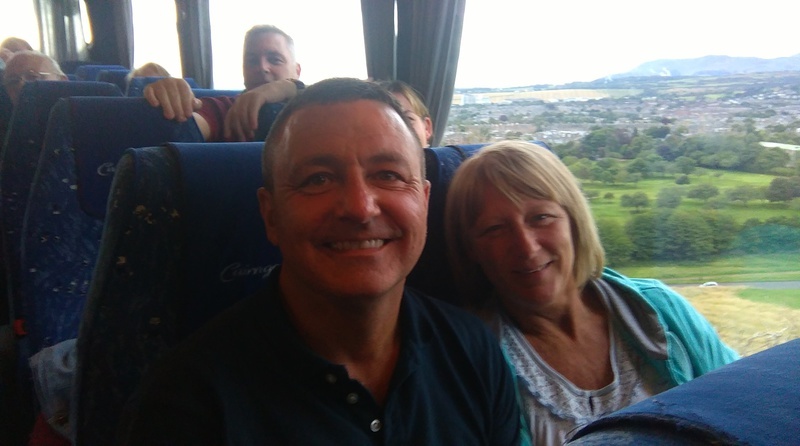 Driver Rab, from AAA coaches collected us at the quayside and we headed into Edinburgh for a tour and trip around the city and then a visit to Edinburgh castle where it all first started. 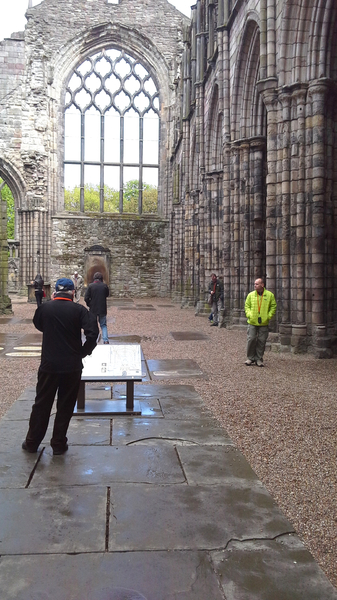 the oldest building today being st Margarest's Chapel built in the 12th Century. 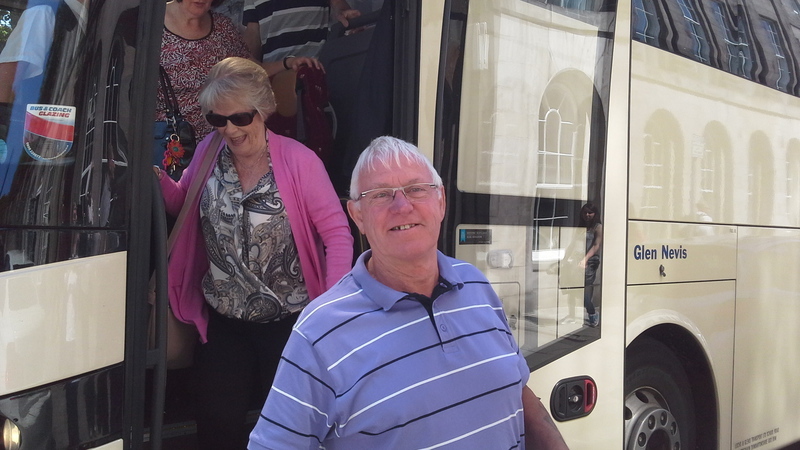 Passengers in awe of 'MY' city - no wonder - pretty sure there will be some return visits. 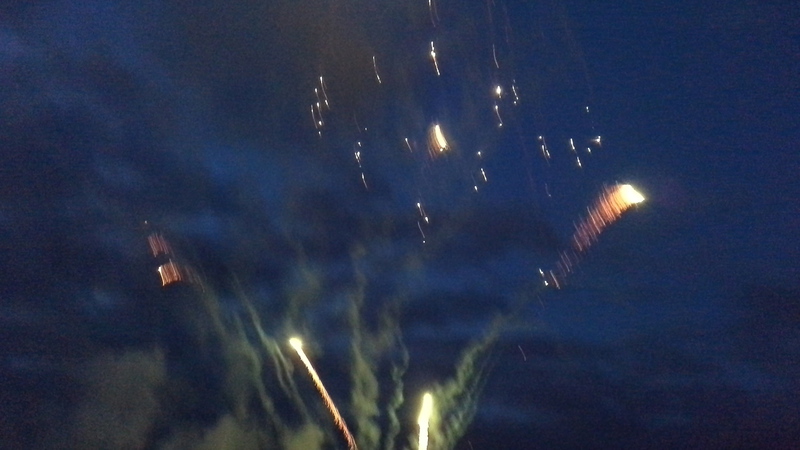 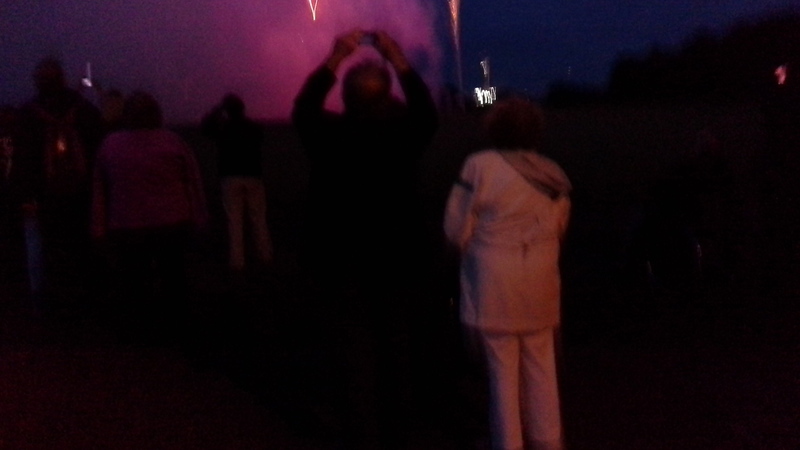 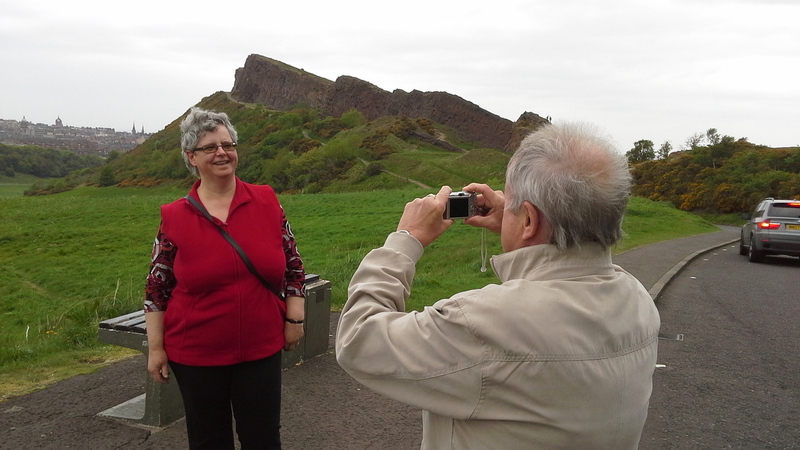 Unfortunately I wasn't so clever with my camera and lost a number of the photos - but lots of good memories of the day. Today I met passengers from the cruise ship Crystal Symphony at Rosyth and along with driver Jim, from Southern Coaches. 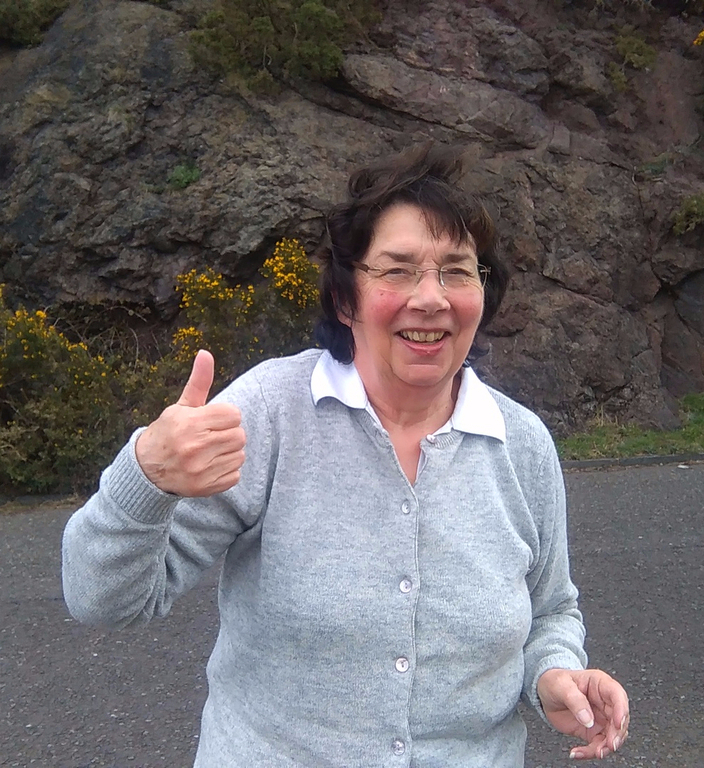 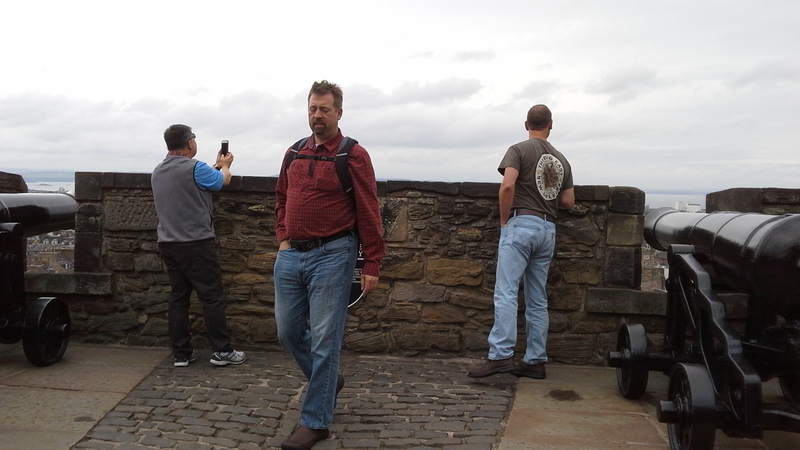 Once across the Firth of Forth, we went on a panoramic tour of Edinburgh taking in the wonders of the city. 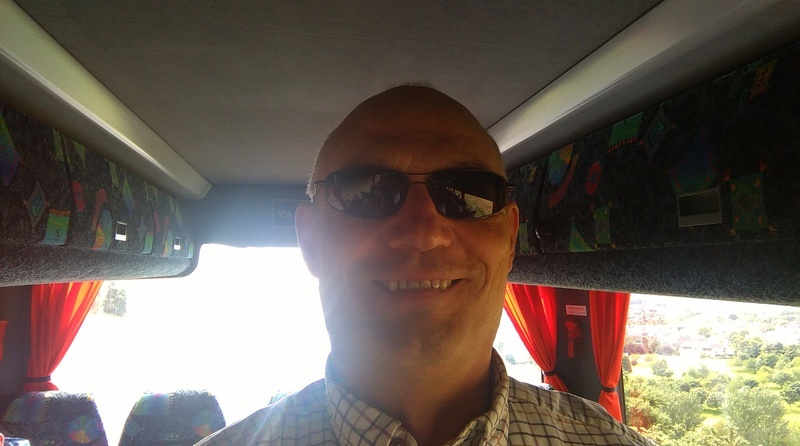 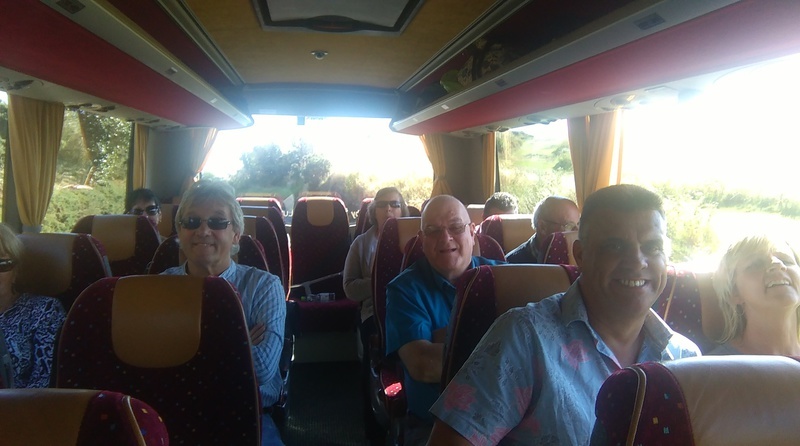 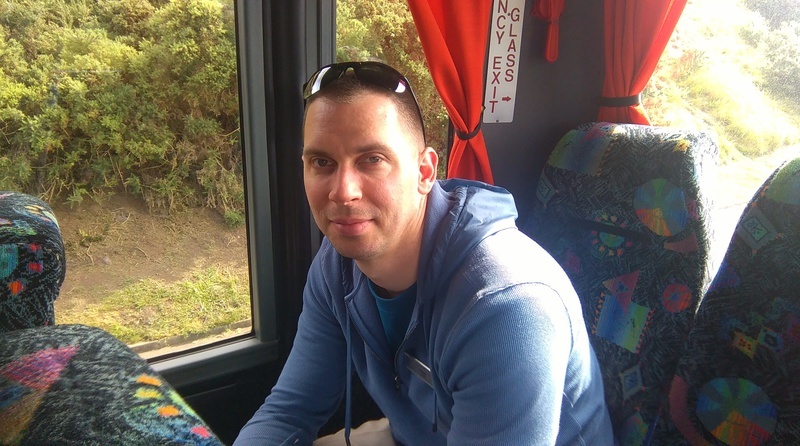 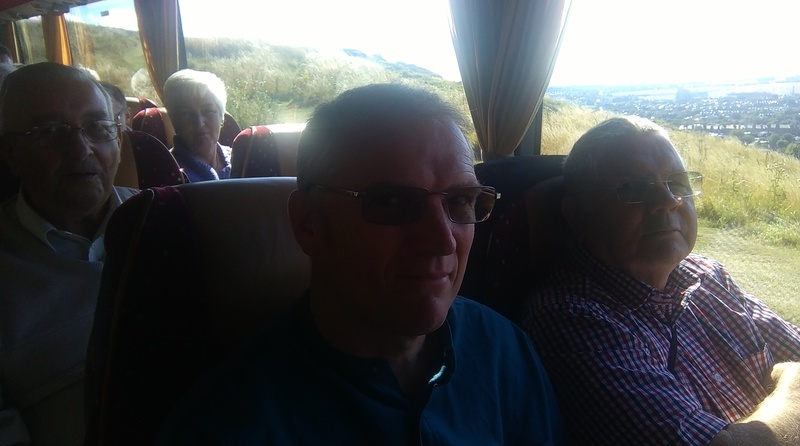 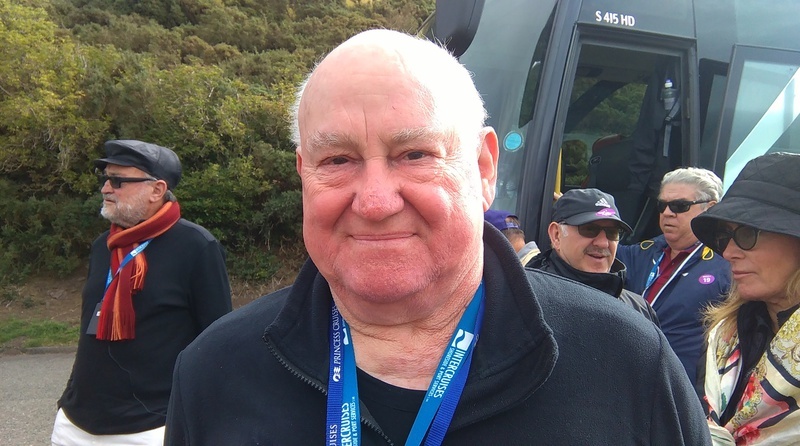 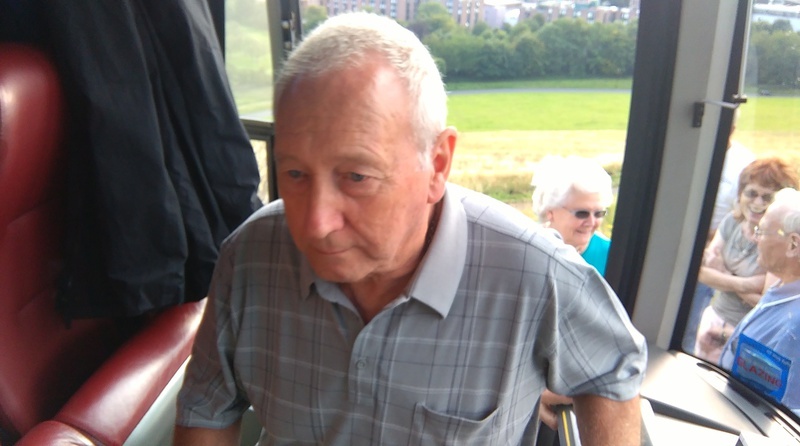 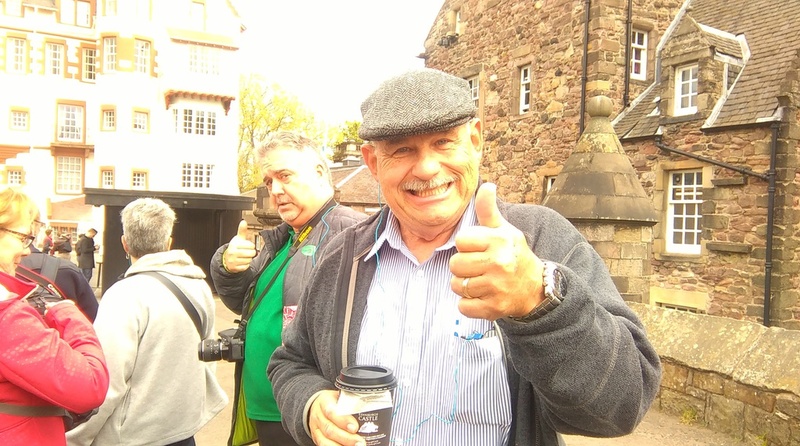 Paul back in the city with another coach party for a tour around 'my' city - this evening they're off to the Tattoo and are going to have a fab time. 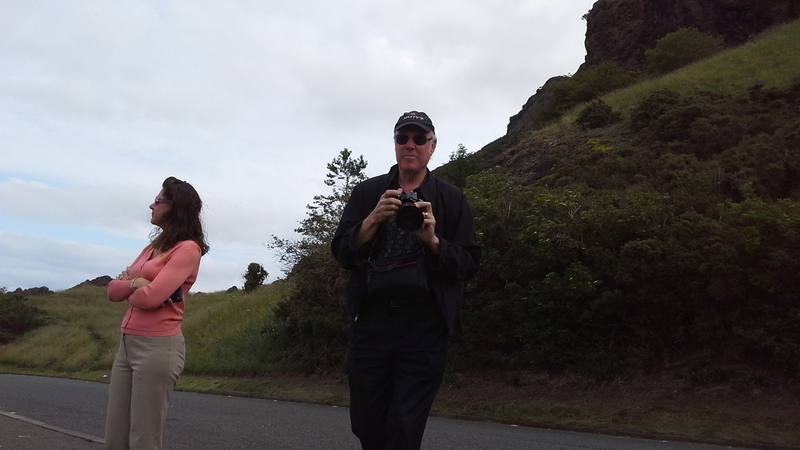 A wee bit shy of my camera but off camera great fun. 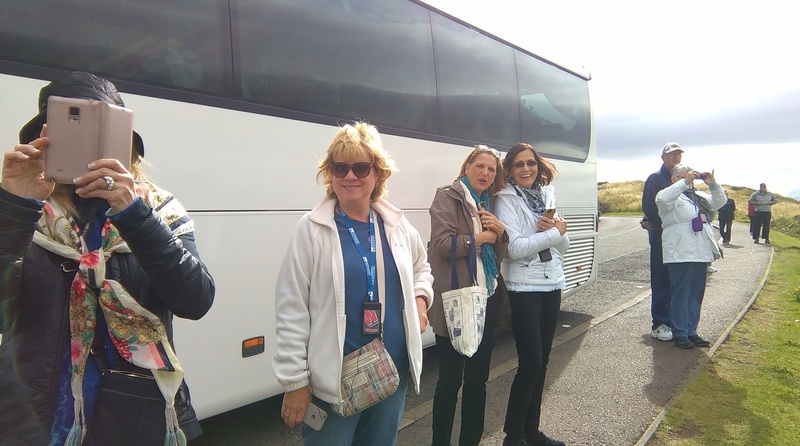 Collected American passengers from the cruise ship RSS Voyager at the Port of Newhaven today. 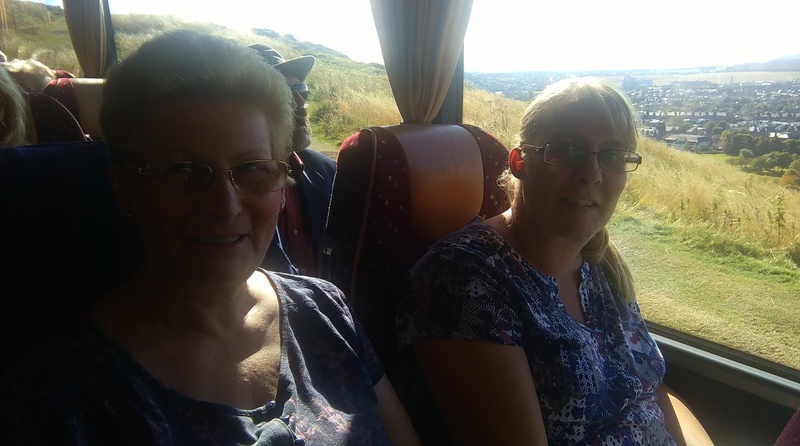 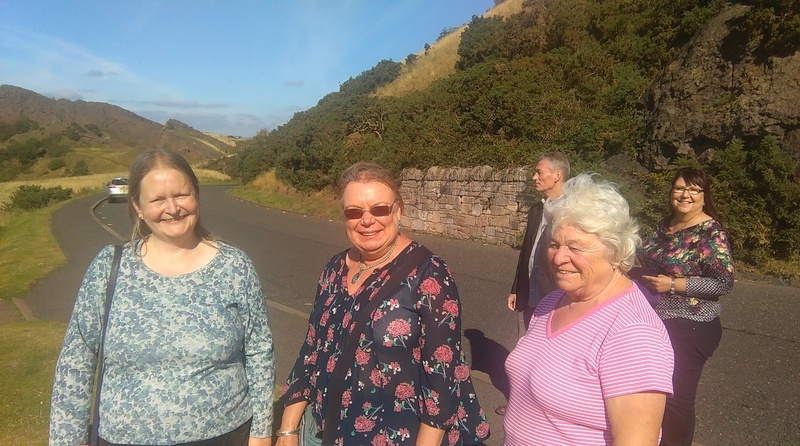 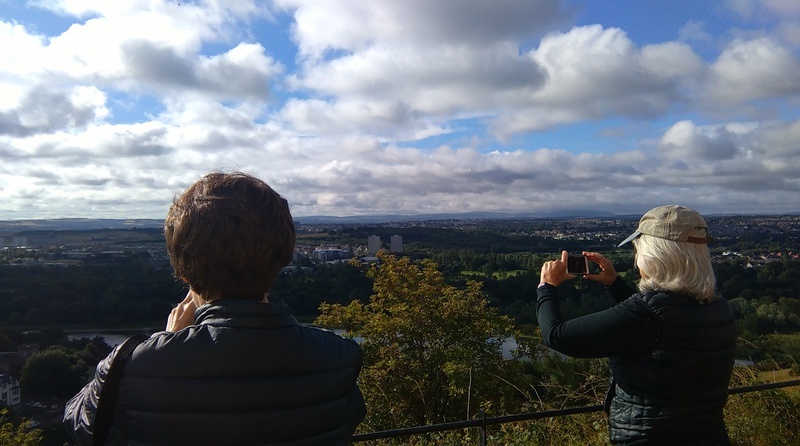 An early start to the castle to miss the crowds and then down the Royal Mile, along the 'Old Town' and into Holyrood Park before taking in the 'New Town' on our journey back to the Port. 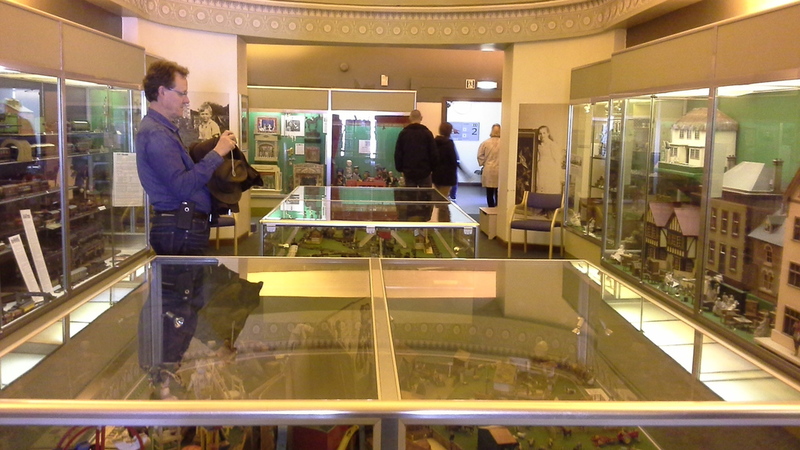 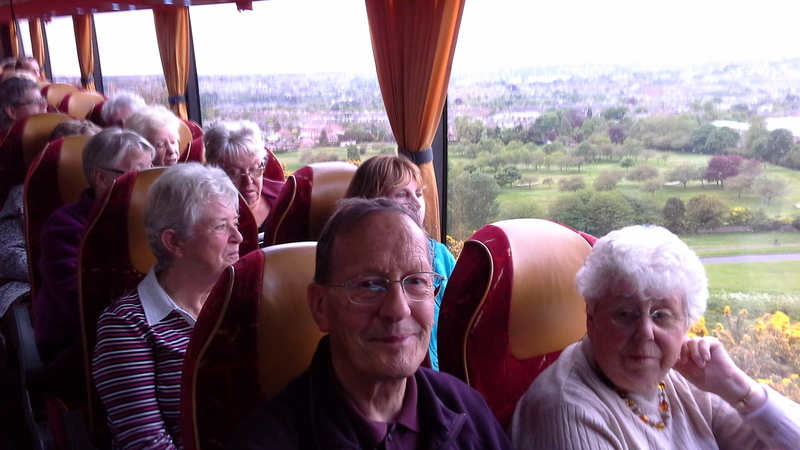 Richard brought his group from Liverpool and surrounding areas. 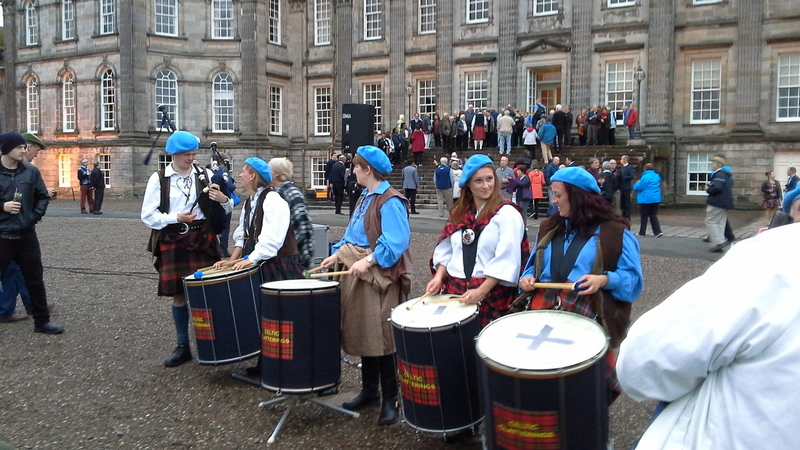 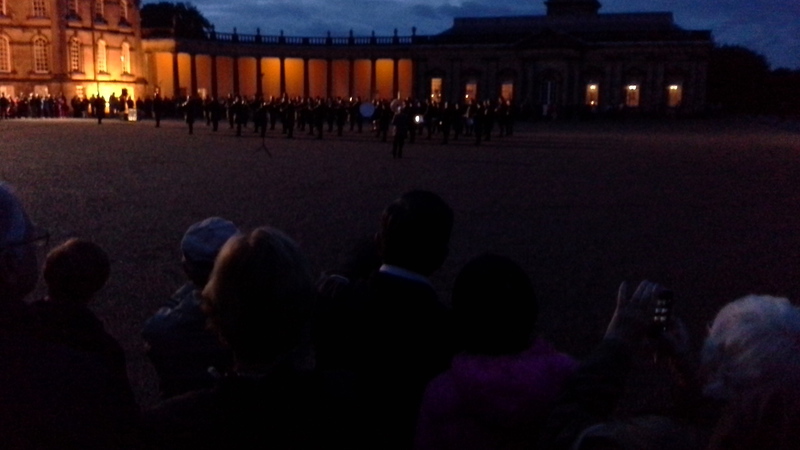 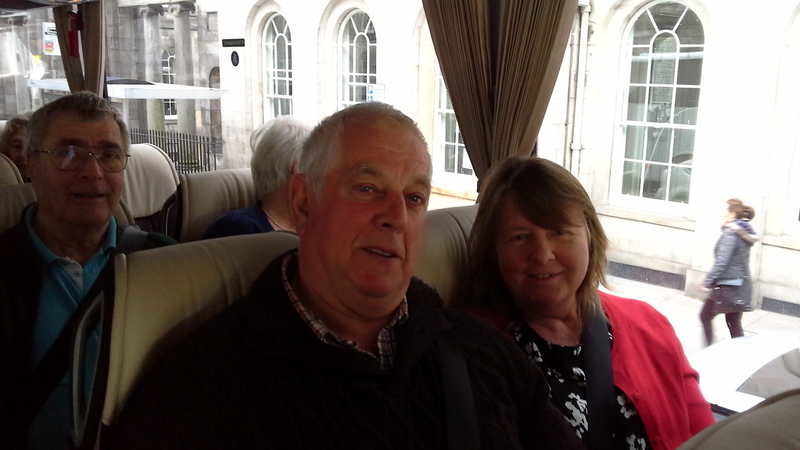 A late afternoon tour around the city and then an evening at The Royal Edinburgh Military Tattoo. 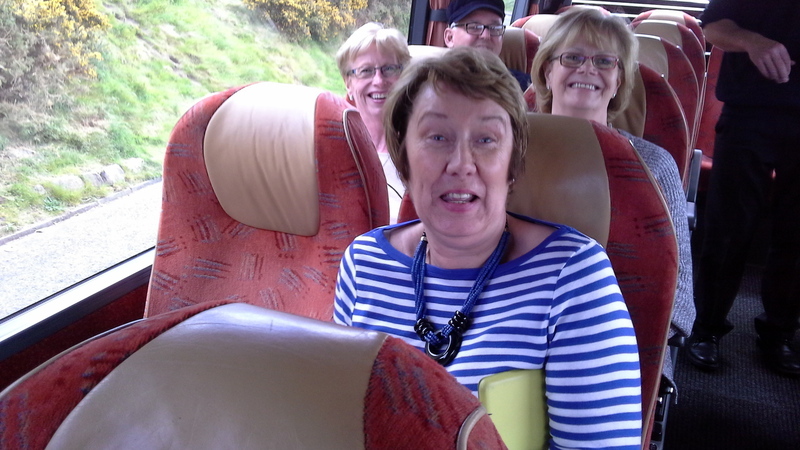 Afterwards a two and a half drive up to Kingussie where they're staying - sleepy heads tomorrow I think! 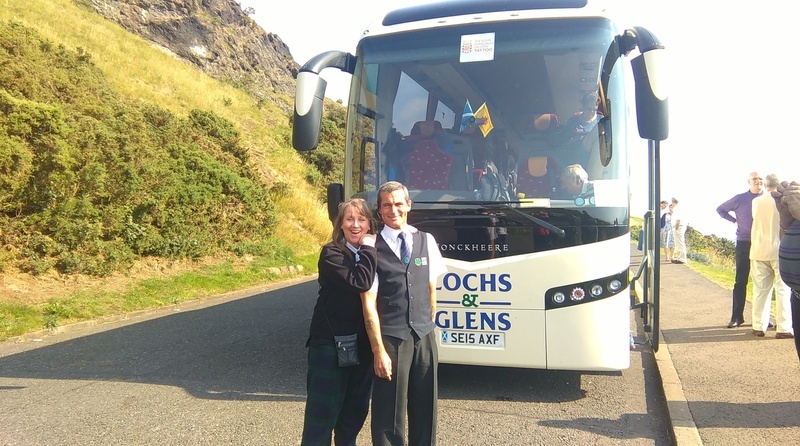 What a scorcher of a day ( by Edinburgh standards 17ish) Stuart brought his coach to the city with passengers for the Tattoo tonight. 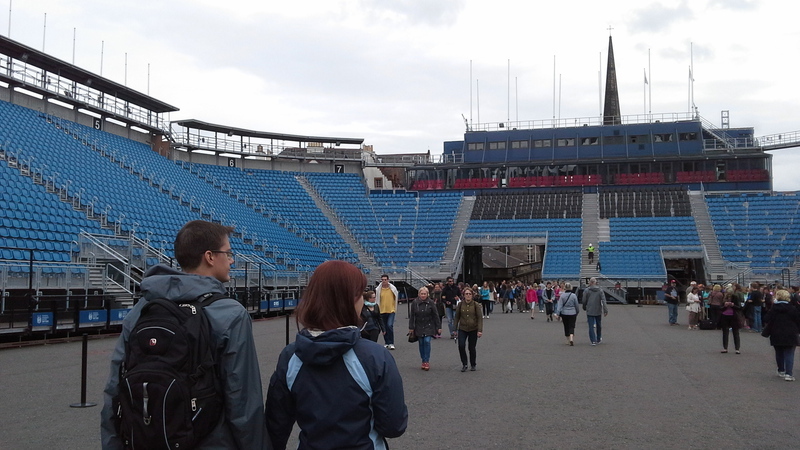 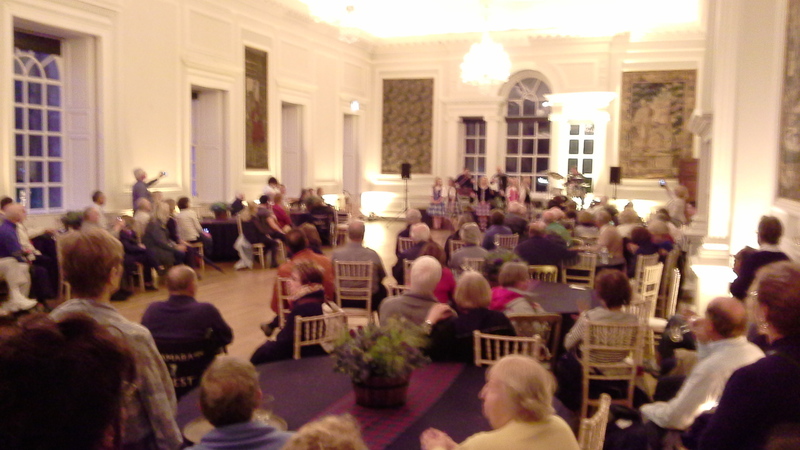 Edinburgh is packed at this time of year with entertainment and visitors from all over the world. 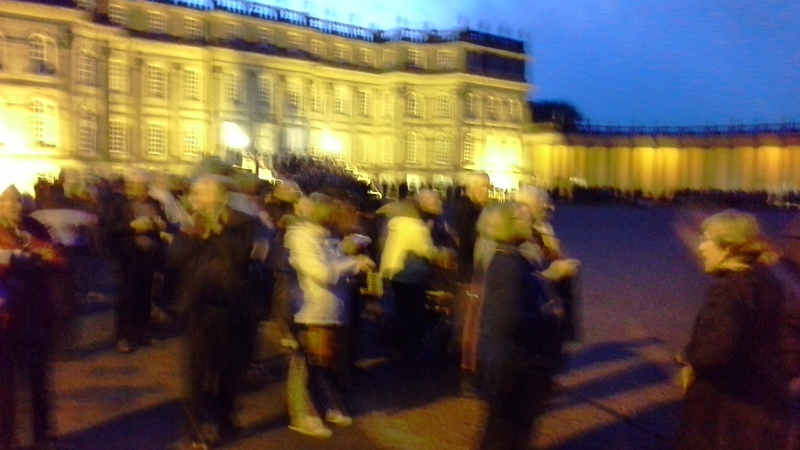 There really is no other place to be. 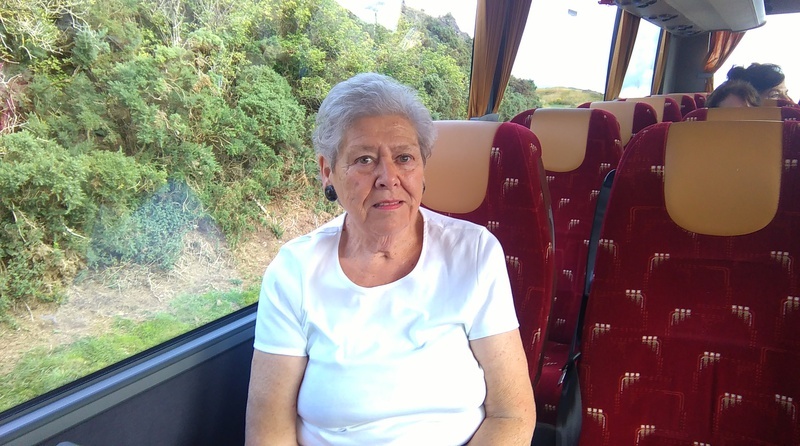 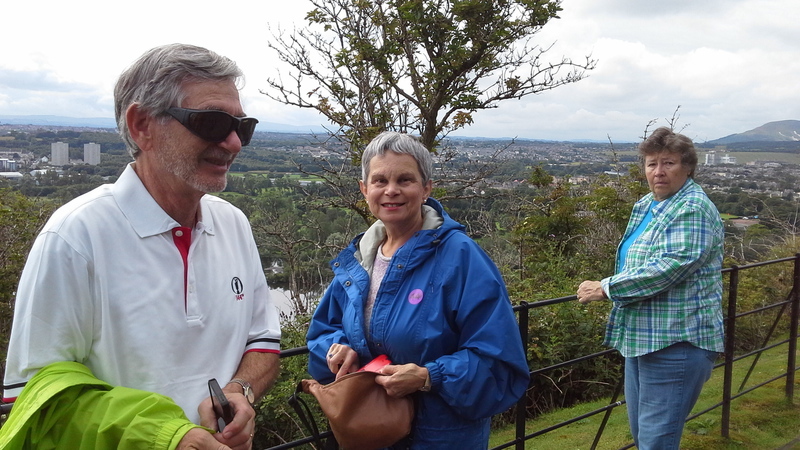 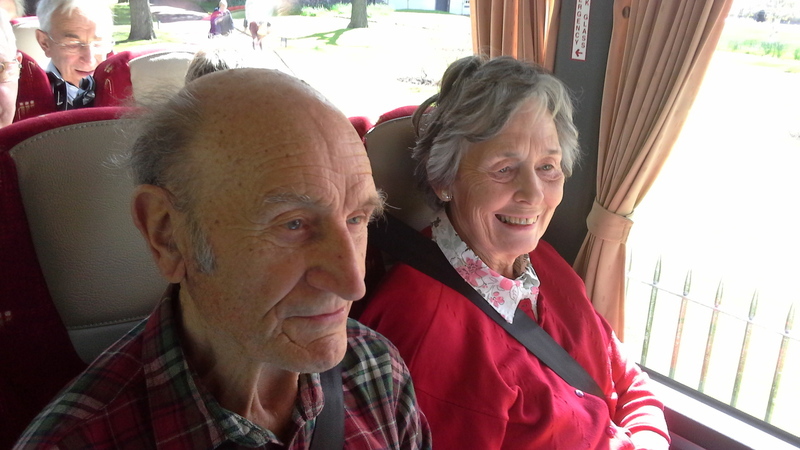 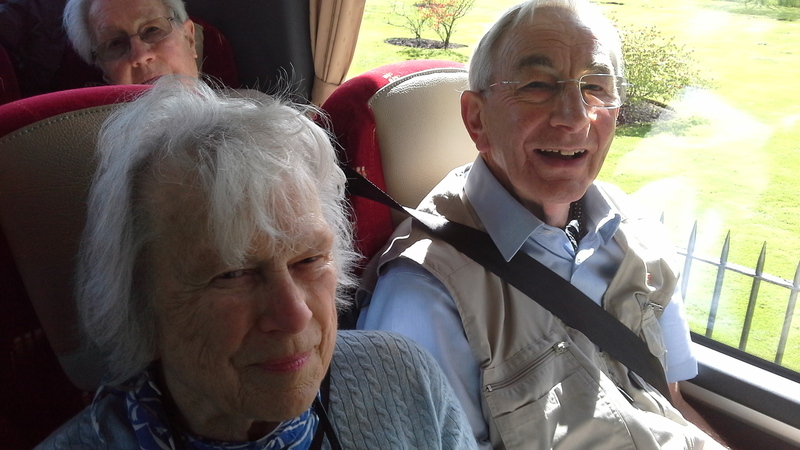 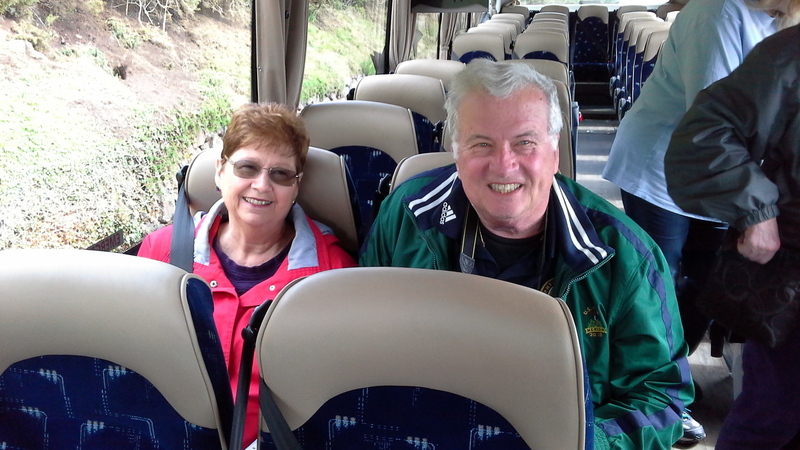 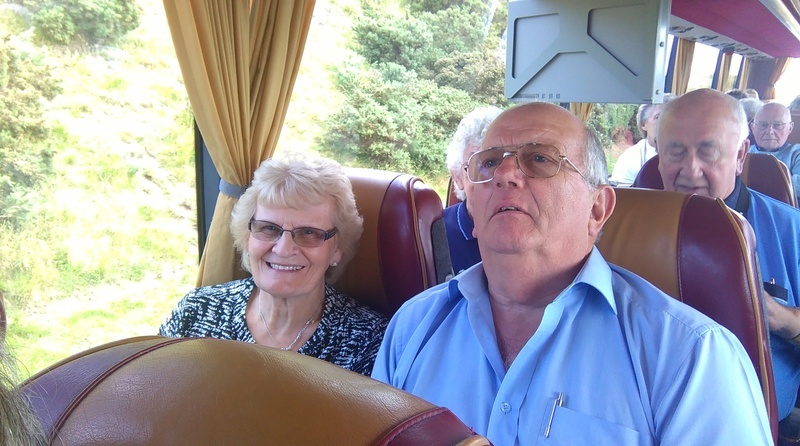 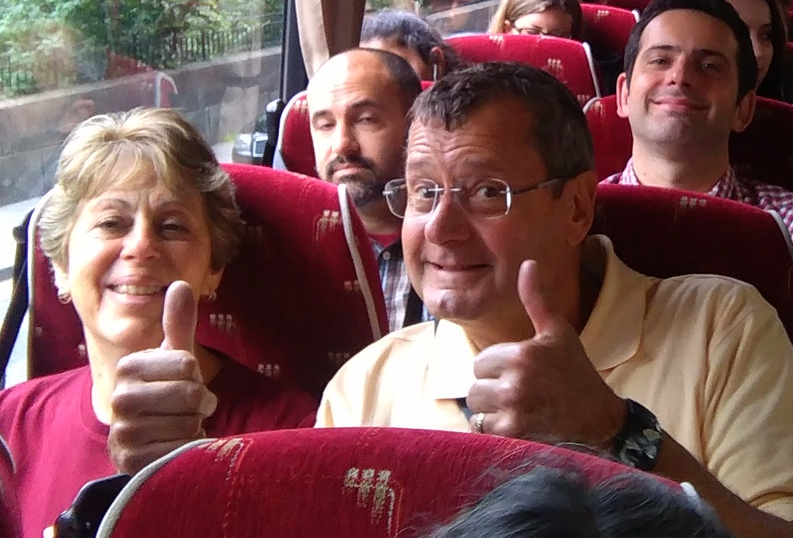 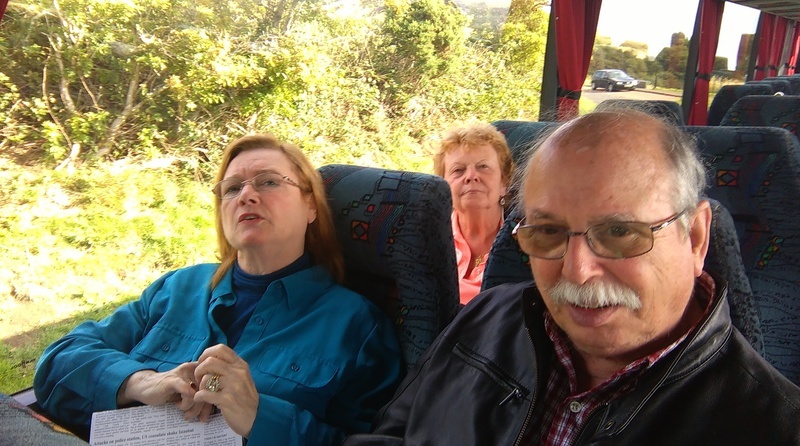 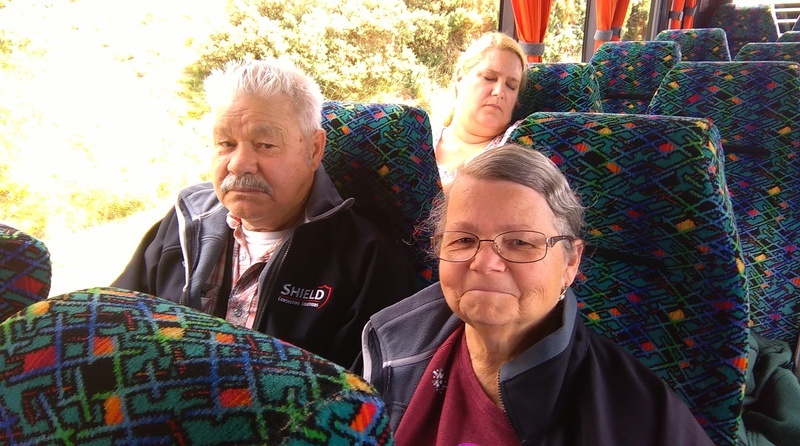 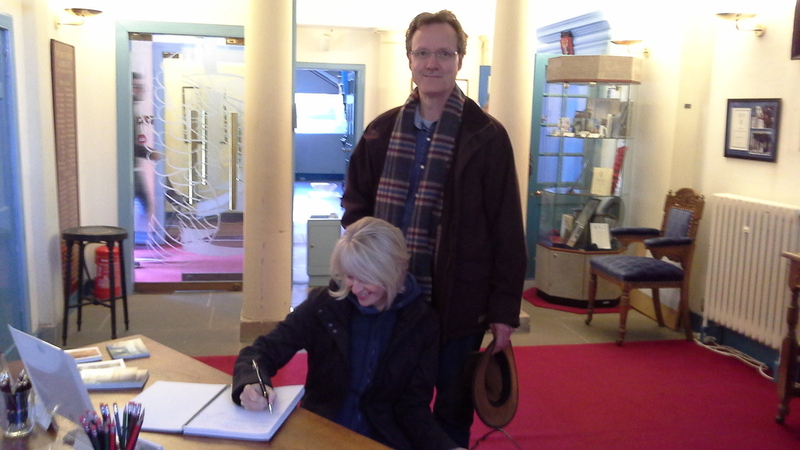 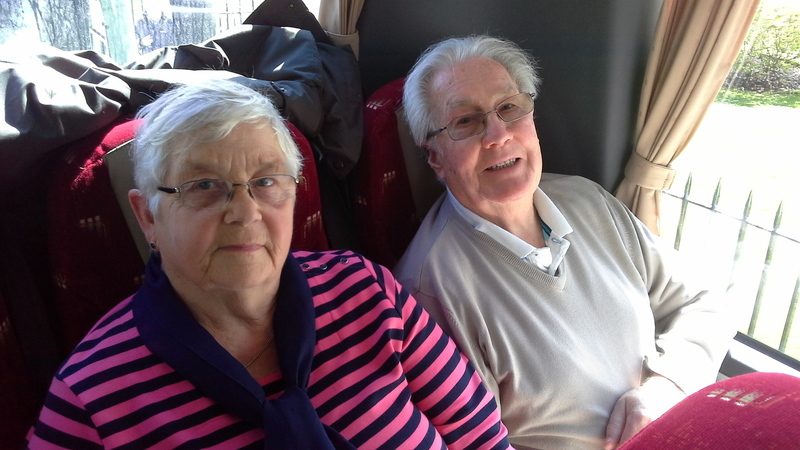 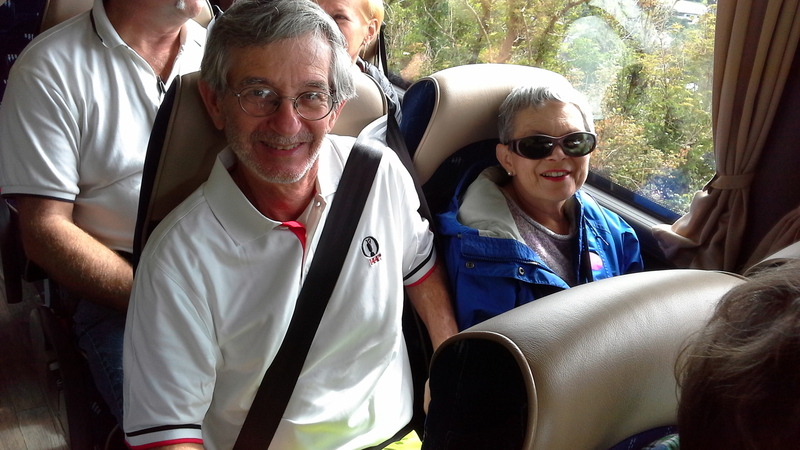 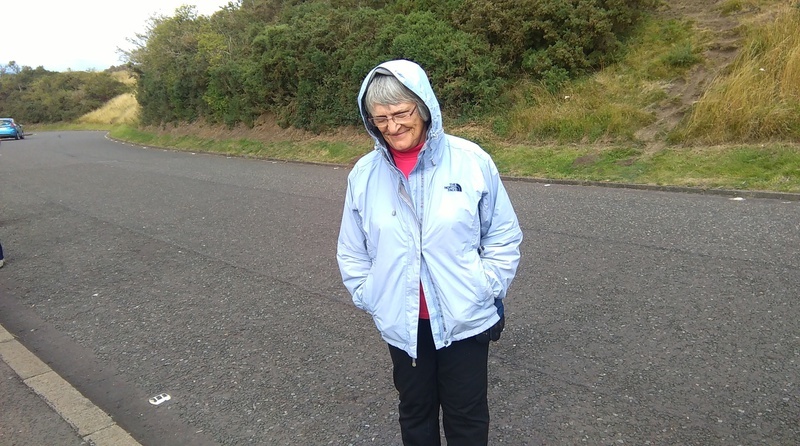 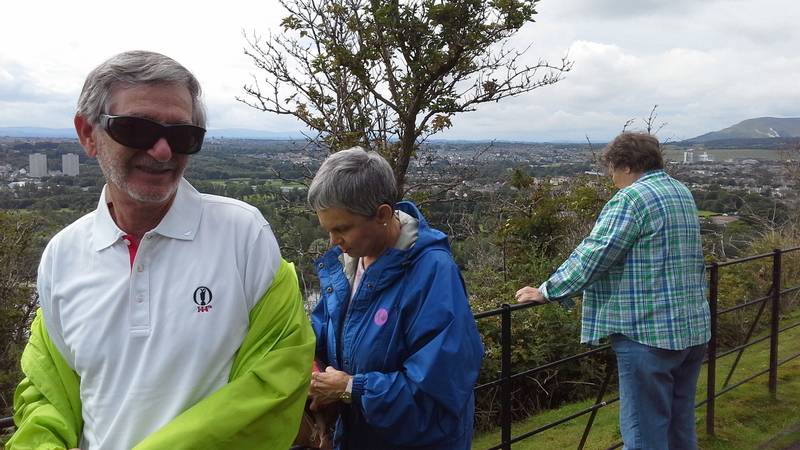 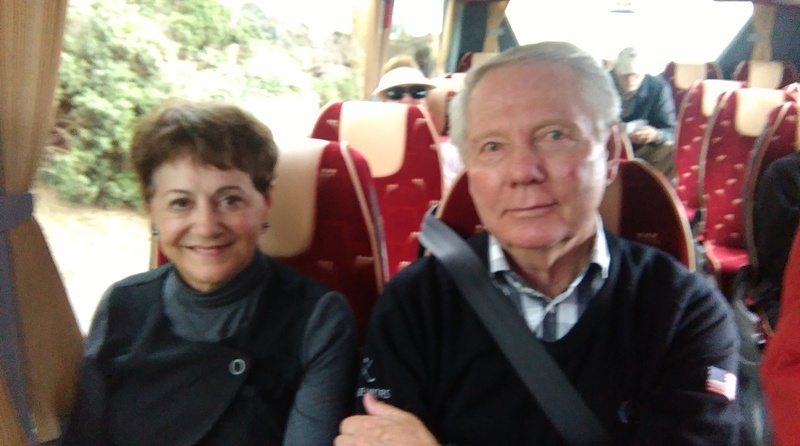 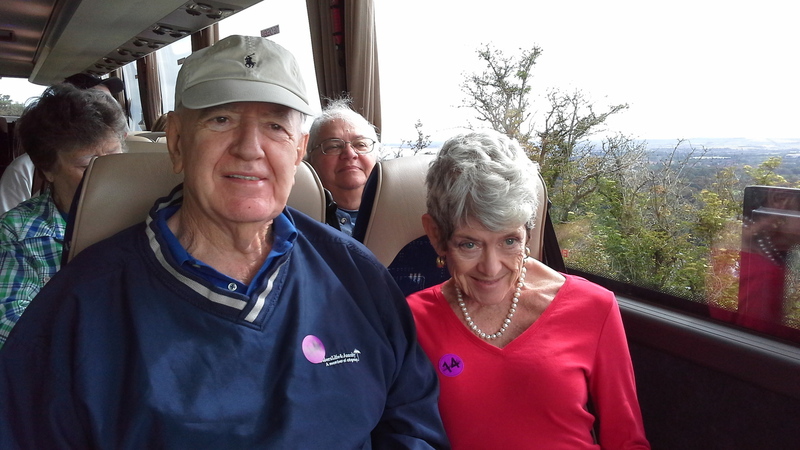 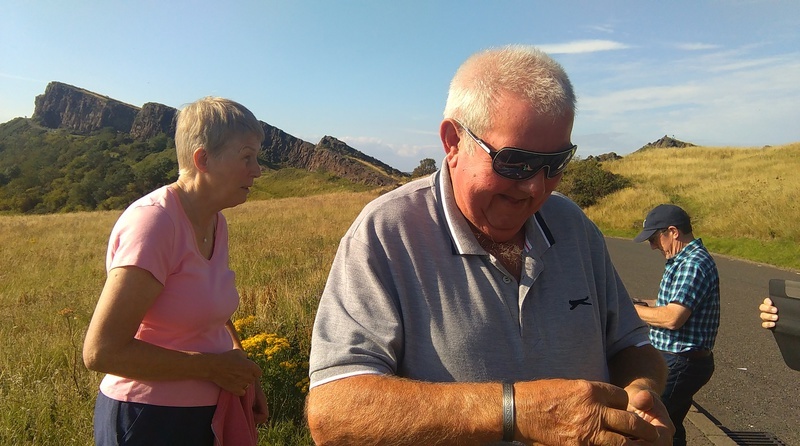 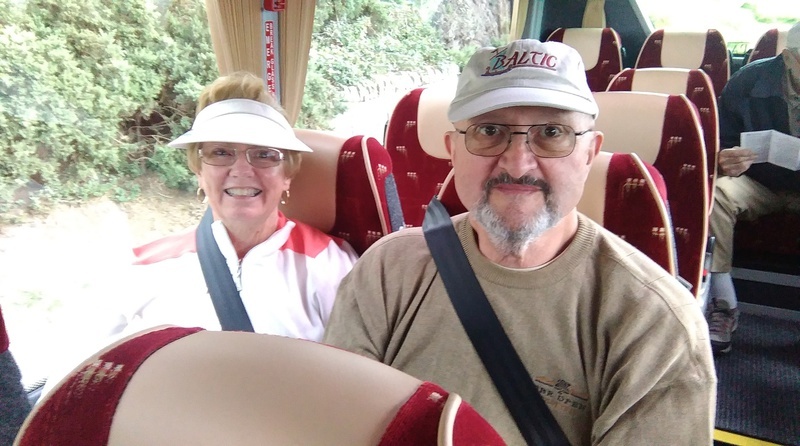 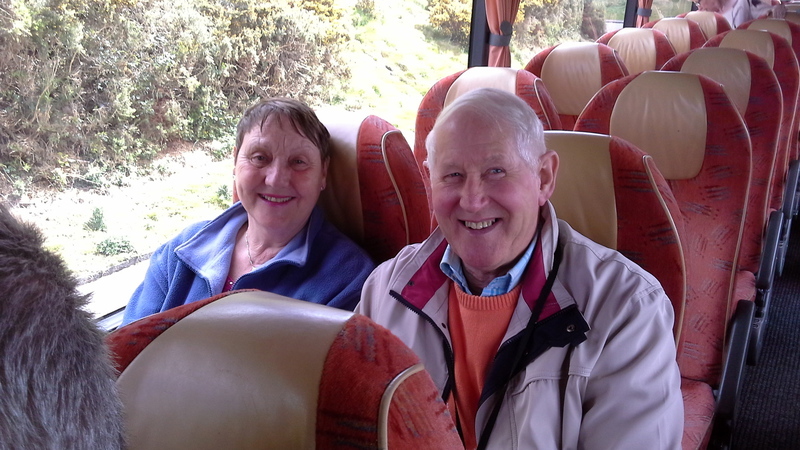 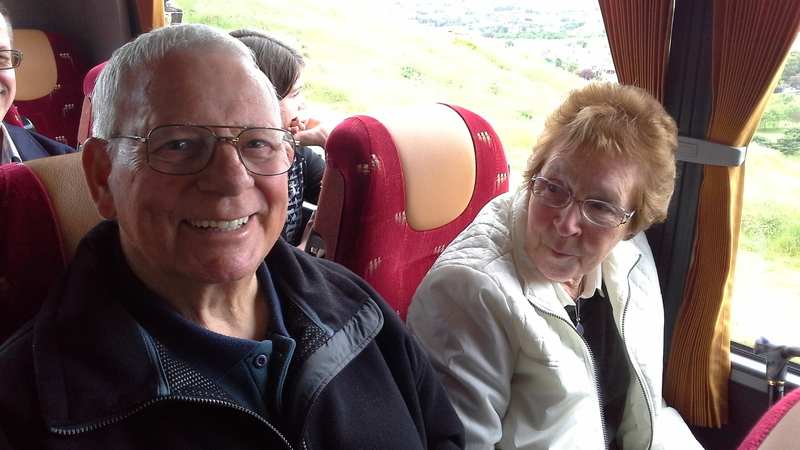 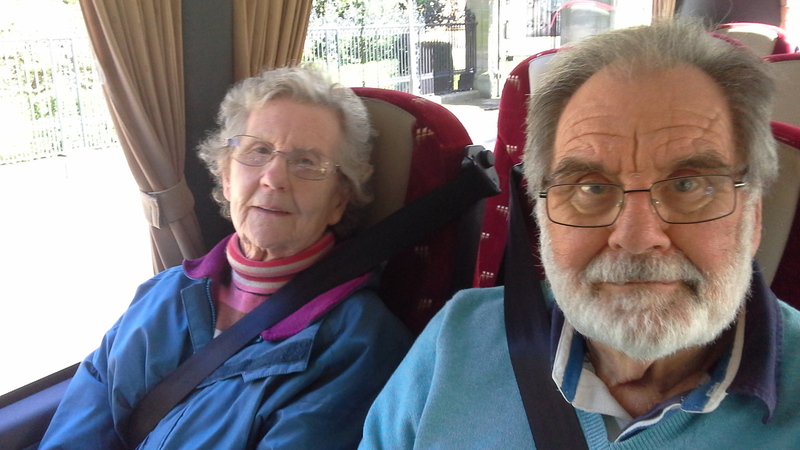 Today I went out on a tour with John and Marilyn from Florida. 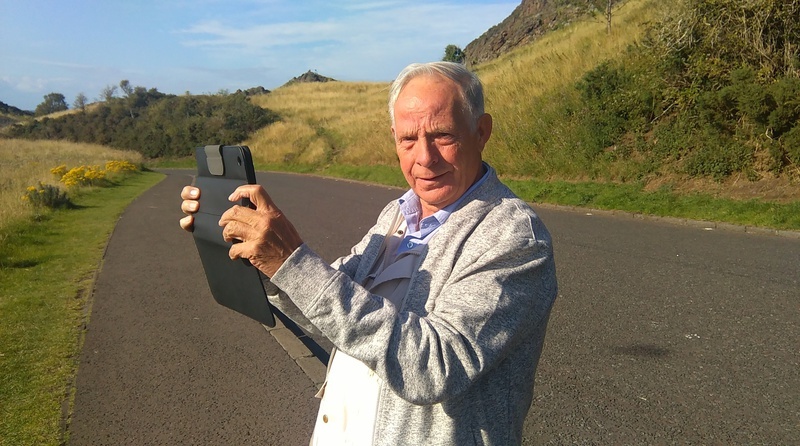 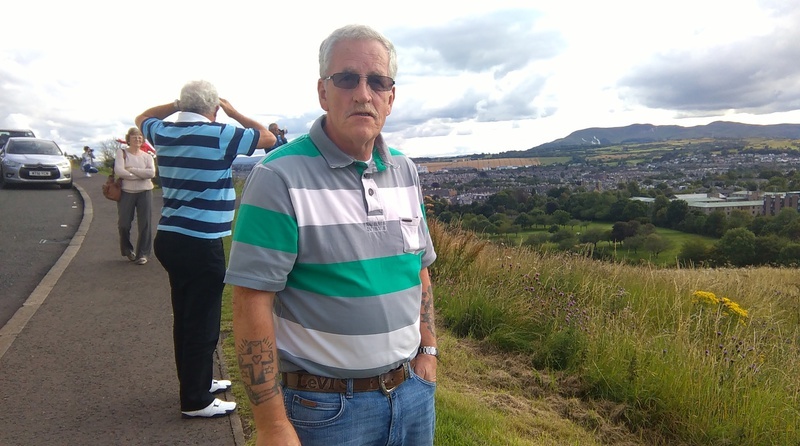 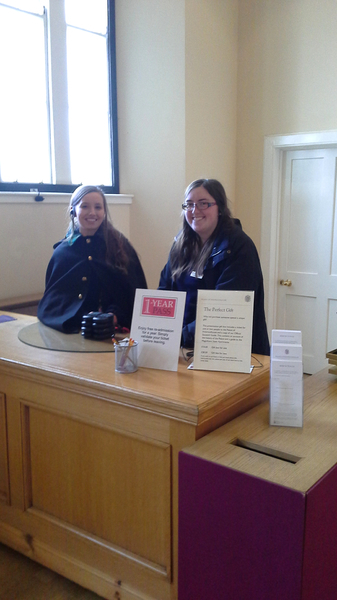 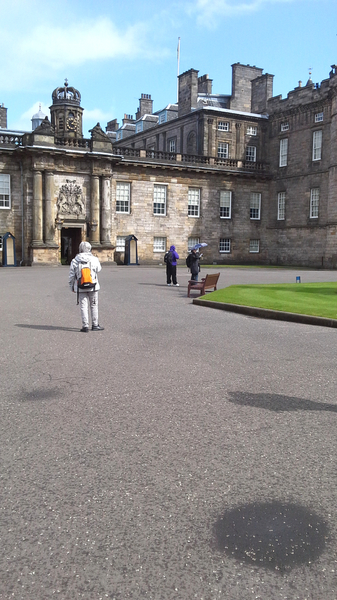 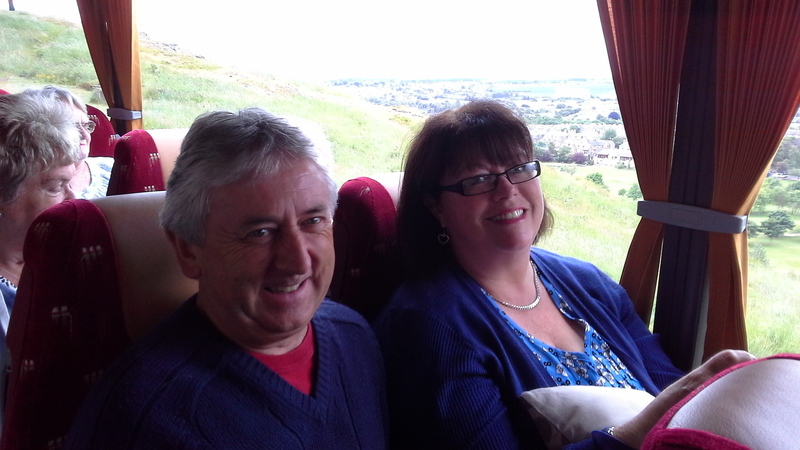 Our driver Russell took us through the city of Edinburgh and out to Roslin on the outskirts of Edinburgh. 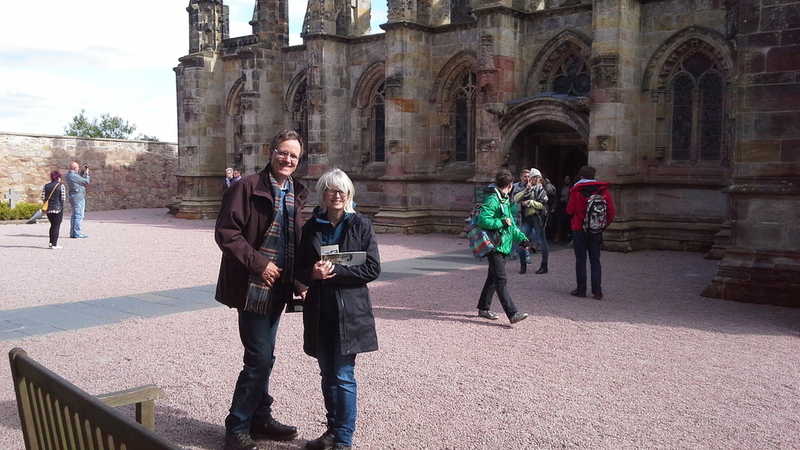 Blessed with great summer weather we visited Rosslyn Chapel, a place many associate with the 'Da Vinci Code' book and film. 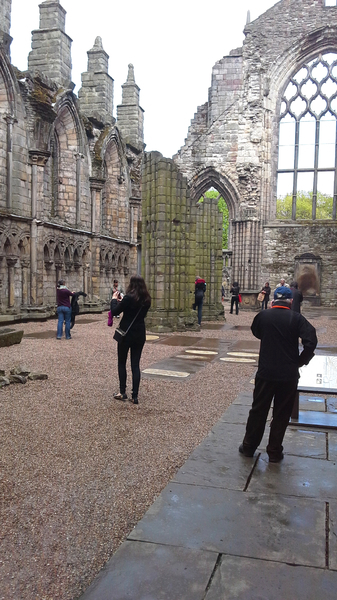 But the Chapel already has it's own ancient history. 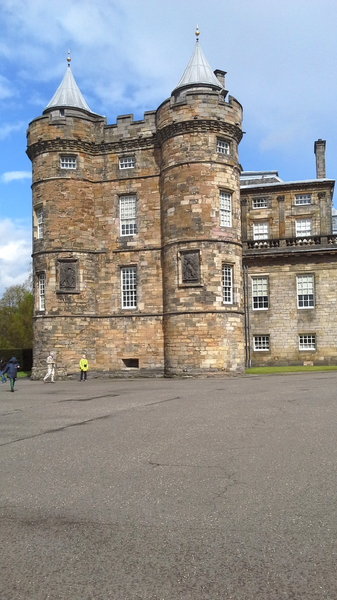 A gem of a building in the middle of nowhere. 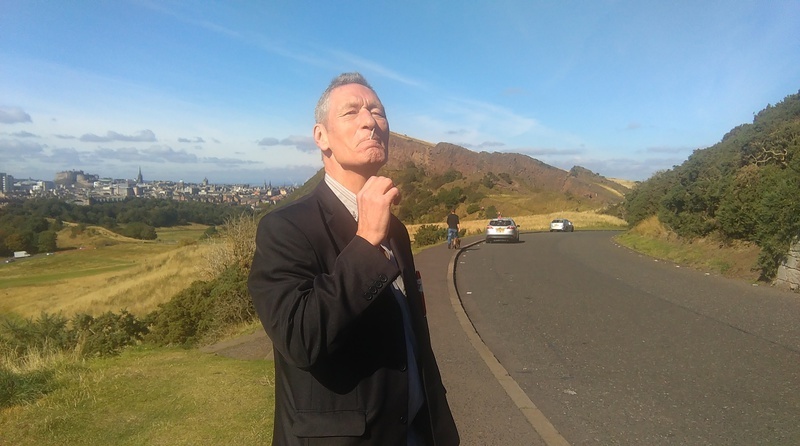 What a glorious day. 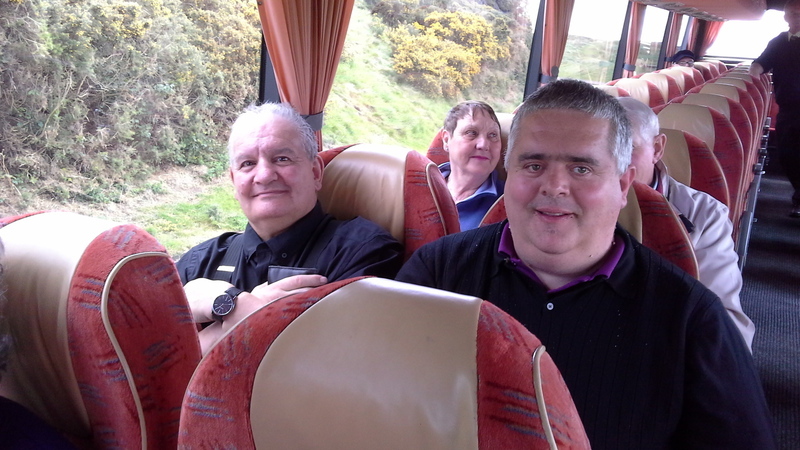 Drivers Iain and Luke brought their coaches into Edinburgh for the day.Traveled with Iain first and then joined Lukes party. 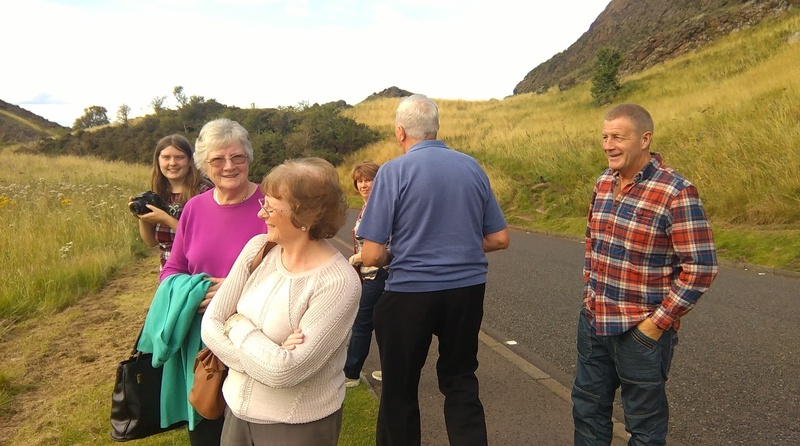 Tonight they're all off to see The Royal Edinburgh Military Tattoo. 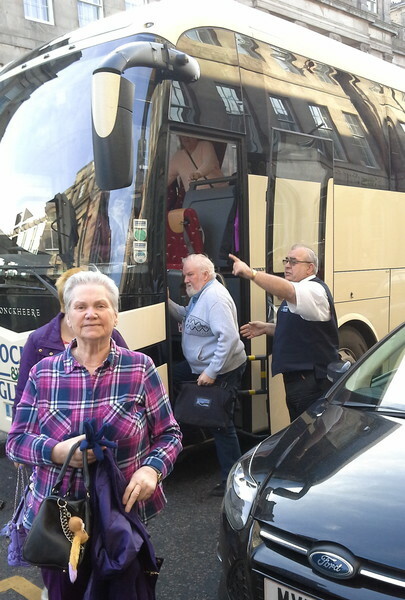 They're in for a real treat. 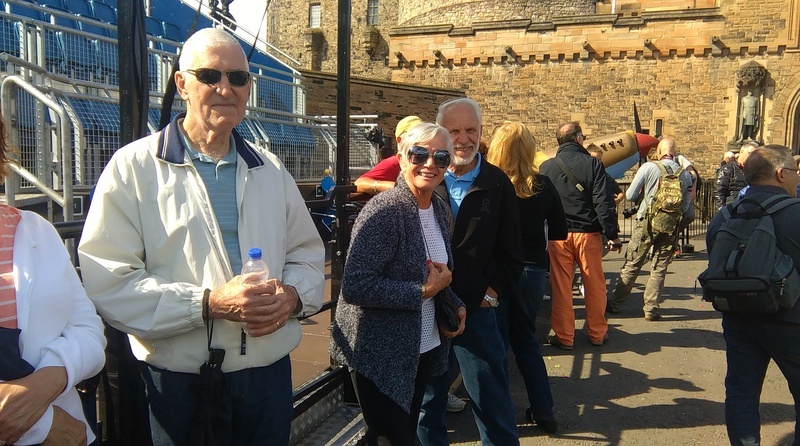 The 'Azamara Quest', docked in at Leith and I joined one of their 'coach parties' with driver Alan, for a tour around Edinburgh with a visit to Edinburgh Castle. 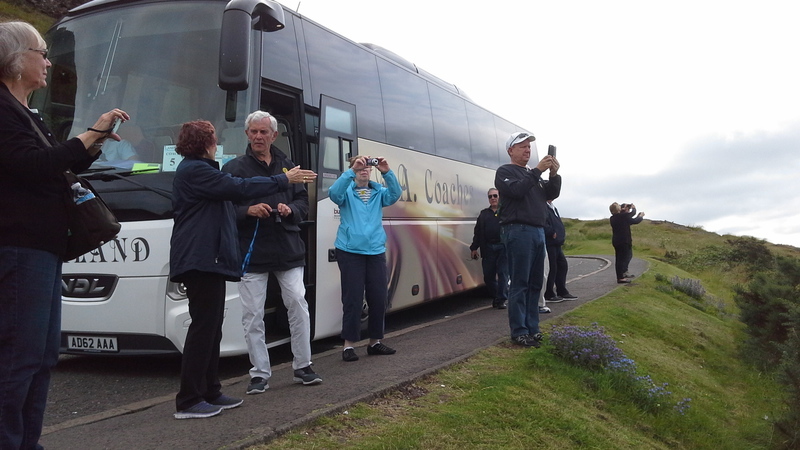 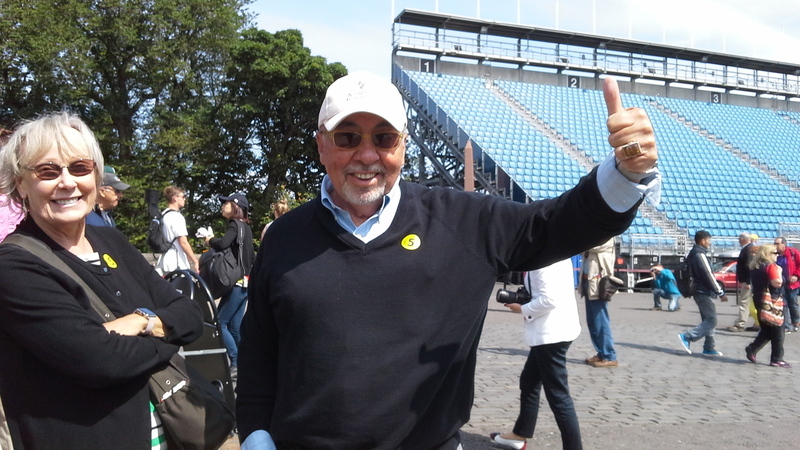 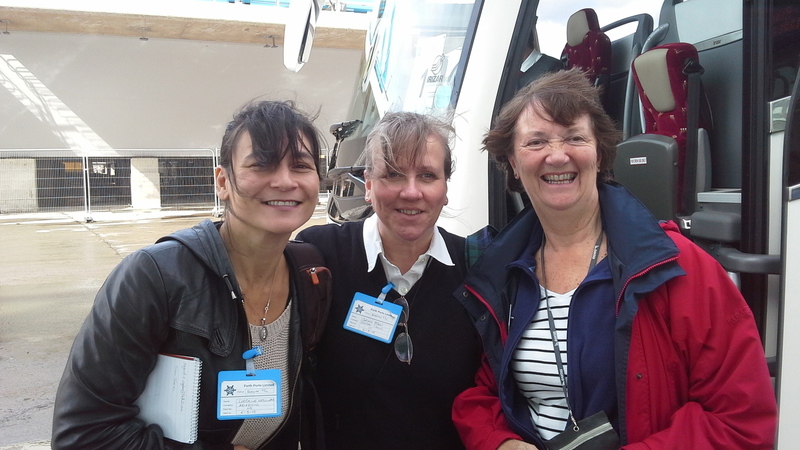 Many of the ship's passengers had taken a trip up to St Andrews for the first day of the Open. 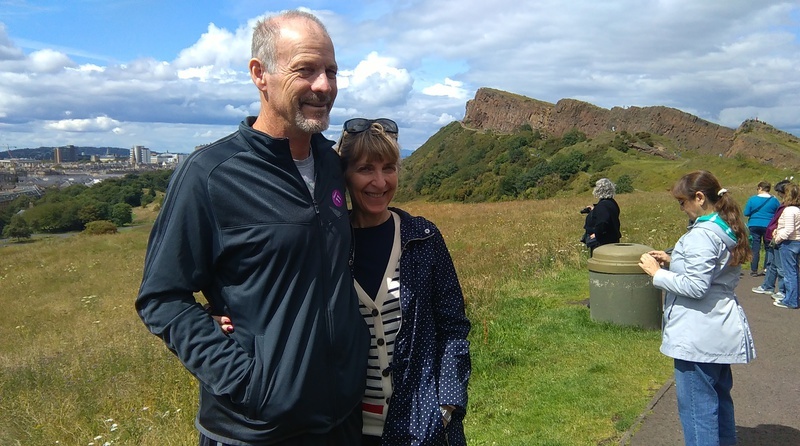 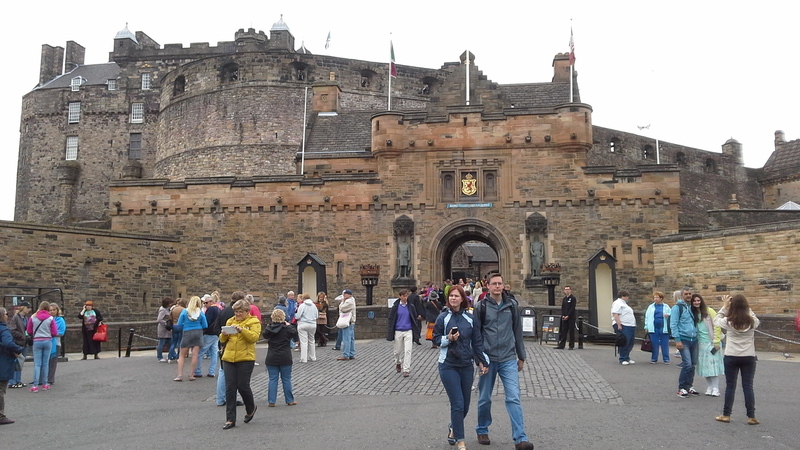 We went through my favourites of the Grasssmarket and Cowgate and a view around Holyrood Park before checking out the castle. 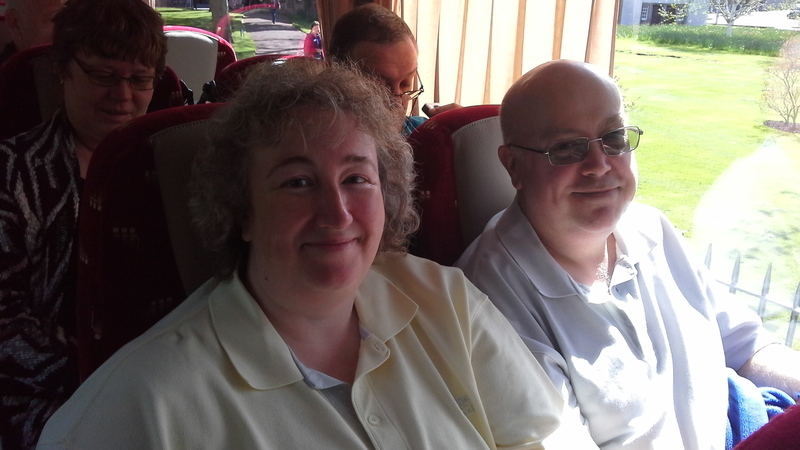 Finally winding our way in and around the New Town and dropping off 1 or 2 for shopping before returning to the ship. 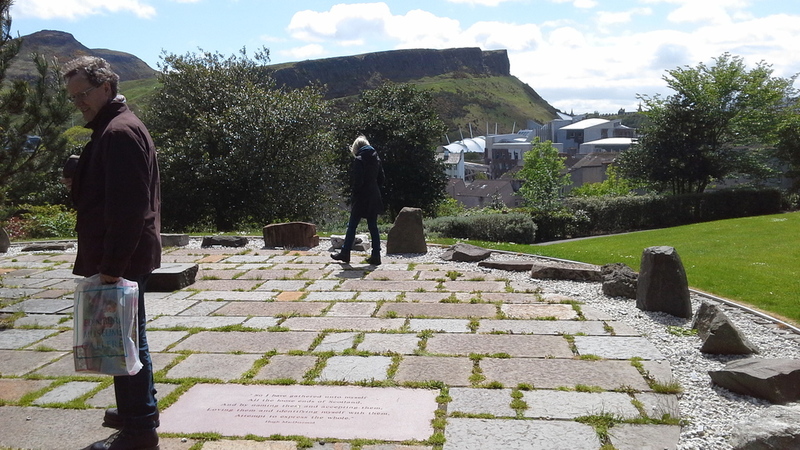 he Azamara will be docked for 4 days but not long enough to see this wonderful city - pretty sure they'll be back! 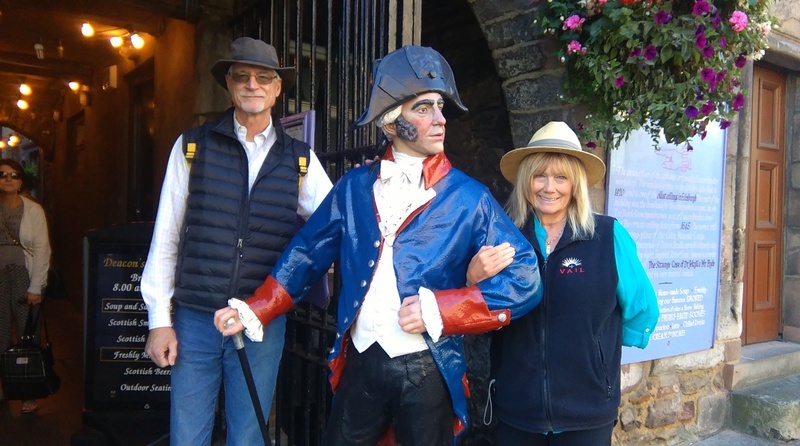 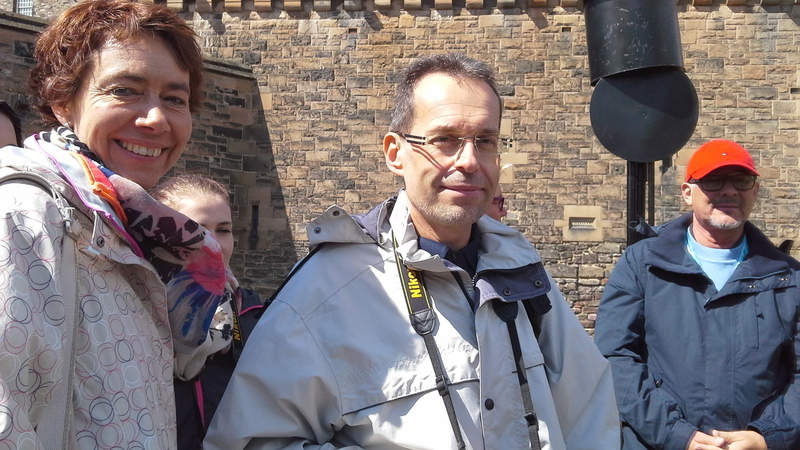 A walking tour today with American couple Jim and Nancy. 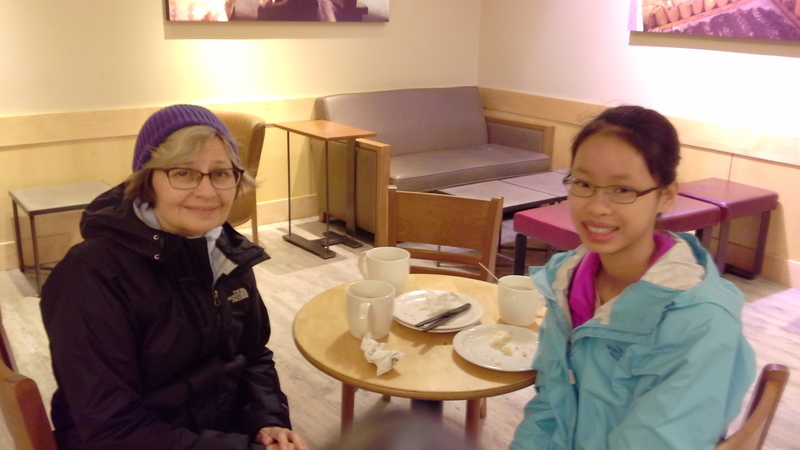 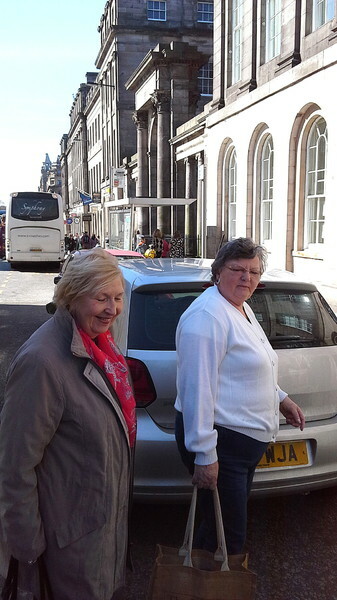 Finishing up with a shopping trip in Romanes and Paterson on Princes Street. 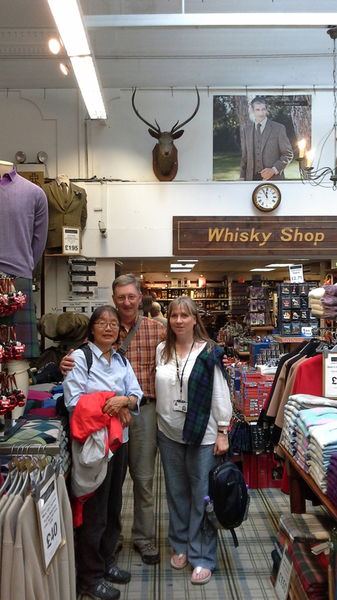 The shop to visit if your want a 'Scotish Souvineer'. 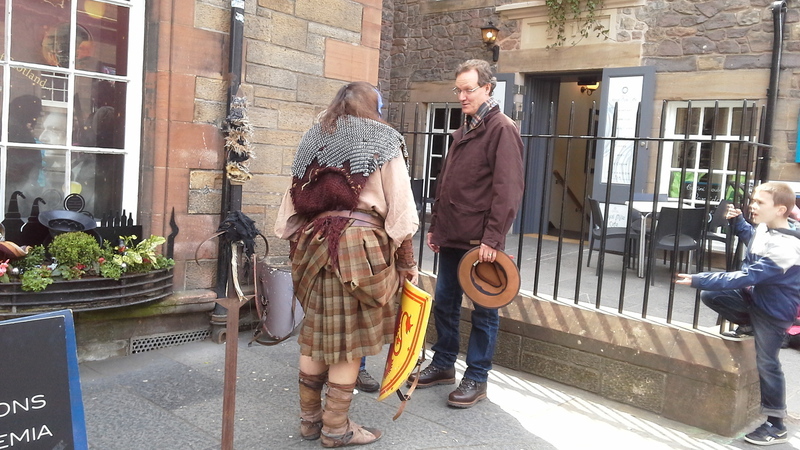 Full Highland dress or a stick of rock and if you're over 18 , maybe something from their range of whiskys? 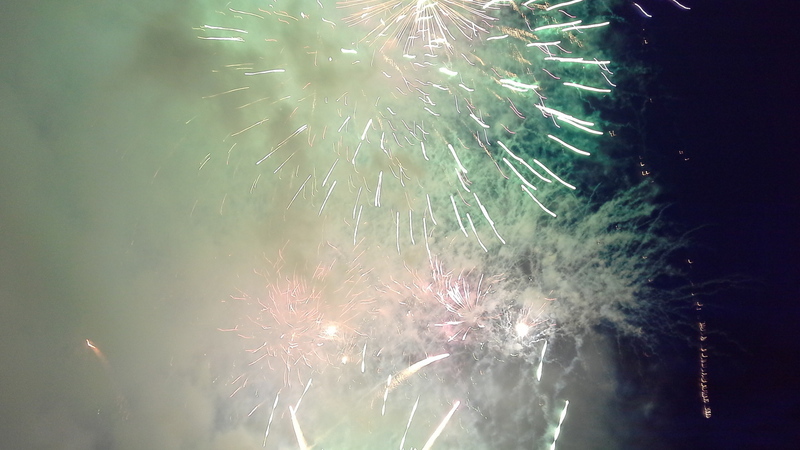 - this is where to go. 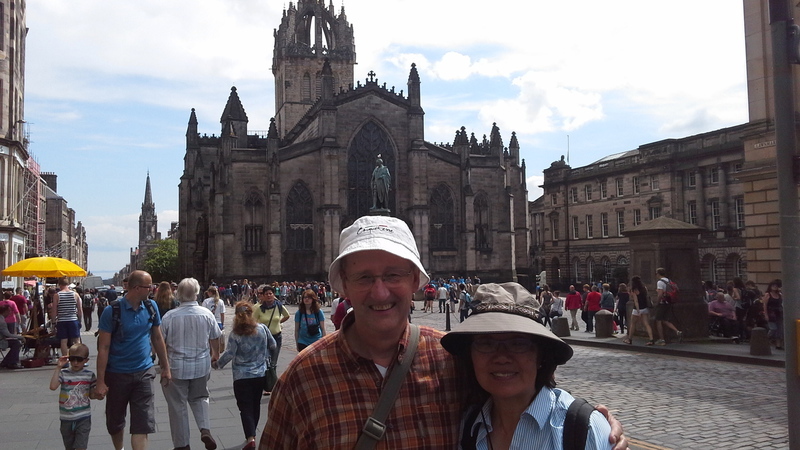 We met up in the lawnmarket and moved our way through the old town. 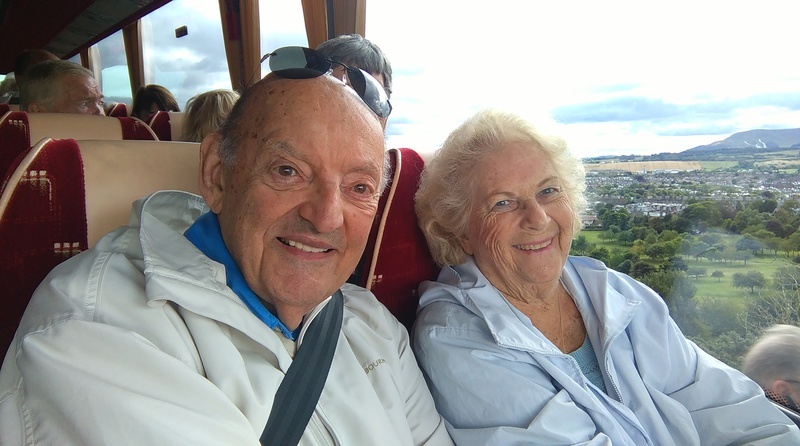 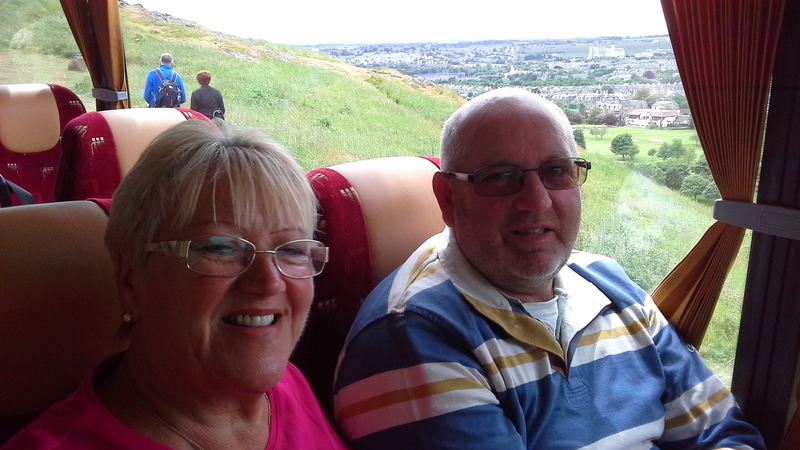 Jim and Nancy had been on one of the open top tours on Wedneday, so we were able to investigate what they couldn't have seen from the tour bus. 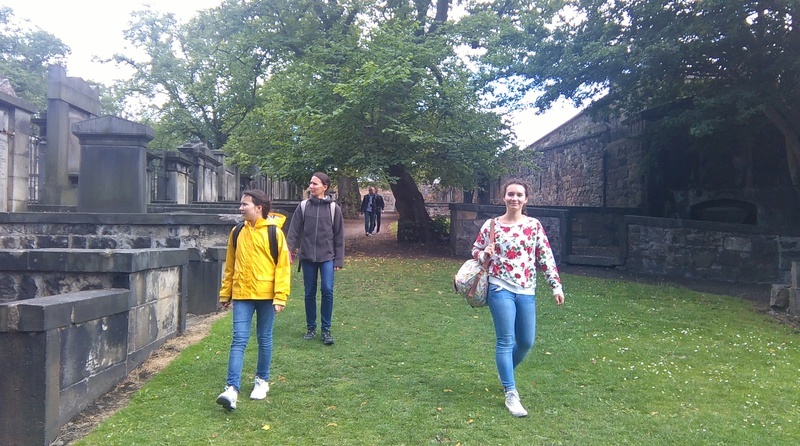 Greyfriars Graveyard being one of them. 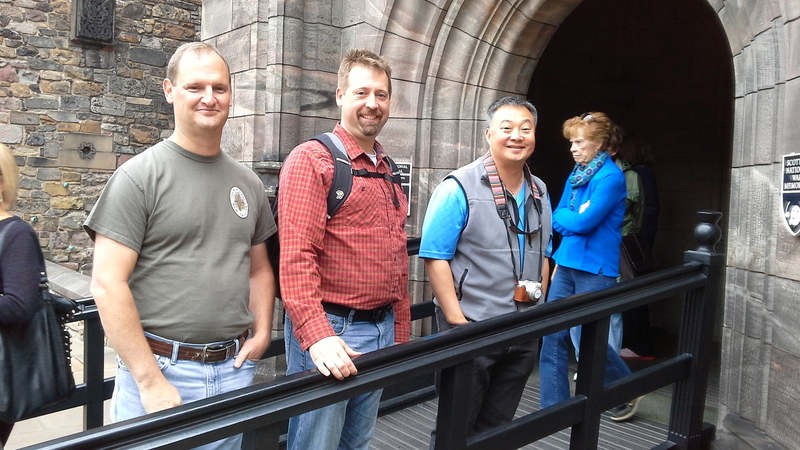 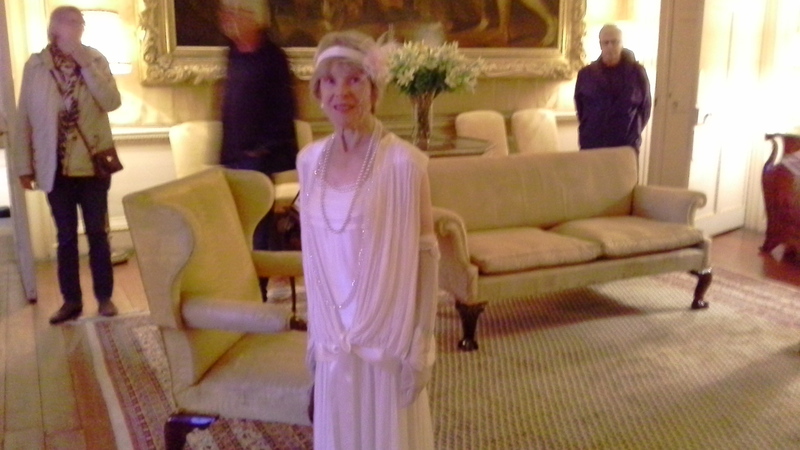 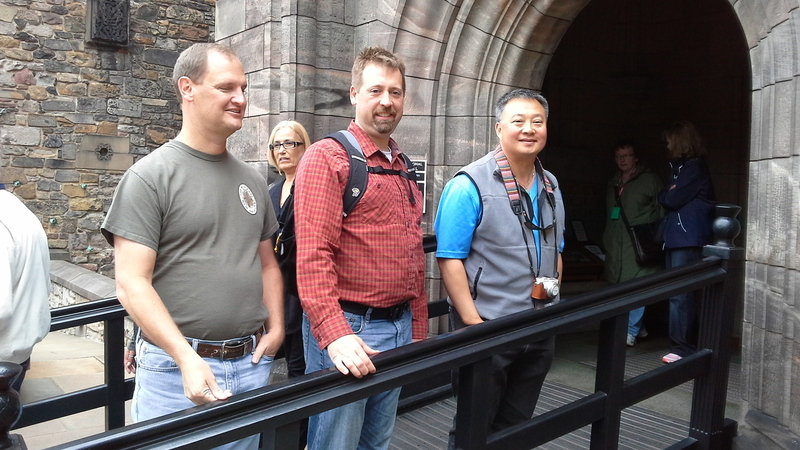 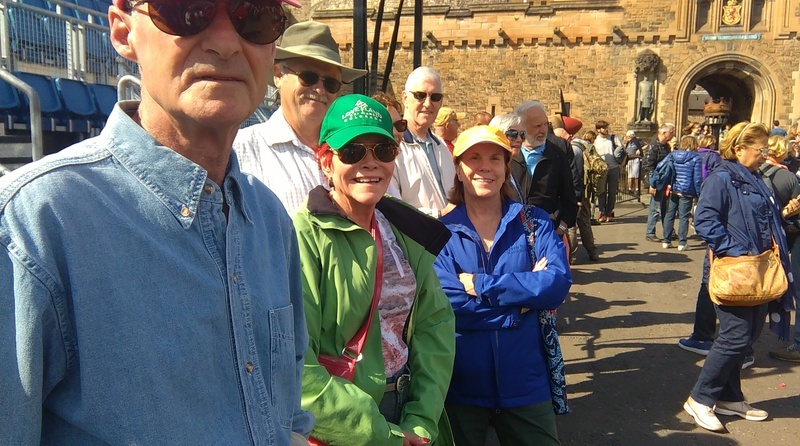 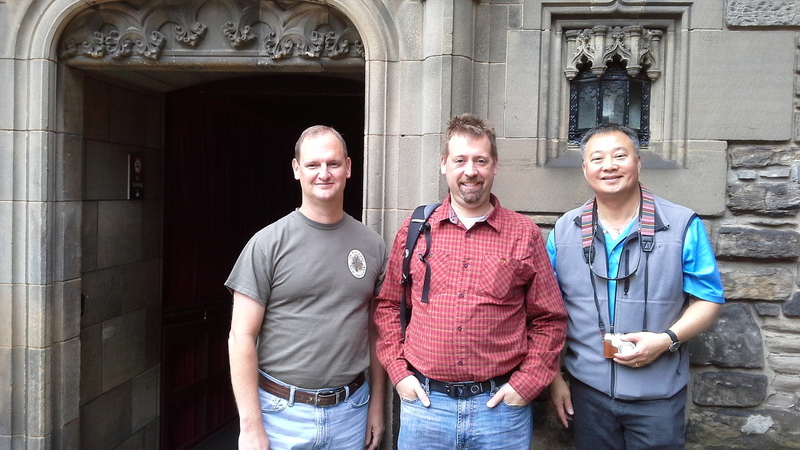 Castle Tour with Susan Napier's Group from America. 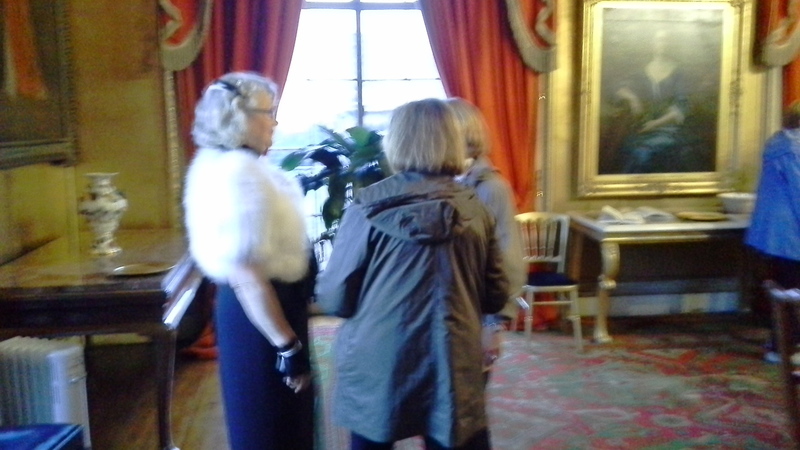 Should have been a party of five but one of the women wasn't well and the other stayed back too. 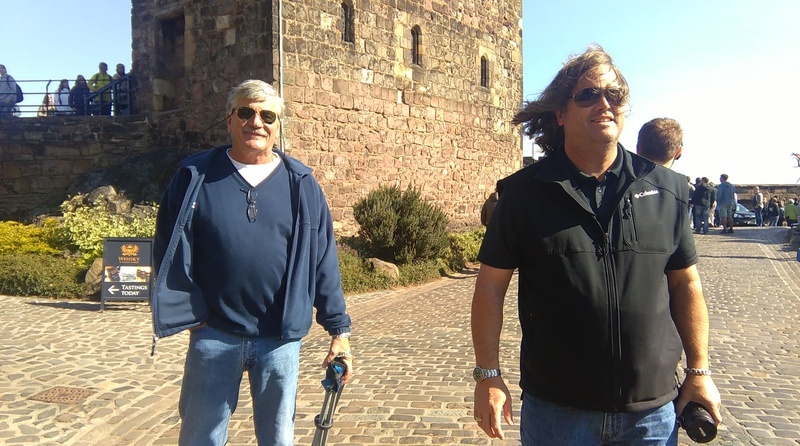 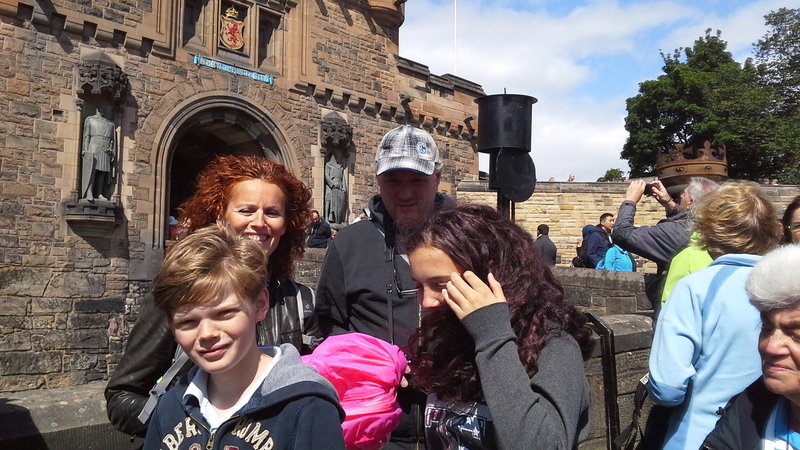 So, a tour of the castle with the boys. 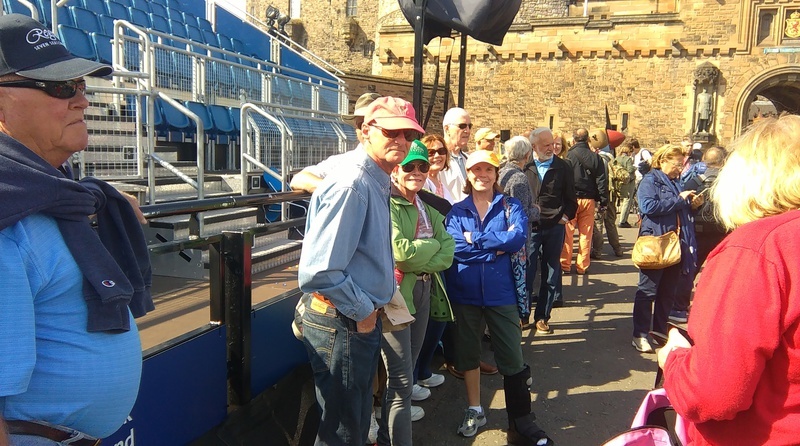 It amazes visitors that although you may have allocated a couple of hours, it really isn't enough time to check out the castle. 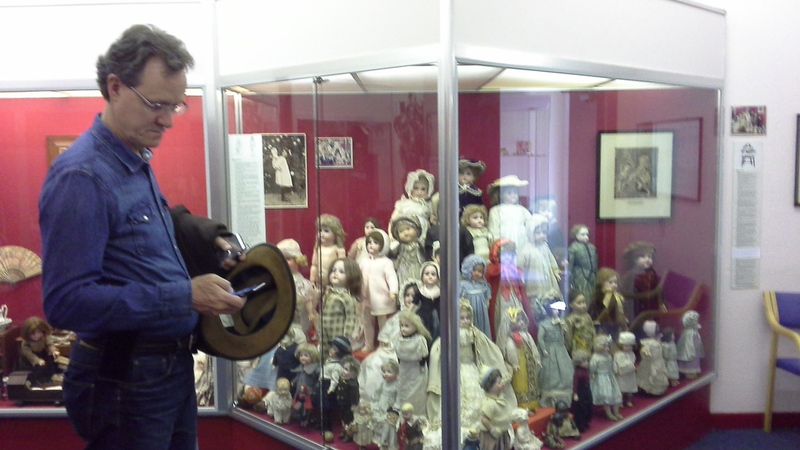 There are so may nooks and crannies to see. 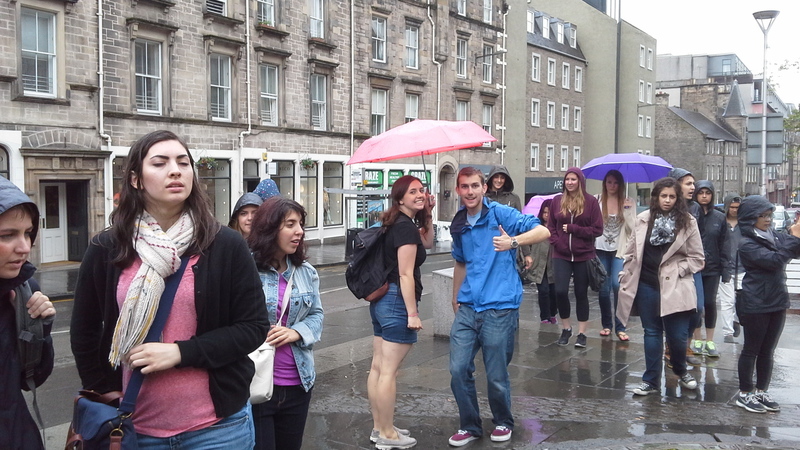 Edinburgh reallly starts here. 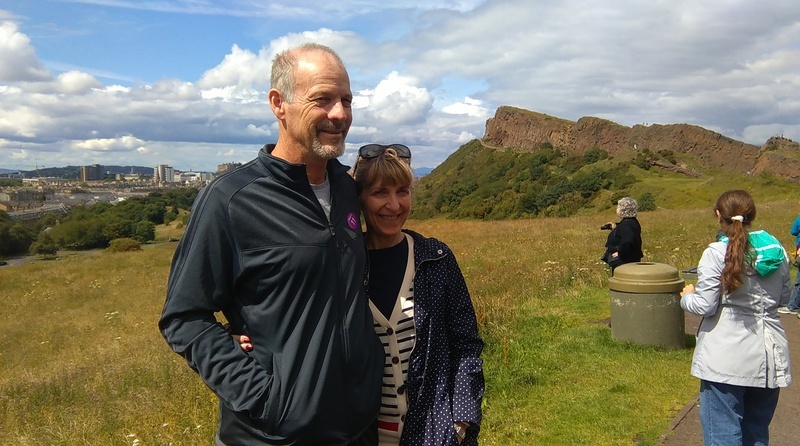 The earliest sign of habitation on the castle rock goes back to around 800-900 BC and that's from carbon dating that they know that! 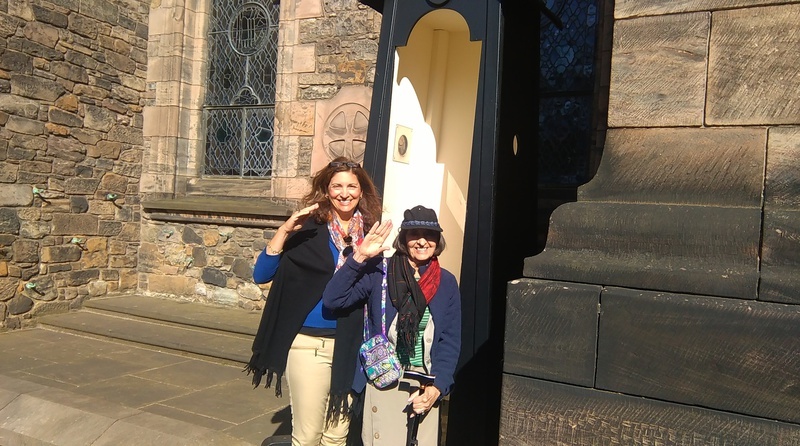 The oldest building in Edinburgh is St Margaret's Chapel in the castle, dating form around 1130 and named after Queen Margaret who was cannonised by the Pope. 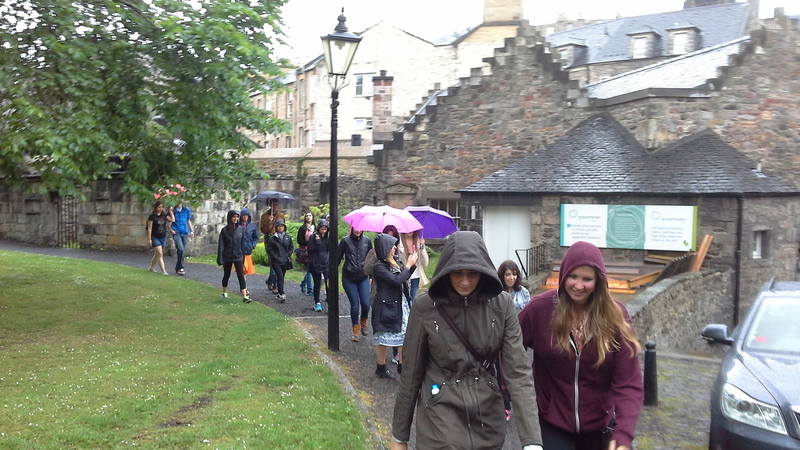 2 Hour walking tour in the Rain with American Students. 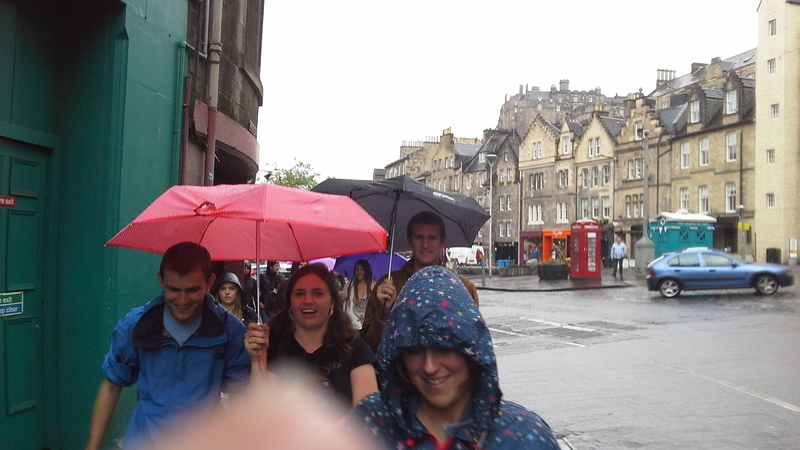 Did I say 'rain'? 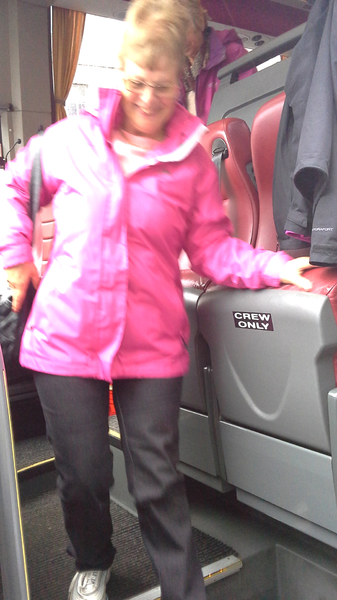 I meant of course 'liquid sunshine' , because although we were all pretty wet - it was smiles all the way. 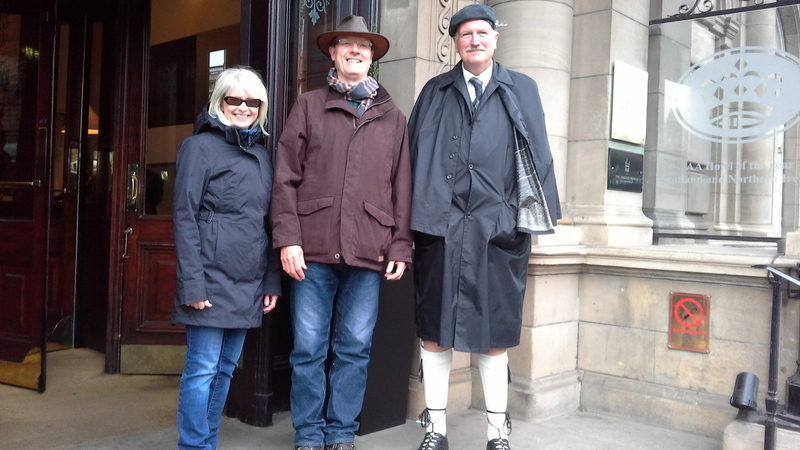 Interestingly 2 of the party arrived wearing 'flip-flops'! 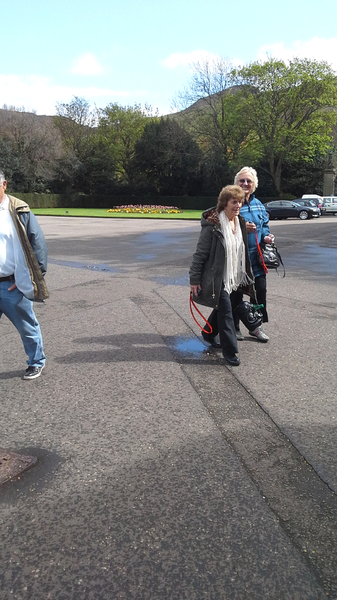 We were part of a much bigger group split into three and we got so involved that we ended up way behind the rest. 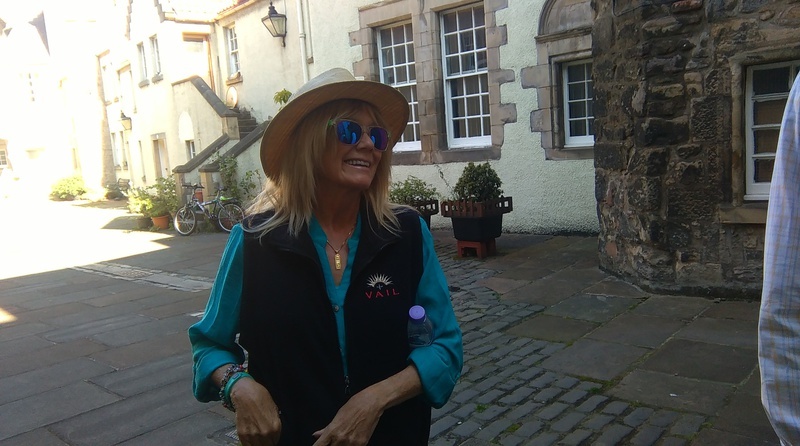 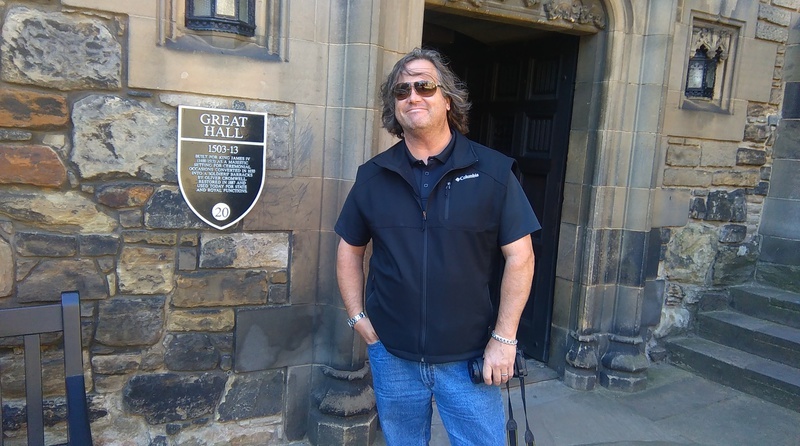 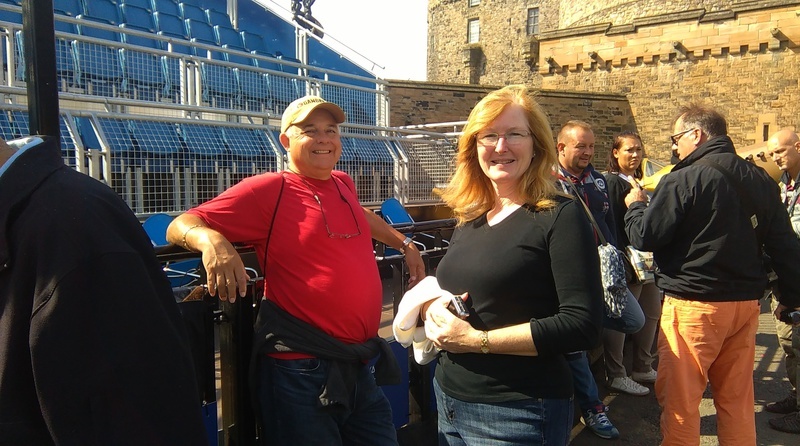 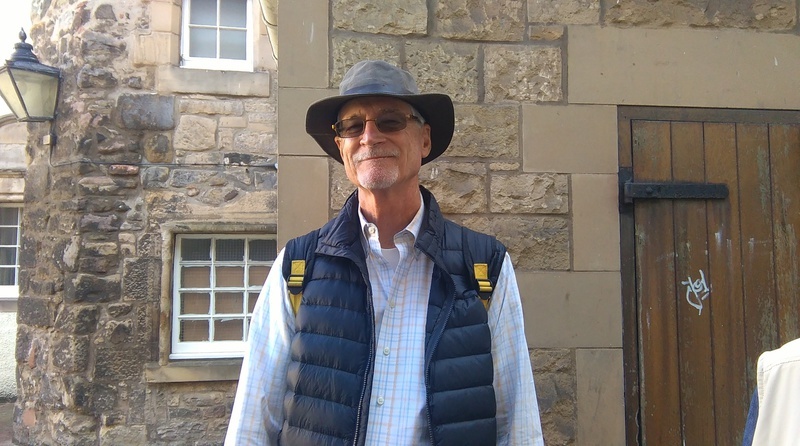 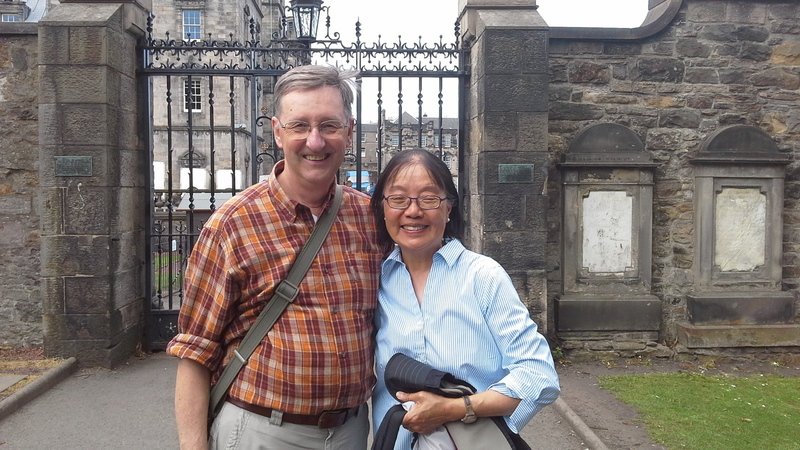 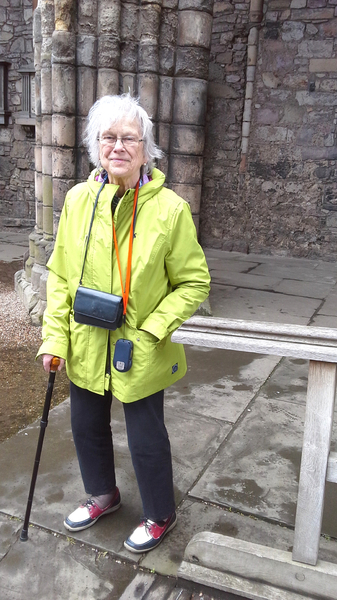 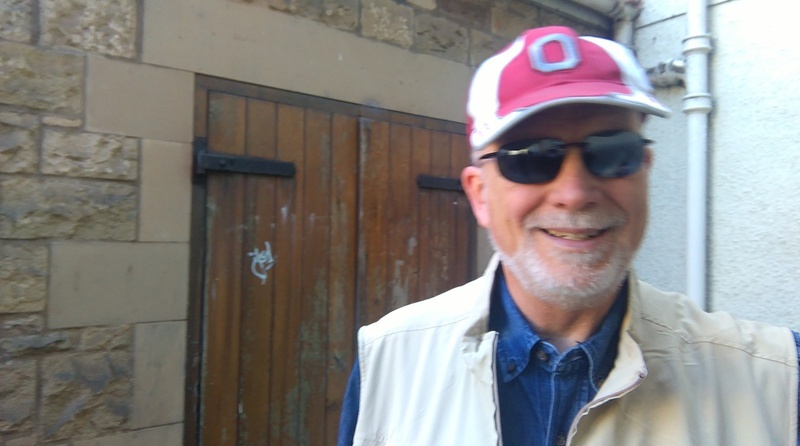 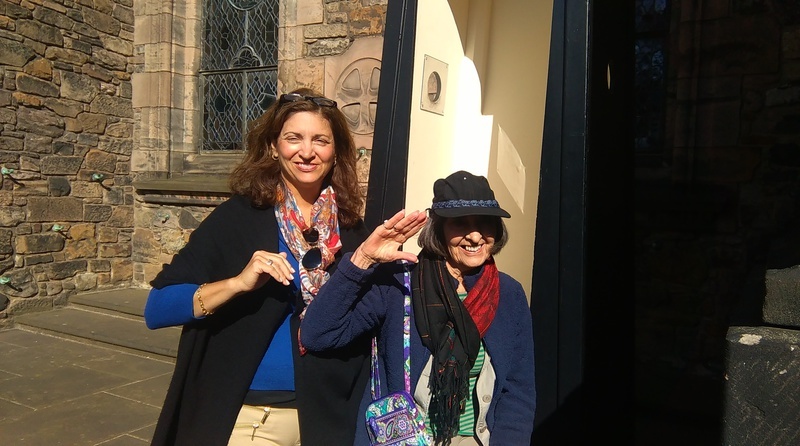 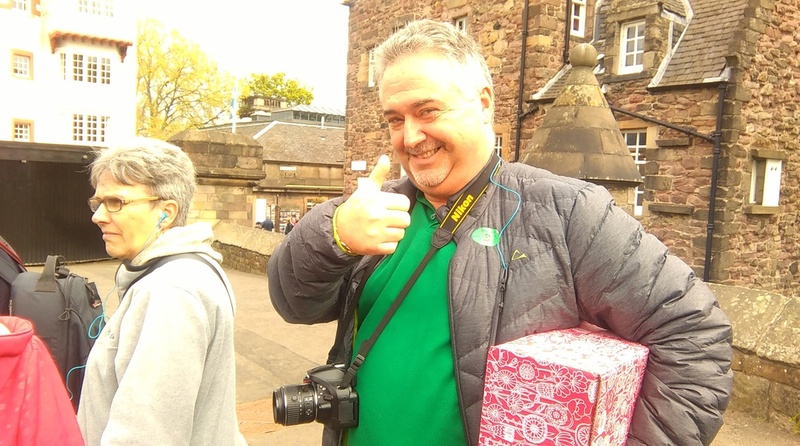 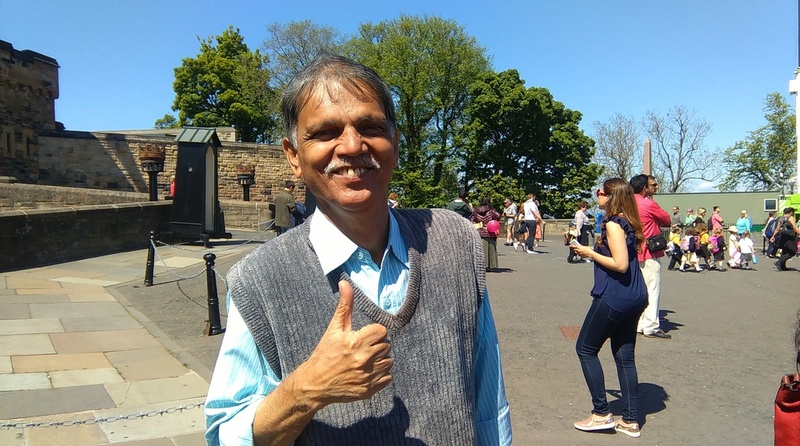 Doesn't time fly when you're enjoying yourself.We started up at the castle and moved down the Royal Mile, taking in some of the 'Closes' off and visited Greyfriars ChurchYard. 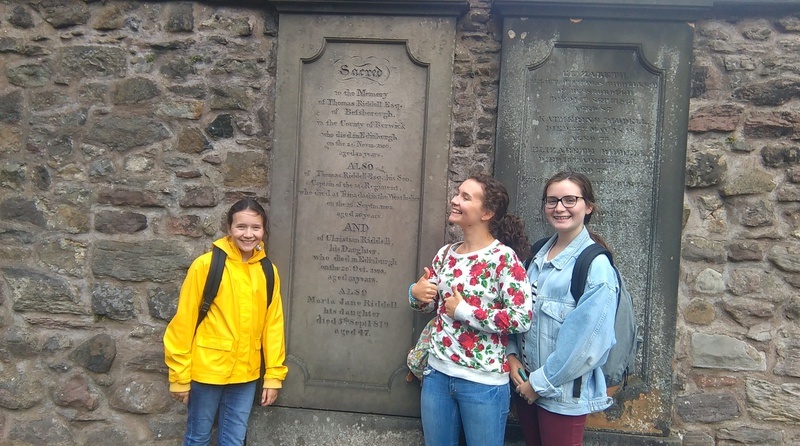 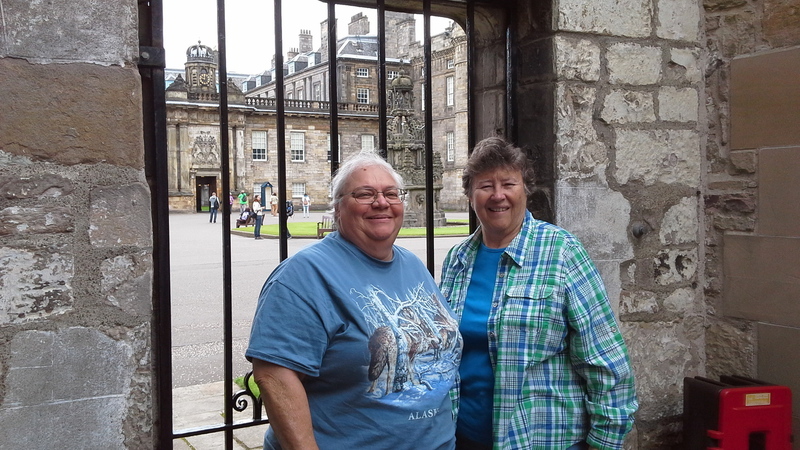 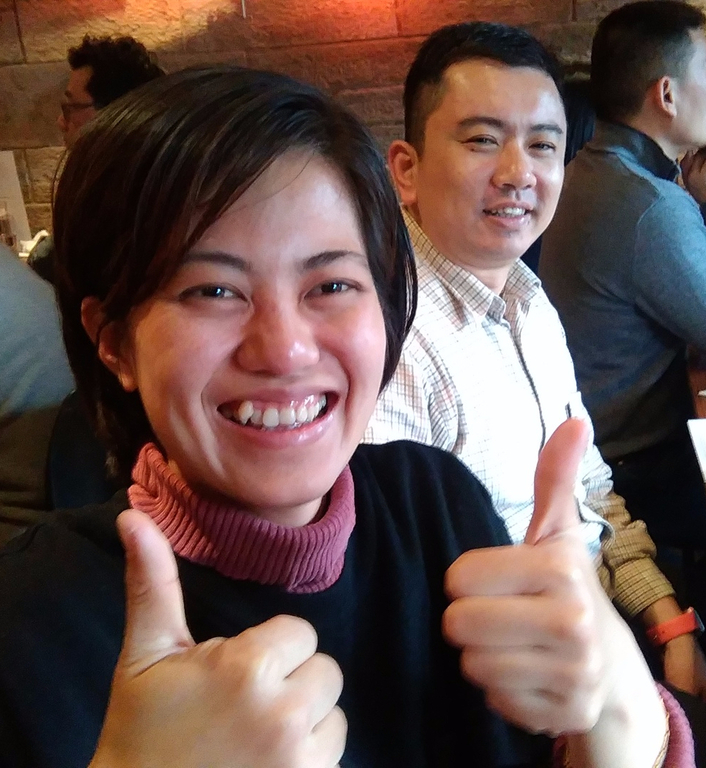 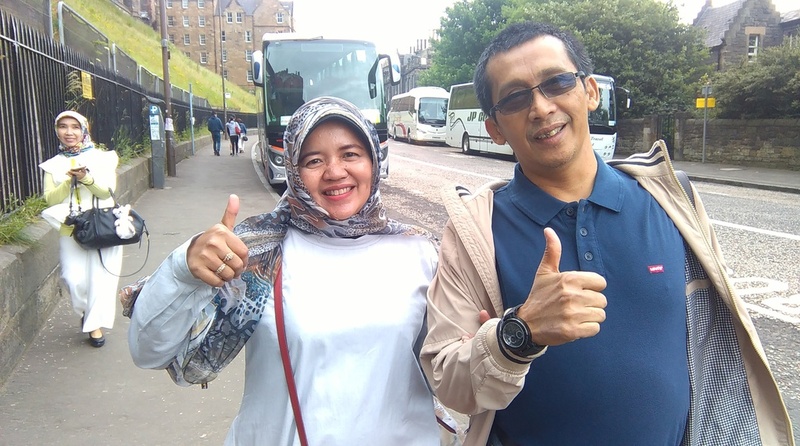 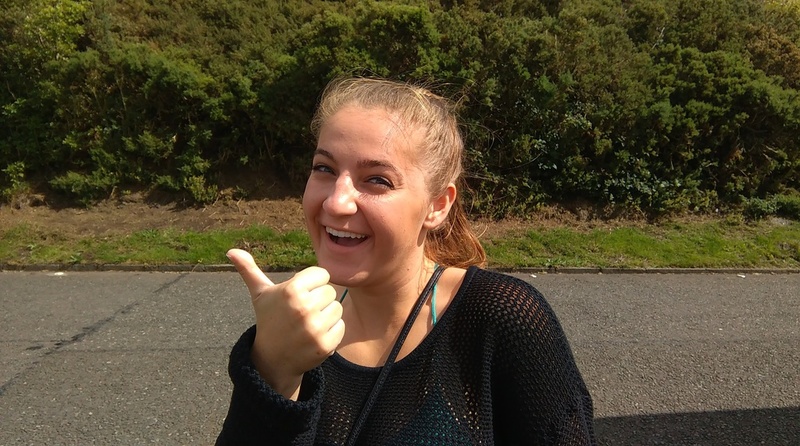 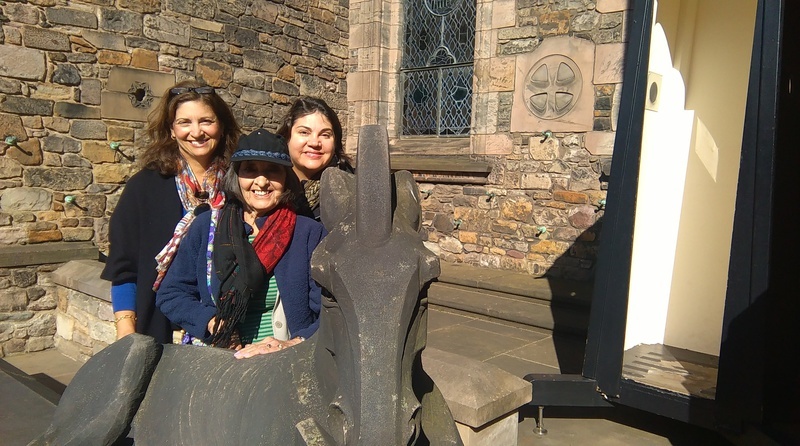 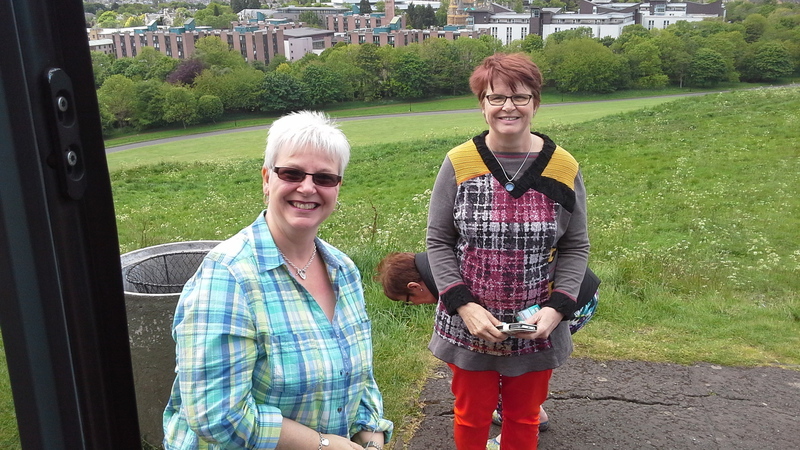 They had been on a 'Harry Potter' tour in the same graveyard the day before with another tour company but were surprised that there was still more to see and hear about and the Grasssmarket too. 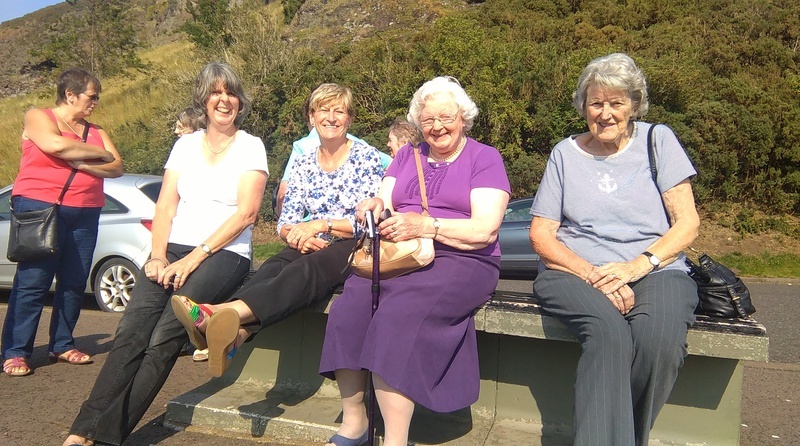 What a 'fabby' day. 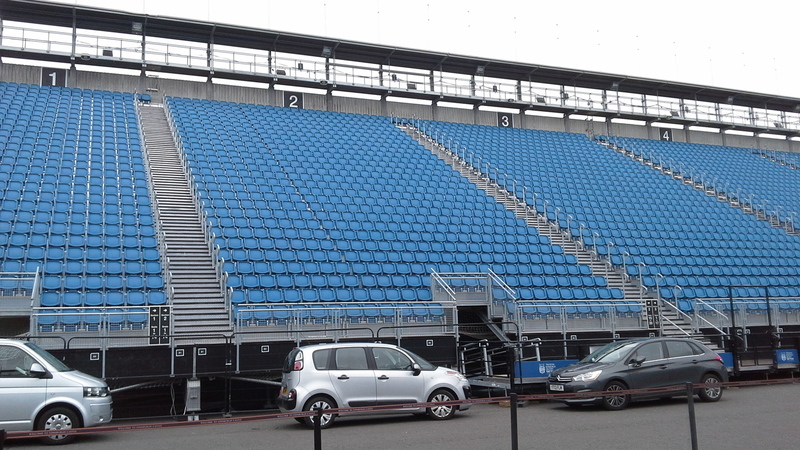 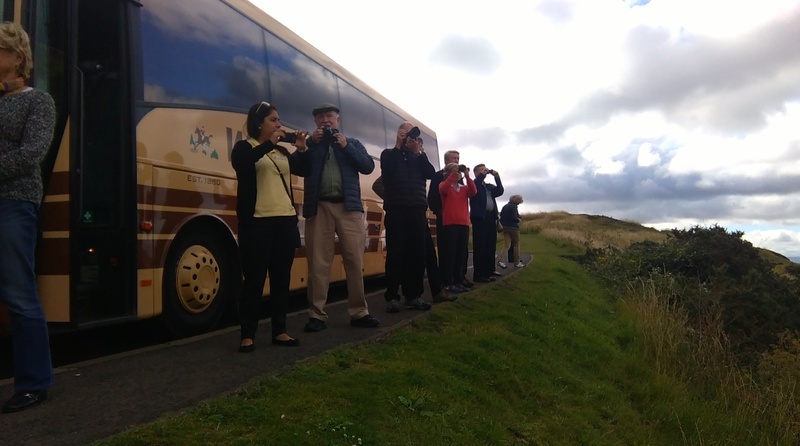 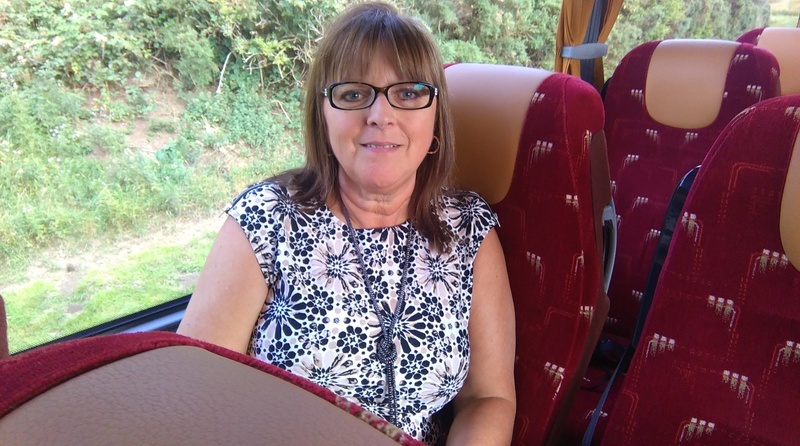 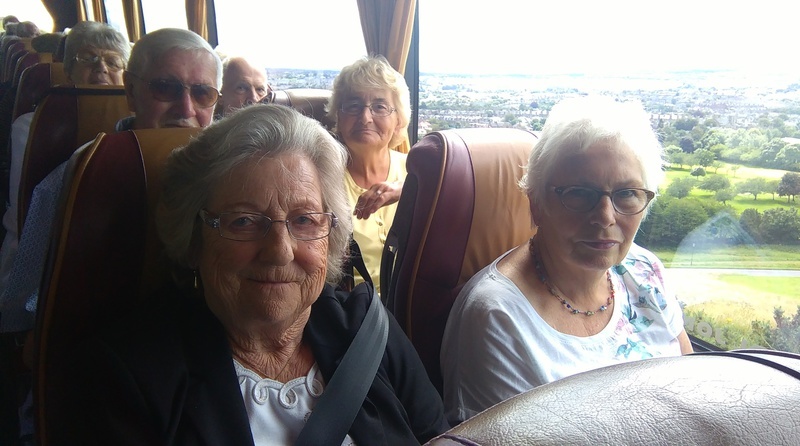 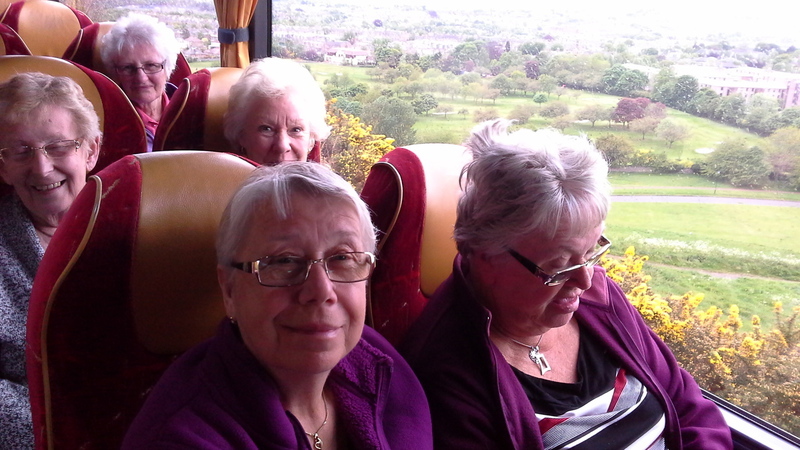 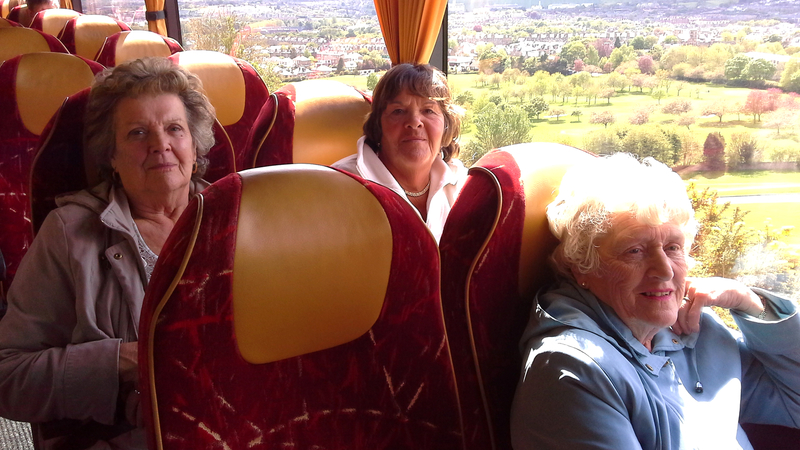 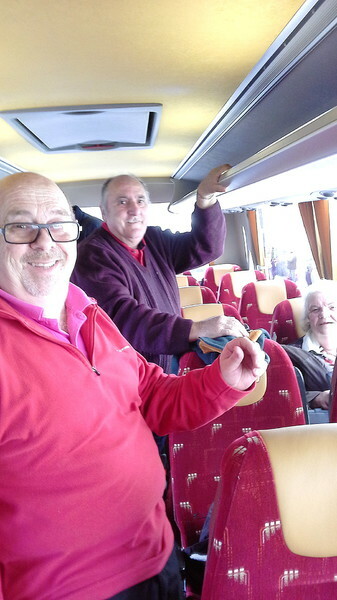 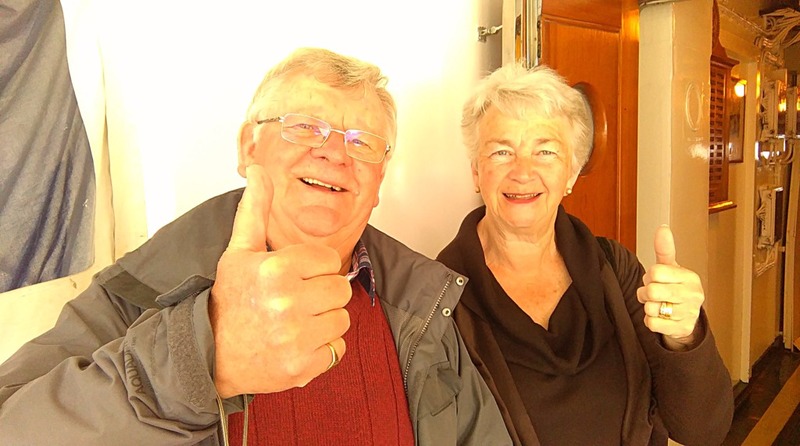 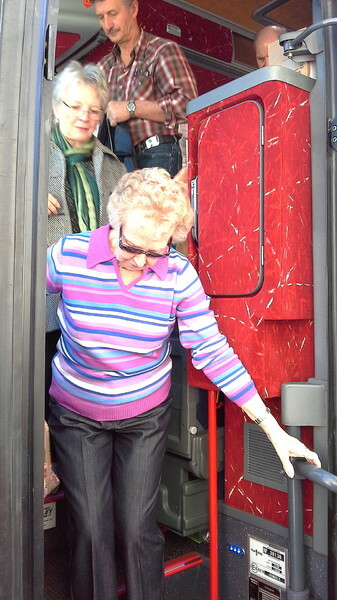 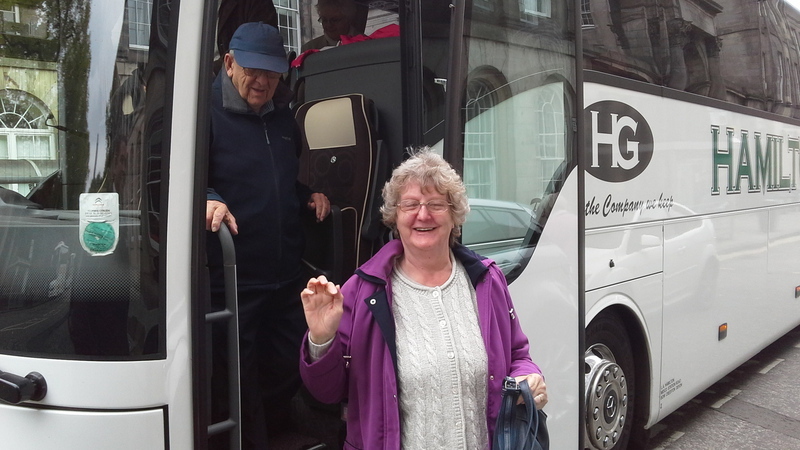 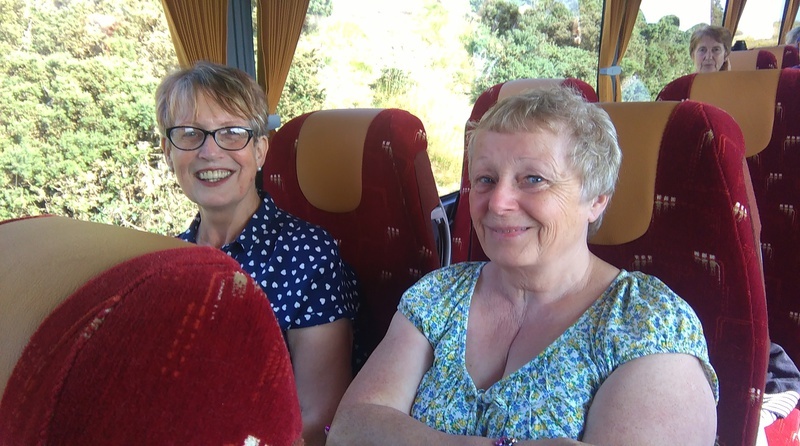 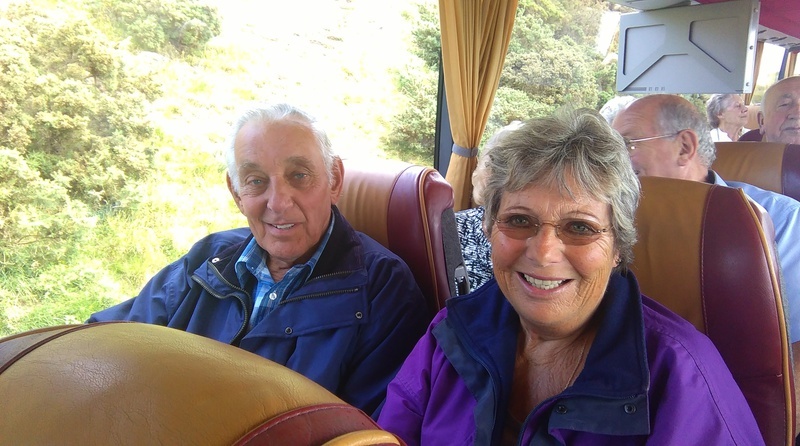 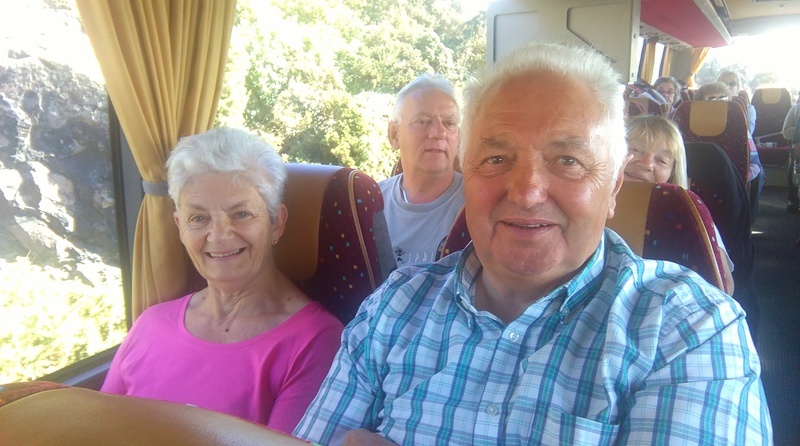 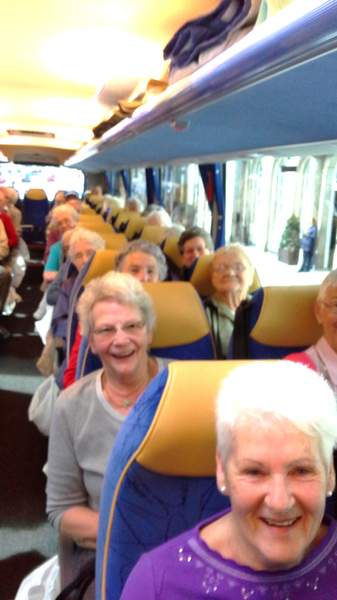 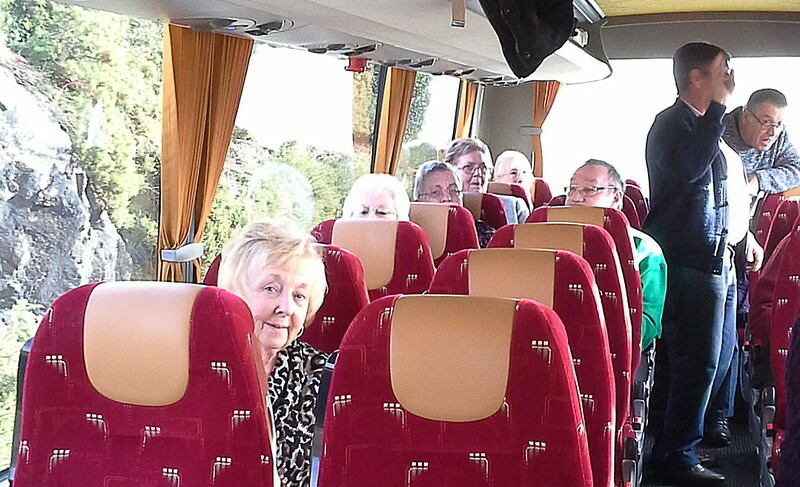 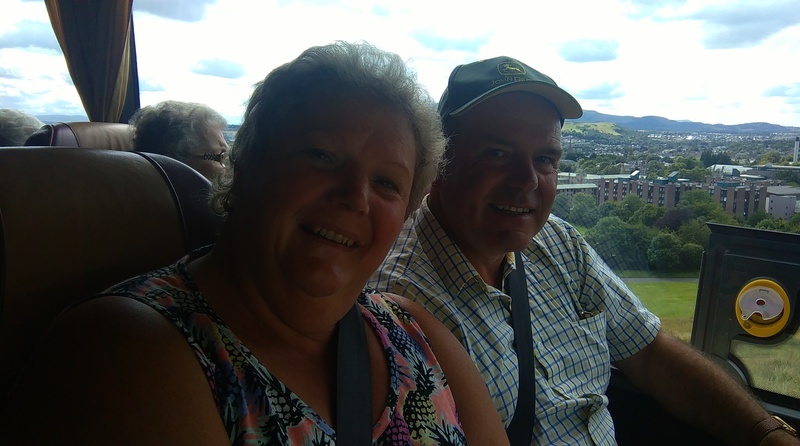 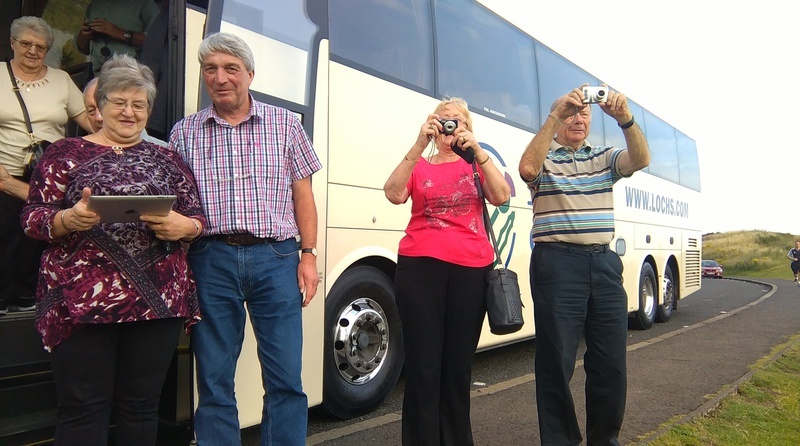 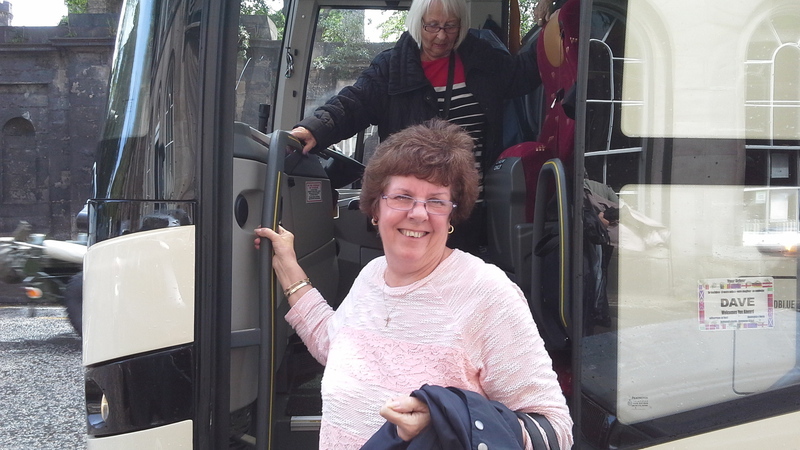 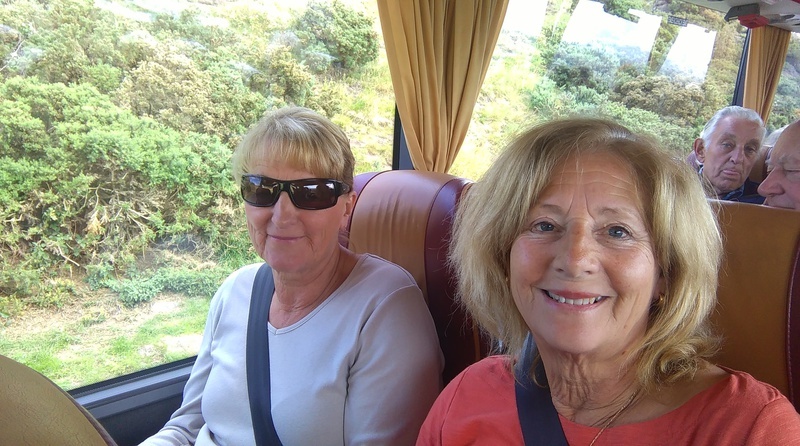 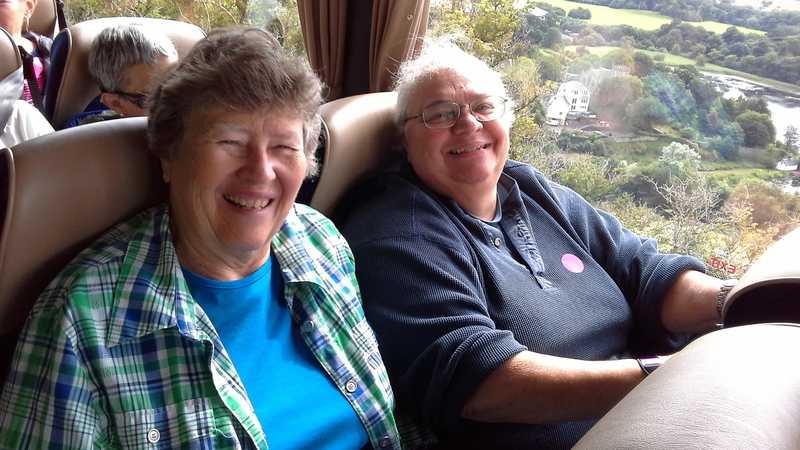 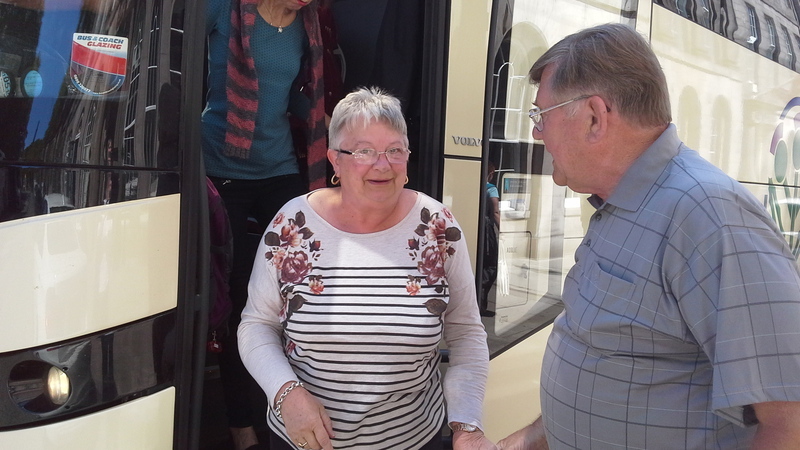 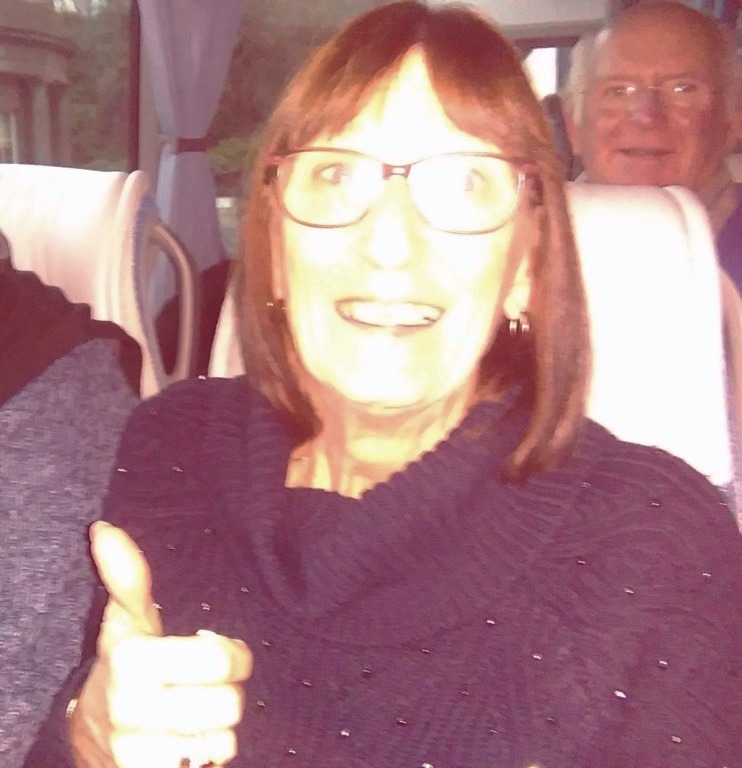 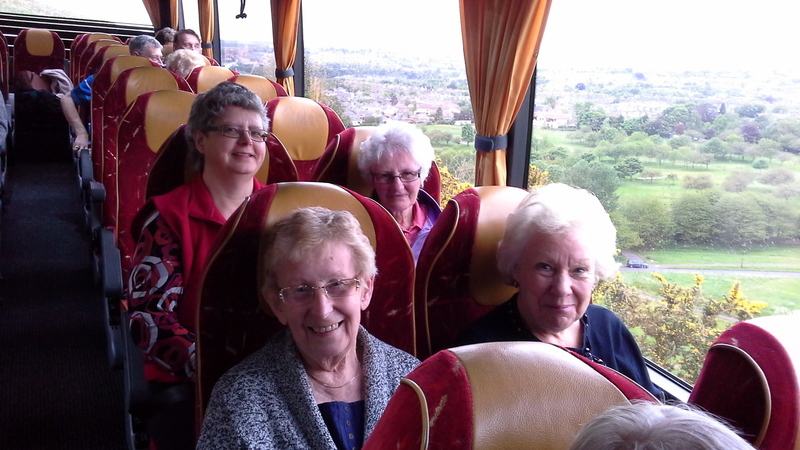 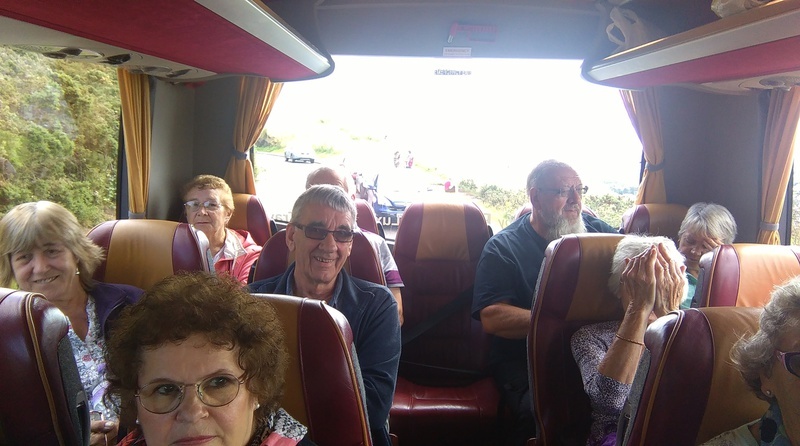 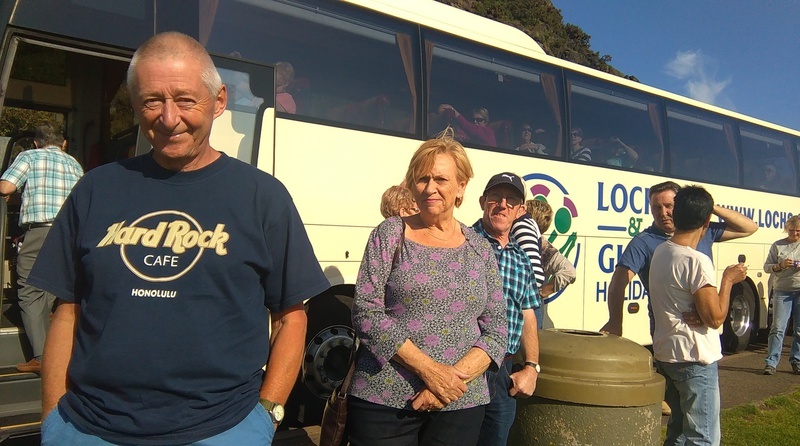 Driver Kevin brought a fun loving group from the South of England, Eastbourne and surrounding areas. 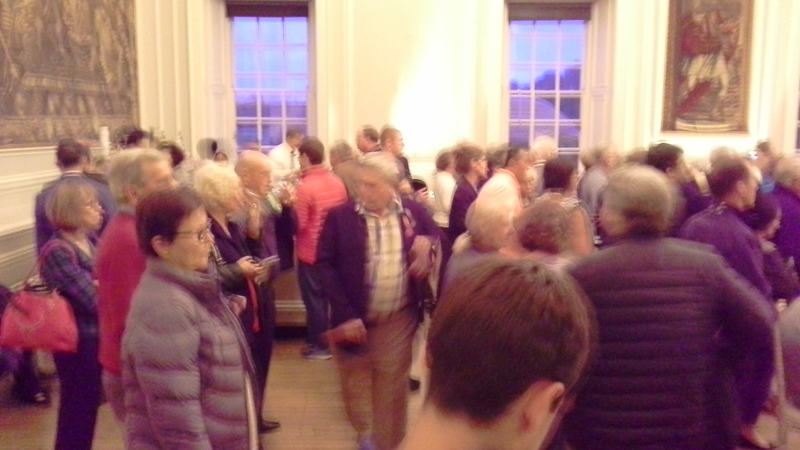 One or two Scots and distantly related Scots. 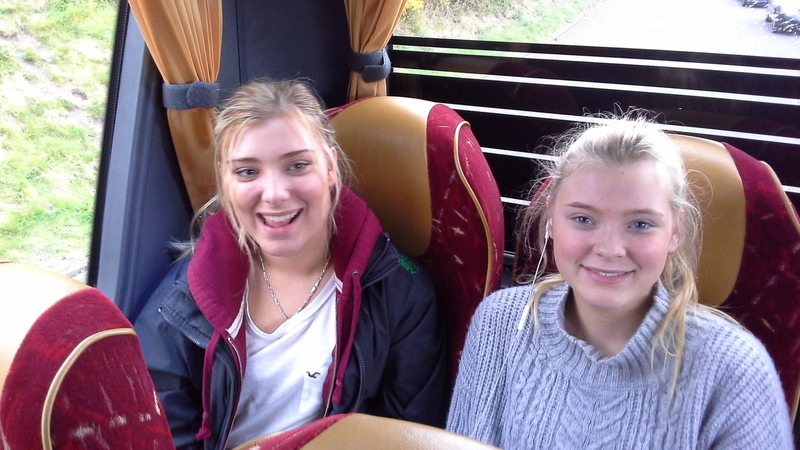 What a 'hoot' we had. 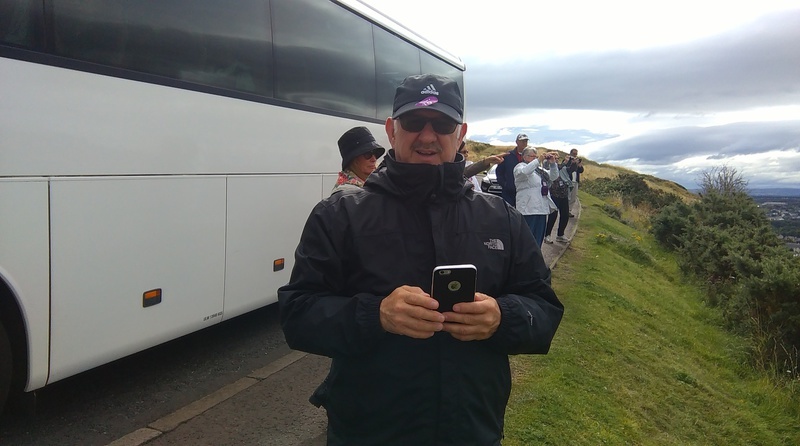 Unbelievable road closures in Edinburgh today - but hey - Kevin just turned the coach around on 'magic wheels' and we were off again, and again and again.... 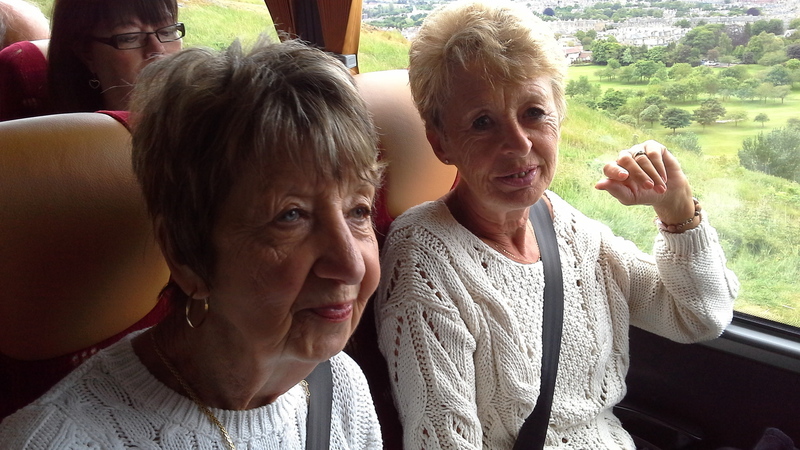 Didn't really matter - we were enjoying ourselves so much. 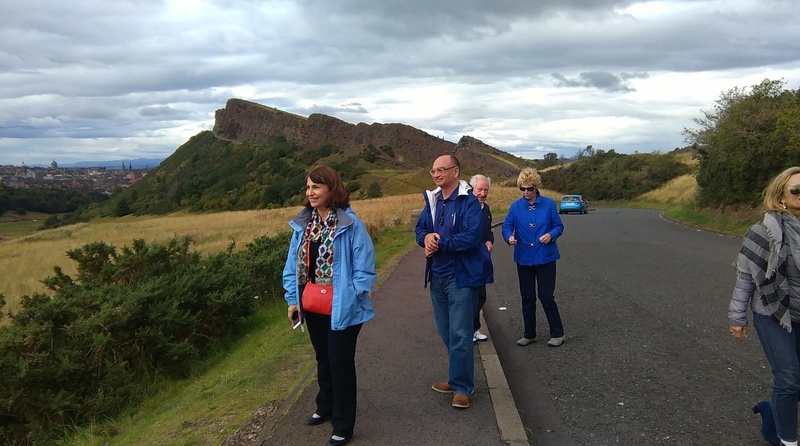 After all, Edinburgh is a beautiful city and has so much to offer. 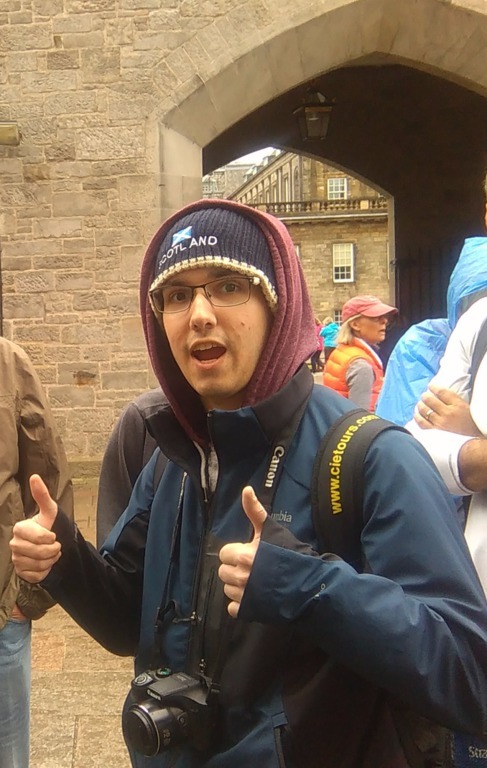 I may be biast - but I'm right! 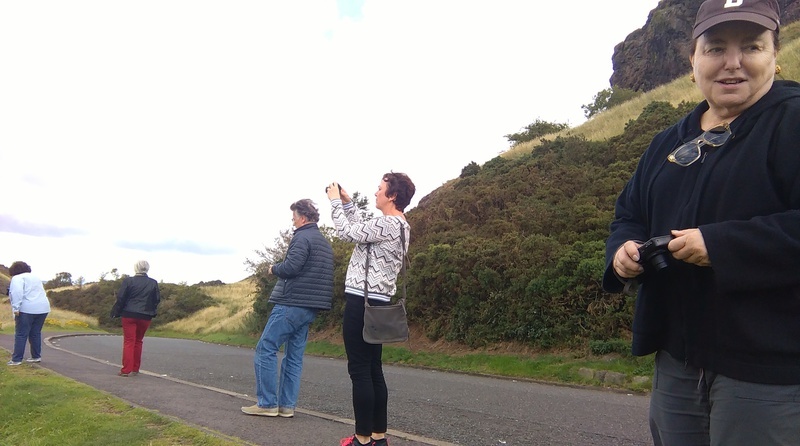 Met up with a cruise liner at Rosyth on the north side of the Firth of Forth. 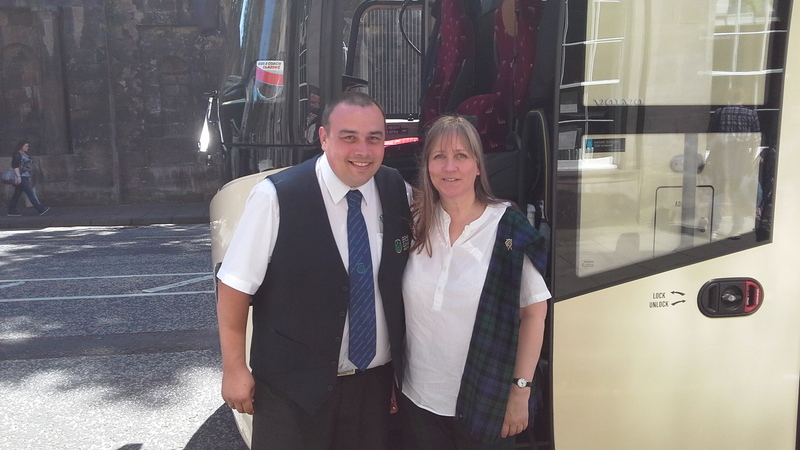 Such a hectic day, didn't get a chance to take any photos and so not to cause any embarrisment I won't detail some of the companies invoved as unfortunately 2 of them broke down.Four coaches with guides (me - one of the guides) were booked to give a tour of Edinburgh with a visit to the castle. 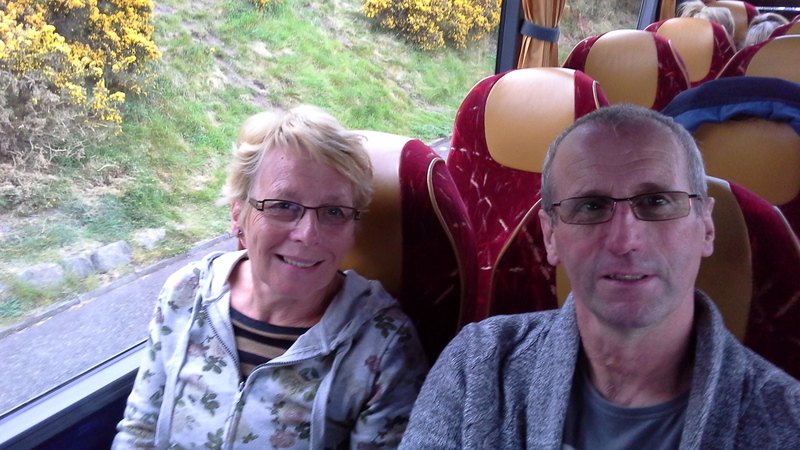 All good so far, but the coach that I was allocated to broke down before it reached us at the starting point. 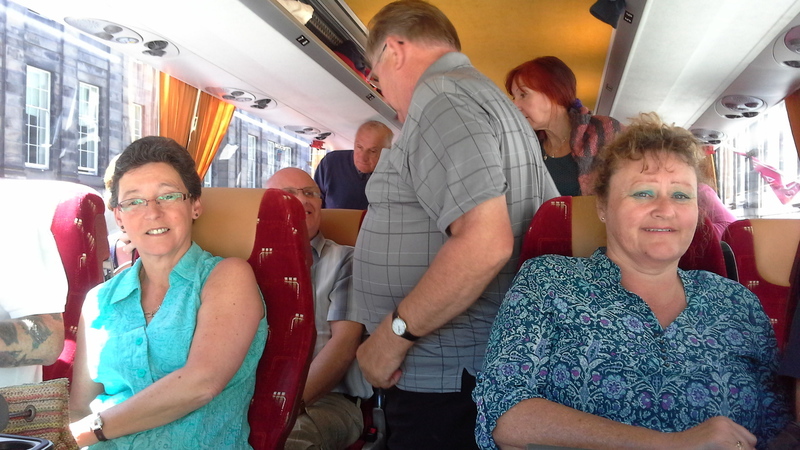 But there was enough room on the remaining 3 coaches, so it looked like I was going home. 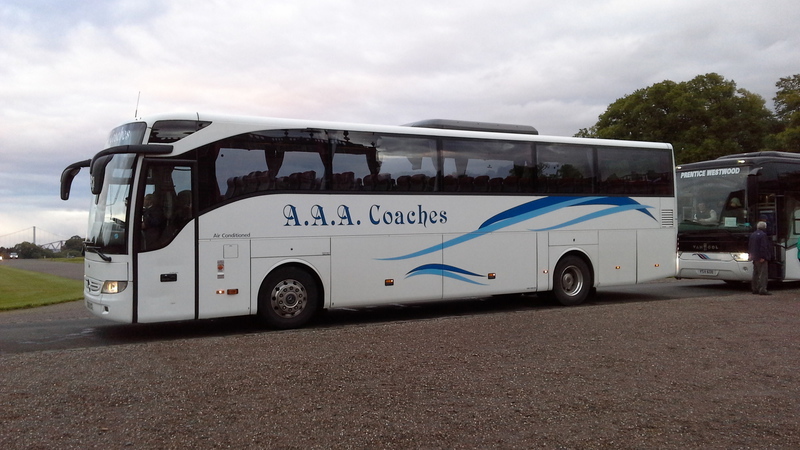 Change of plan and I was asked to join the busiest coach to help out. 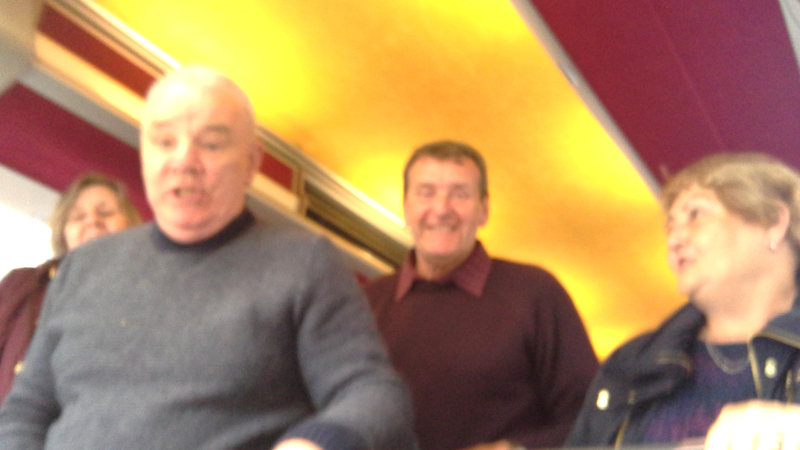 Just as well, before we left Rosyth, the microphone system packed in - yikes. 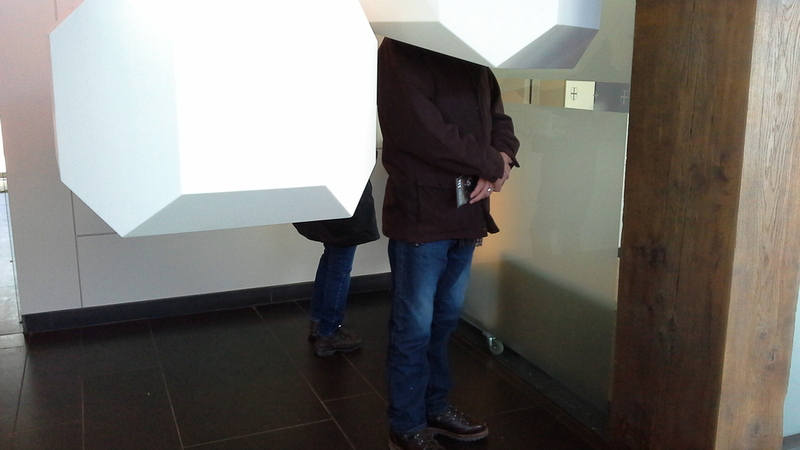 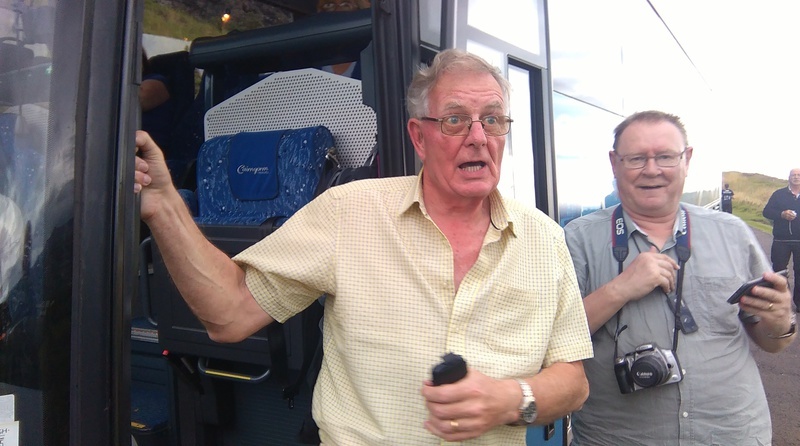 So myself and the other guide strained our voice boxes, hoping to get a change of coach after we had visited the castle. 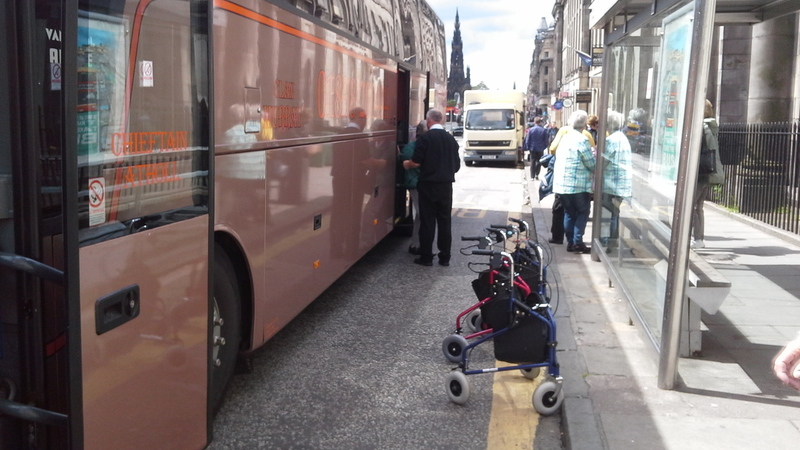 But hey, we didn't get that far and the coach packed in at a busy junction in Edinburgh's Charlotte Square! 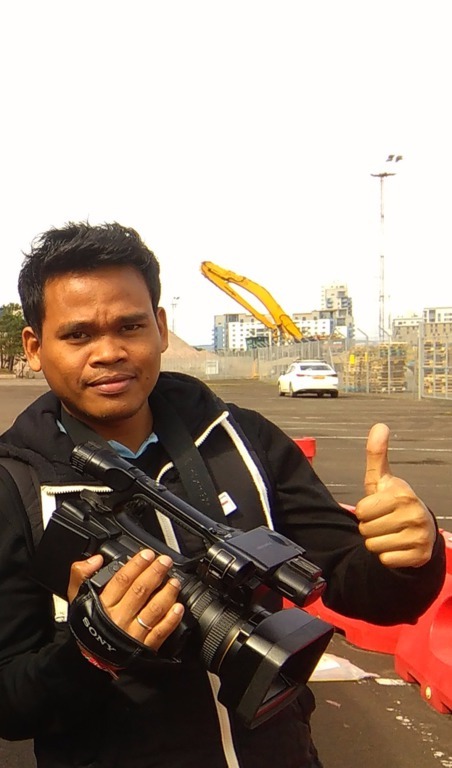 Yow, what so we do now? 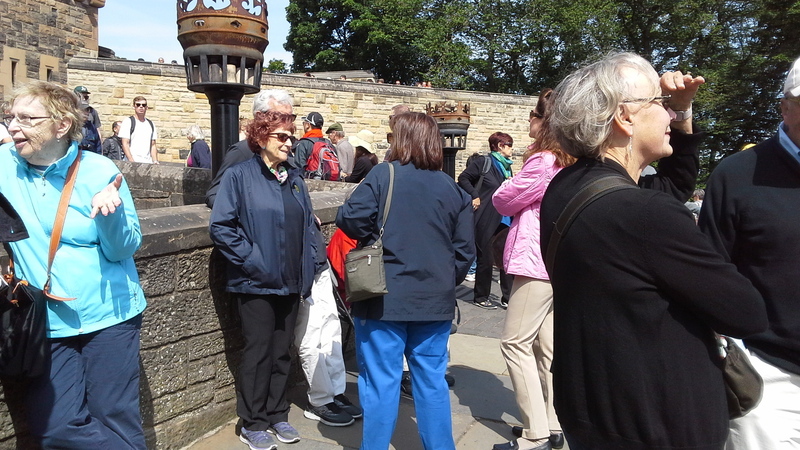 Looked like those who were able, were about to do a walking tour up to the castle. 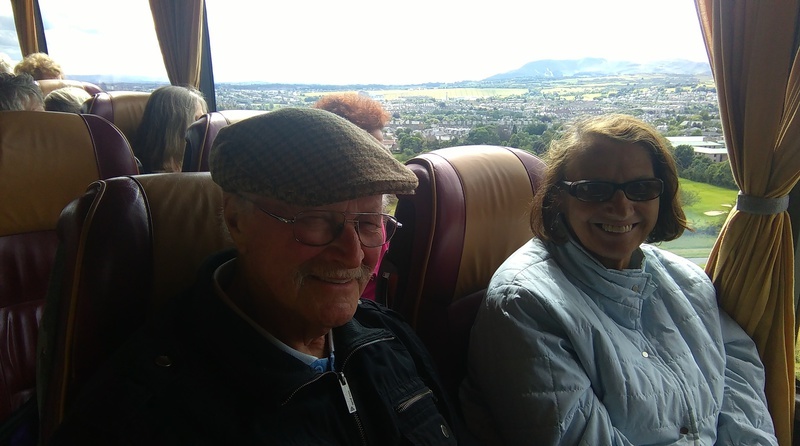 Very fortunately, Alec (who I worked with many years ago with Guide Friday) was passing in his lovely 'Alan's'coach, and rescued us up to the castle and saved that part of the day. 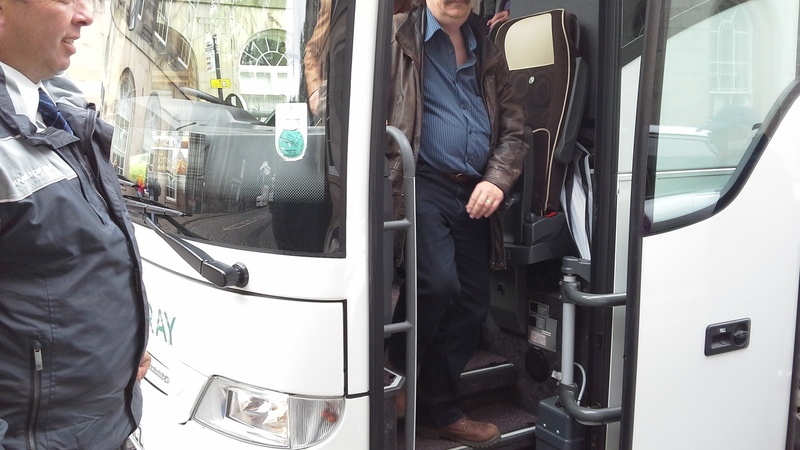 A tour pf the castle next and then expected our replacement coach to be waiting for us... Nope! 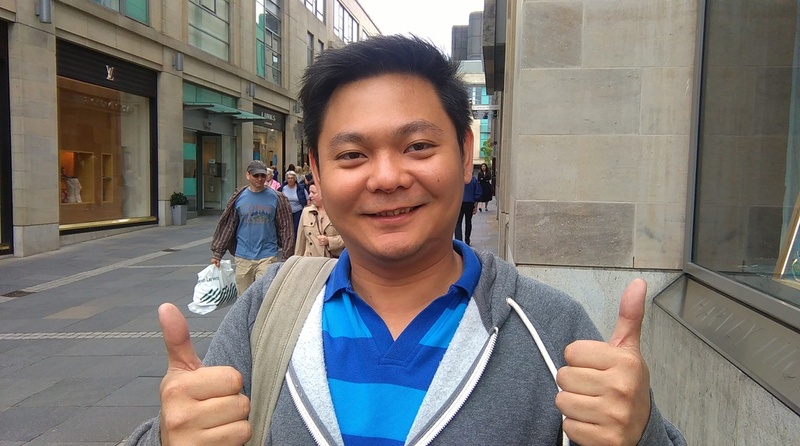 Was I being too optimistic? 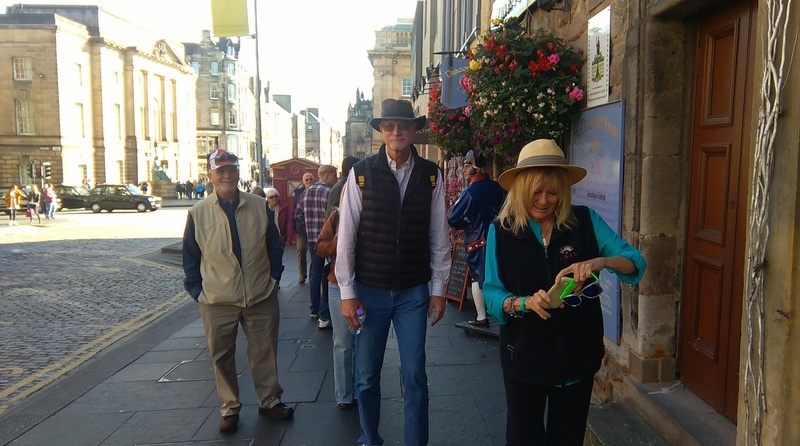 So I took an impromtu stationery walking tour at the Lawn market - Edinburgh is such a fantastic place and so much to see - just as well. 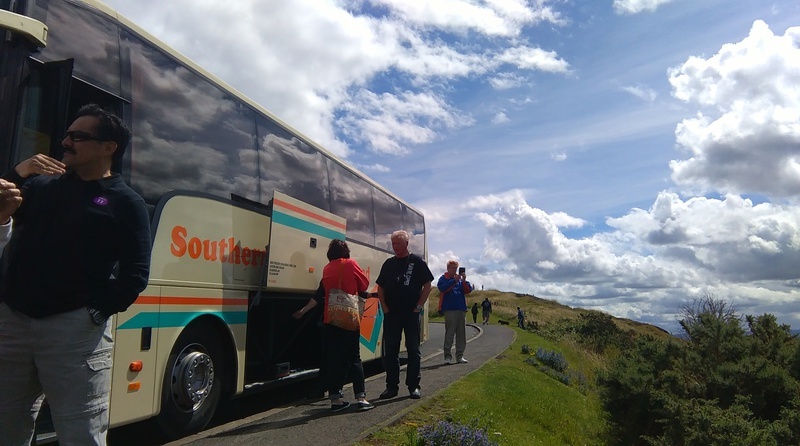 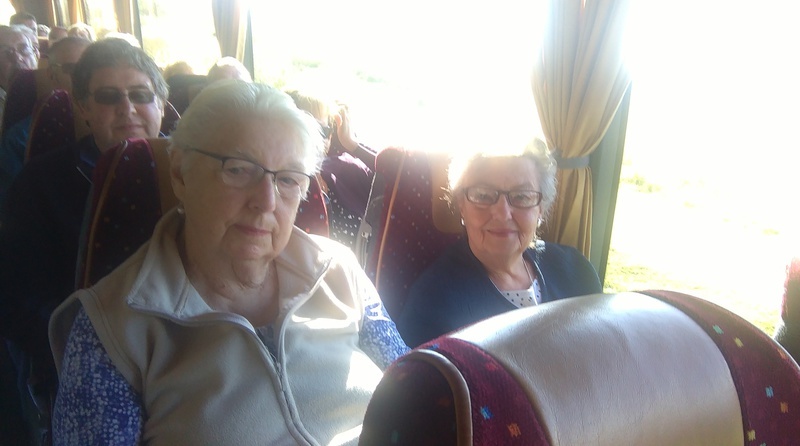 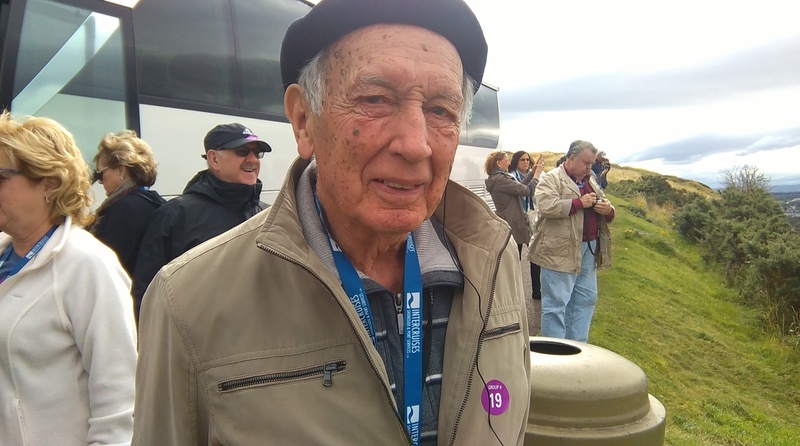 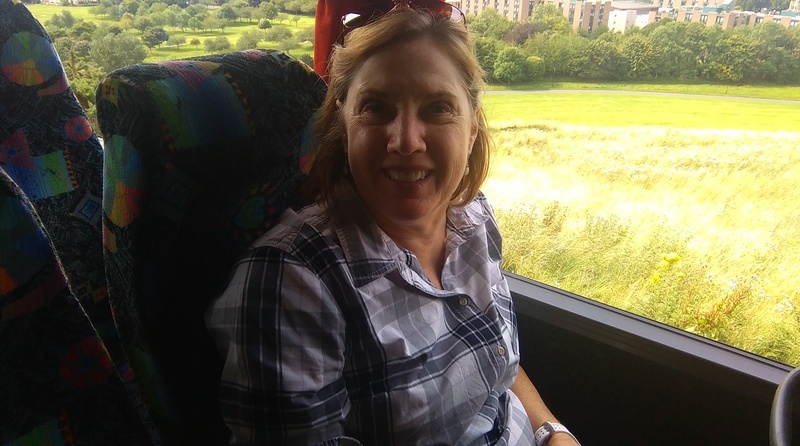 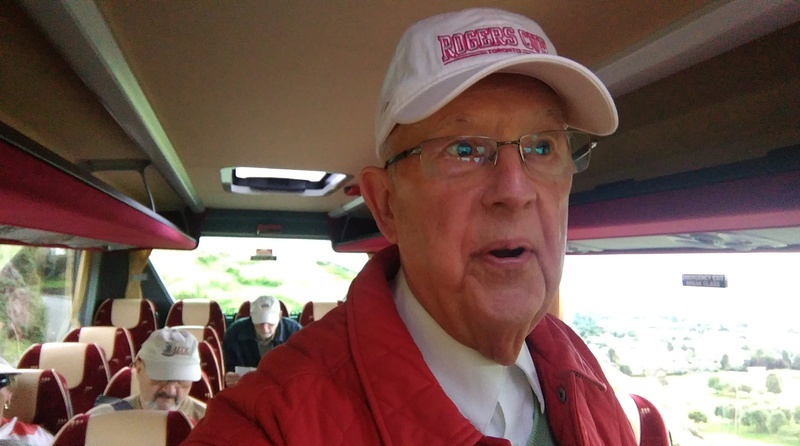 Half an hour later a lovely driver called Robert from Southern Tours turned up at short notice to continue our coach tour around Edinburgh and take us back to Rosyth. 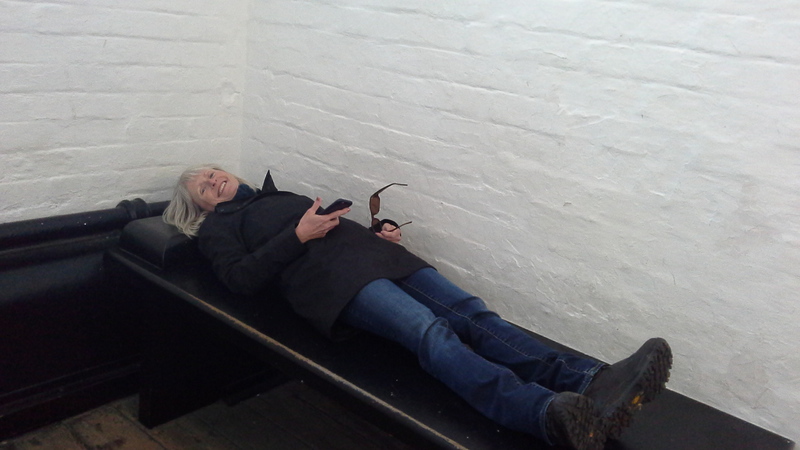 Really thinking on the spot today. 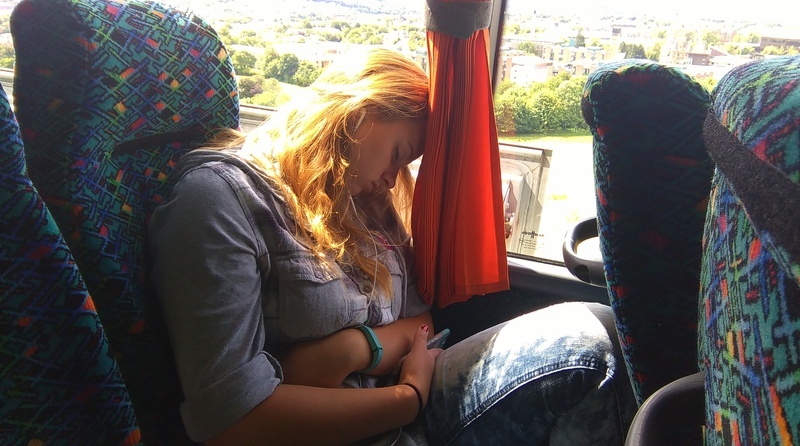 I will sleep well. 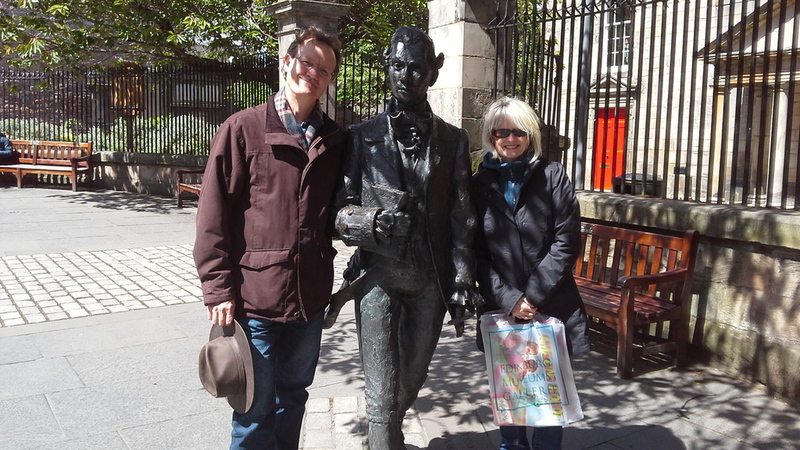 'Auld Jock Tamson's Bairns today'! 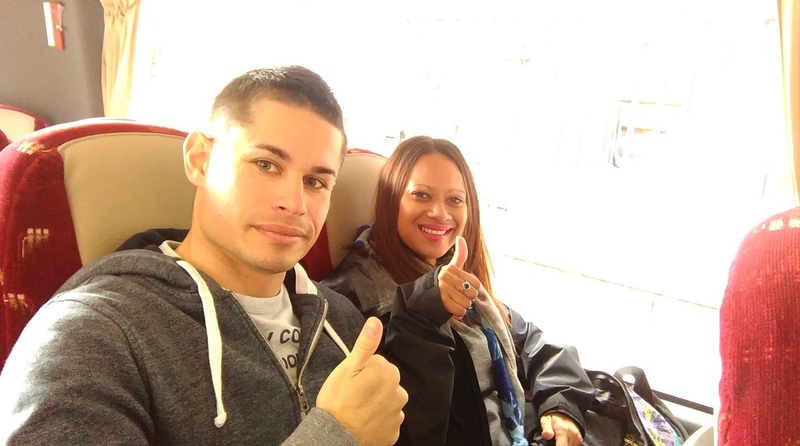 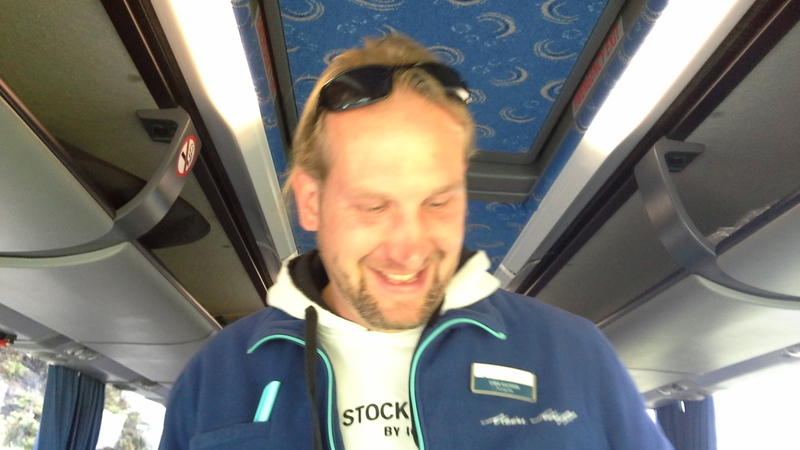 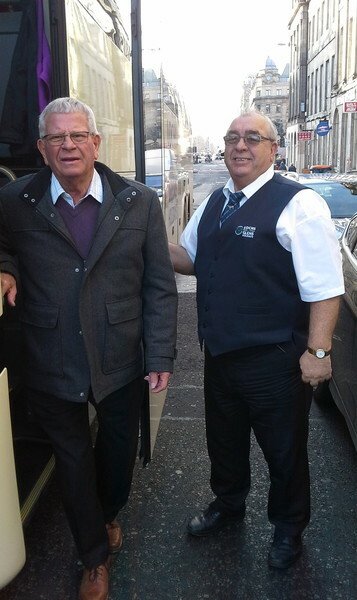 Driver Brian brought nationalities from various parts of Britain - a good mix and banter... 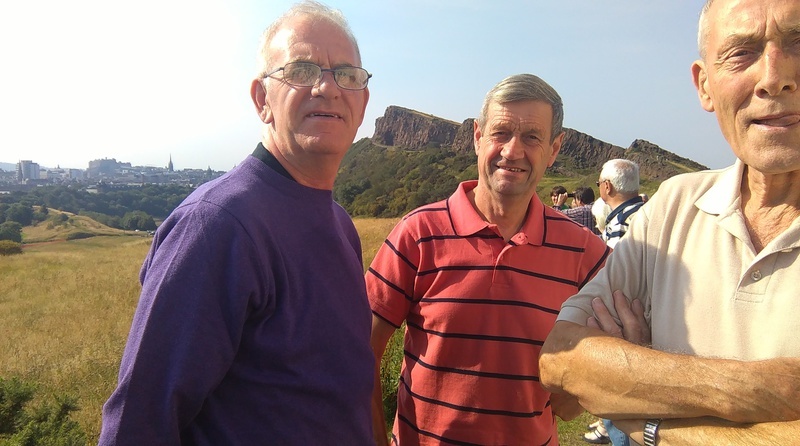 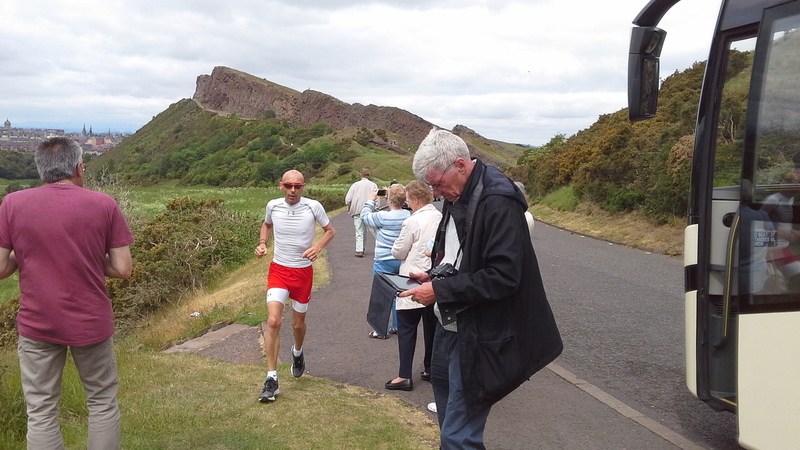 There was a 'march' in the city, so we skirted, what was at one time the 'countryside', but now part of central Edinburgh and carried on up and round Arthur's Seat, finishing at Waterloo Place for freetime. 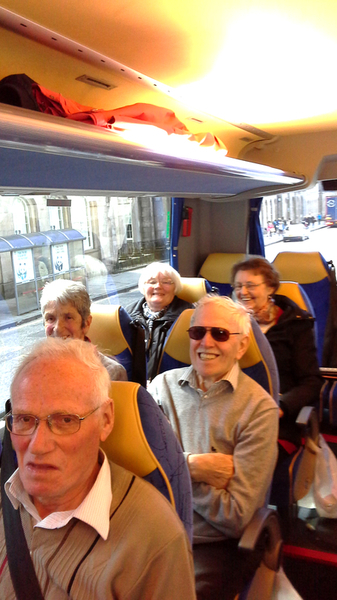 Driver Tom brought his passengers (both Irish and West Coast Scottish) to Edinburgh for the day. 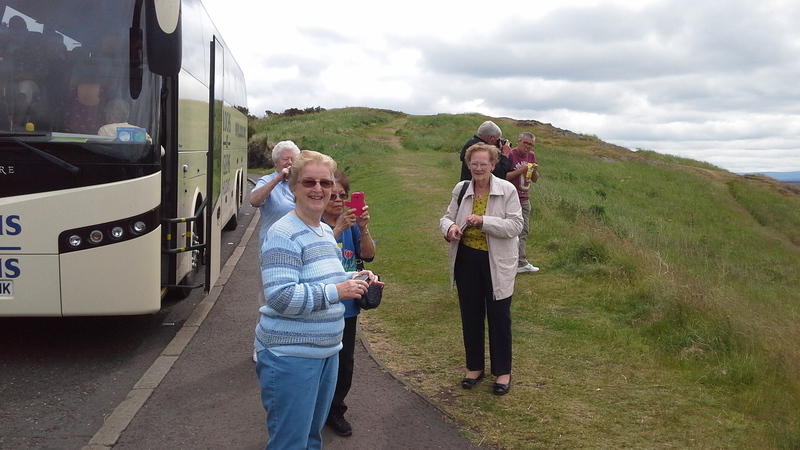 What a lovely day - great day - everyone took part and joined in. 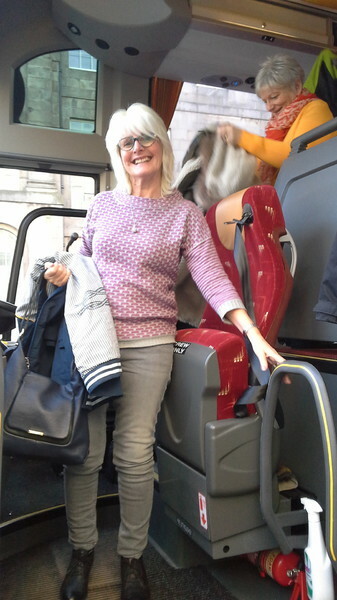 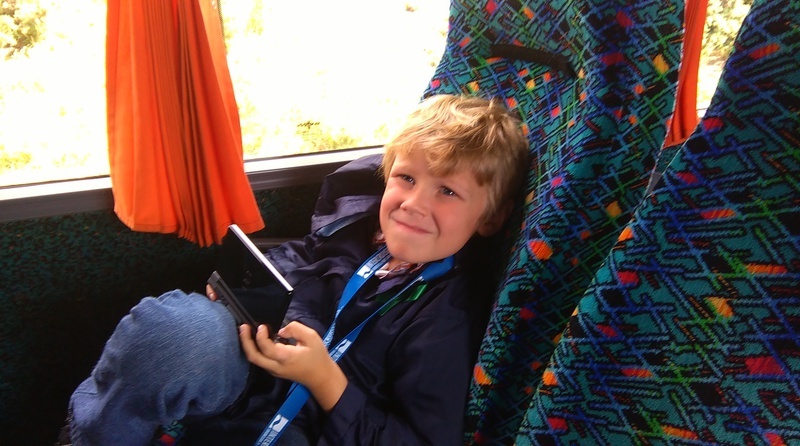 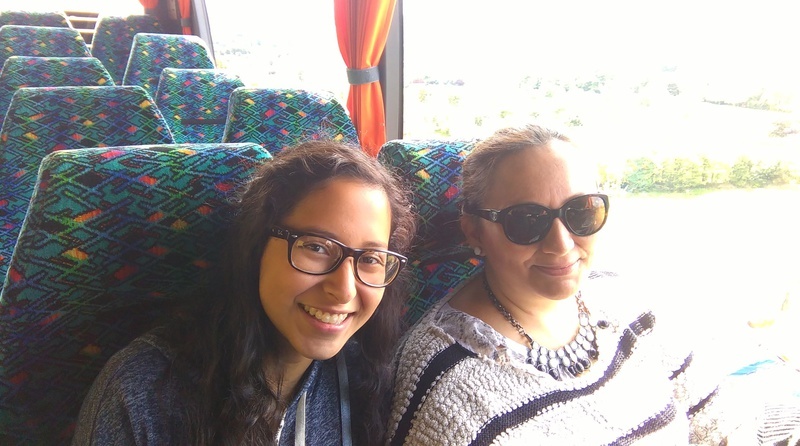 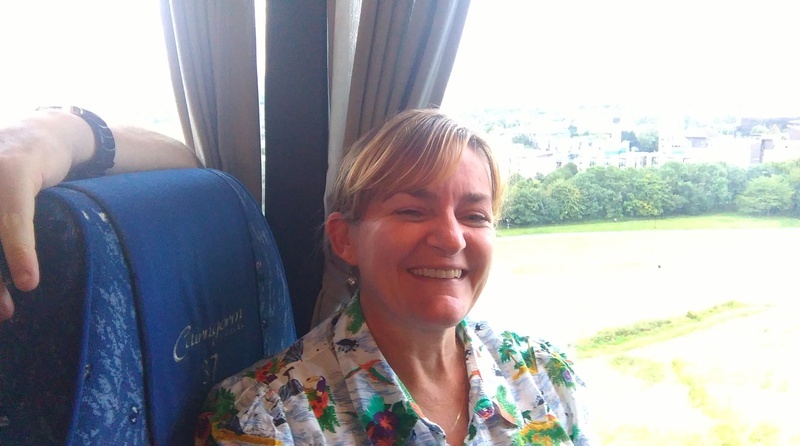 Super fun on the coach around the city. 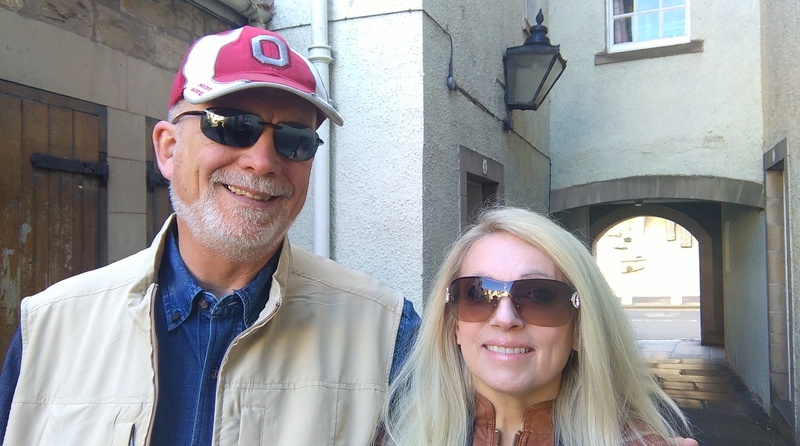 Another fabulous day with Valerie and Jeff. 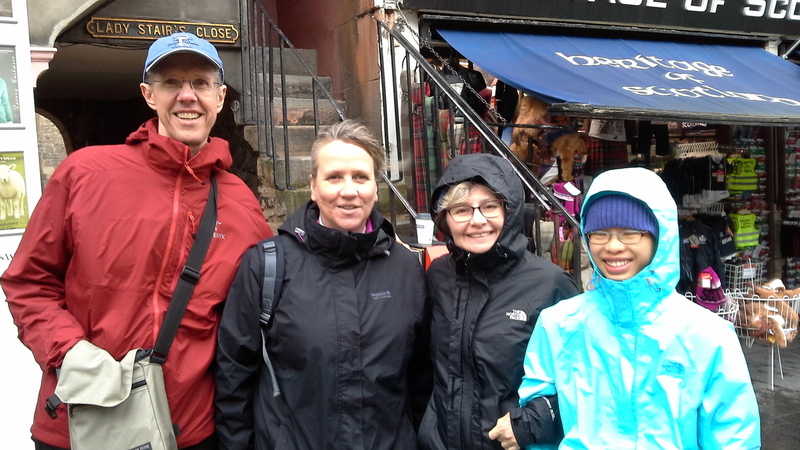 A day touring the Old Town on foot with Valerie and Jeff from Canada. 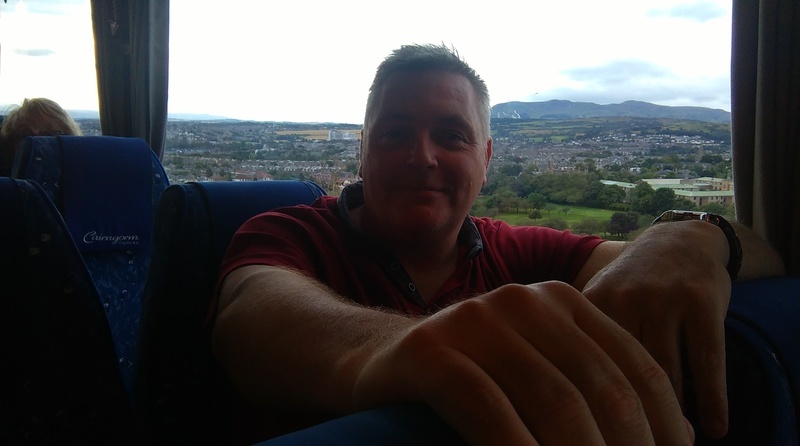 Quite a day.... We started off at the Balmoral Hotel and headed along Princes Street, skipping into West Princes Street Gardens below the Castle Rock as we went along. 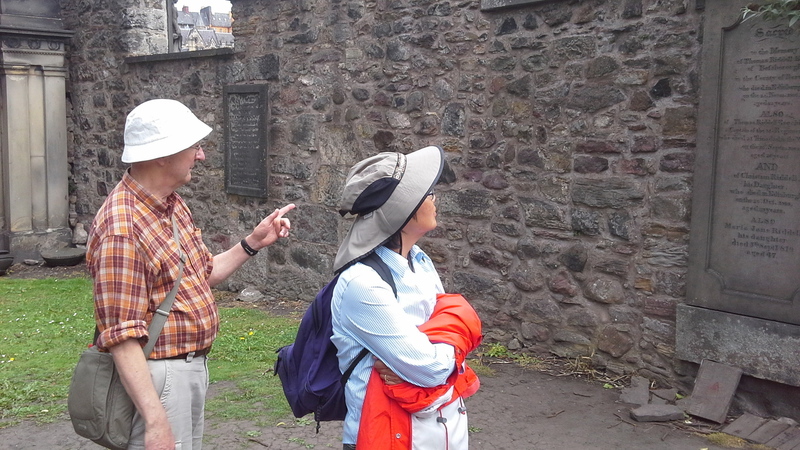 We skirted around the edge of what would have been the city wall, passing by the Old Infirmary and Medical School. 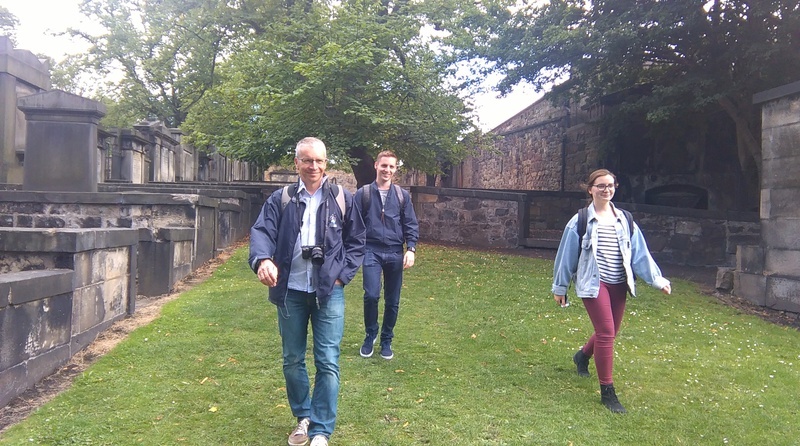 Into Greyfriars Churchyard with connections to the grave robbers and names on headstones used by J K Rowling in her Harry Potter books! 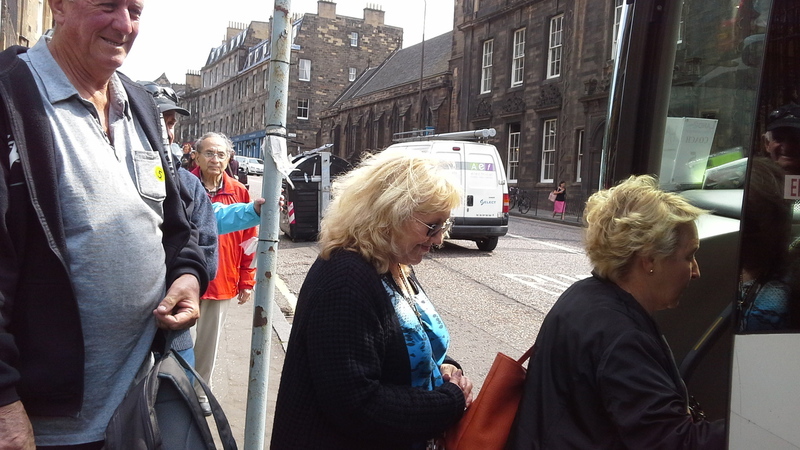 To the Grassmarket, where 'hangings' took place. 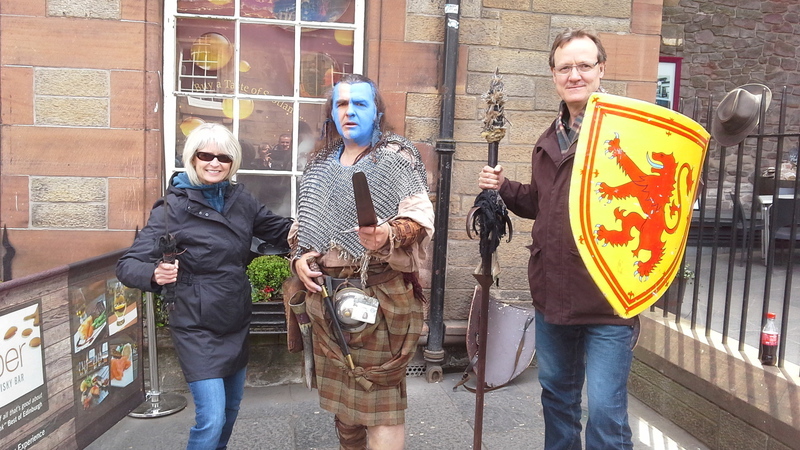 On our way to the Castle we were abducted by 'Braveheart' or at least Valerie was ....... 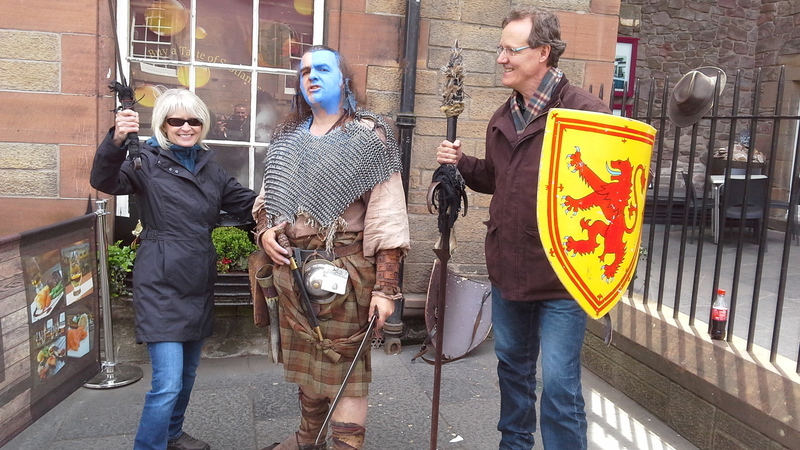 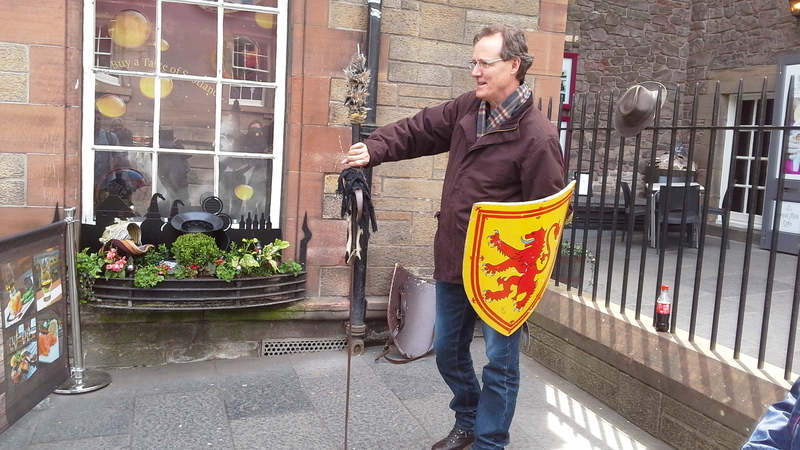 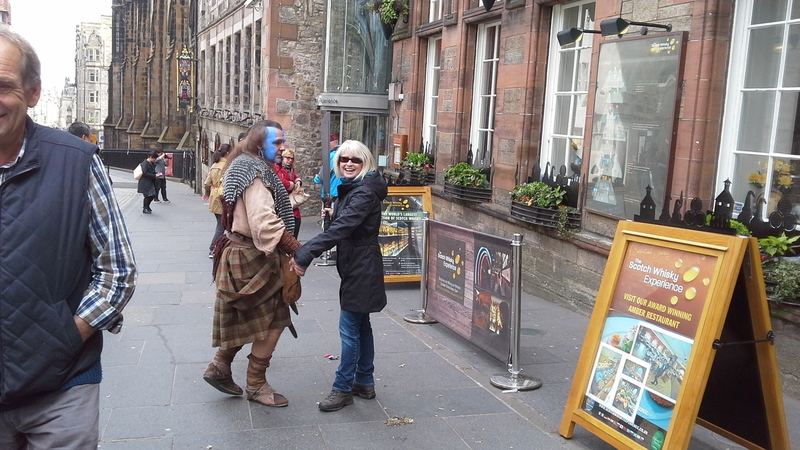 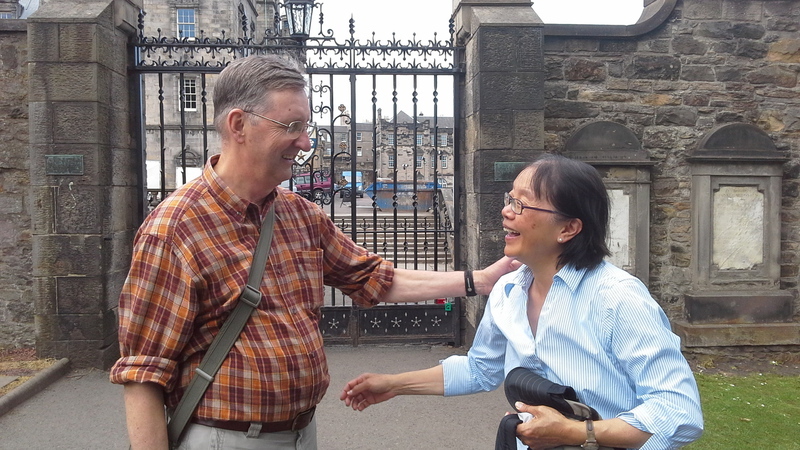 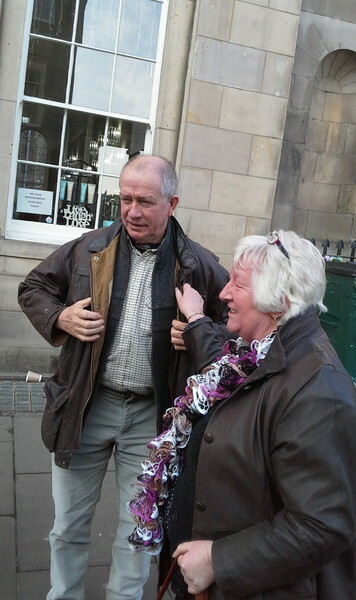 Took a shine to Valerie, taking her by the hand and leading her off down the Royal Mile, leaving Jeff and I behind! 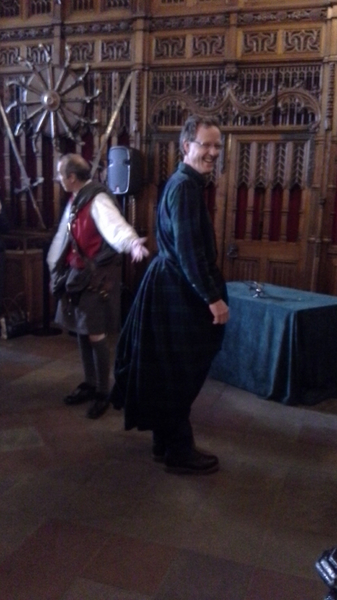 In the castle there was a special item about Jacobites and kilt wearing - Jeff was our model, he wore it well, and has developed a new way of walking (but only when he is wearing the kilt!) 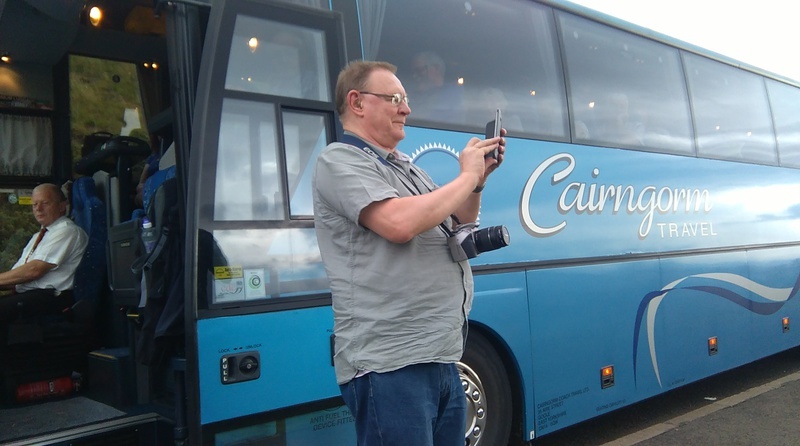 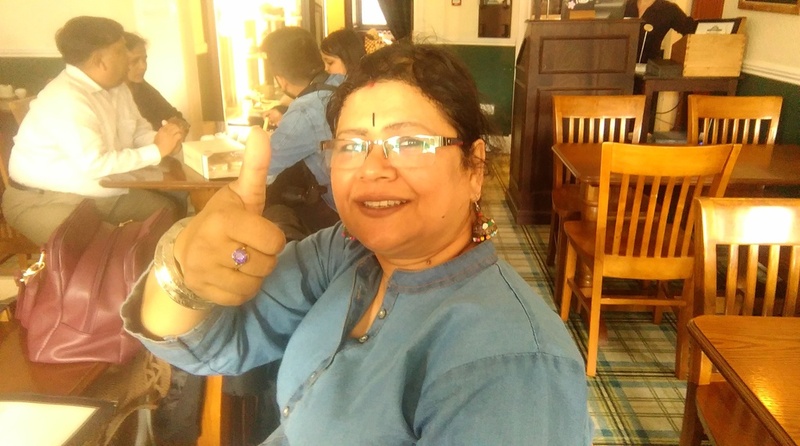 - a new career? 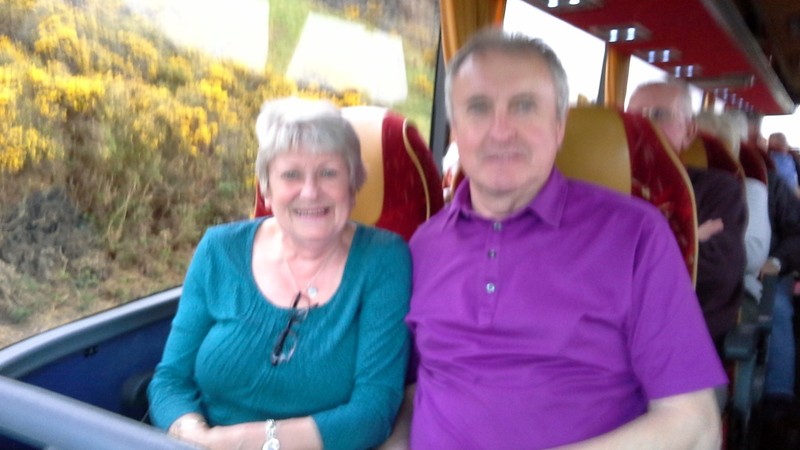 We have had a fabulous day and really got caught up in the moment. 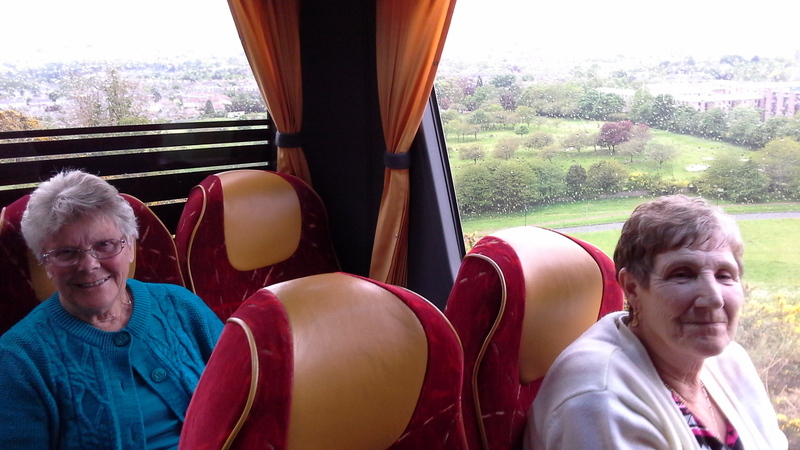 We have another day tomorrow - looking forward to it. 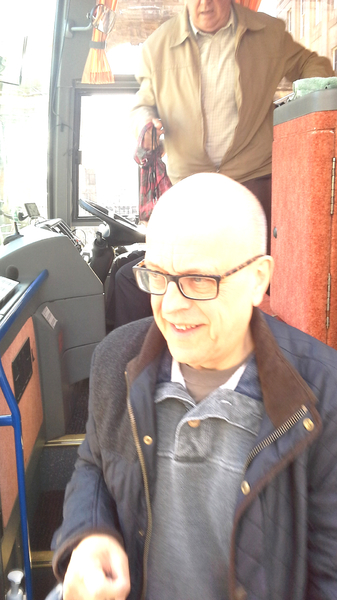 Iain's a busy driver. 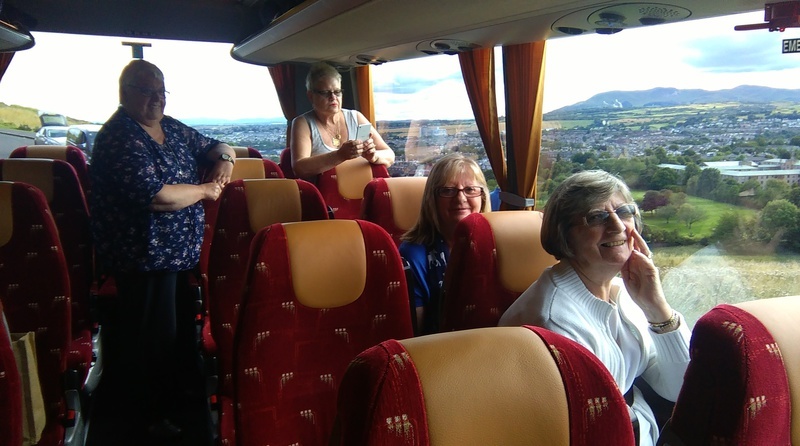 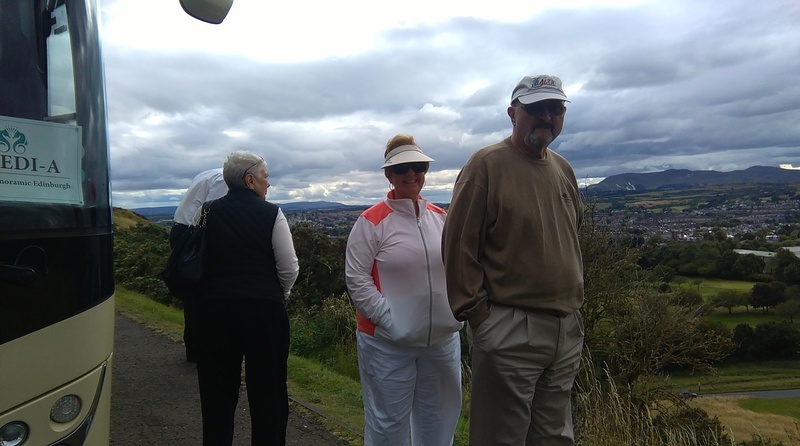 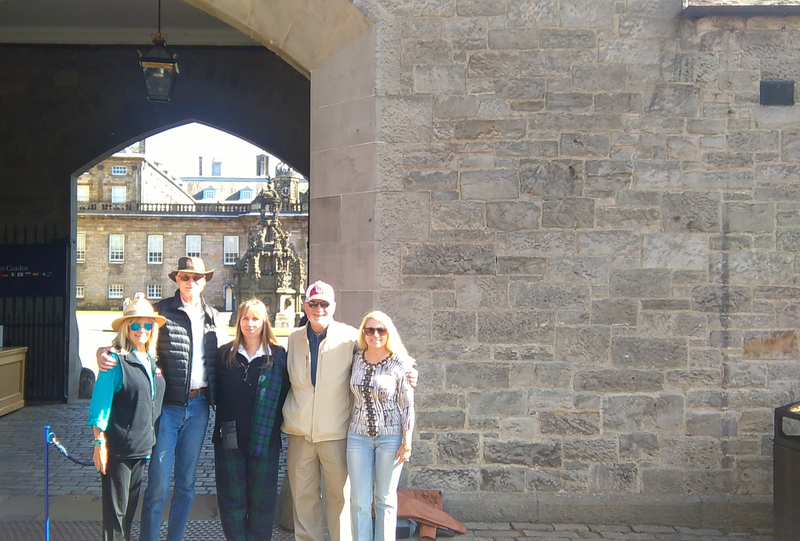 This week he brought this lovely group of passengers from the Midlands of England to drink in the wonderful sights of Edinburgh. 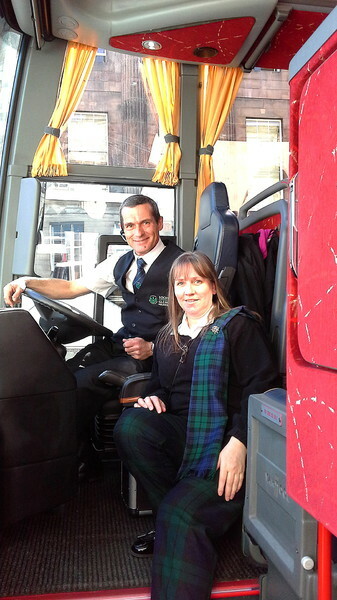 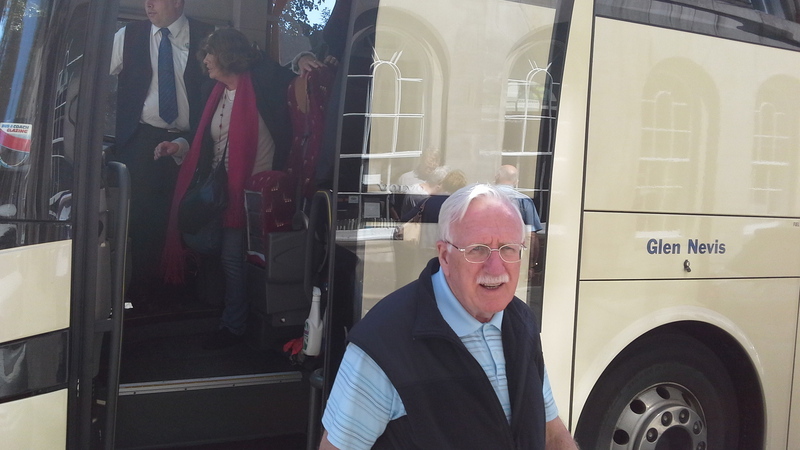 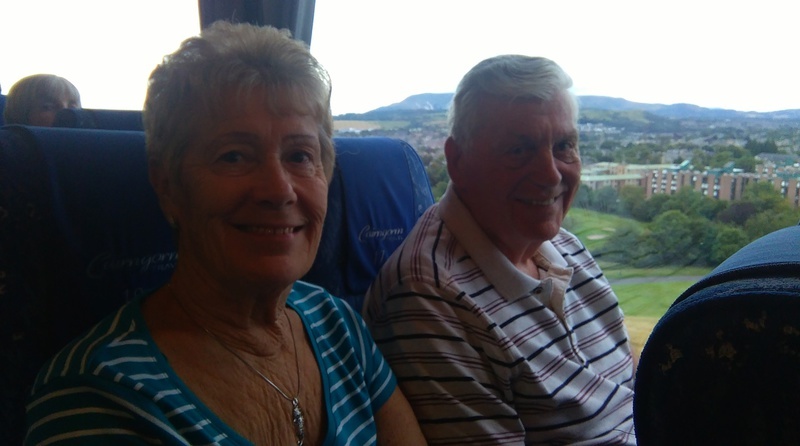 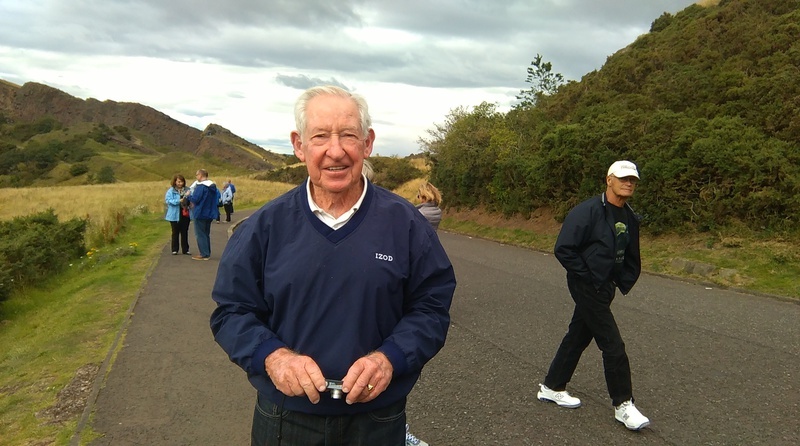 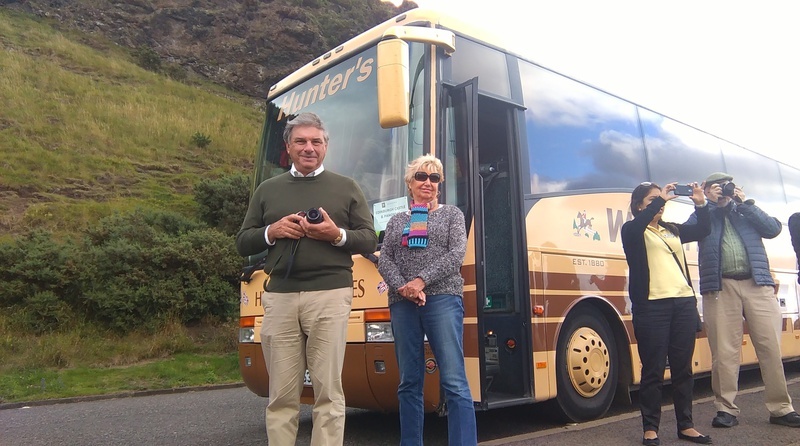 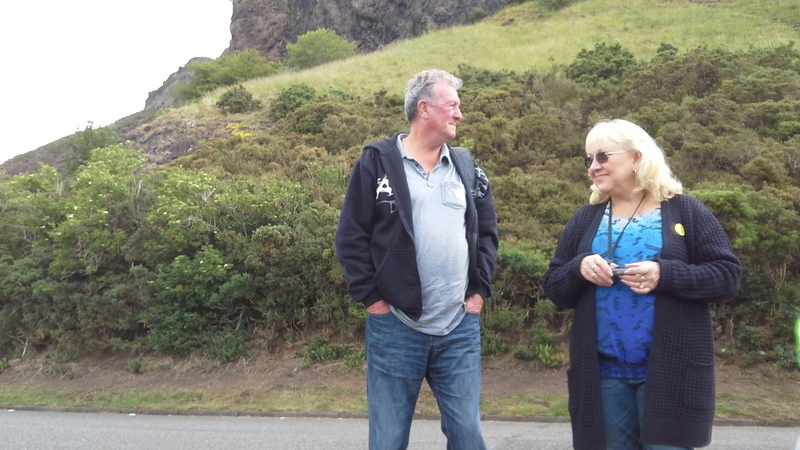 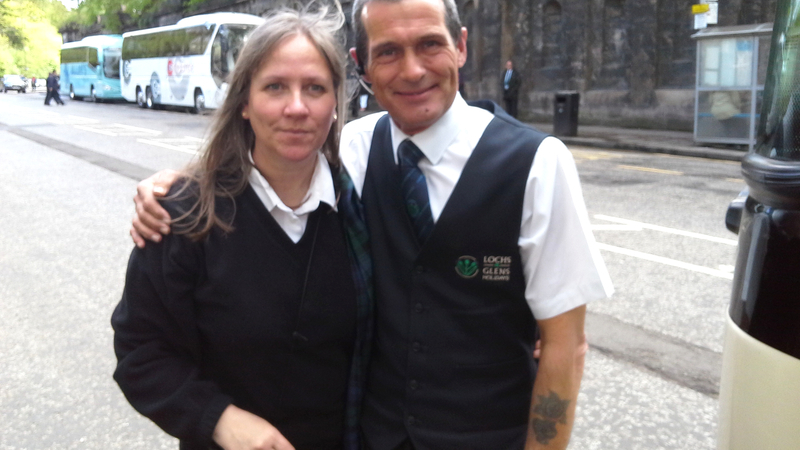 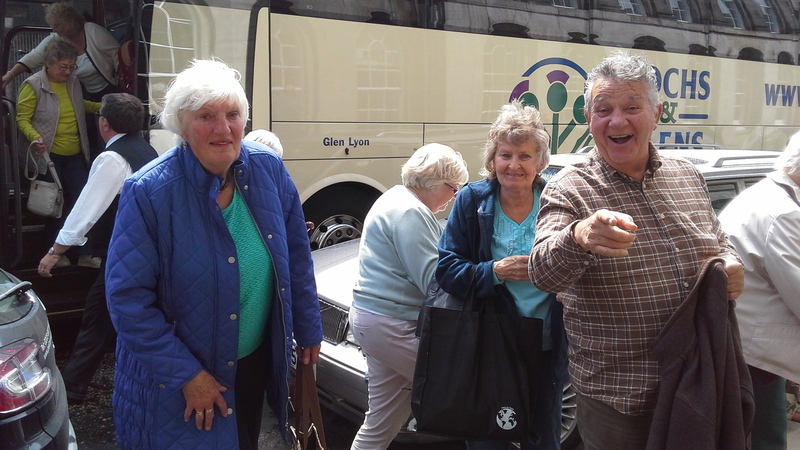 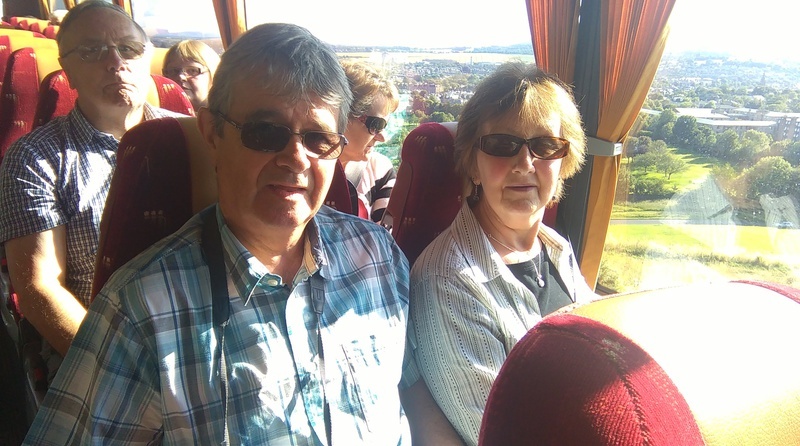 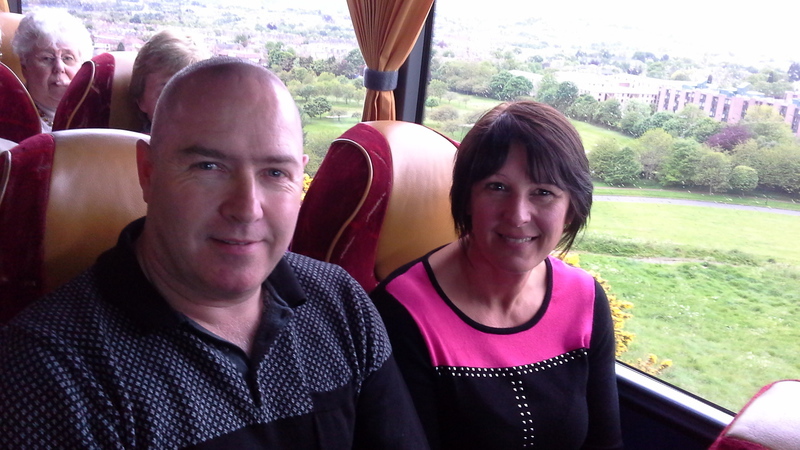 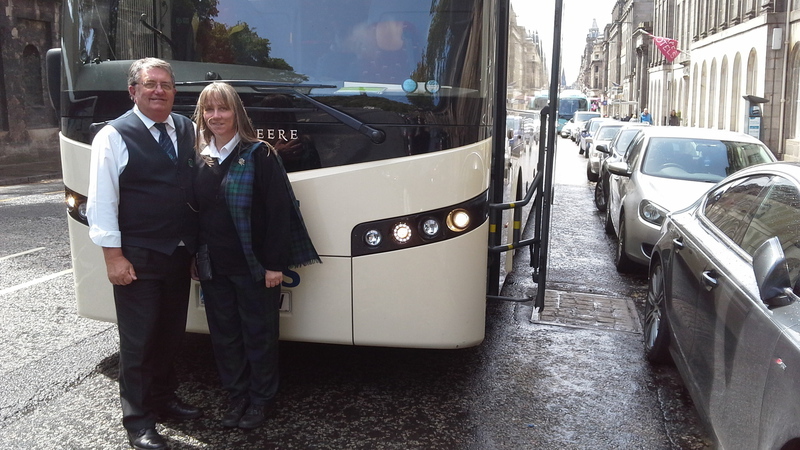 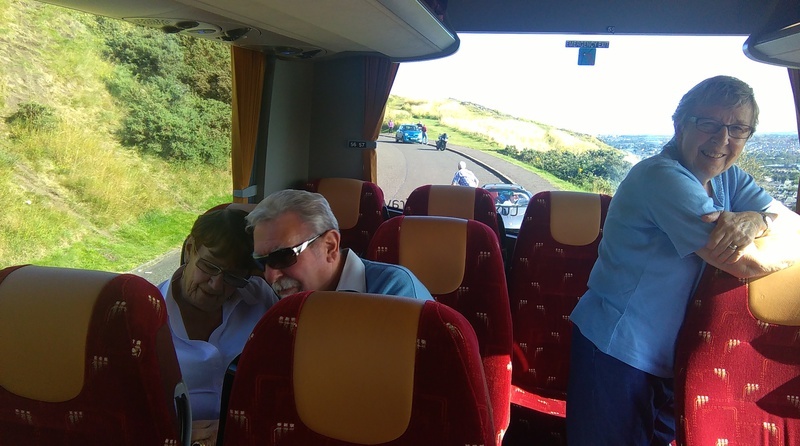 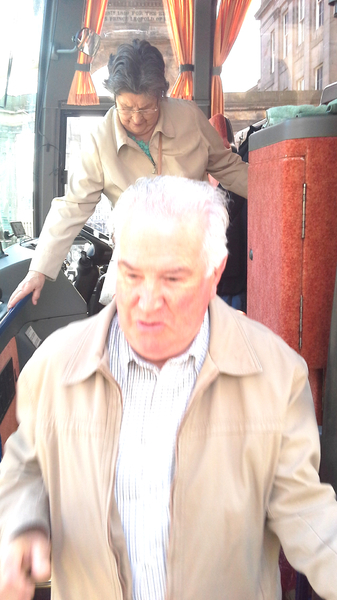 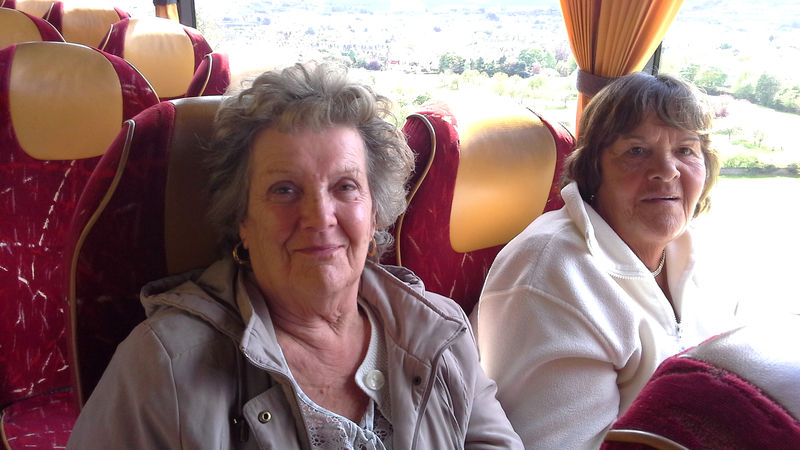 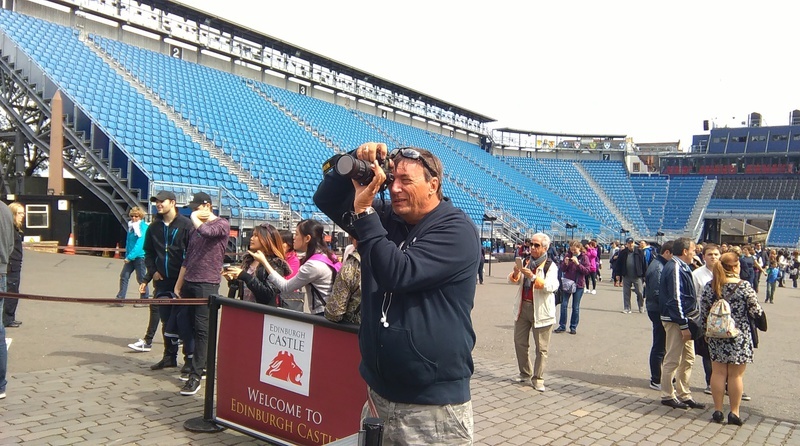 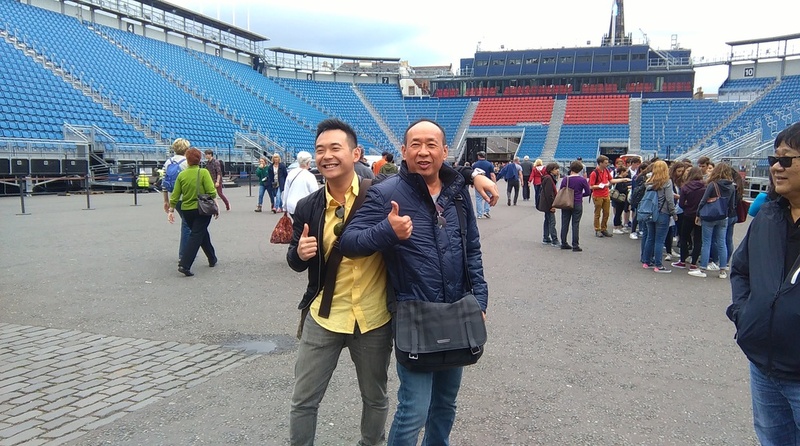 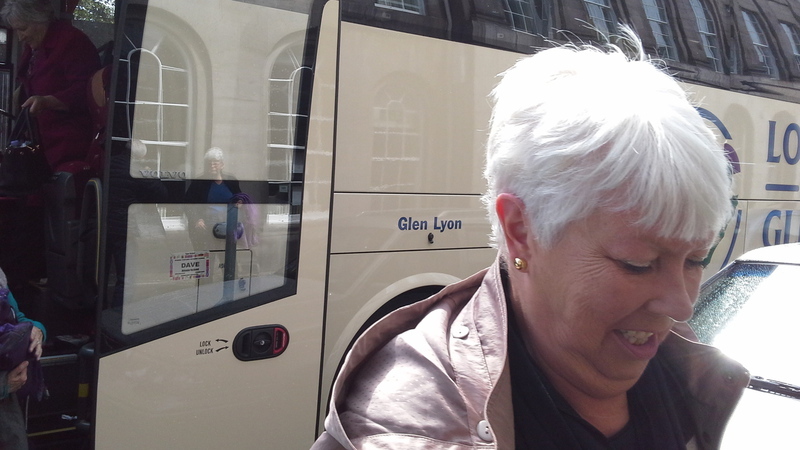 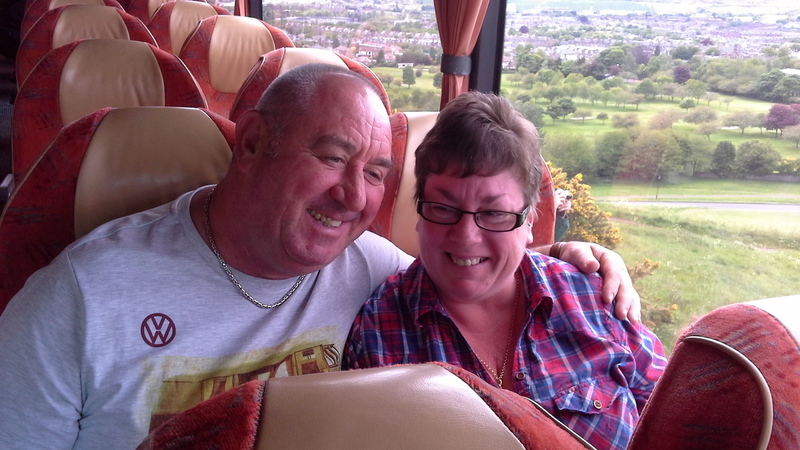 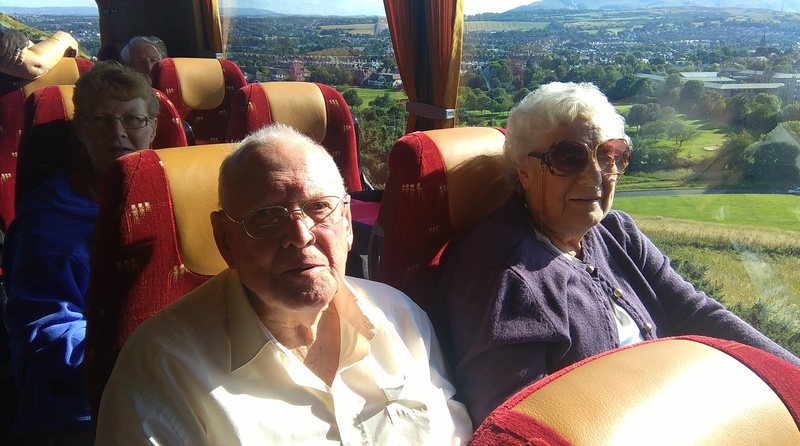 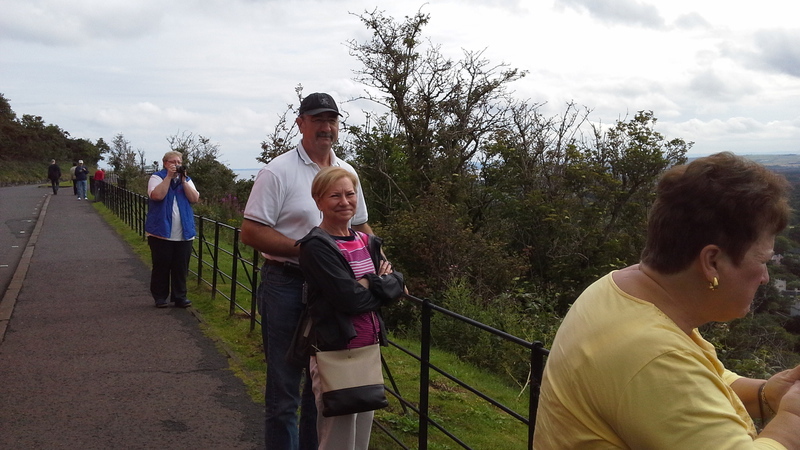 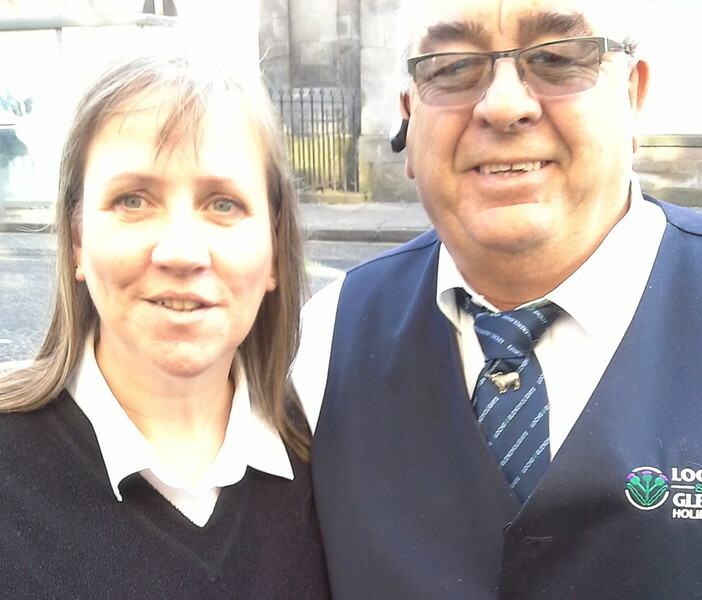 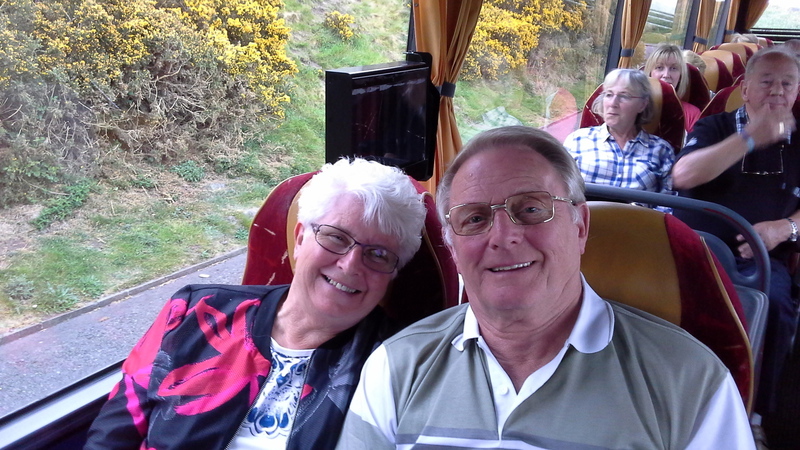 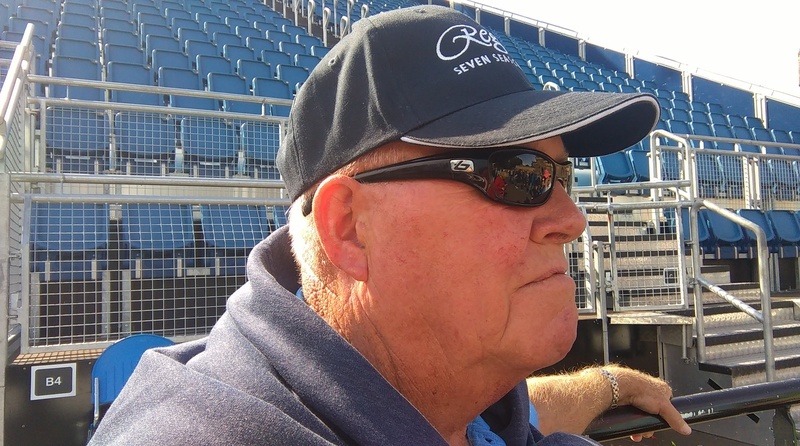 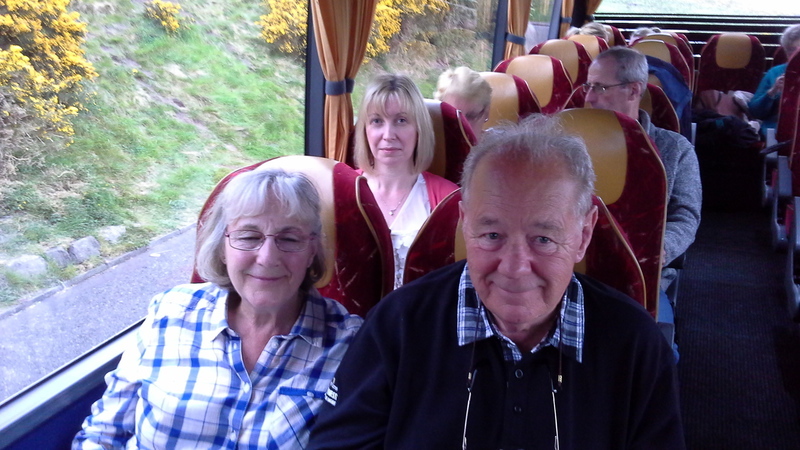 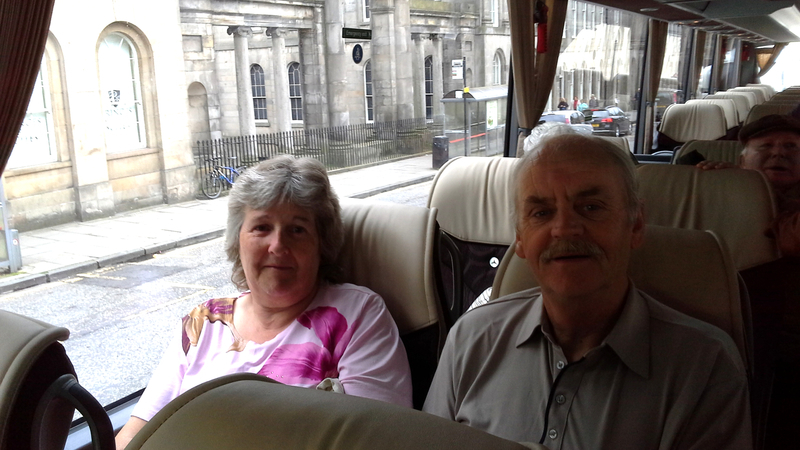 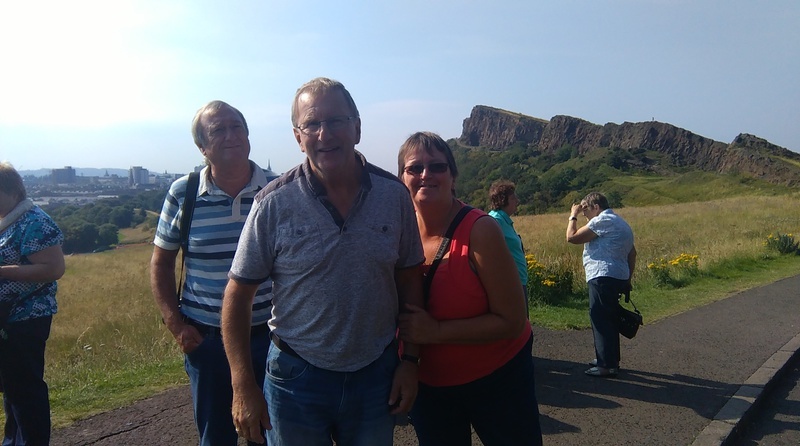 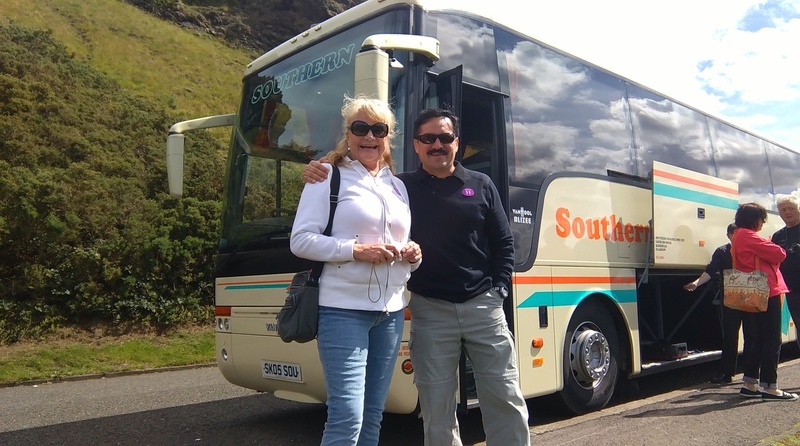 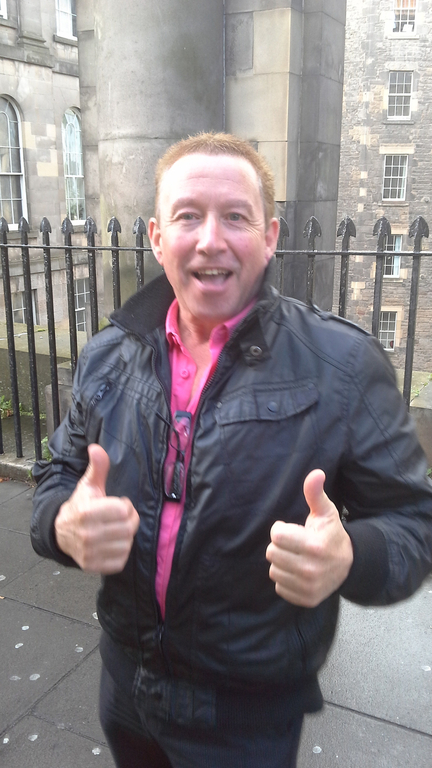 Today, Driver Ian brought his Cornwell Group to Edinburgh from Loch Tummel. 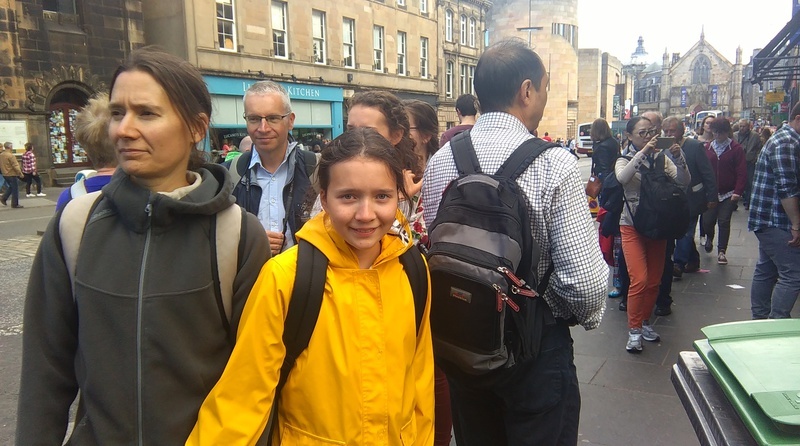 A tour round the city and everyone joined in with the fun. 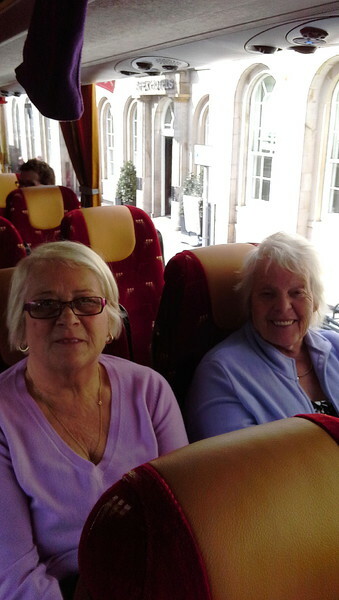 Their next stop, down to Leith to visit the Royal Yacht Britannia. 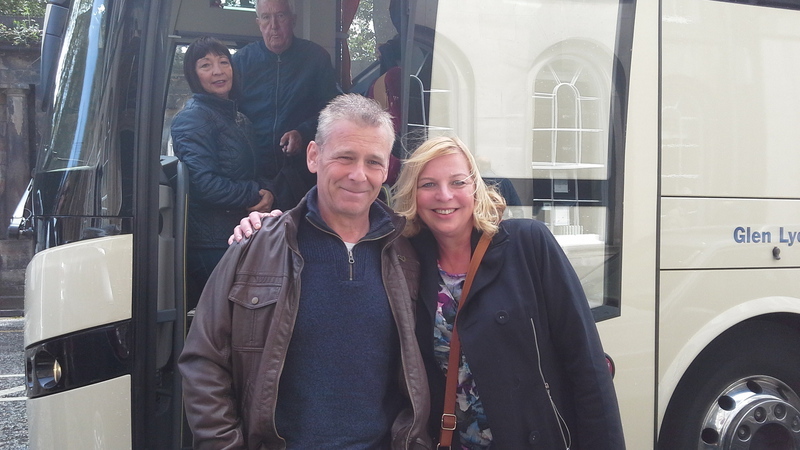 Super tour today with Iain and his coach tour with visitors from Wales. 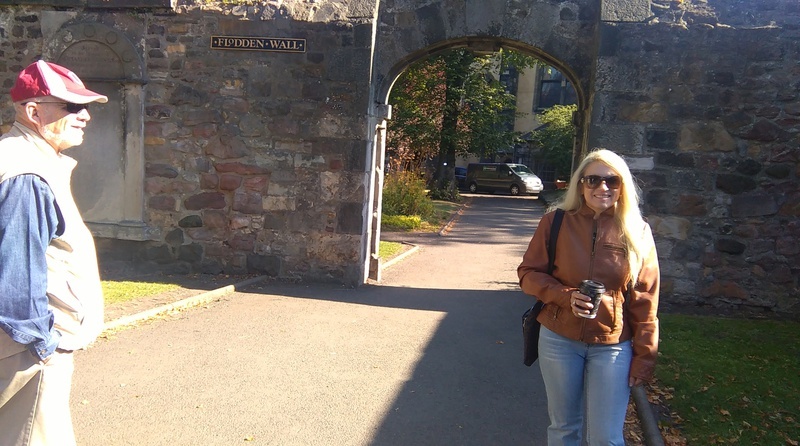 Couldn't remember the name of the posh hotel with the golf course - here it is now- the name came to me as I was walking home! 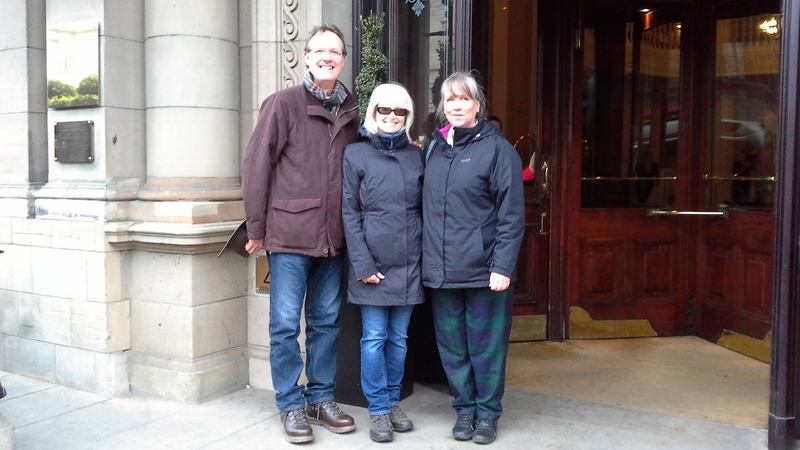 The Prestonfiled House Hotel. 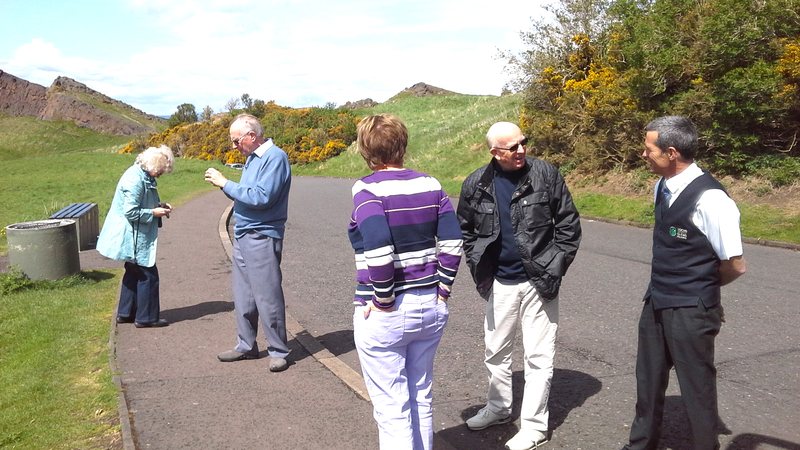 The golf course/club was formed for the civil service in 1920. 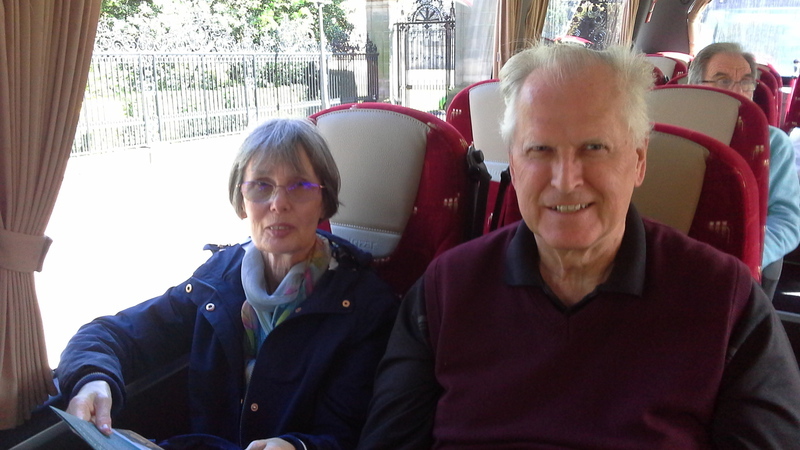 They often have a couple of peacocks roaming the hotel grounds and the fancy tents some passengers saw in the ground's were probably put up specially for a wedding reception of other such event..
Today a half day tour with Jim, Karen and Lilly from Hawaii. 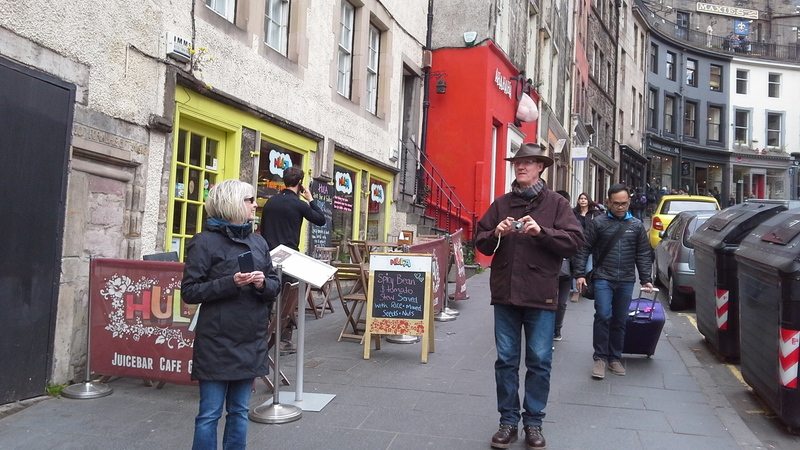 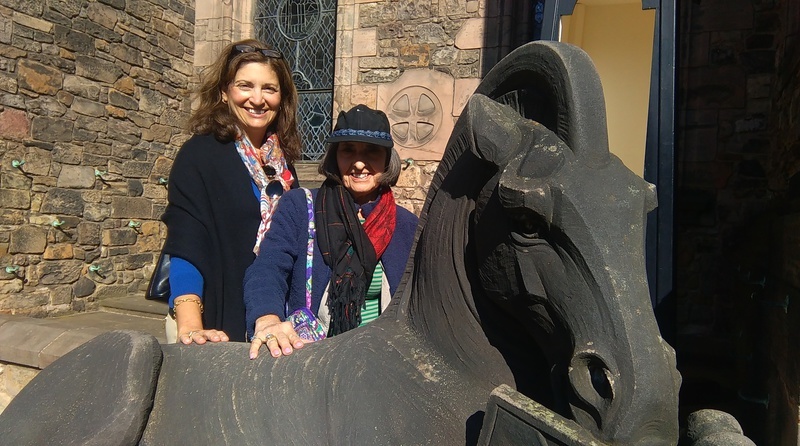 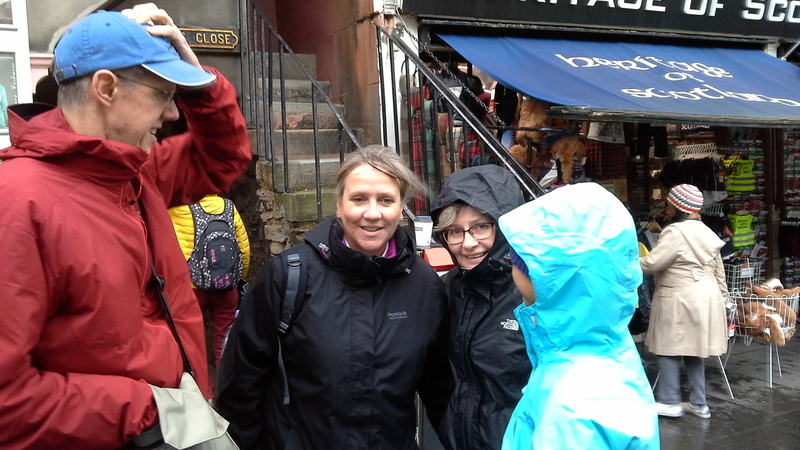 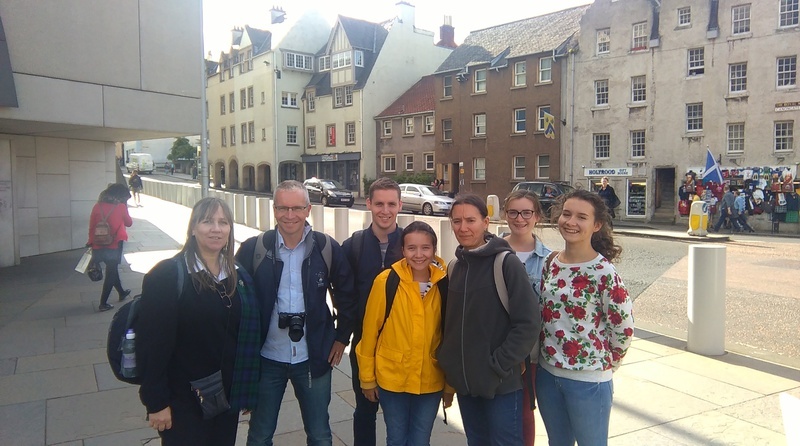 We started near the top of the Royal Mile and then wandered through some of the closes ( with stories to tell) and then down to the Grassmarket ( where at one time the animals and livestock were bought and sold and humans were hanged! 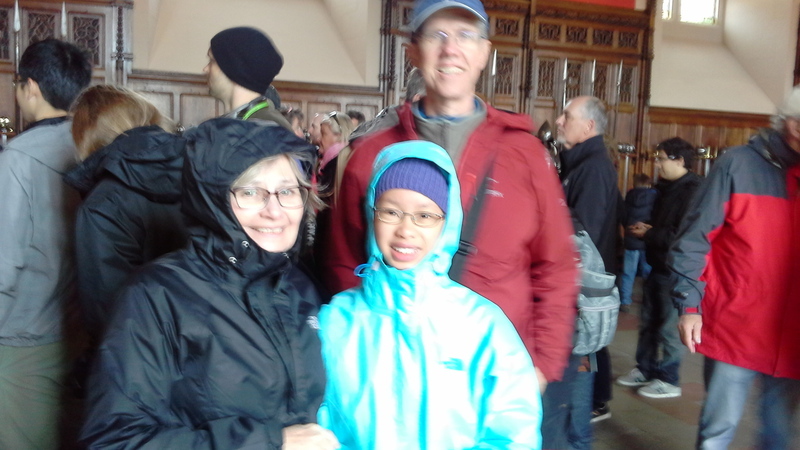 )We finished our tour in Edinburgh Castle where we were entertained by a singing musician dressed in costume, probably from the 18th century. 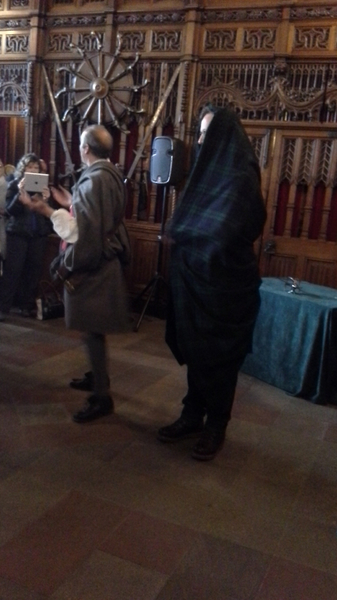 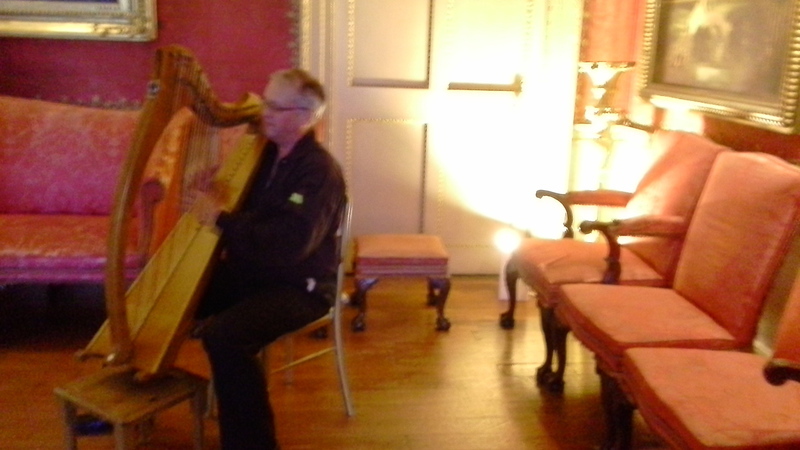 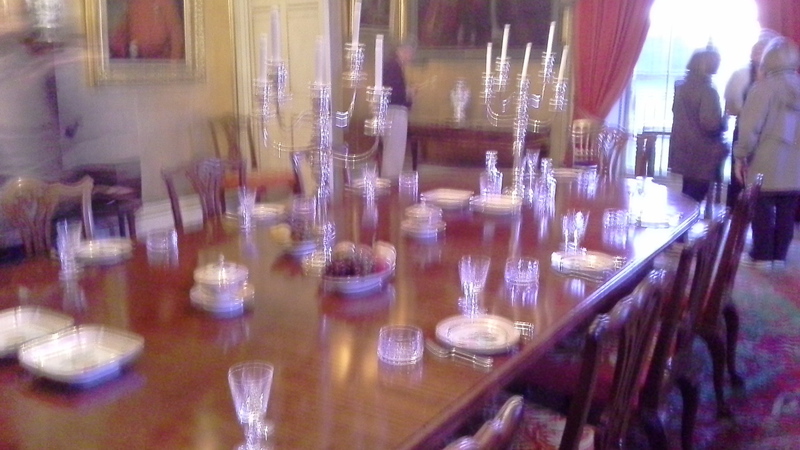 He explained how, many instruments came to Edinburgh during that peroiod. 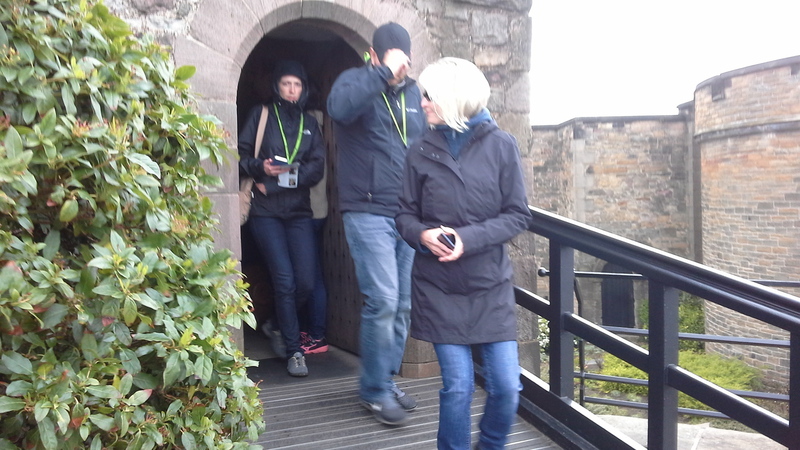 I think all 3 will be back at the castle tomorrow as there is so much to see.... Great day - early night! 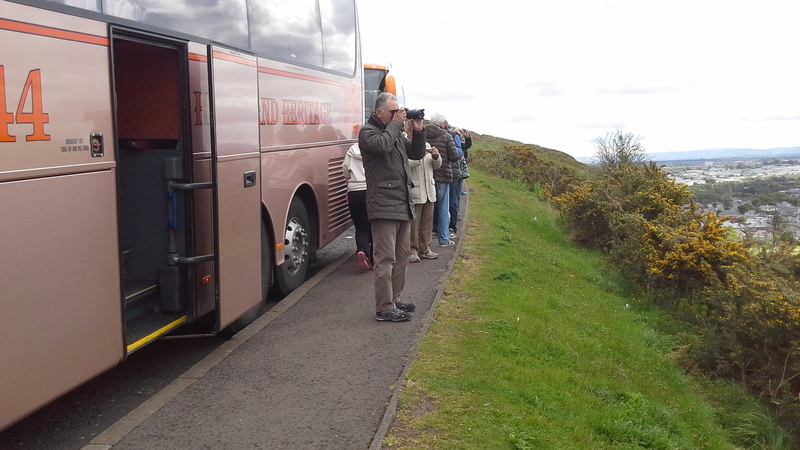 Cruise Liner Boudicca berthed in the Port of Rosyth today. 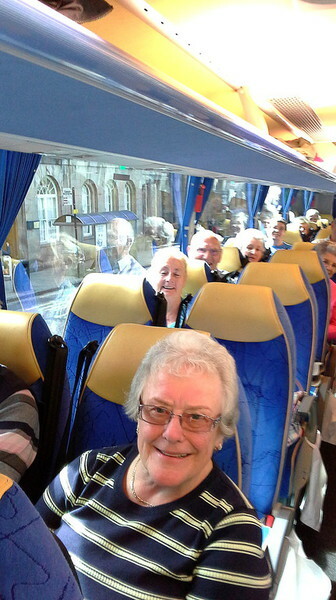 Lovely people on the tour, mainly from the south of England. 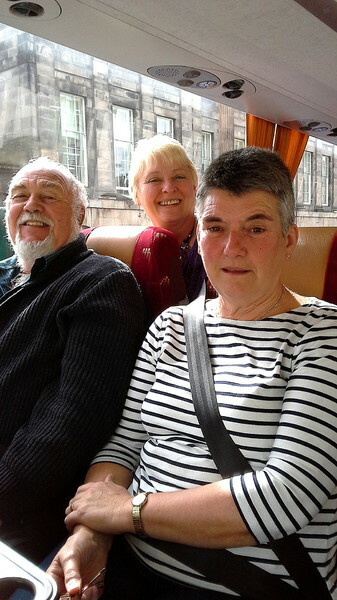 Driver Gary looked after us well and we were helped too by trainee guide Lorraine, learning the ropes, and tour manager Margaret from the ship.. We came back across the Firth of Forth to Edinburgh and spent our time following royalty with a trip to the Royal Yacht Britiana anrd The Palace of Holyrood House as well as a tour round the city. 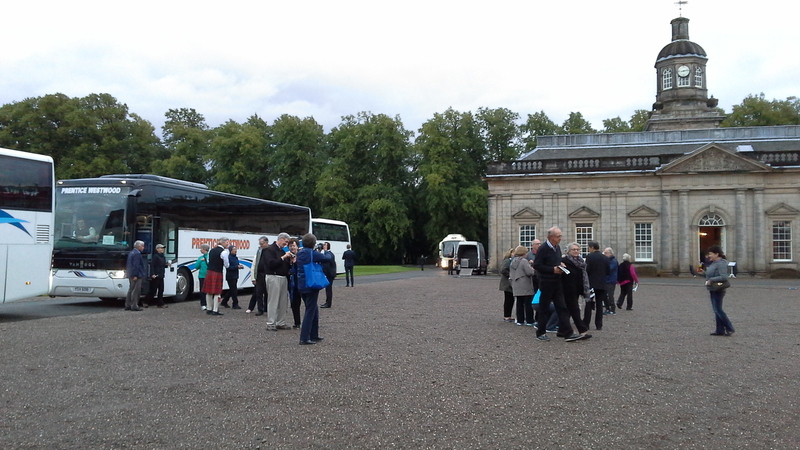 A busy day but a great group of people,only a pity they didn't have more time in Edinburgh. 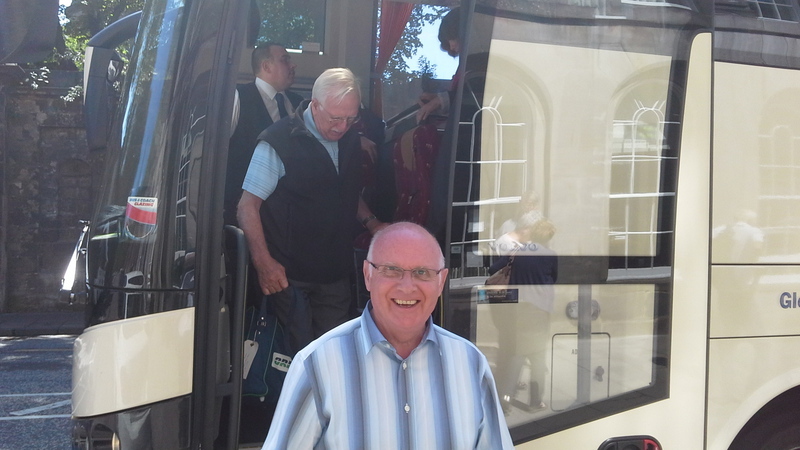 Driver John arrived in Edinburgh today with his group from Nottingham. 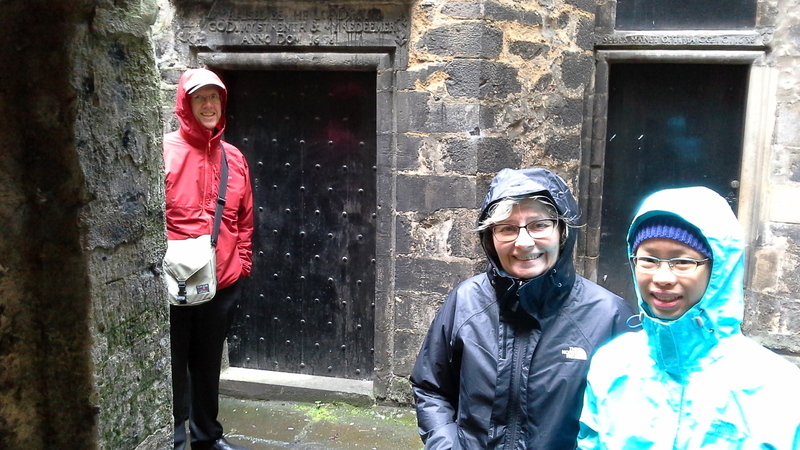 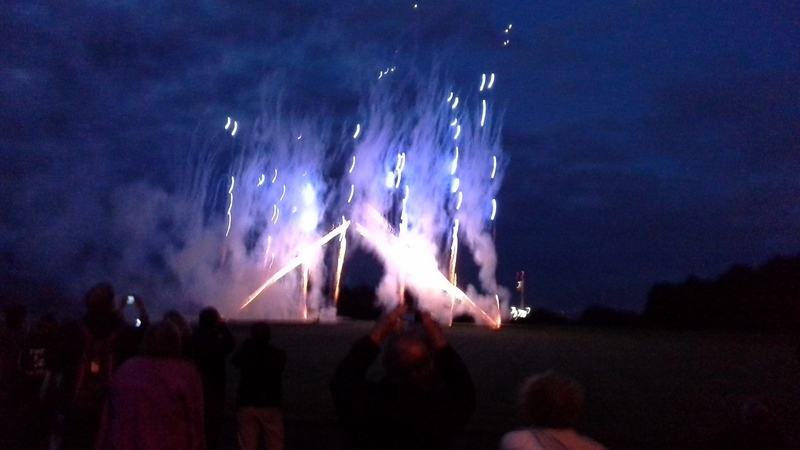 very wet but didn't dampen the mood - how could it? 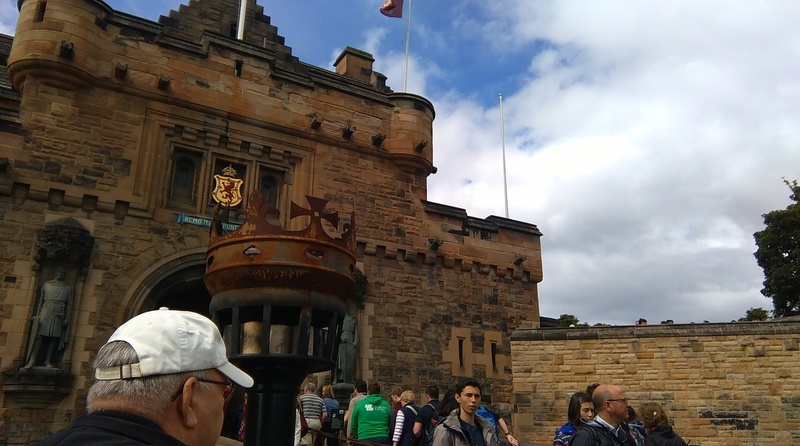 - it's Edinburgh! 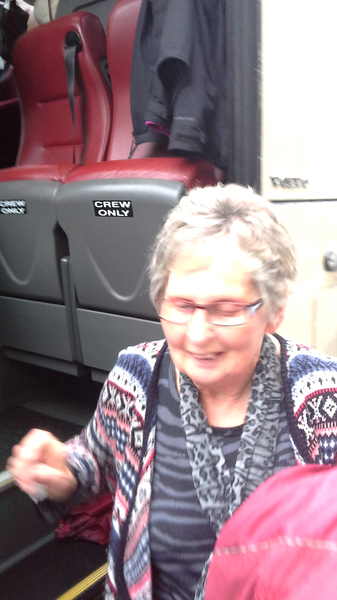 Happy tour. 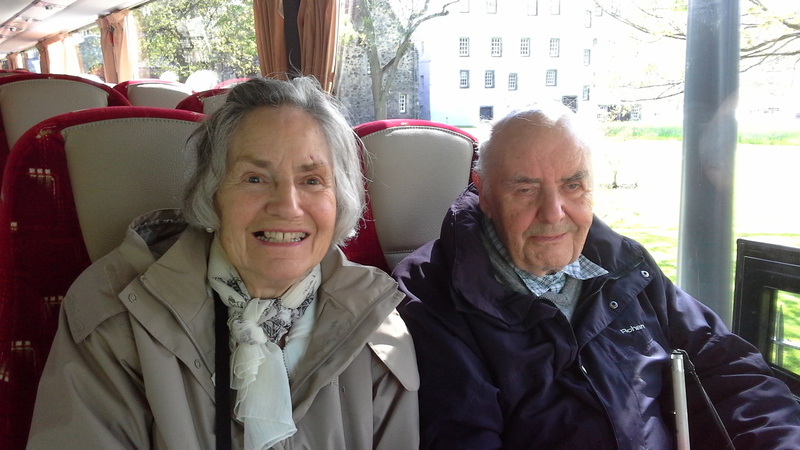 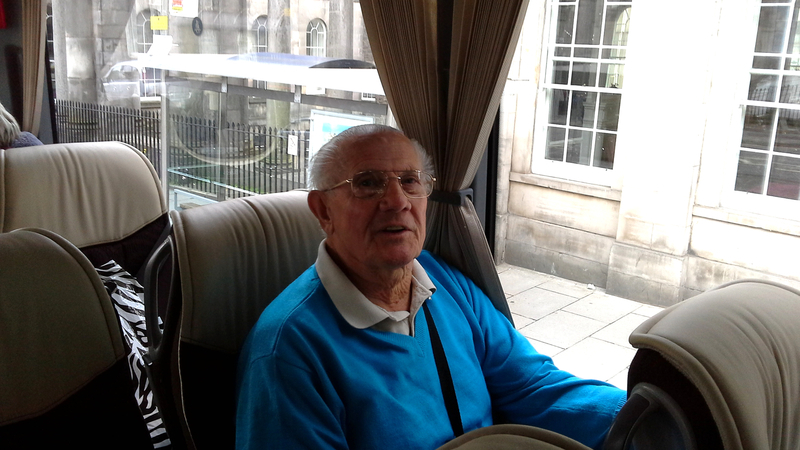 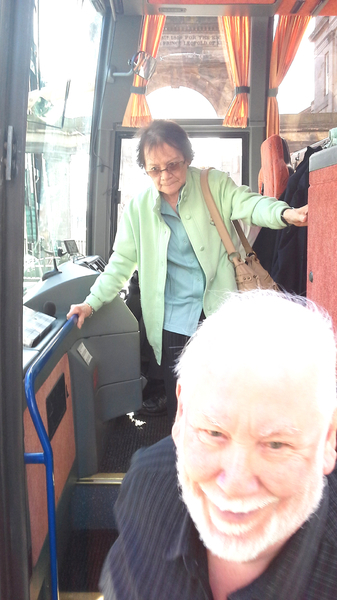 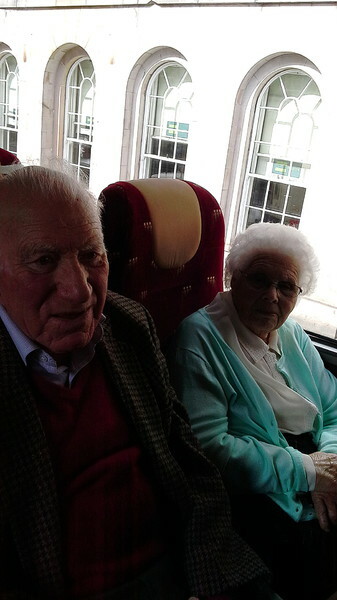 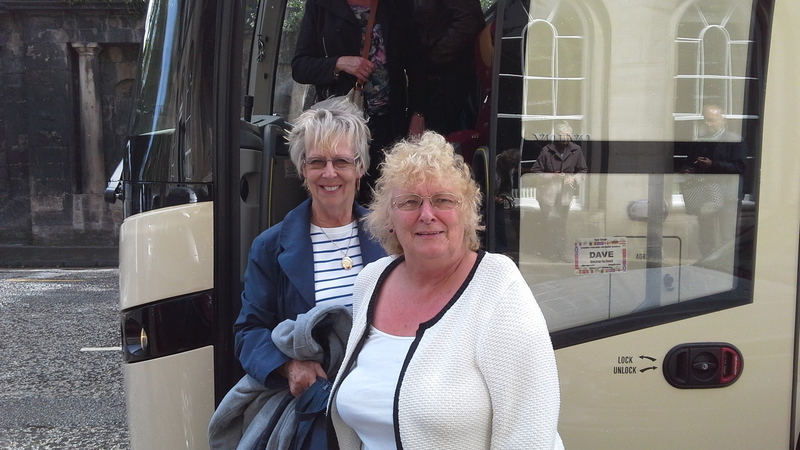 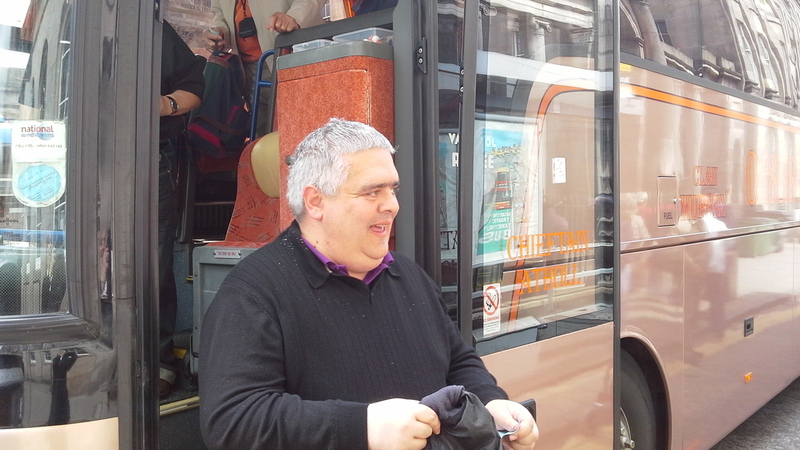 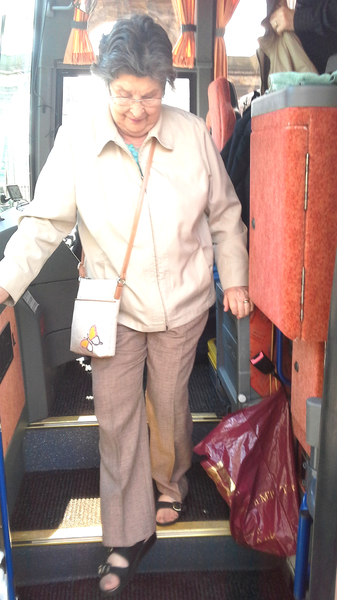 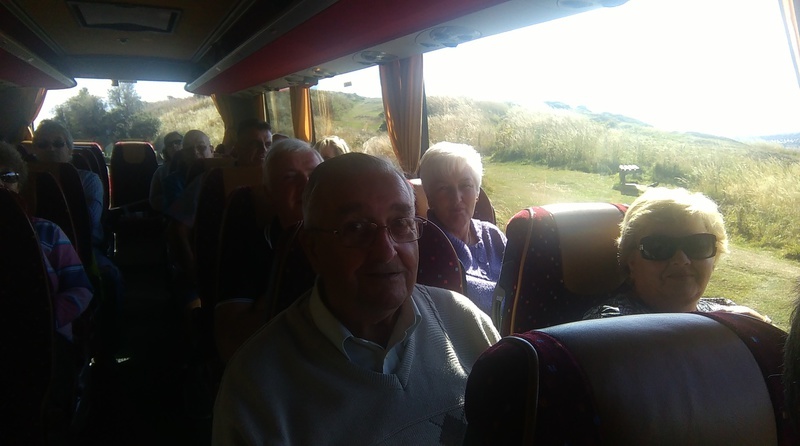 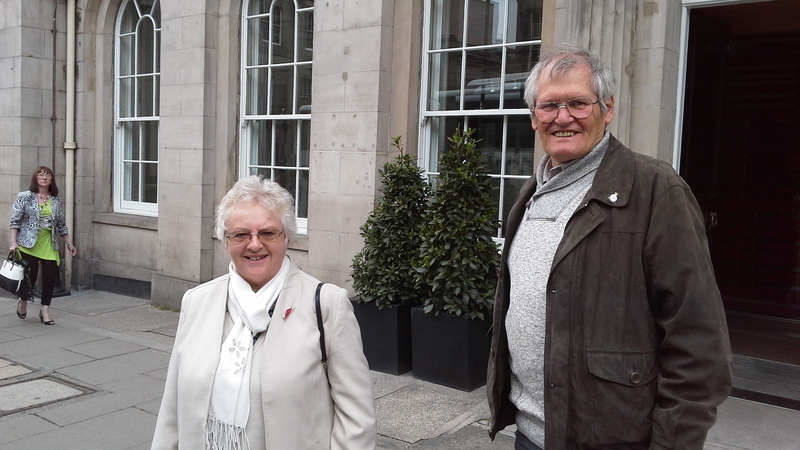 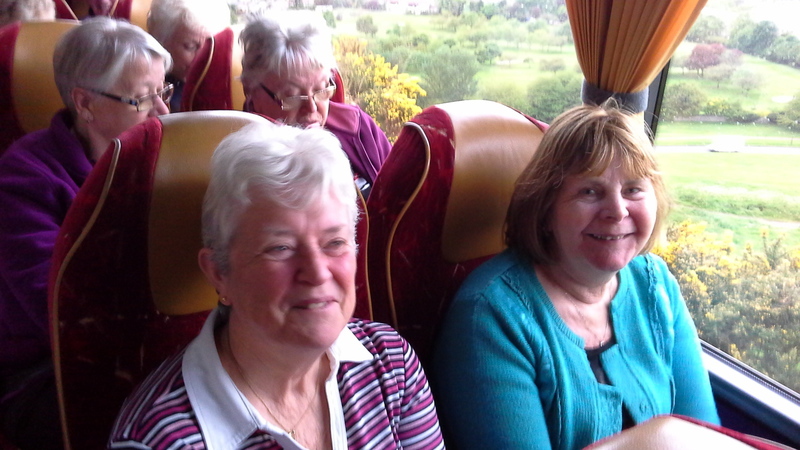 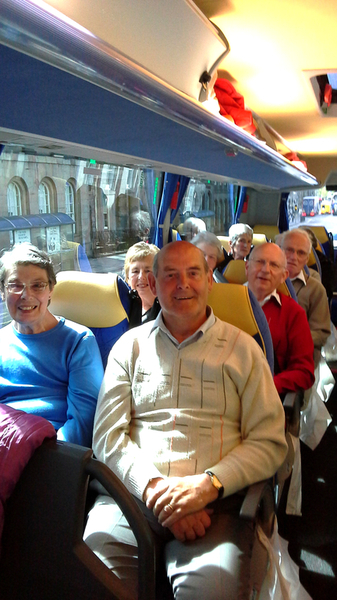 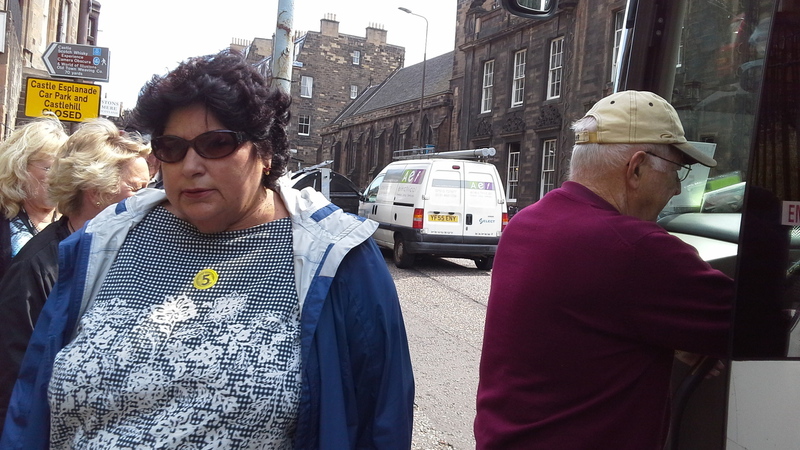 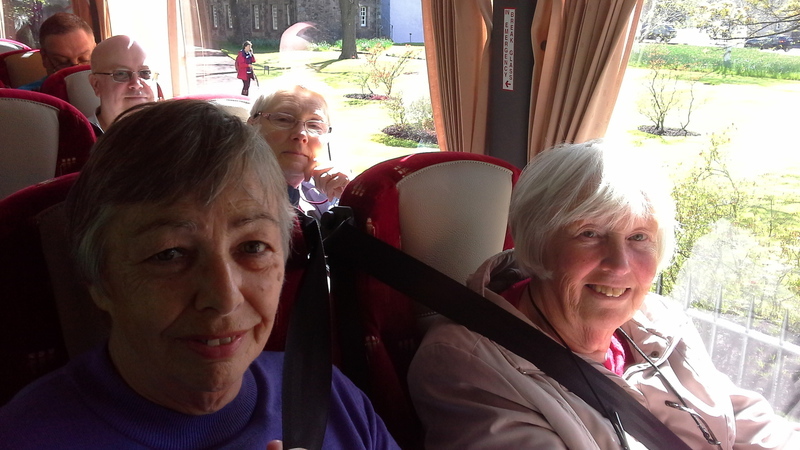 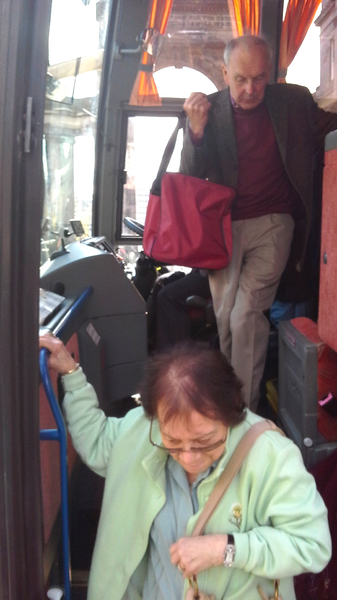 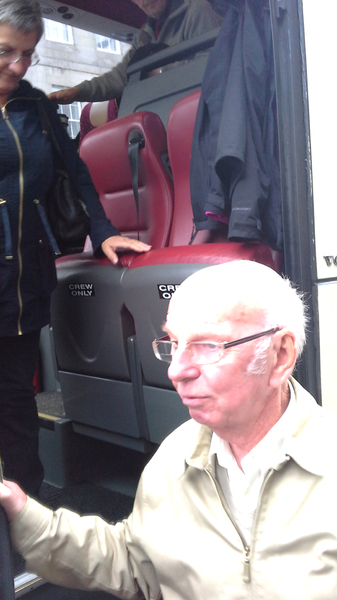 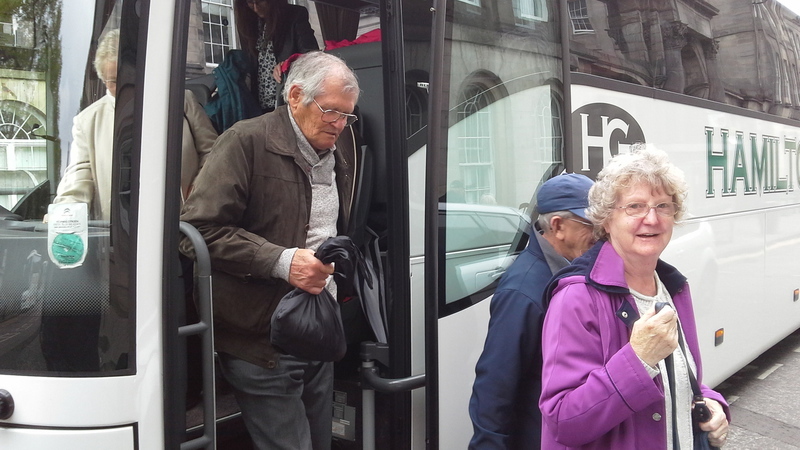 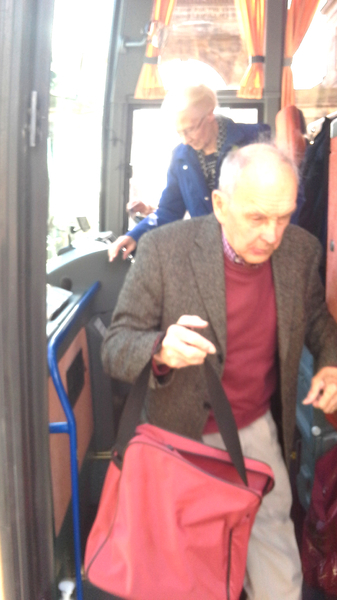 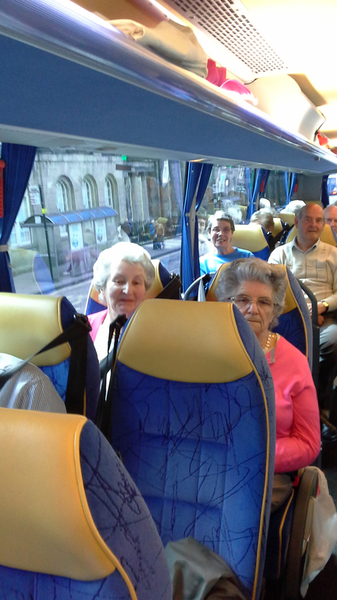 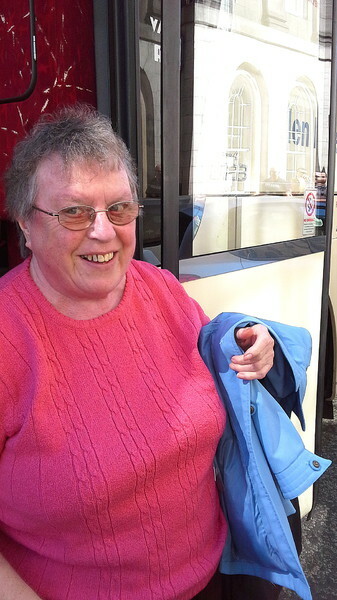 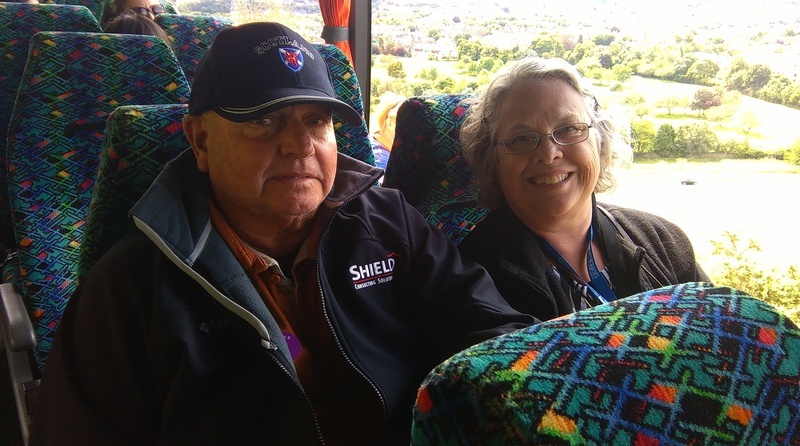 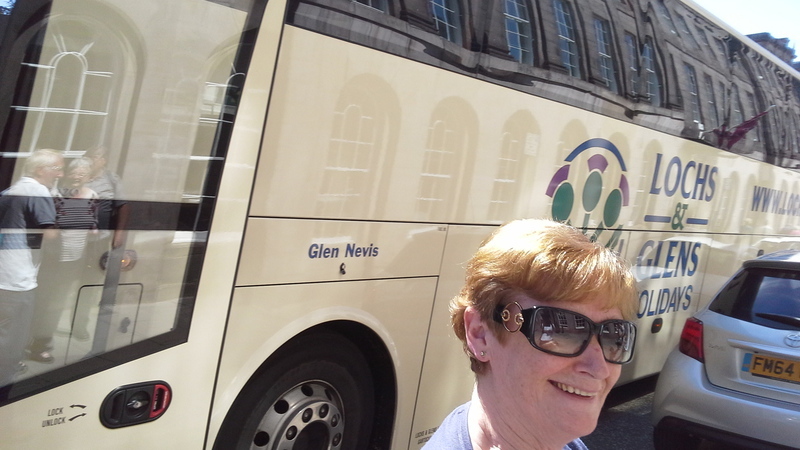 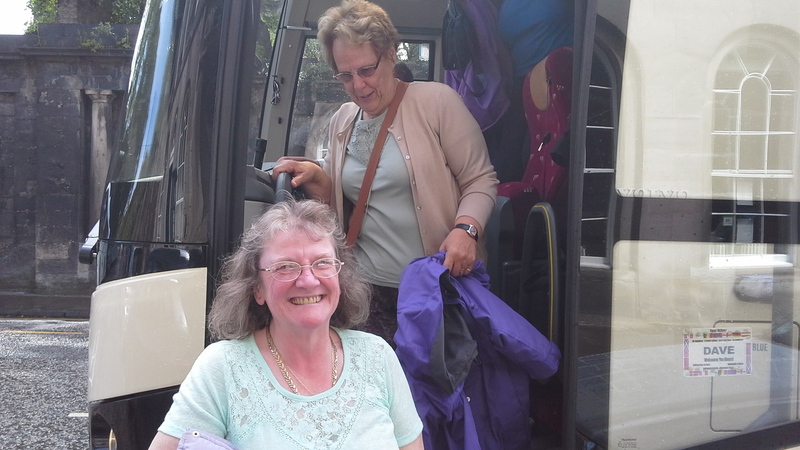 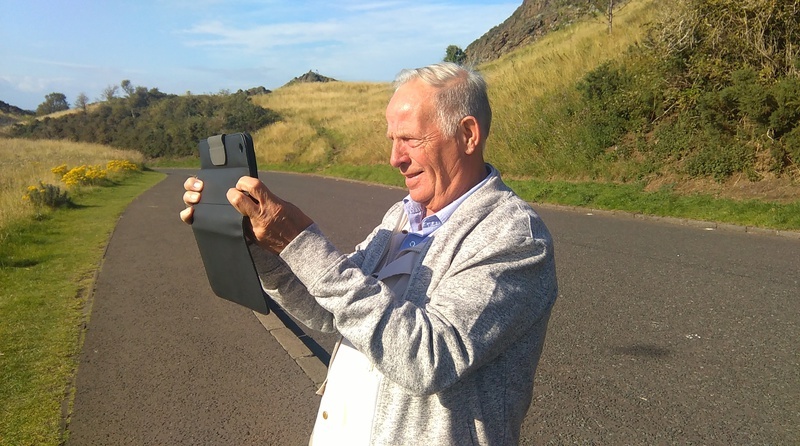 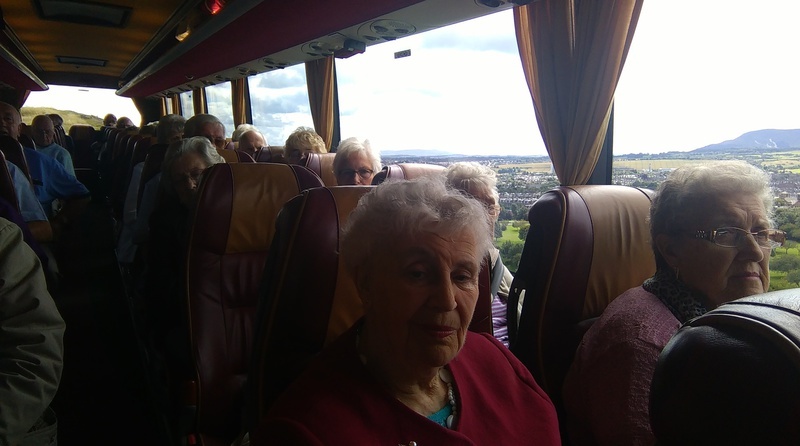 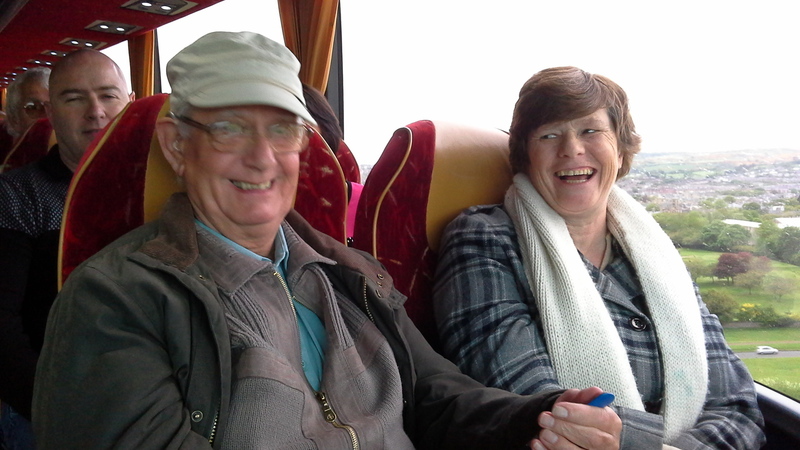 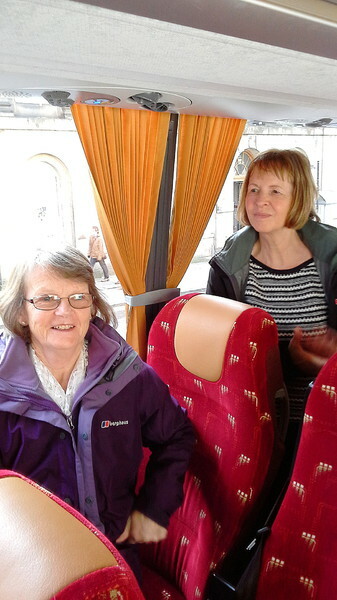 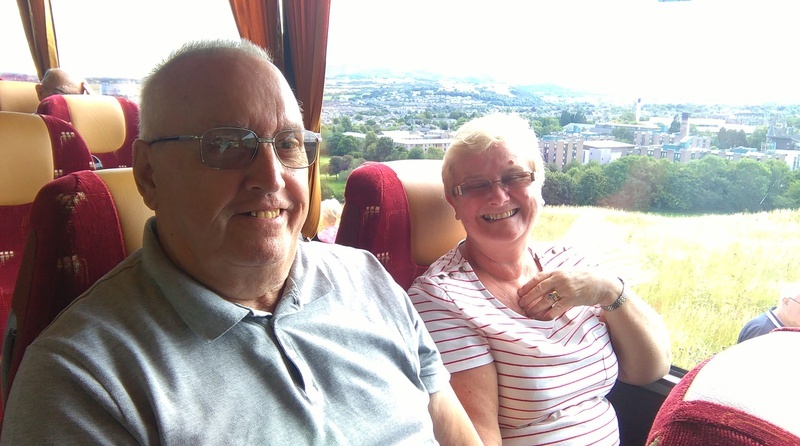 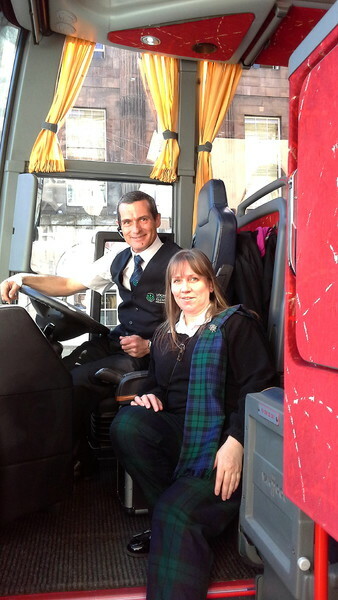 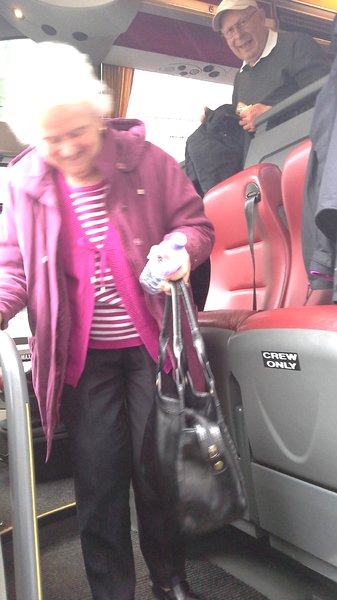 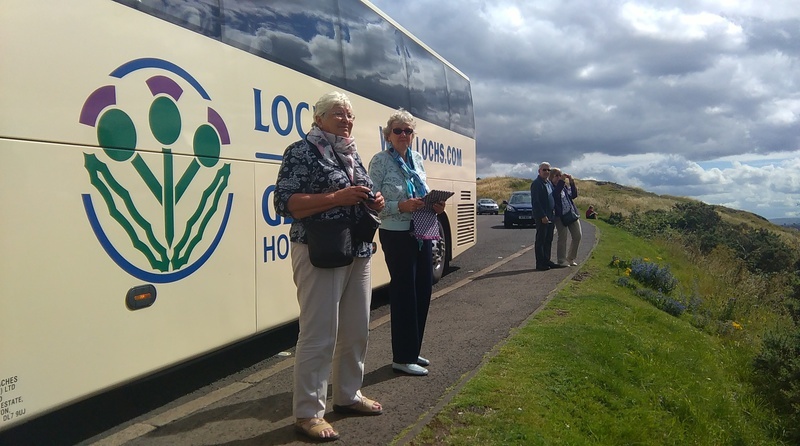 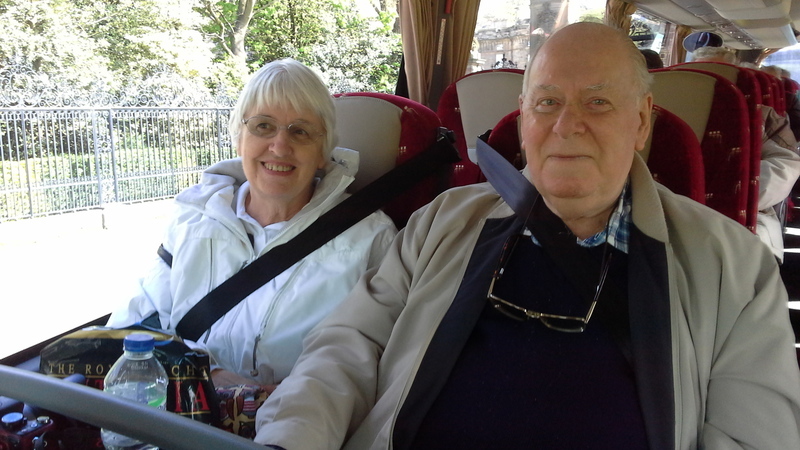 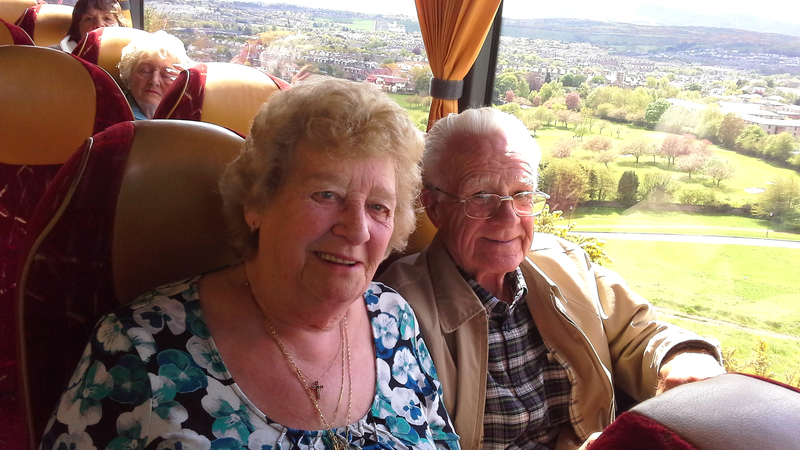 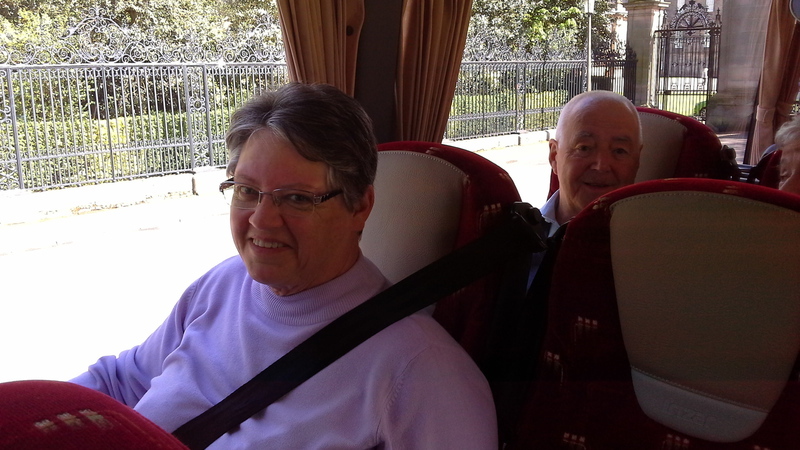 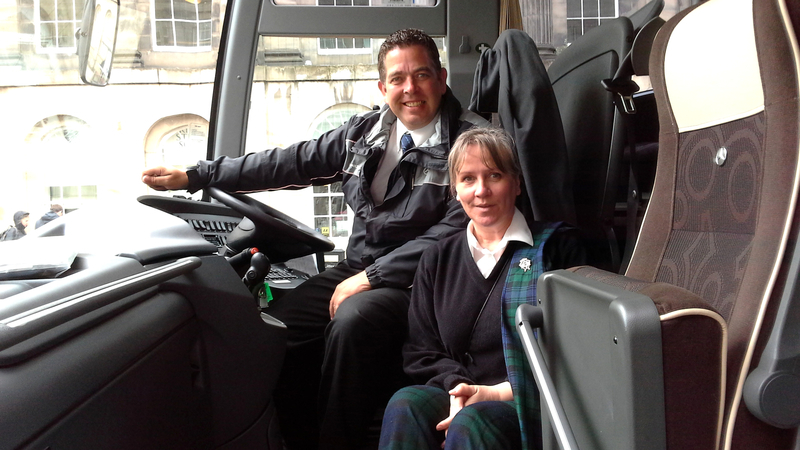 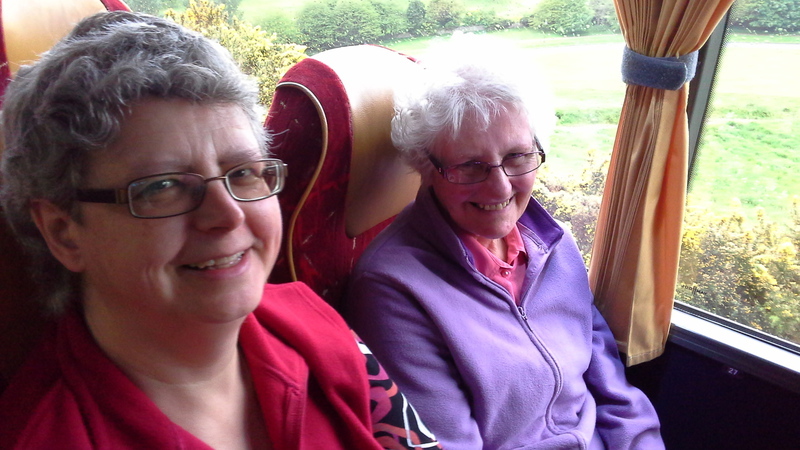 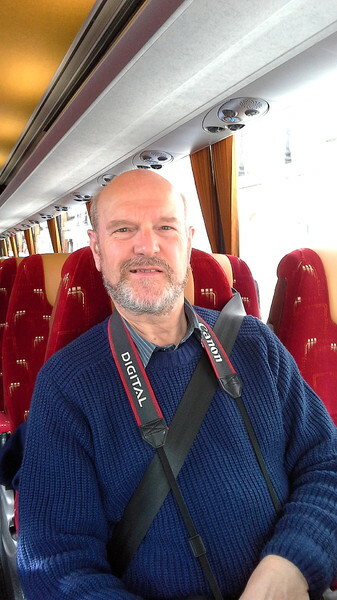 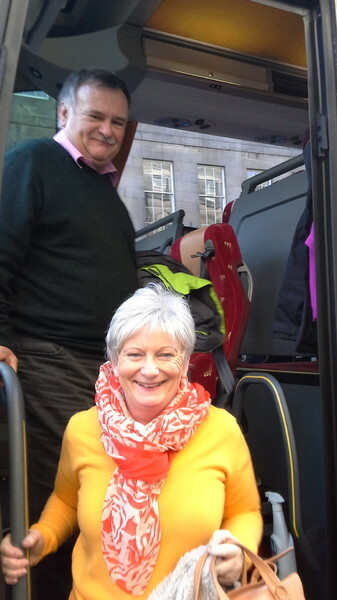 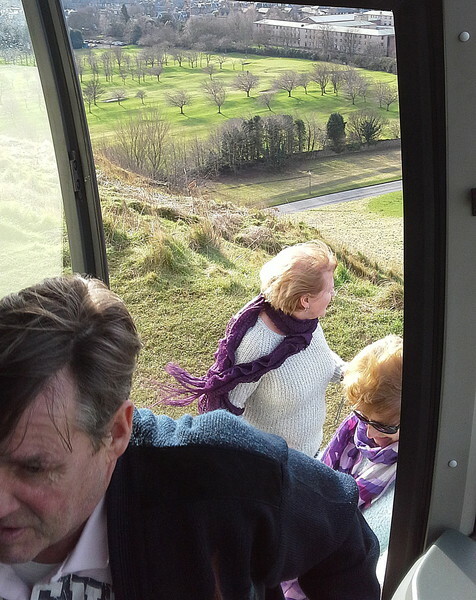 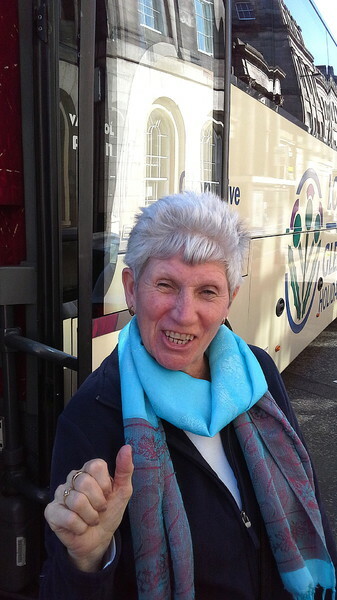 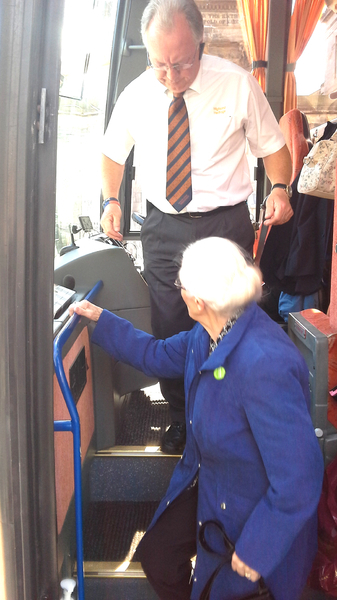 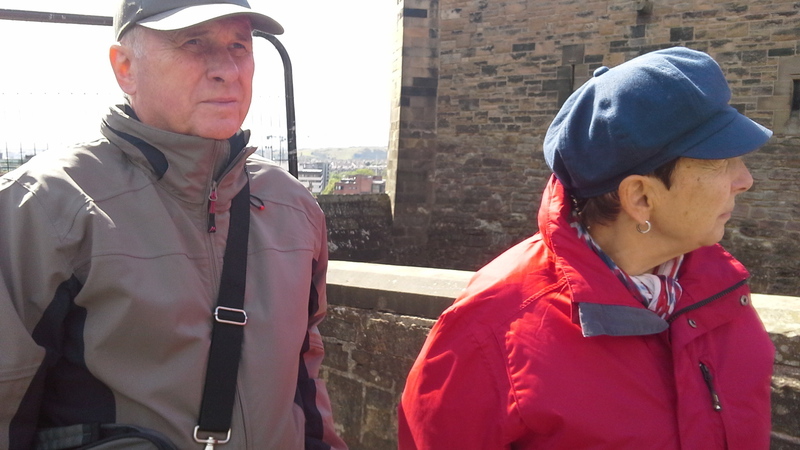 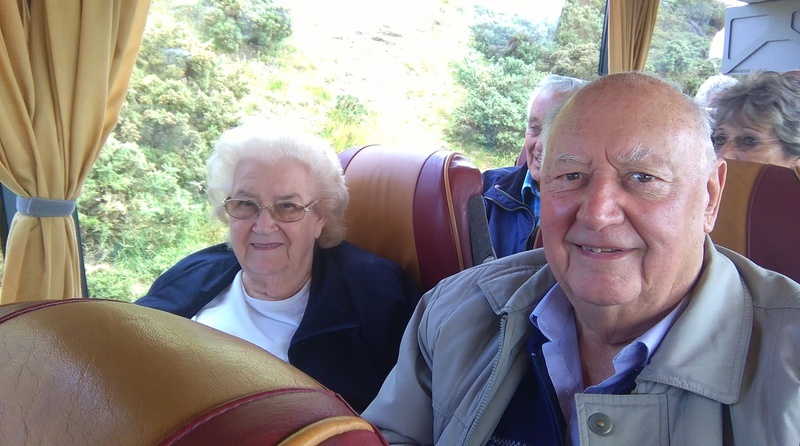 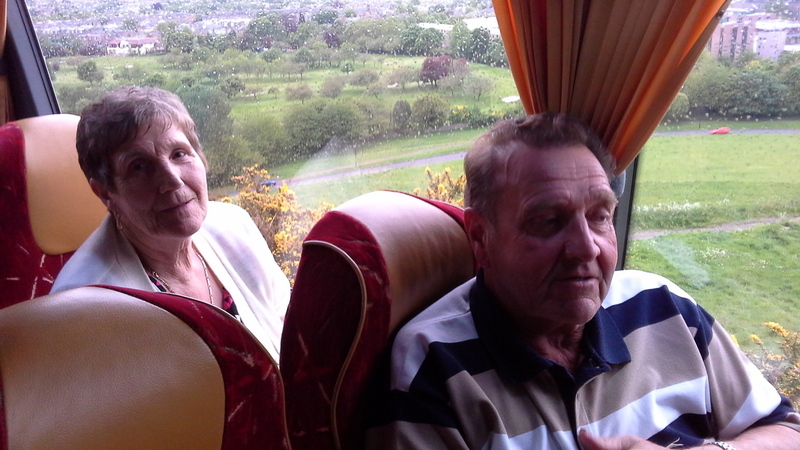 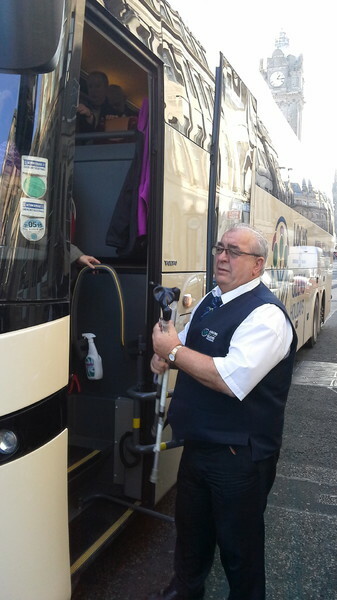 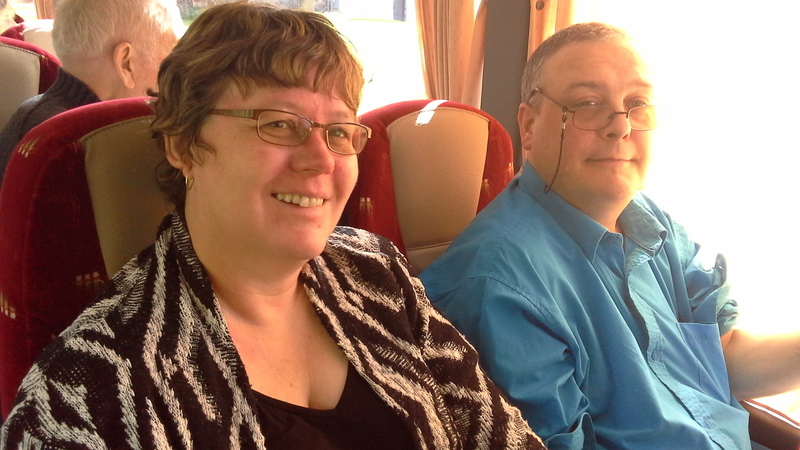 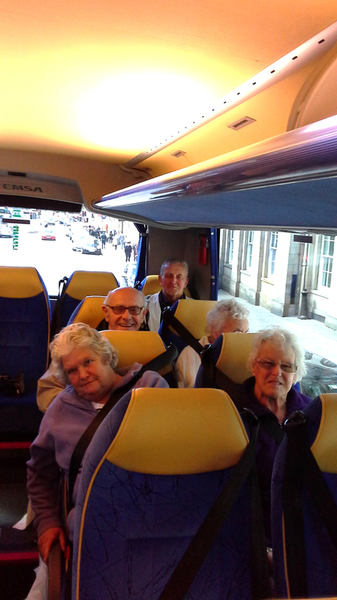 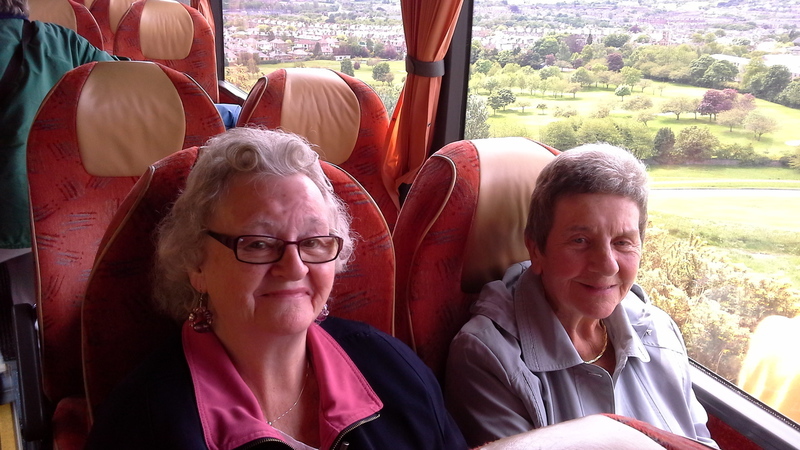 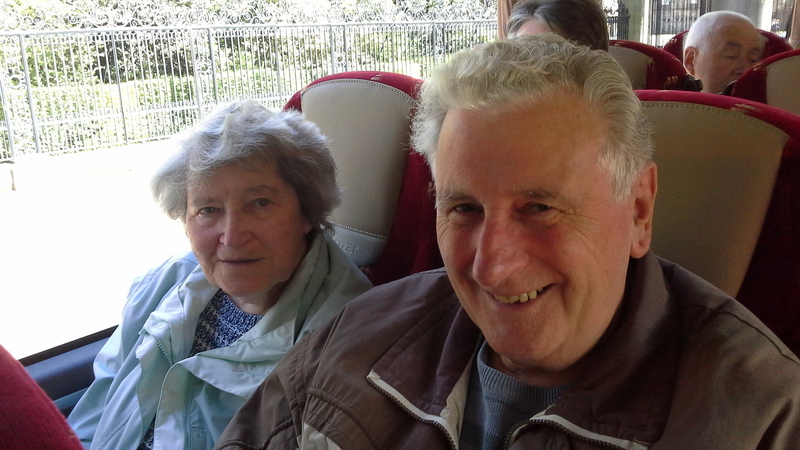 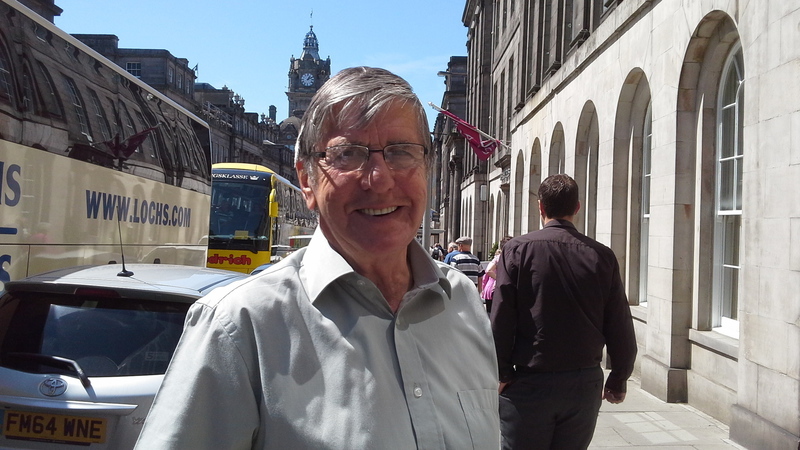 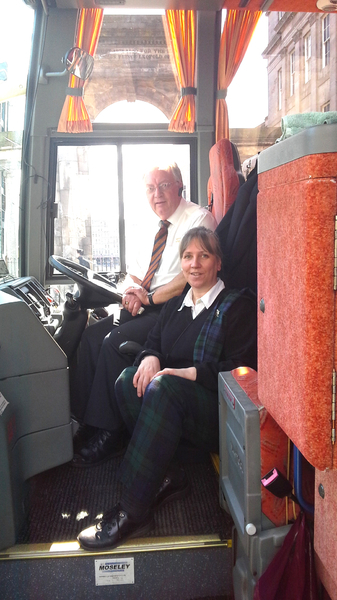 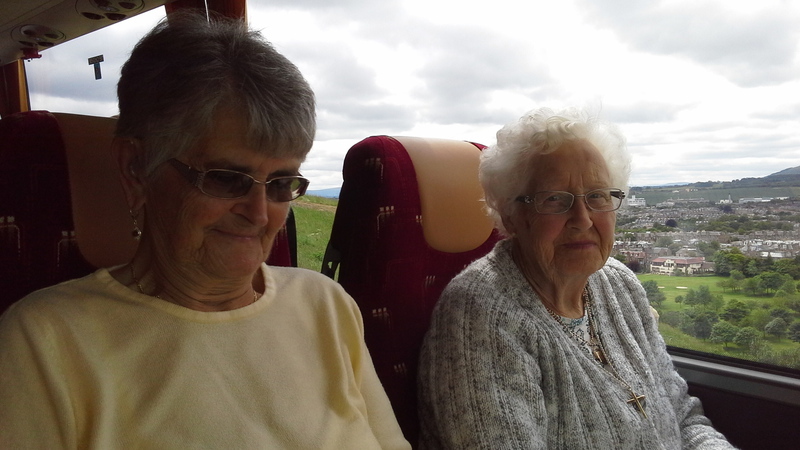 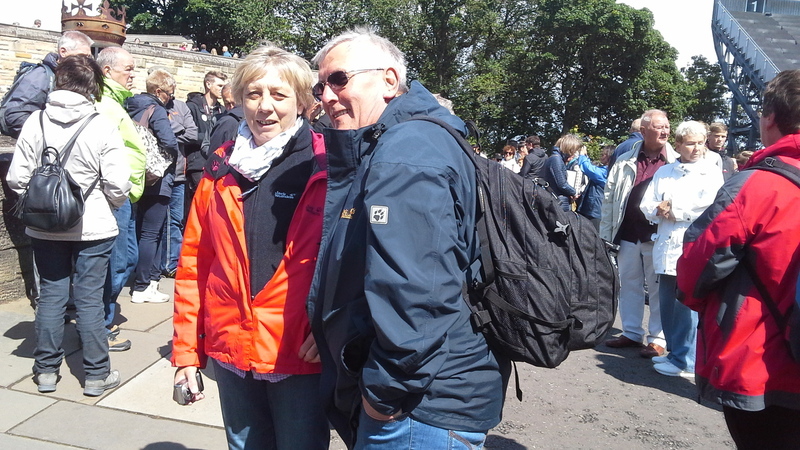 Today Colin brought passengers from Derbyshire and surrounding areas to spend the day in Edinburgh. 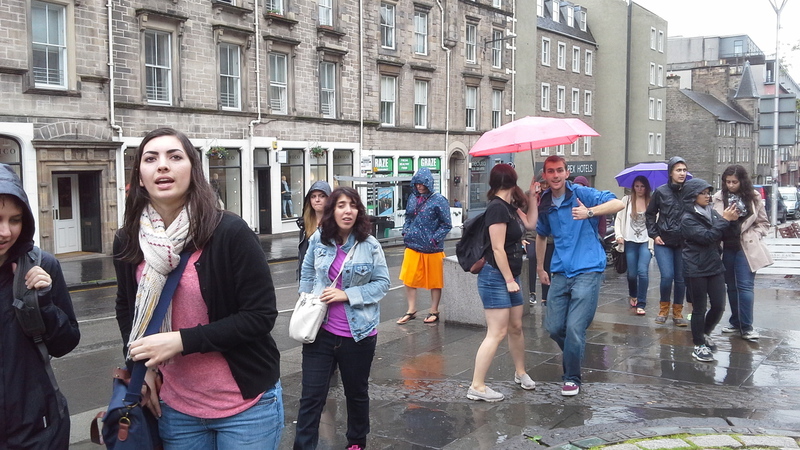 The first day of summer? 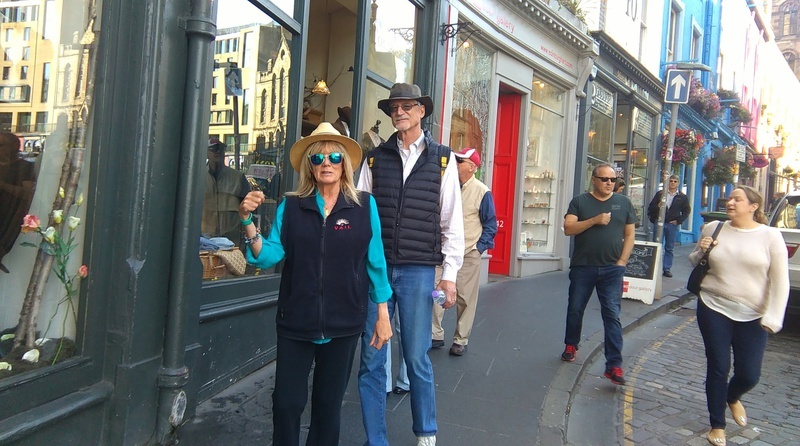 - what a glorous day. 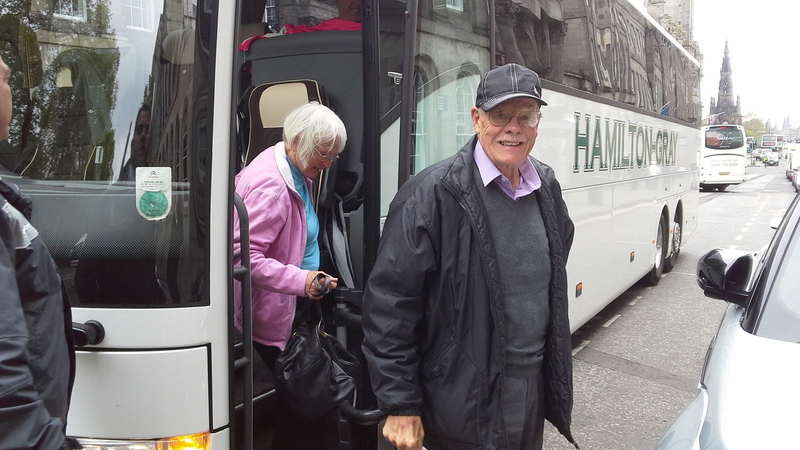 Aberdonian driver Gordon brought his passengers to Edinburgh from the north. 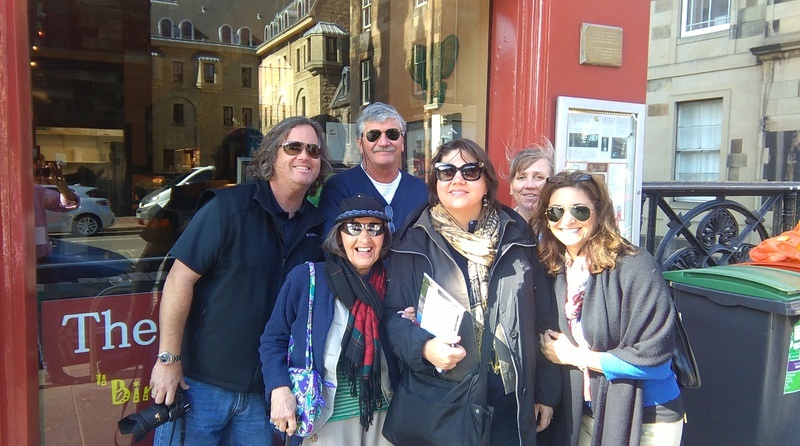 What a hoot, and great time touring round the city. 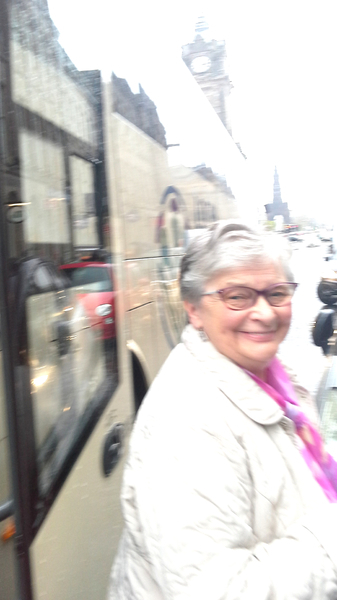 I am still smiling. 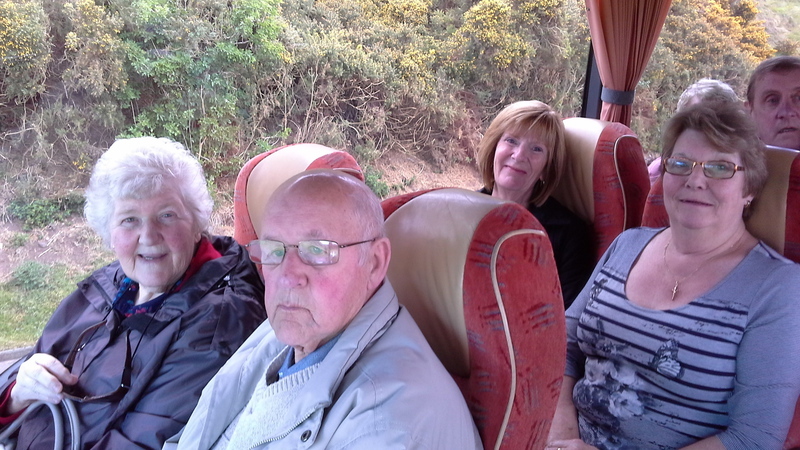 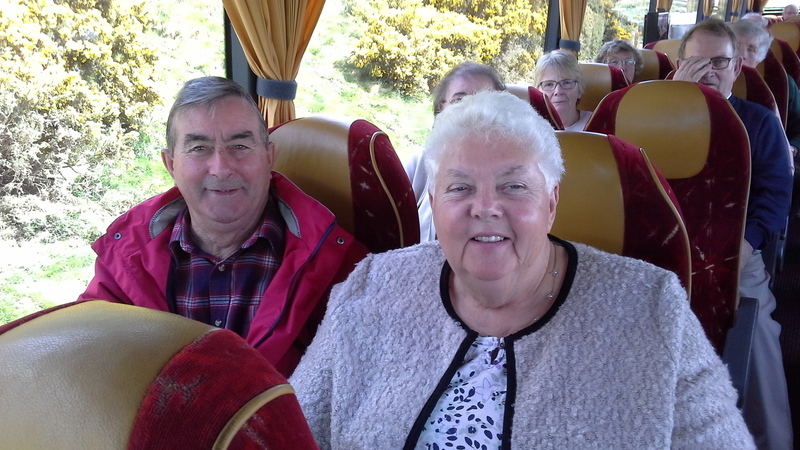 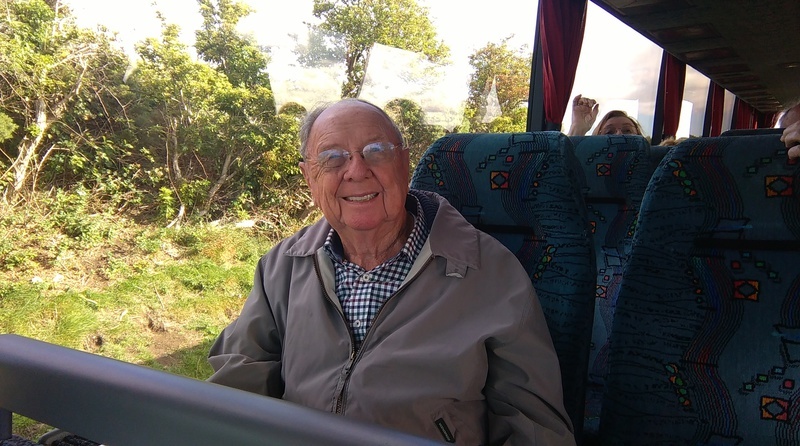 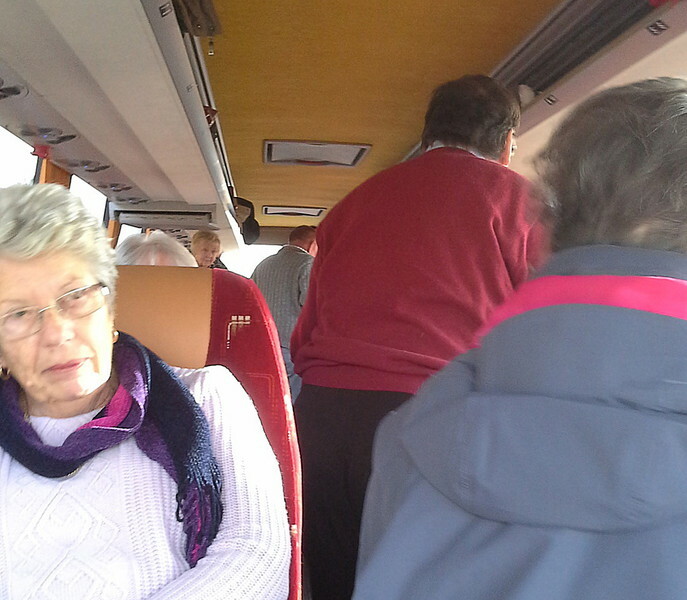 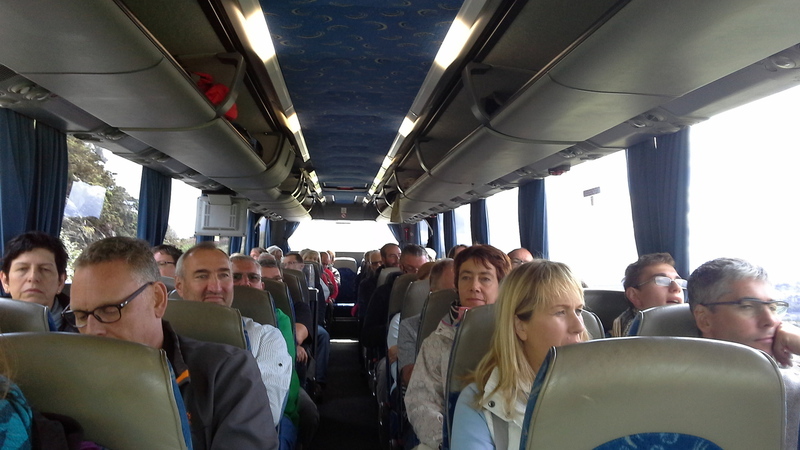 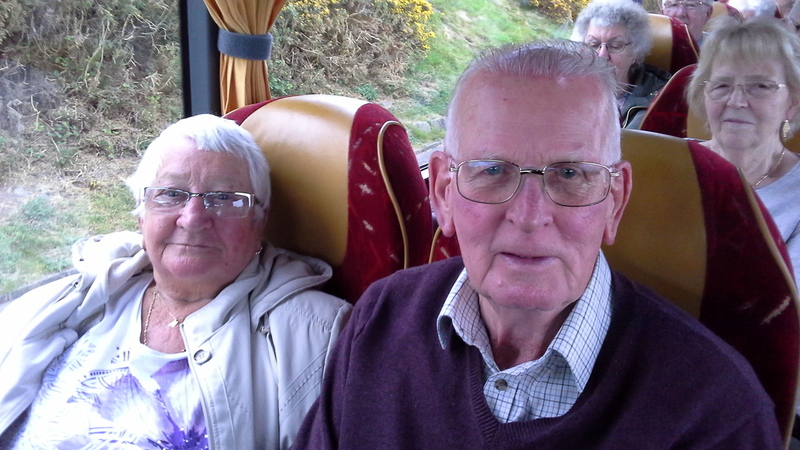 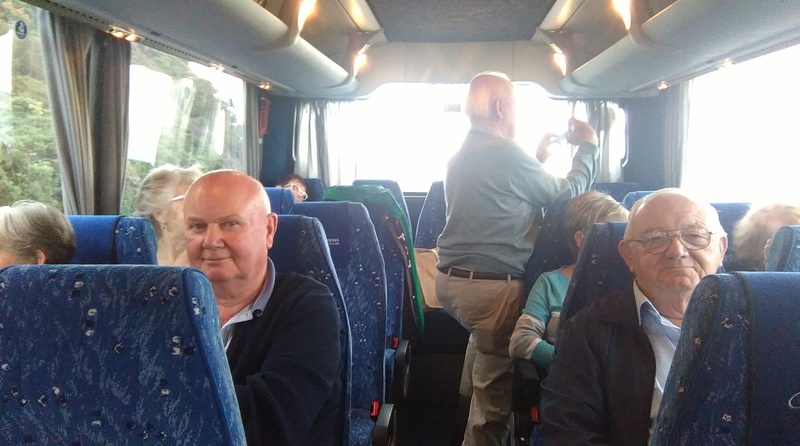 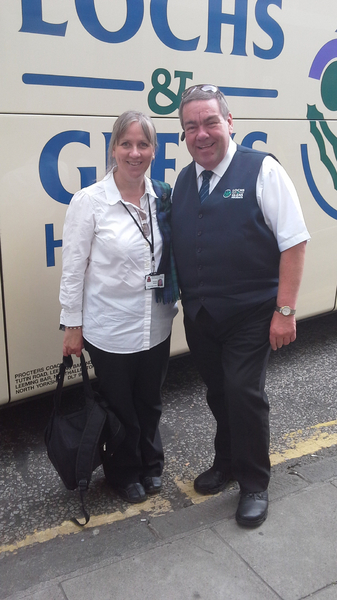 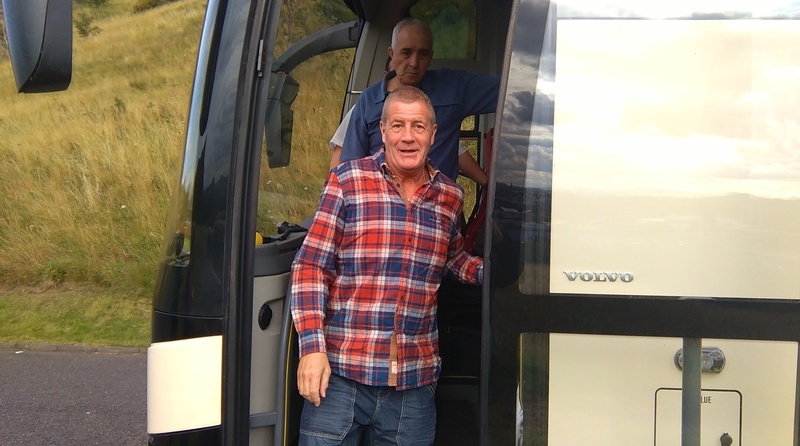 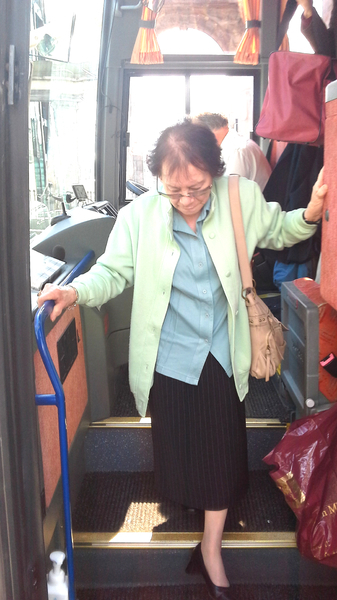 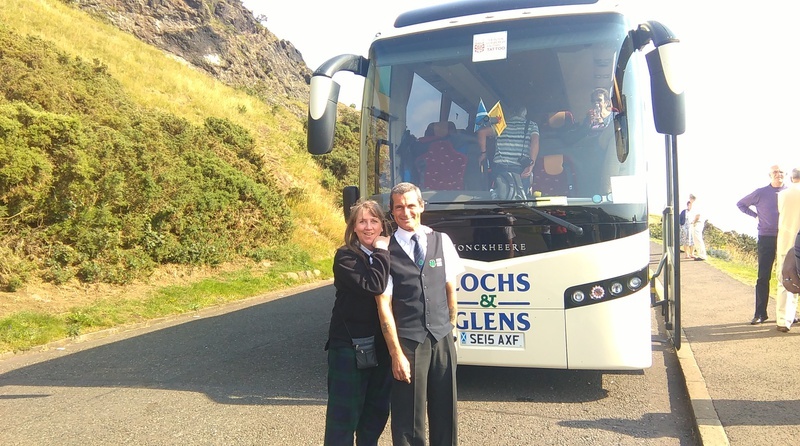 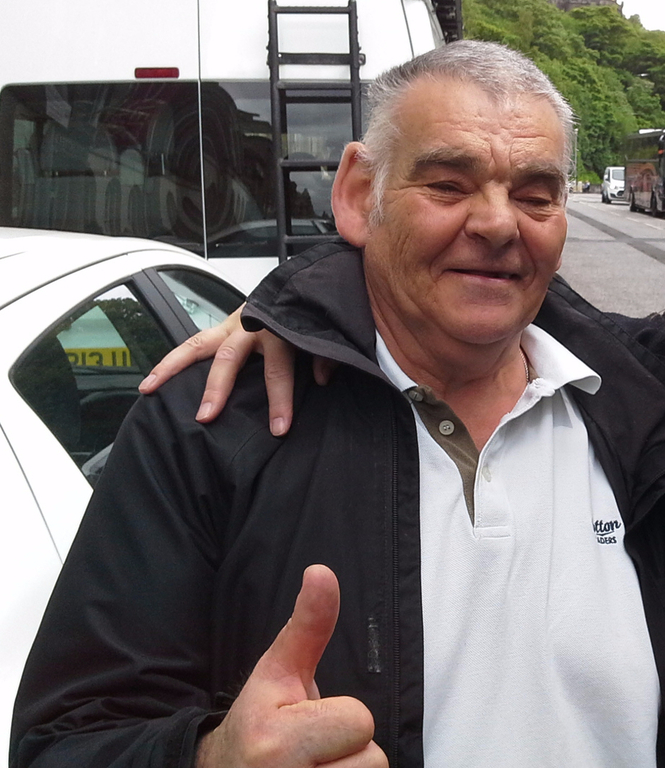 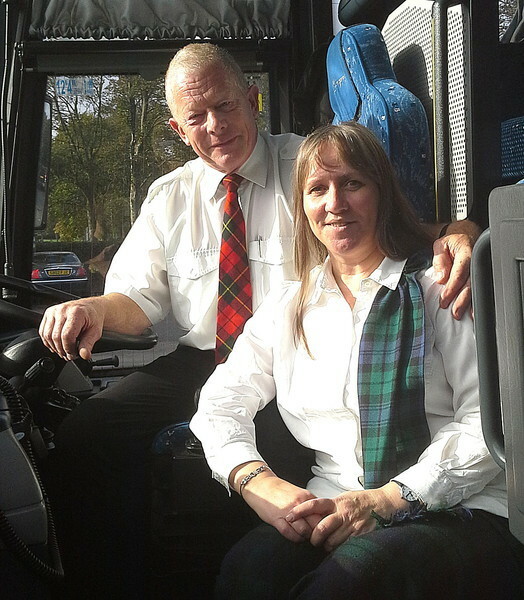 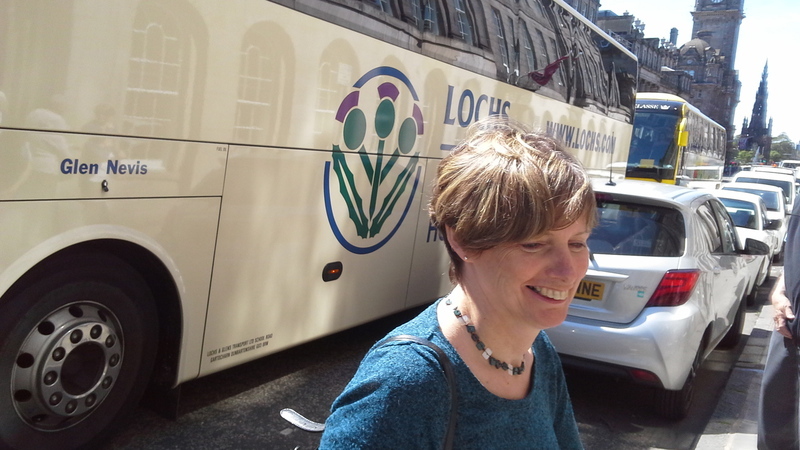 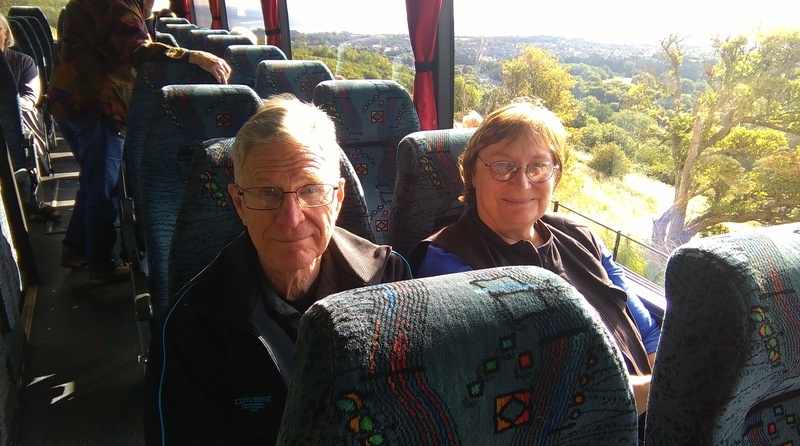 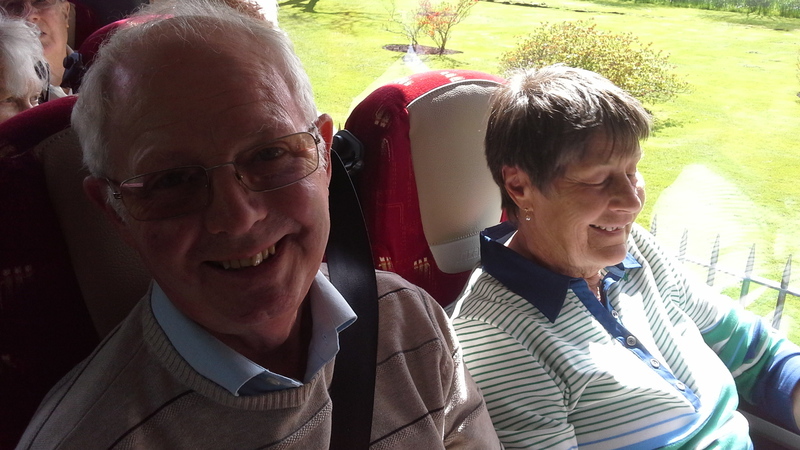 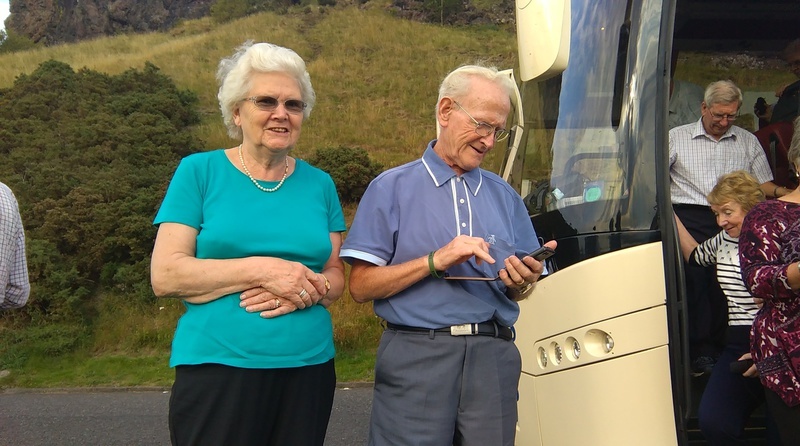 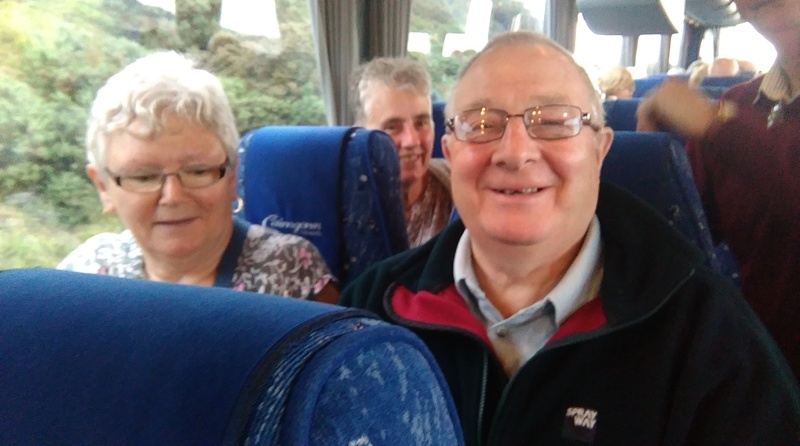 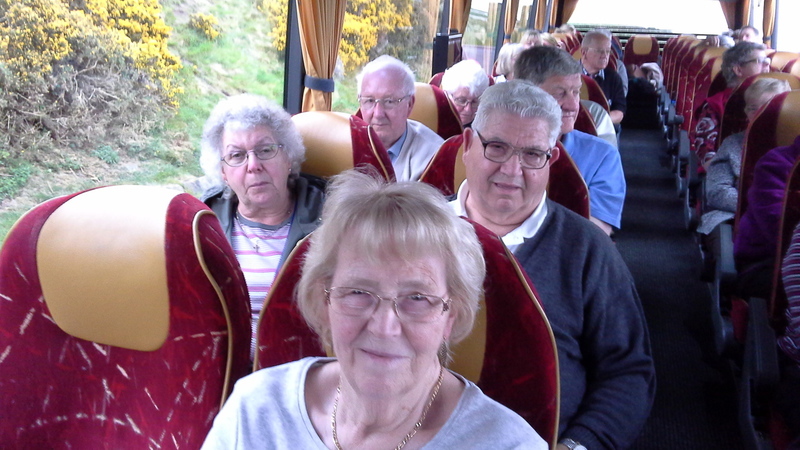 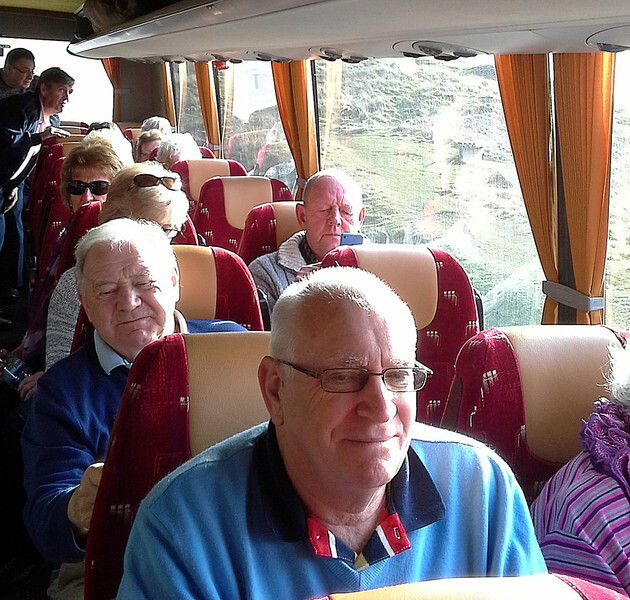 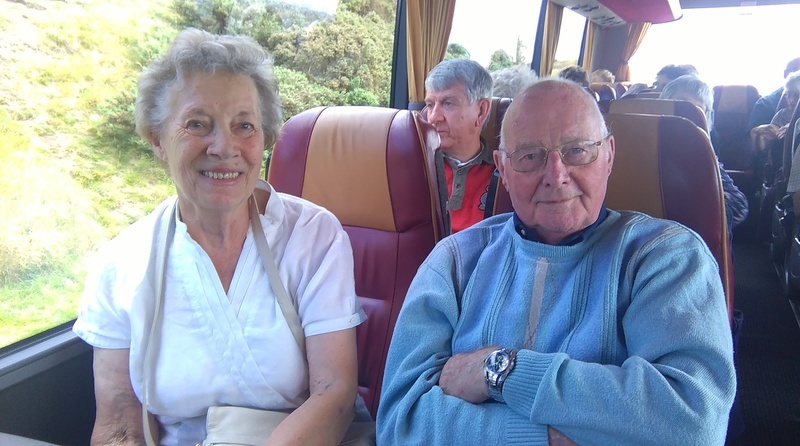 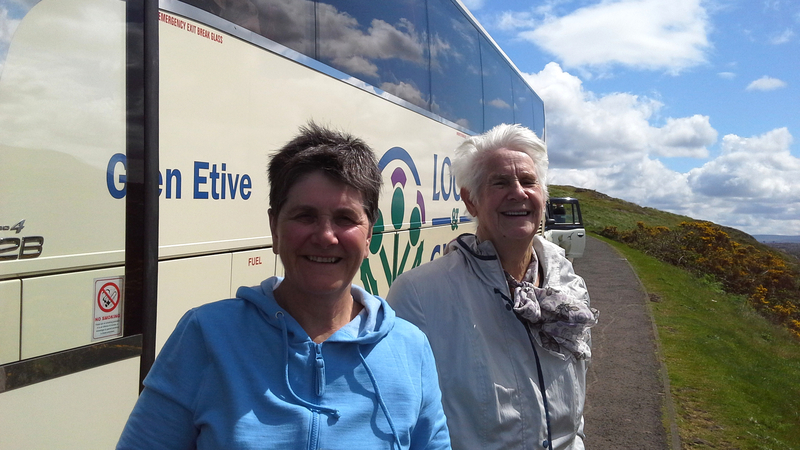 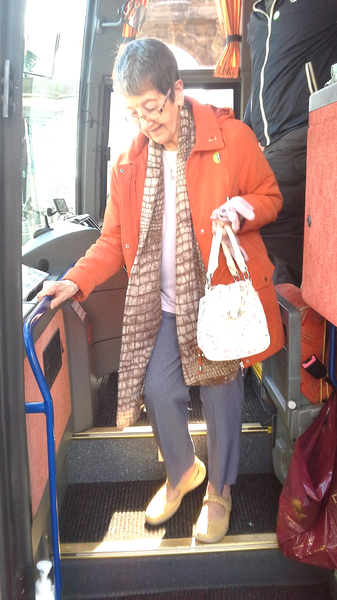 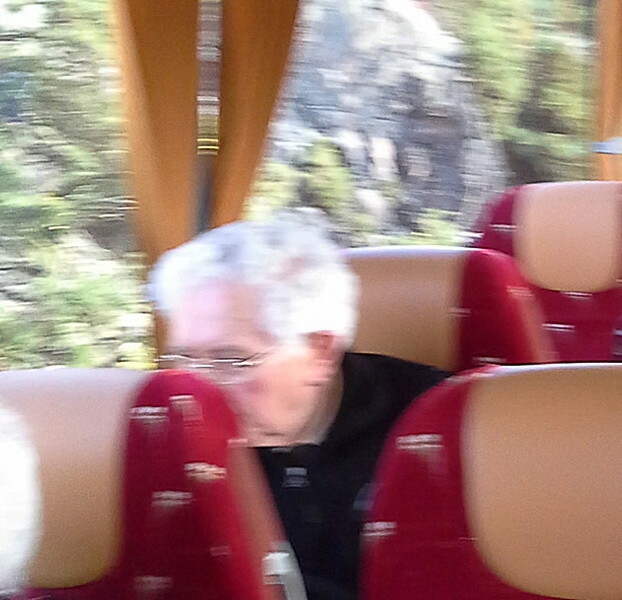 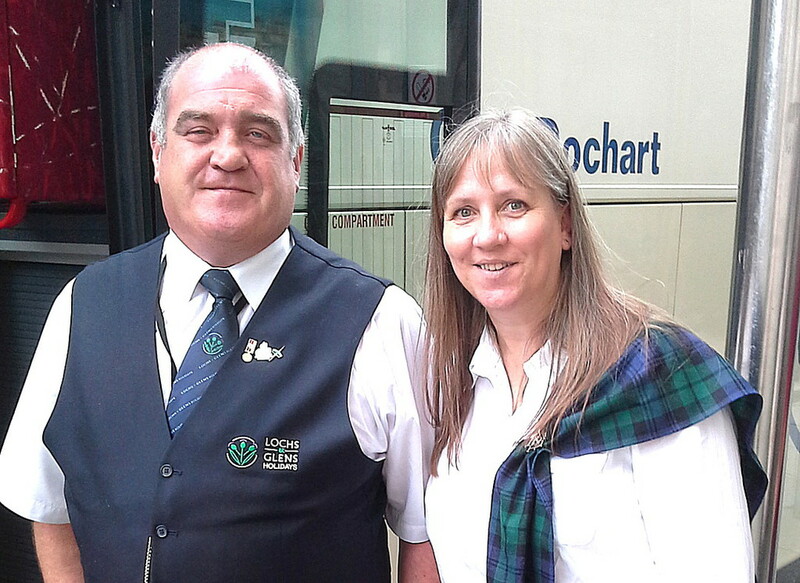 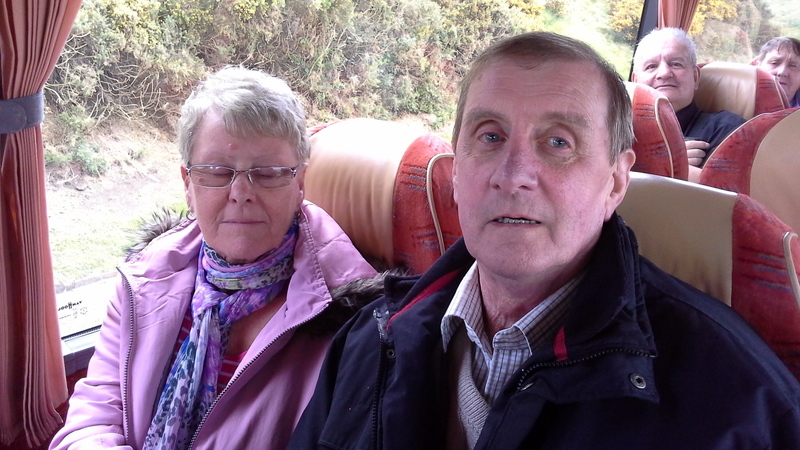 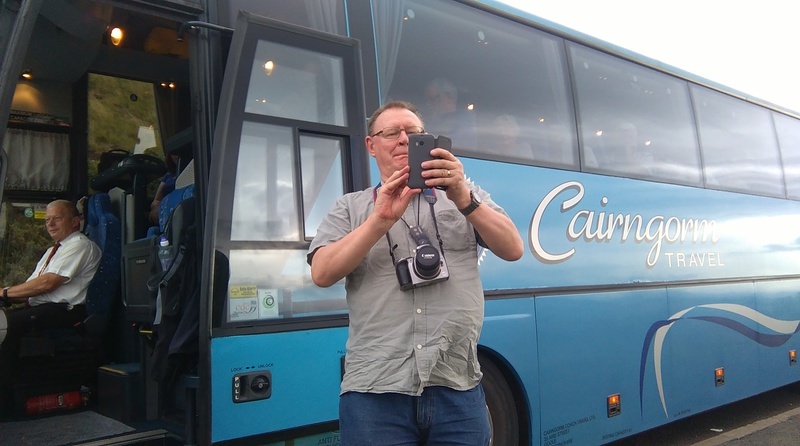 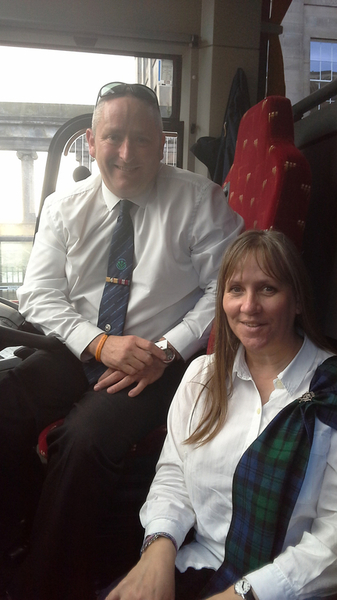 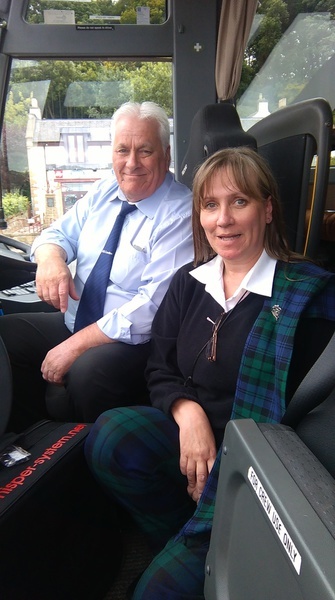 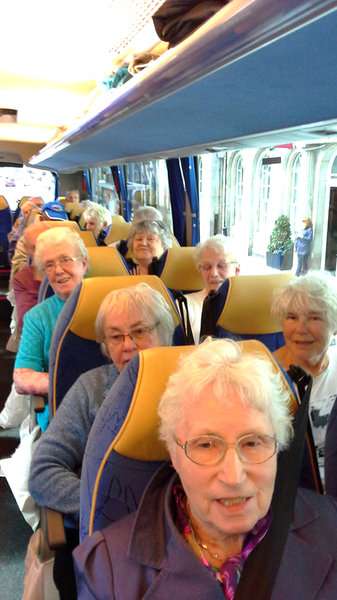 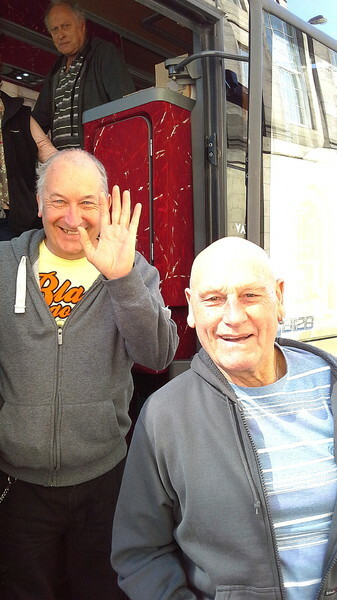 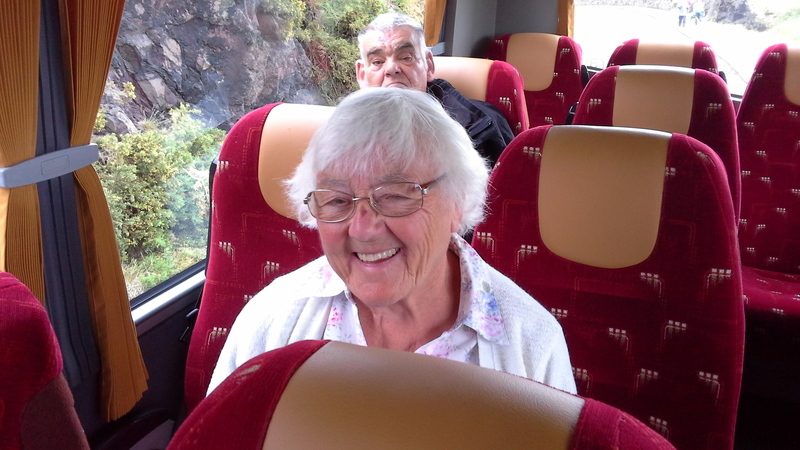 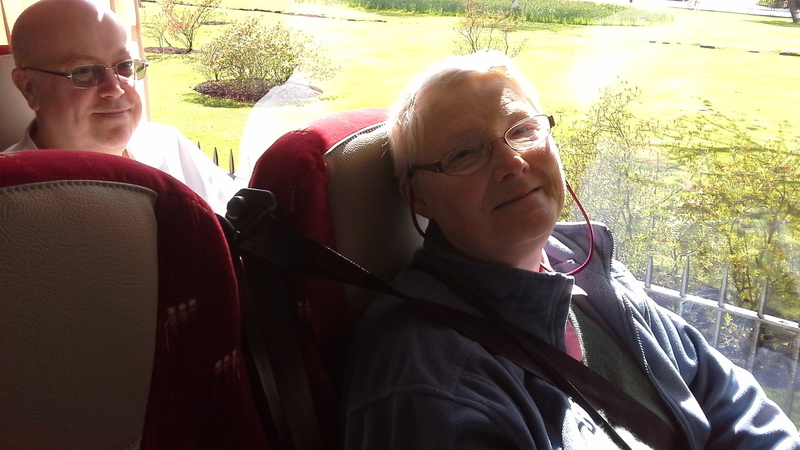 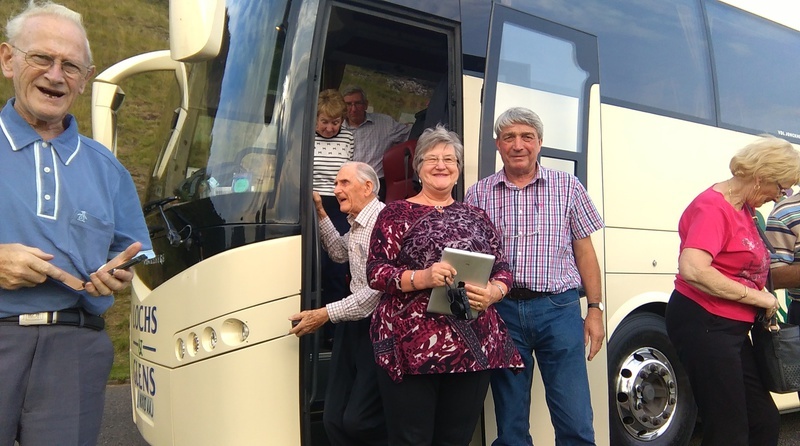 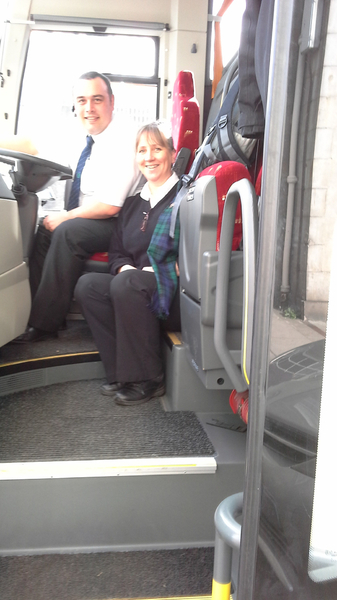 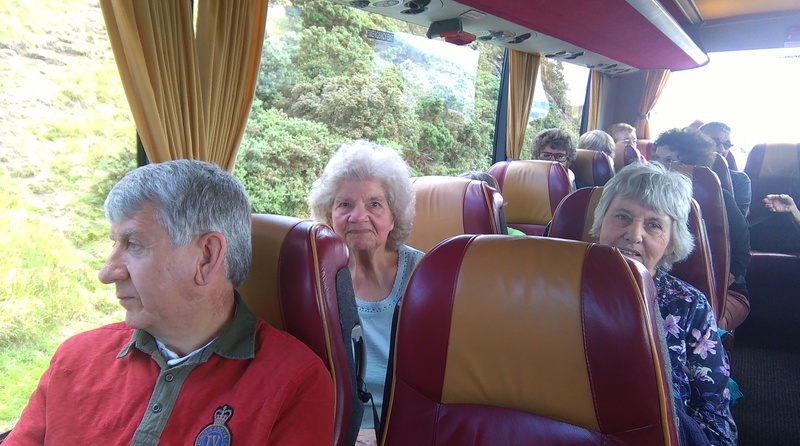 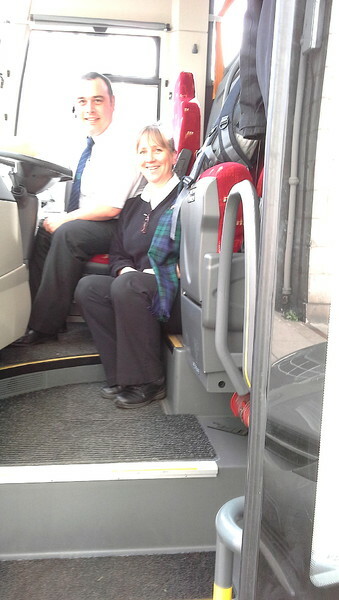 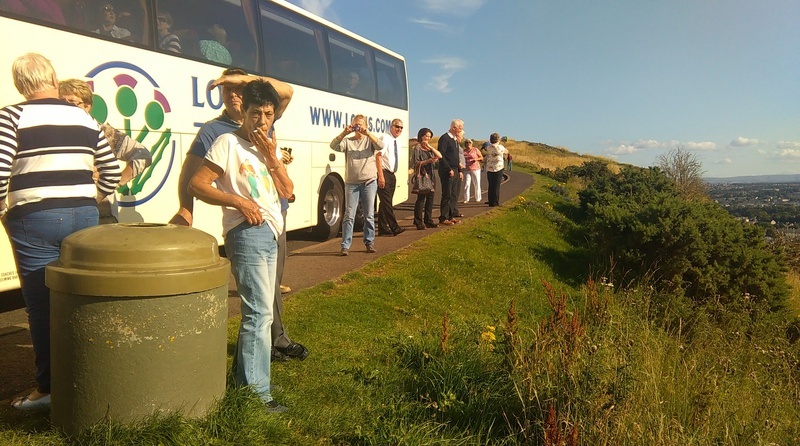 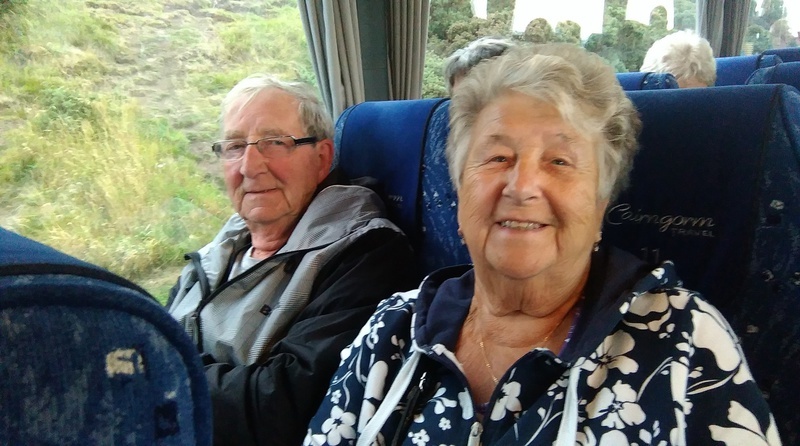 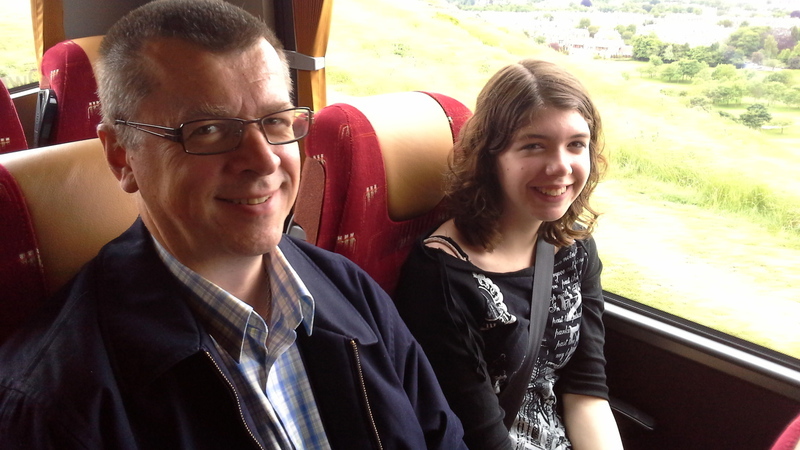 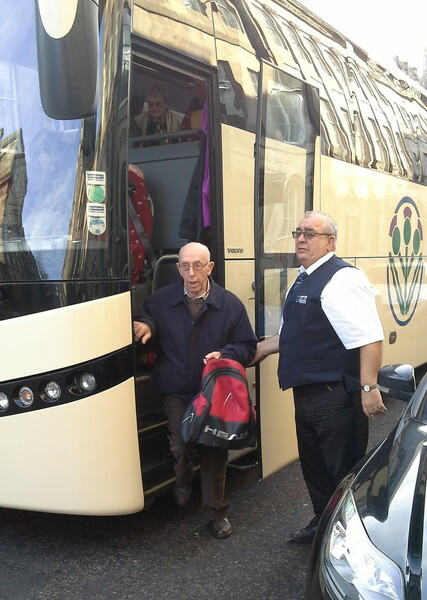 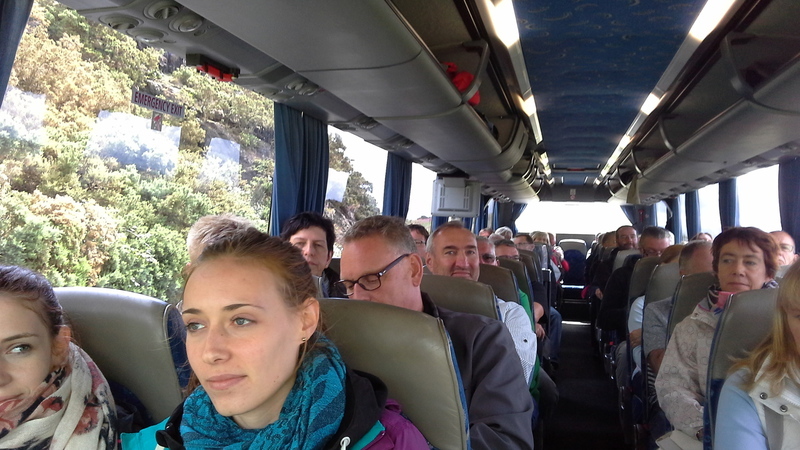 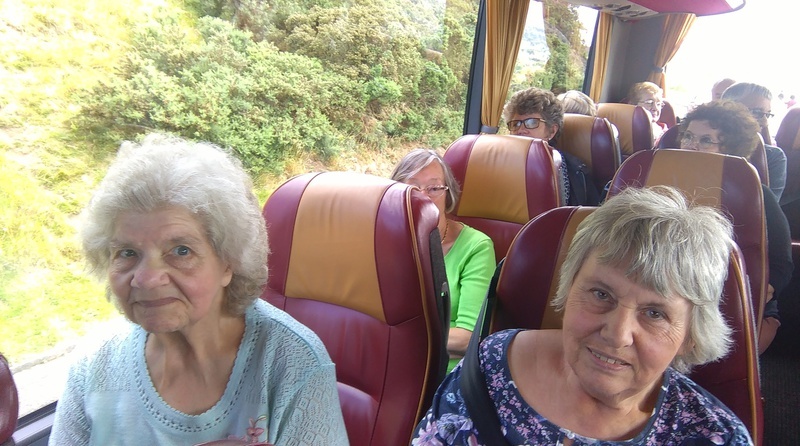 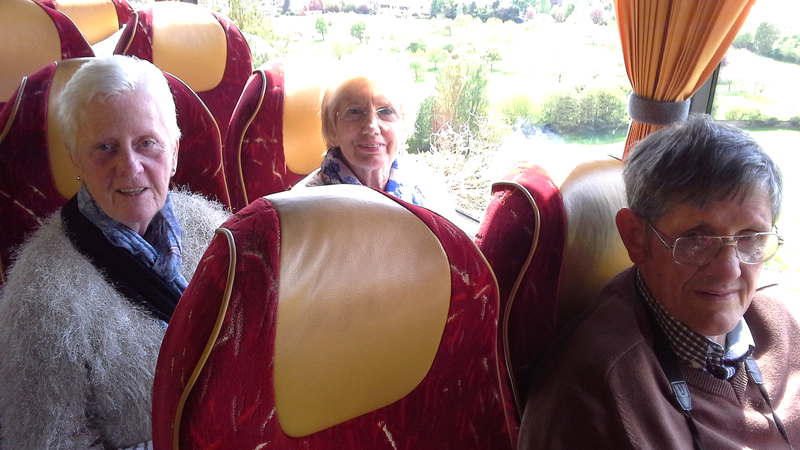 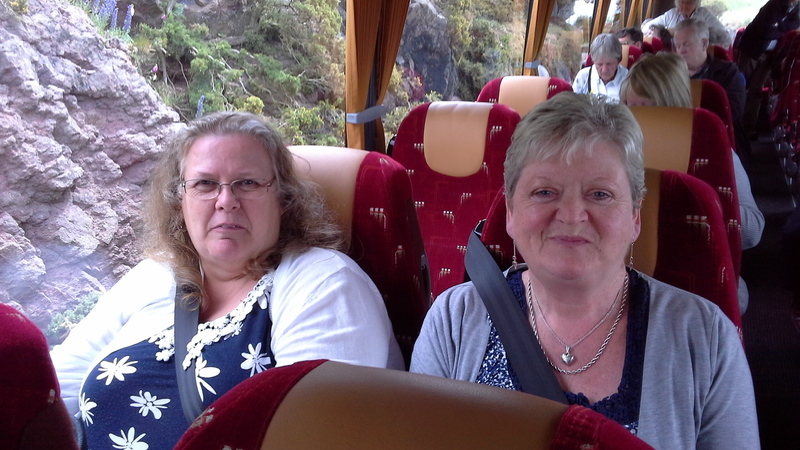 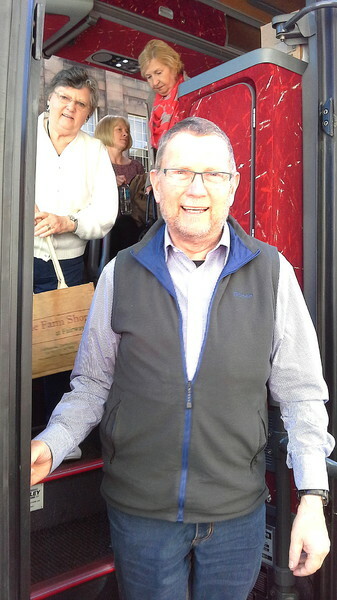 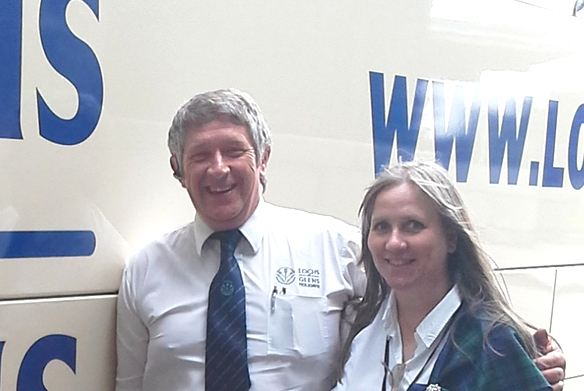 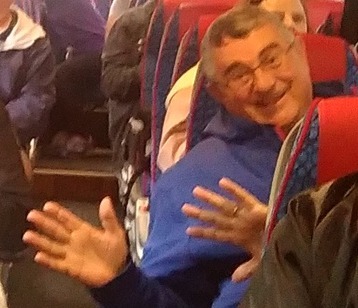 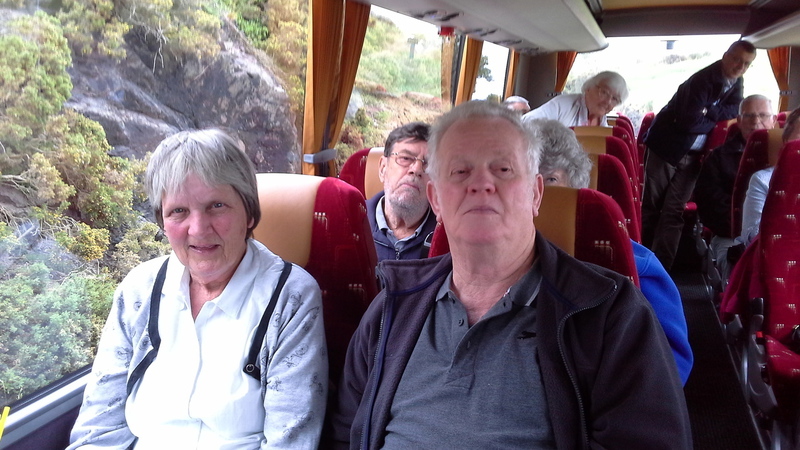 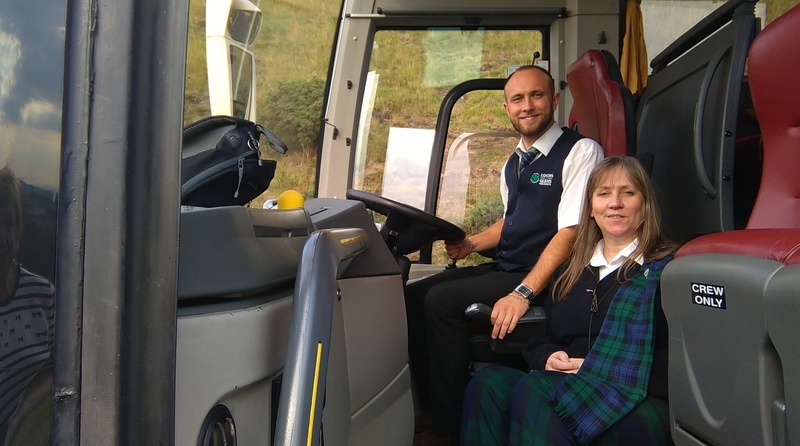 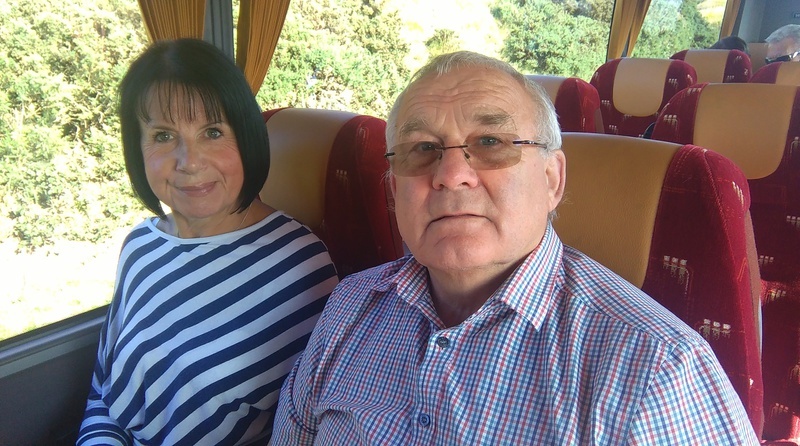 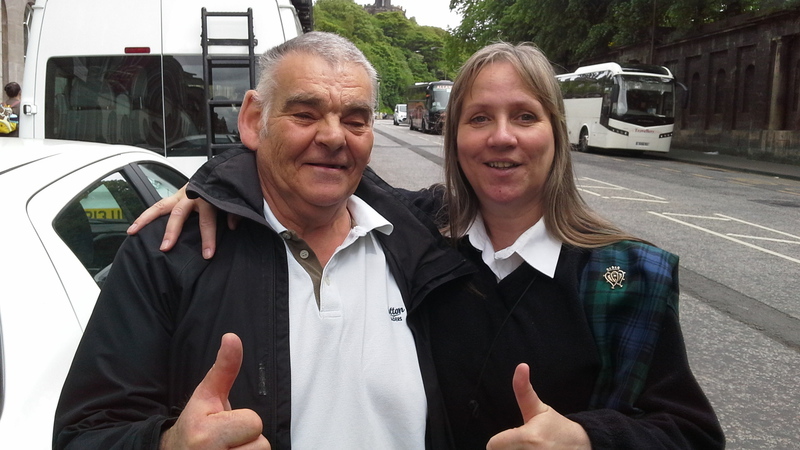 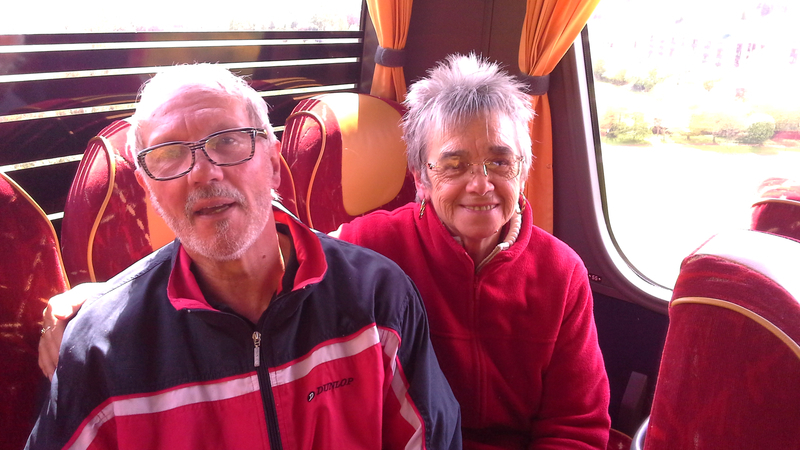 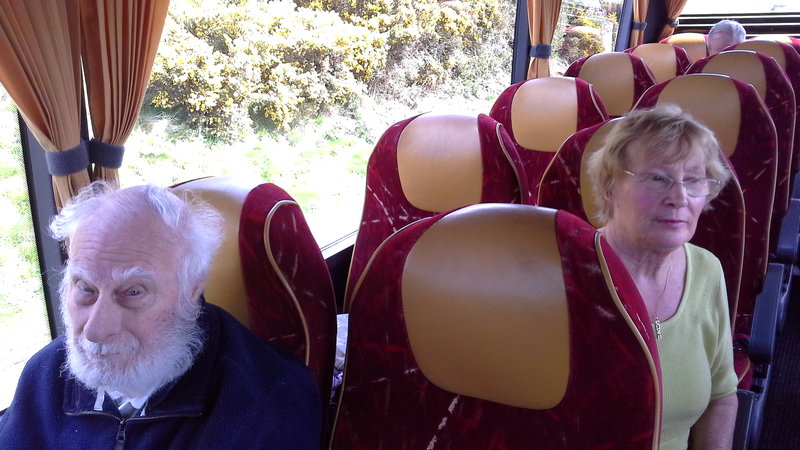 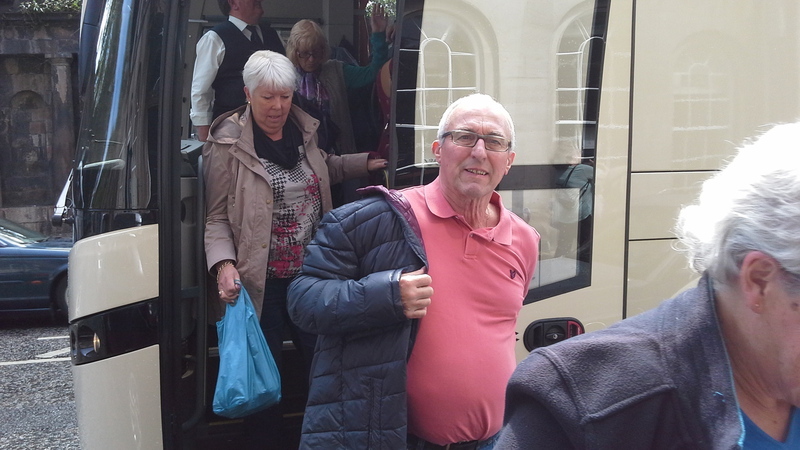 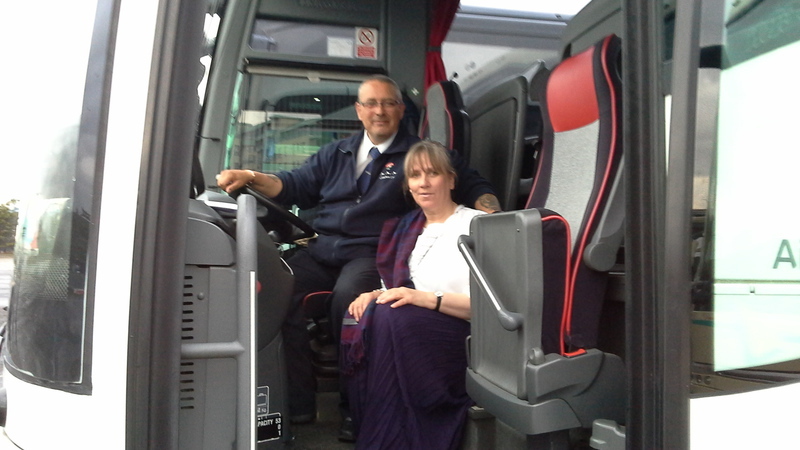 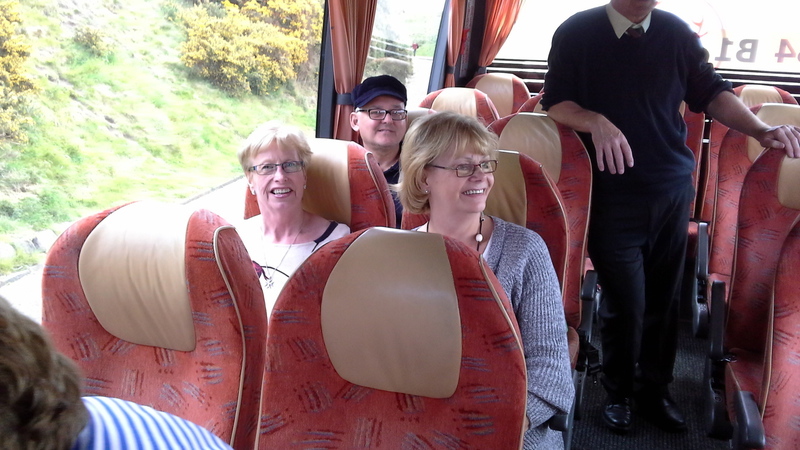 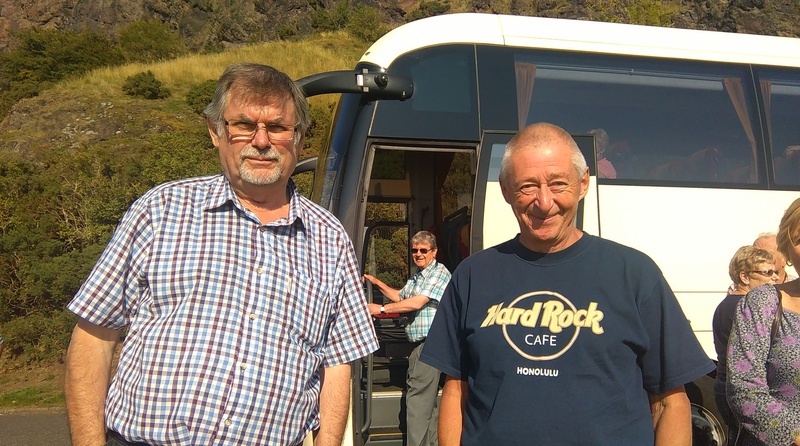 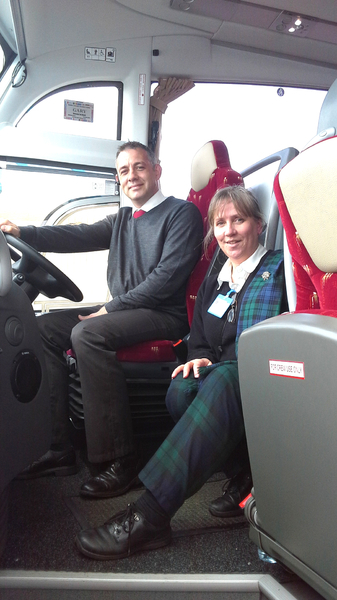 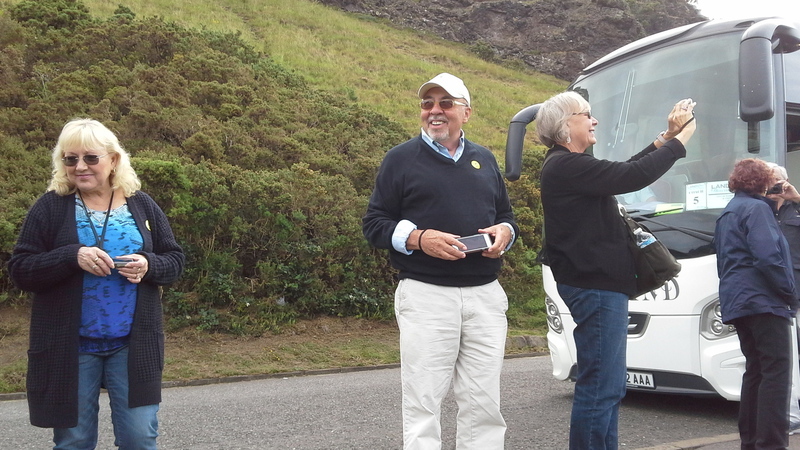 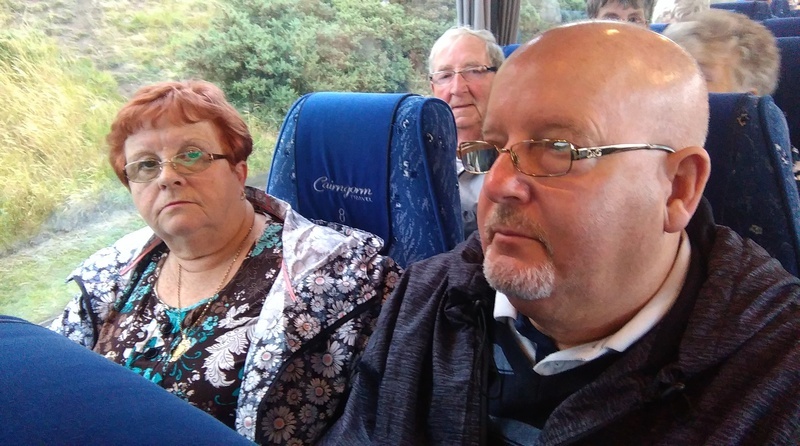 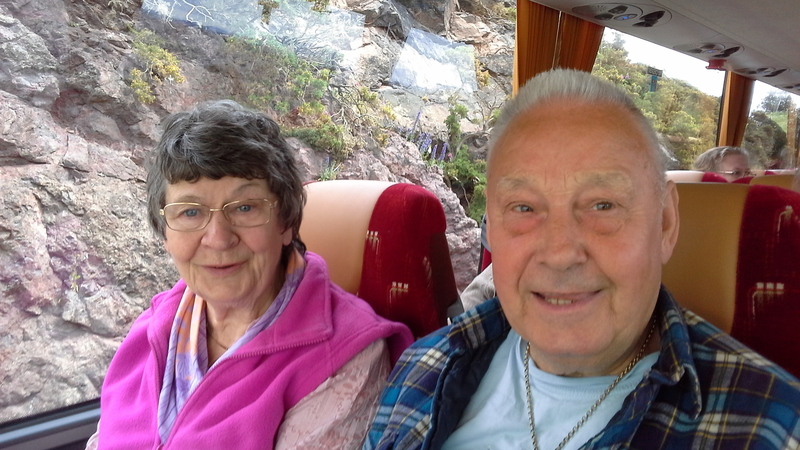 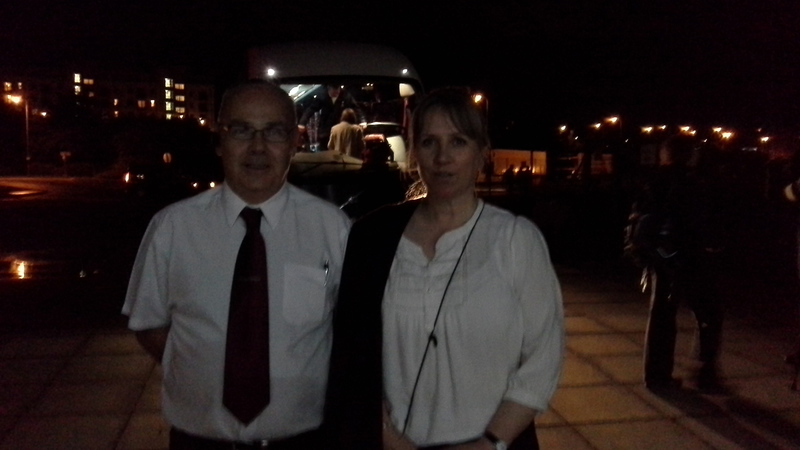 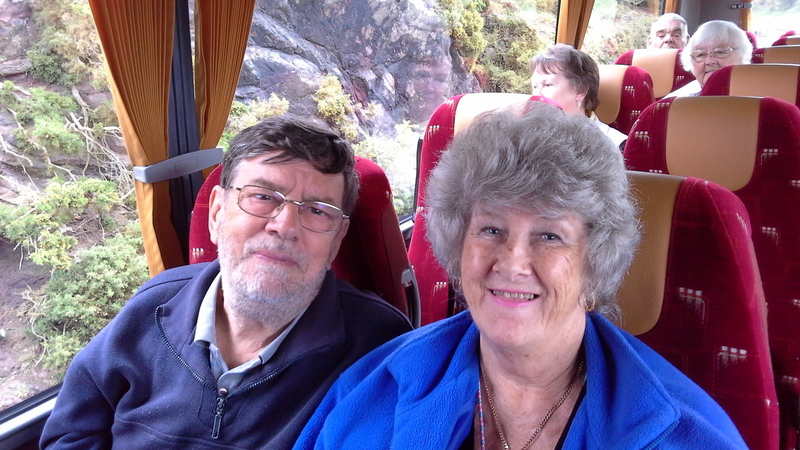 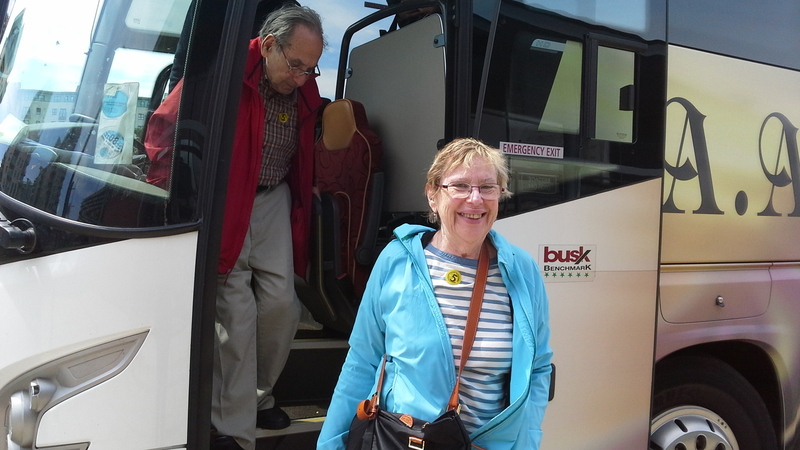 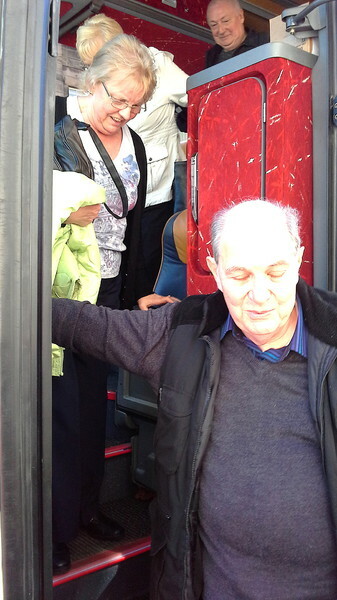 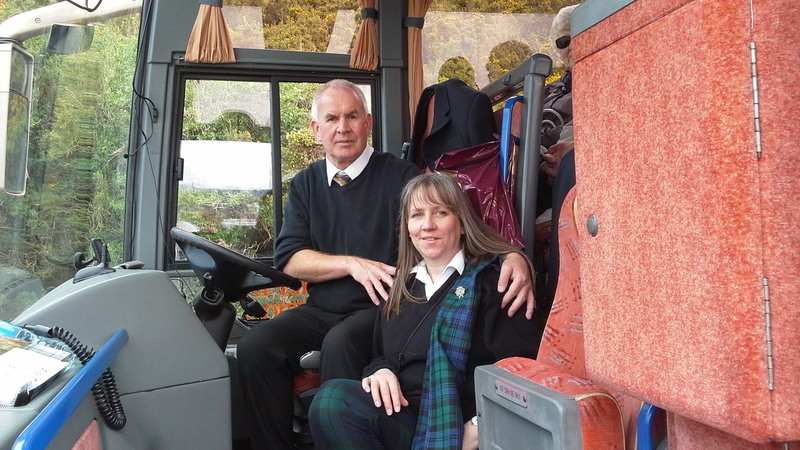 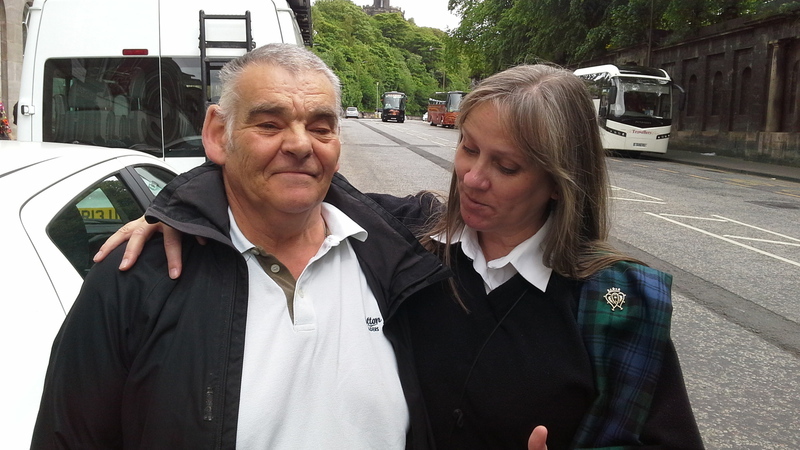 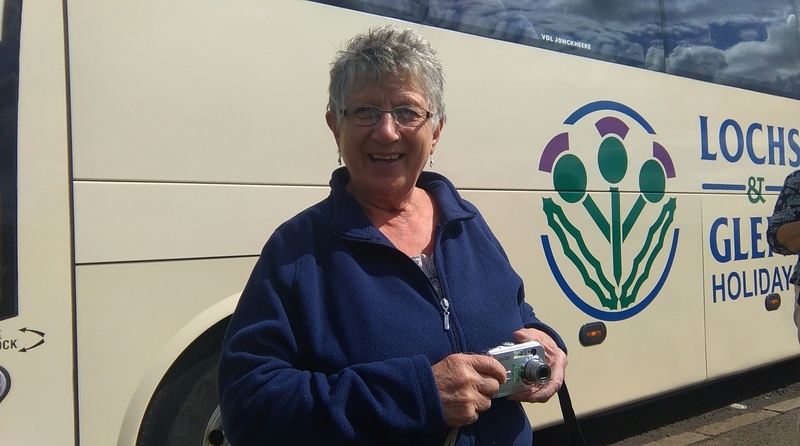 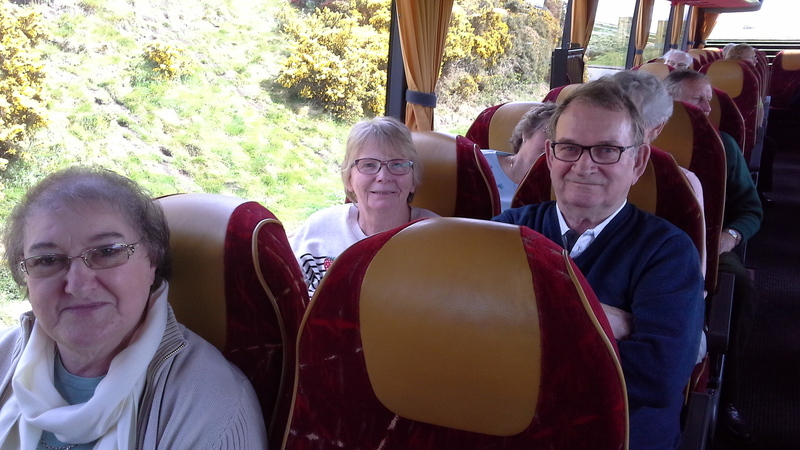 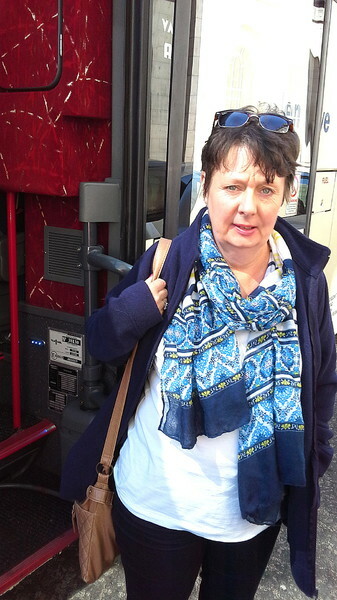 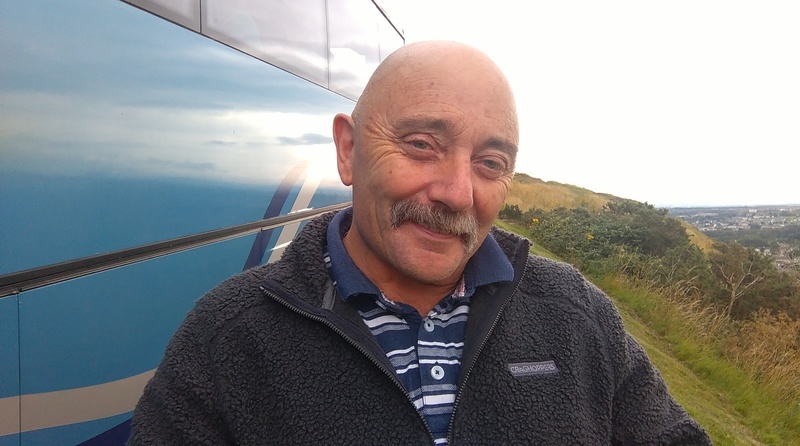 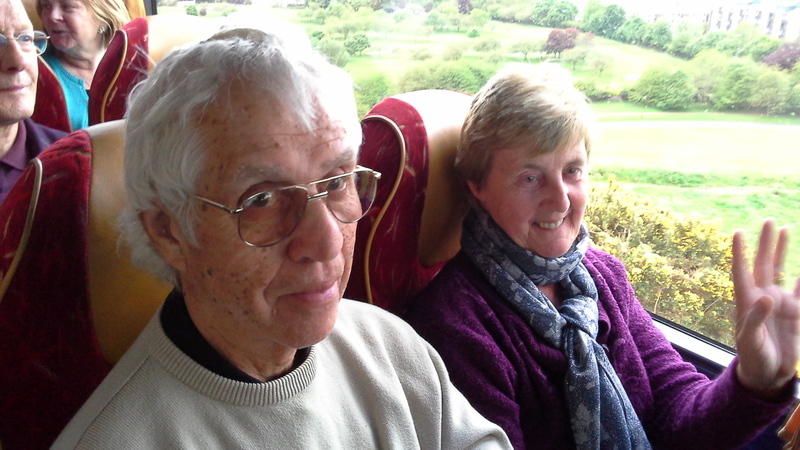 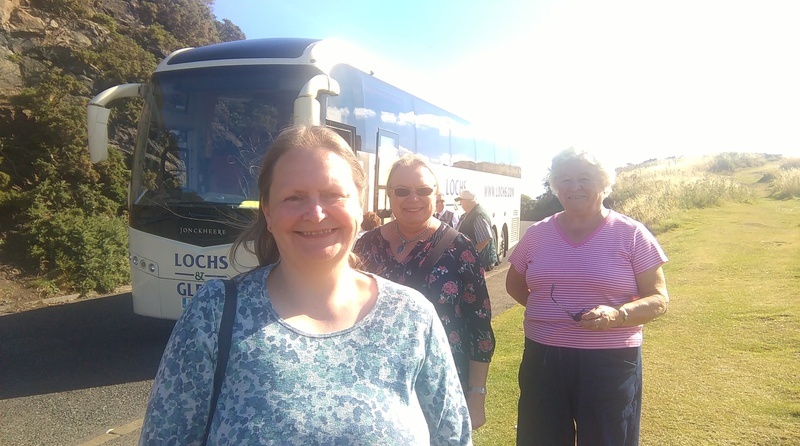 Driver Iain brought his Birmingham coach of passengers staying up at Loch Long to Edinburgh for the Day. 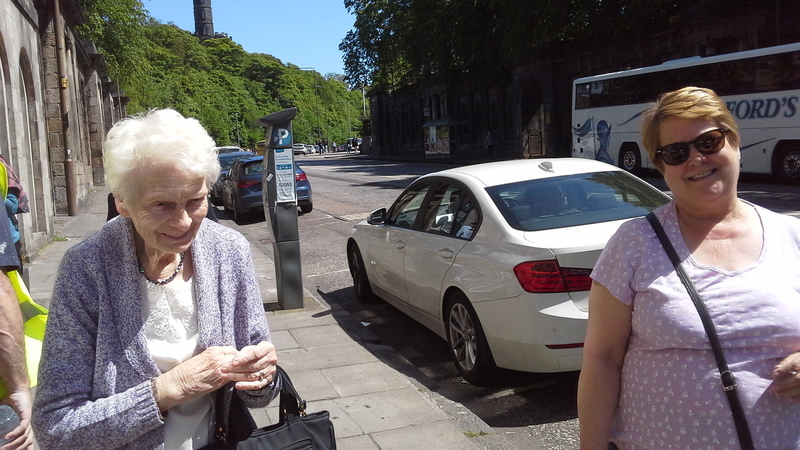 It must be summer - very warm. 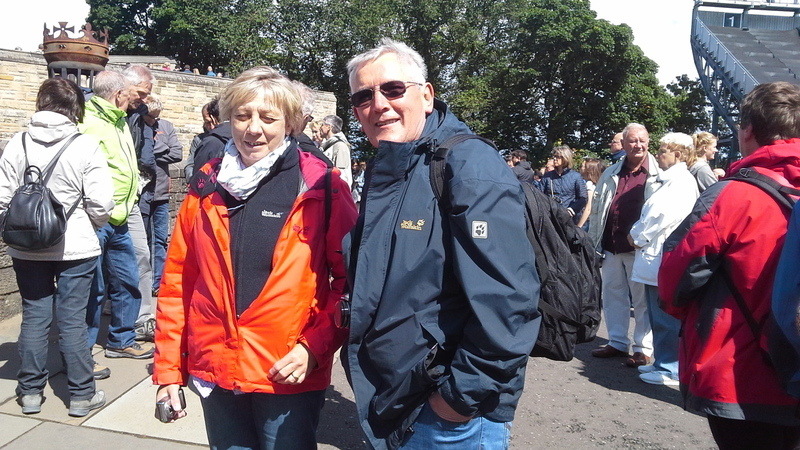 A fabulous day and fabulous weather but then it never rains here - though we do get a bit of liquid sunshine at times! 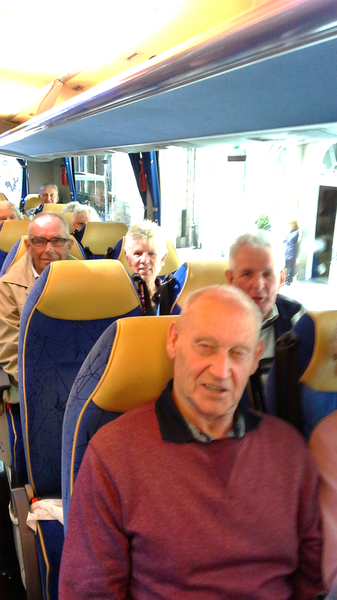 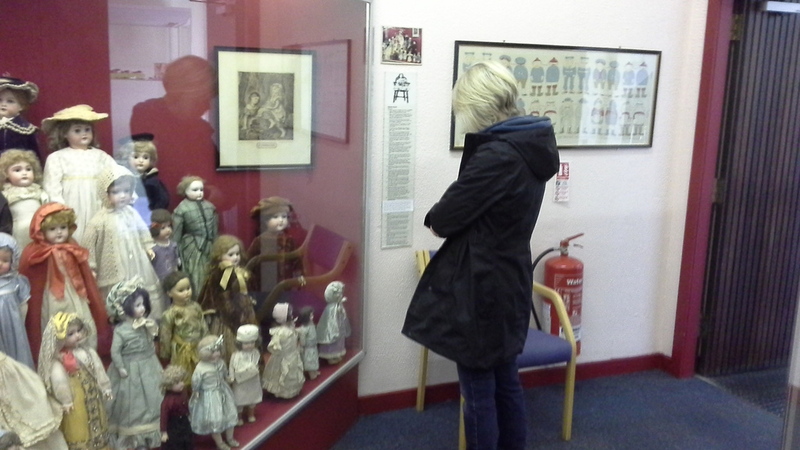 Touring today with 'Paul's' Group. 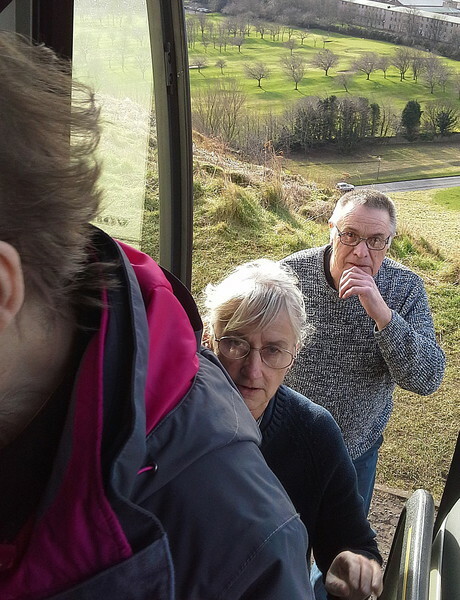 Lovely Spring Day. 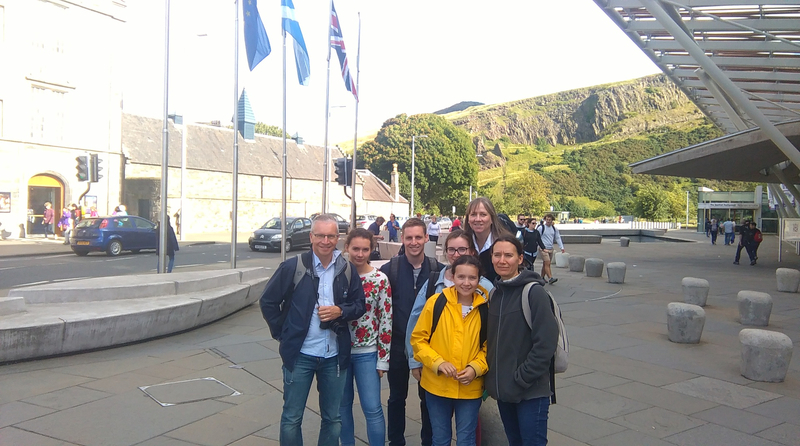 As Holyrood Park was closed to traffic (always on a Sunday as it becomes pedestrianised for the day) we were able to spend a wee bit more time in the New Town and paused briefly outside the First Minister's Official Residence in Charlotte Square. 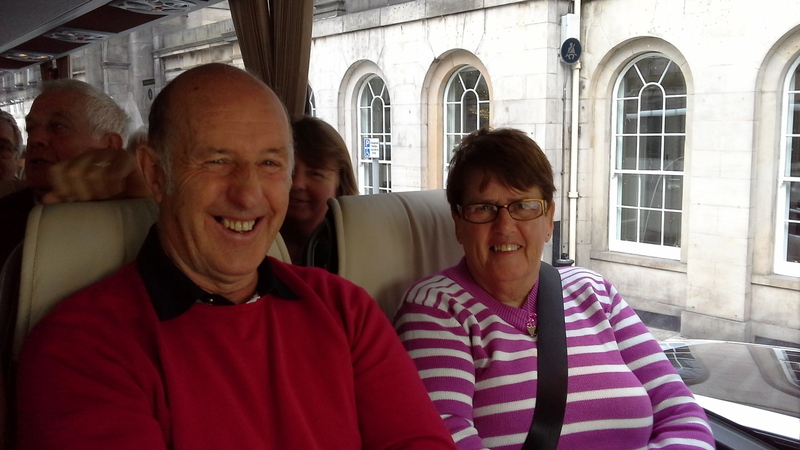 Touring today with Tommy's coach tour, who were staying at Pitlochry. 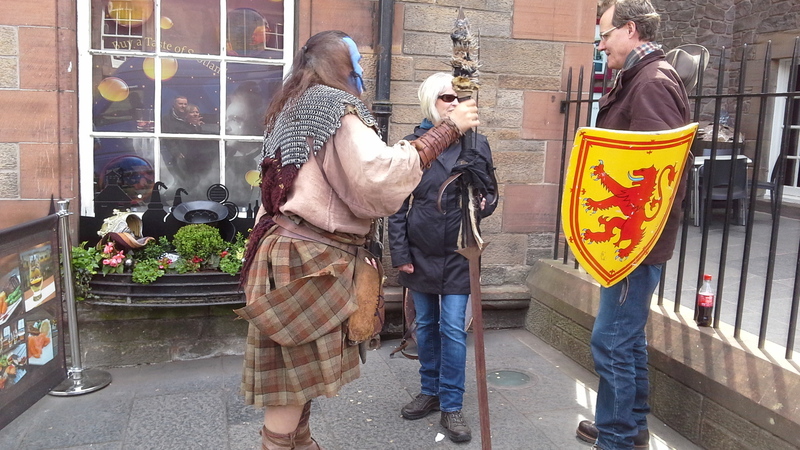 Edinburgh, a very busy city today because of the Rugby Match between Scotland and Wales at Murrayfield. 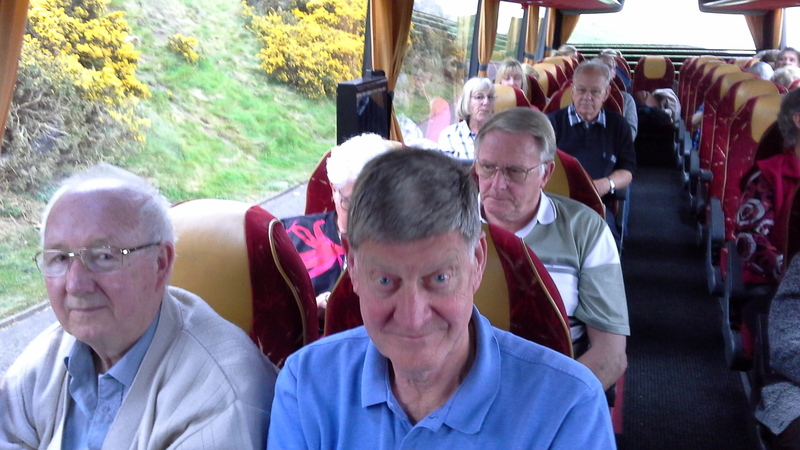 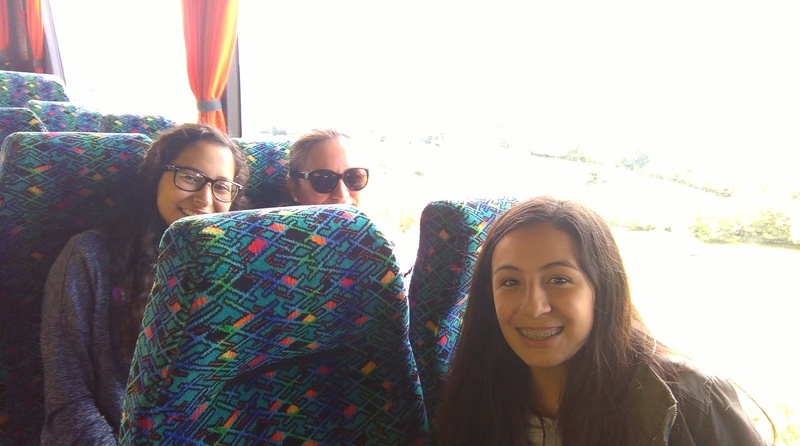 First coach tour of the year. 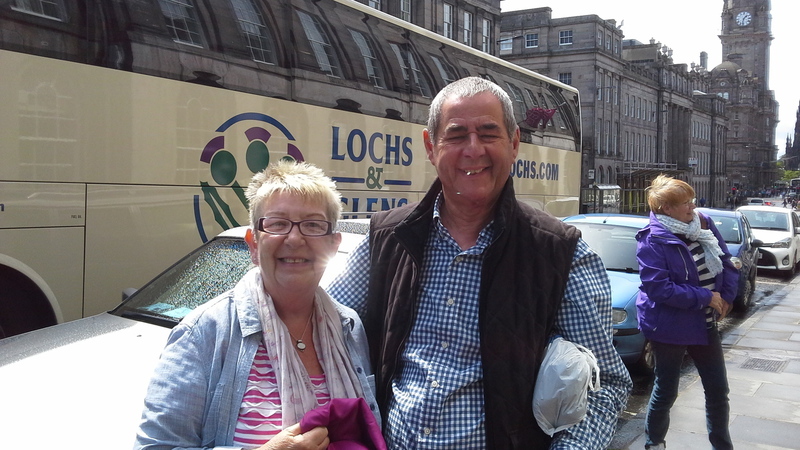 Lovely driver Kevin brought a group from Essex who have been staying up at Loch Tummel. 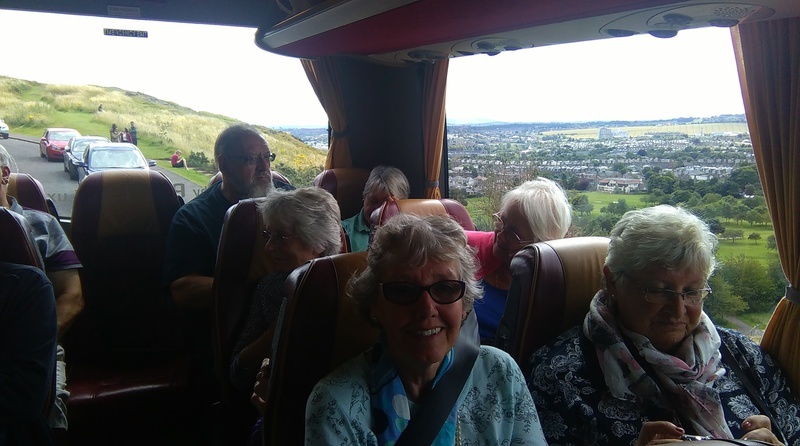 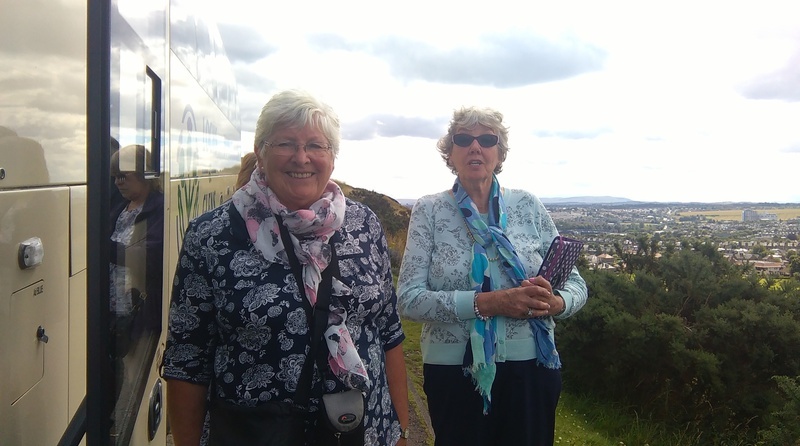 A great time touring around Edinburgh with a wee break in Holyrood Park and then on to the Royal Yacht Britannia at Ocean Terminal.